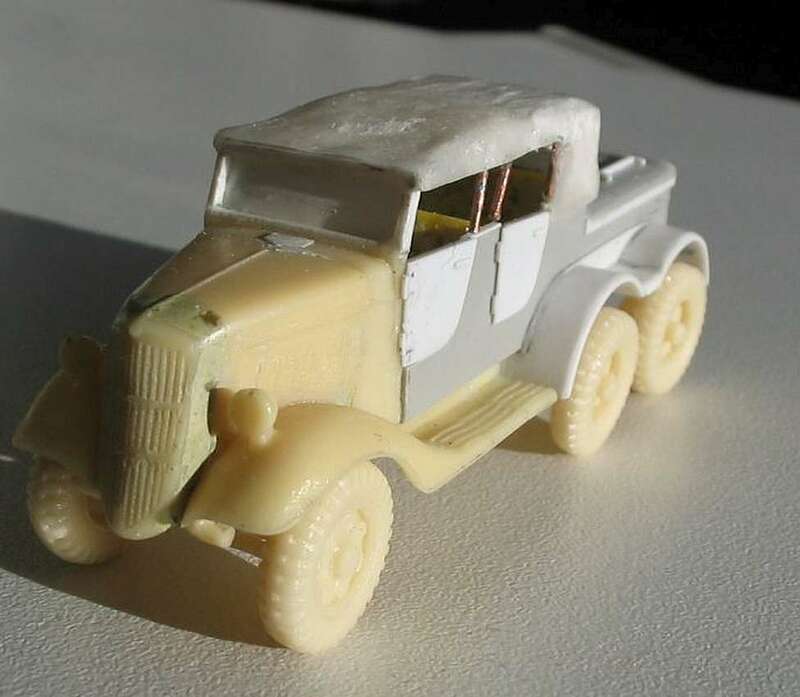 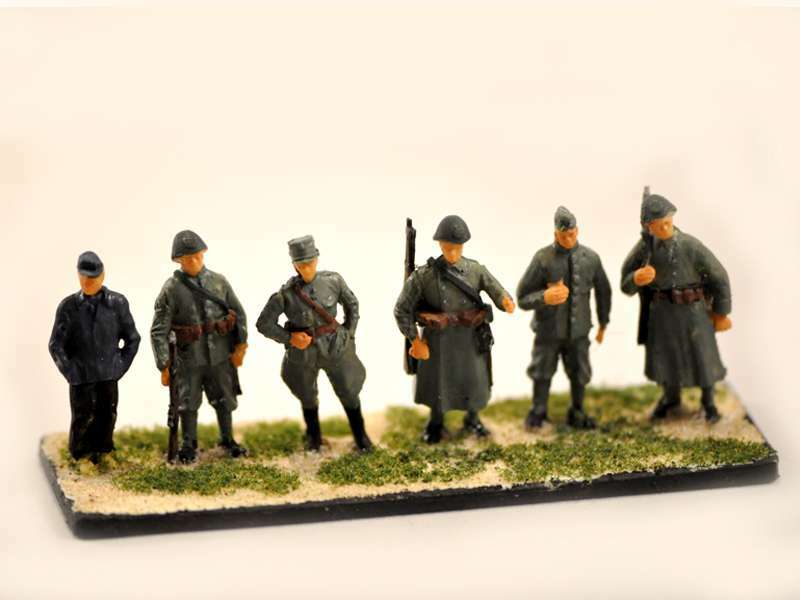 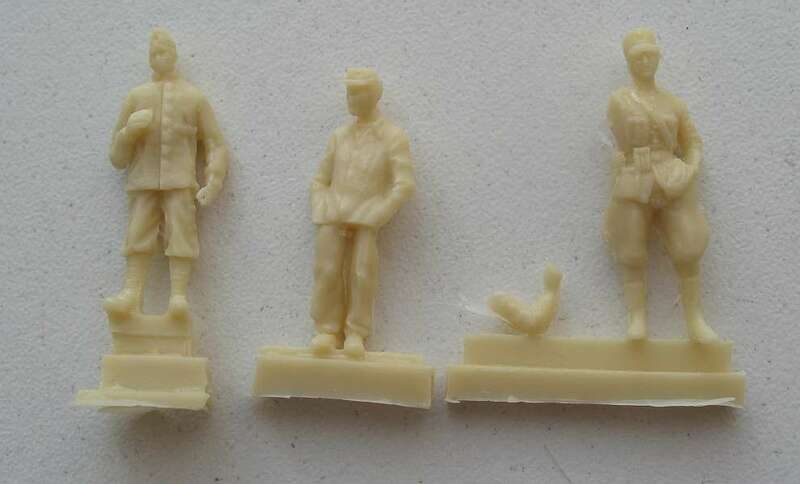 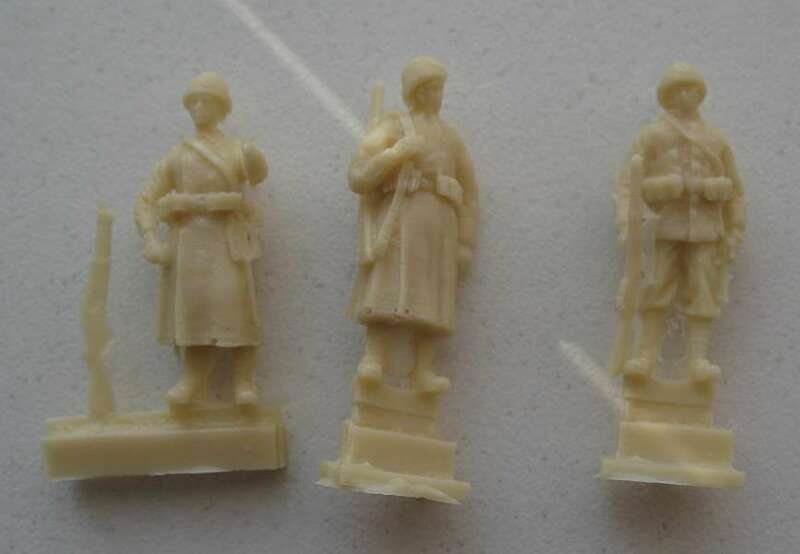 The models are from a high quality, clean cast in resin and without air bubbles. 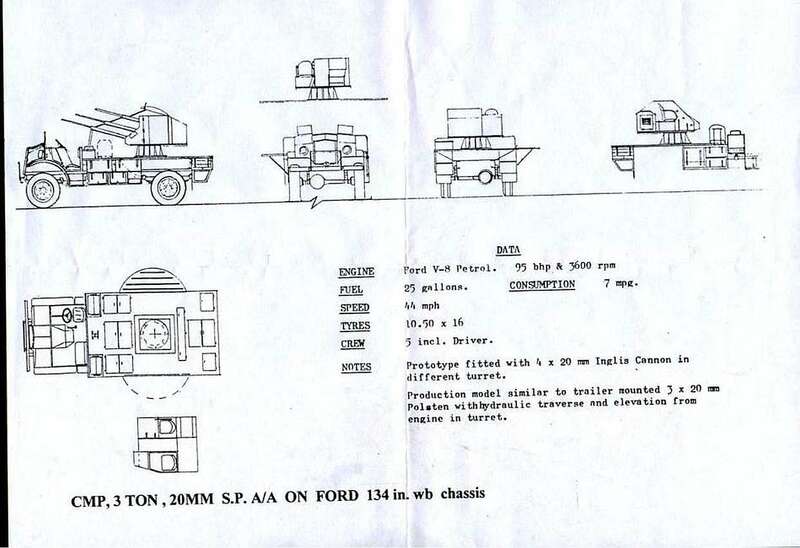 The Mk3A has a different radiator and rear end compared with the Mk3 version. 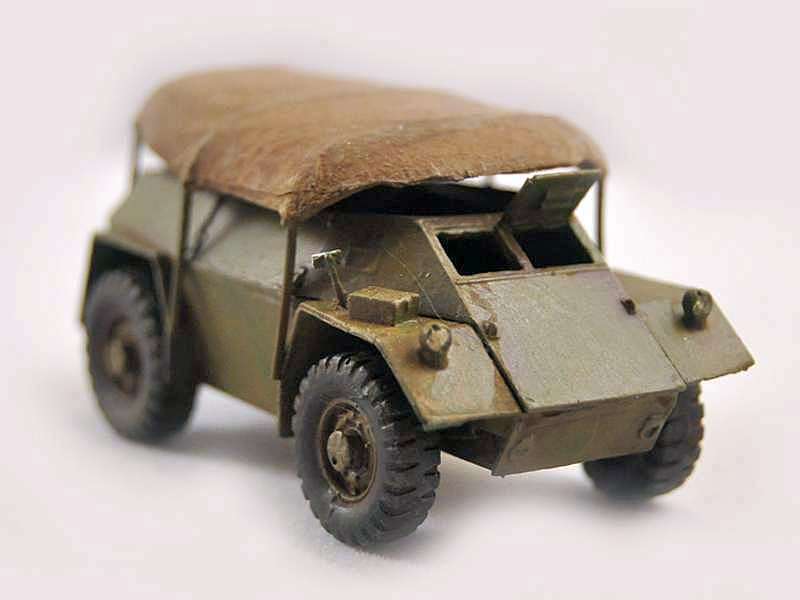 These Armoured cars were made in South Africa during WWII and were used in large numbers not only in the desert war but also in the Far East. 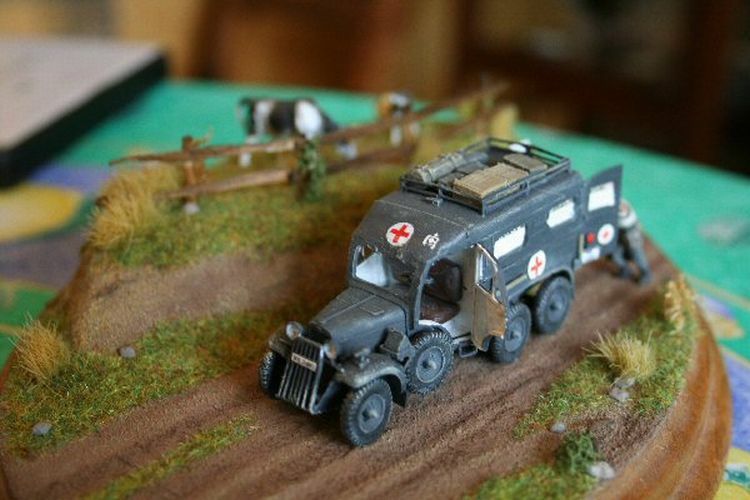 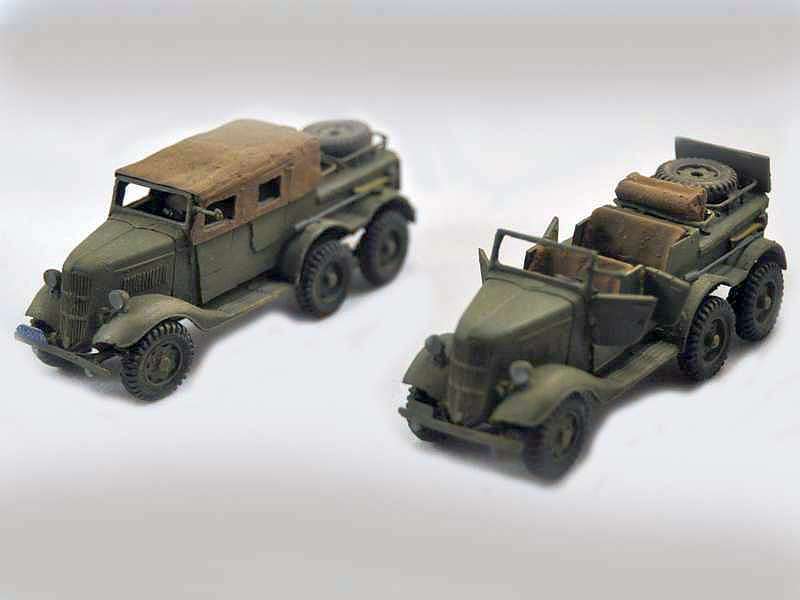 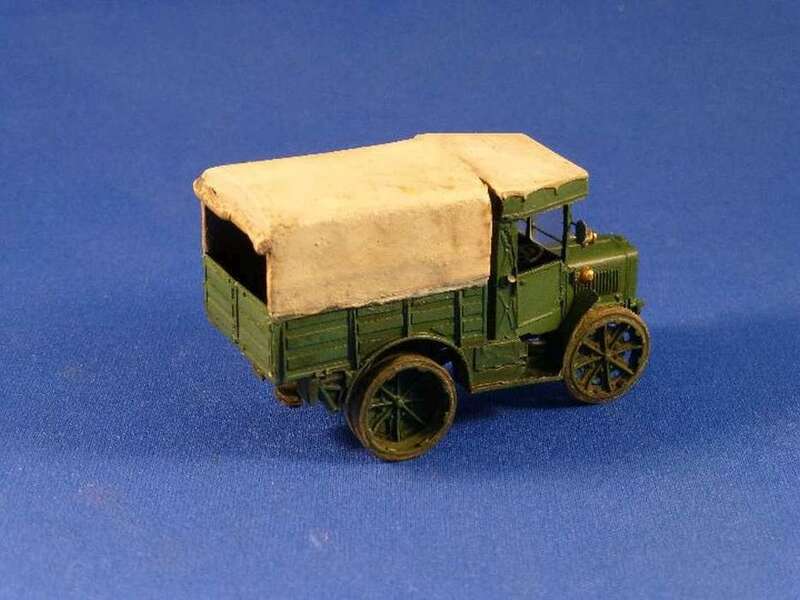 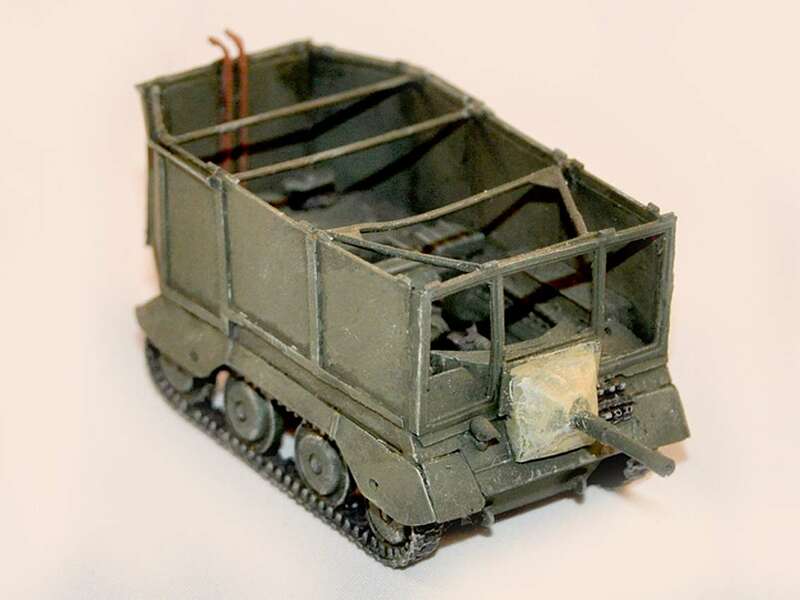 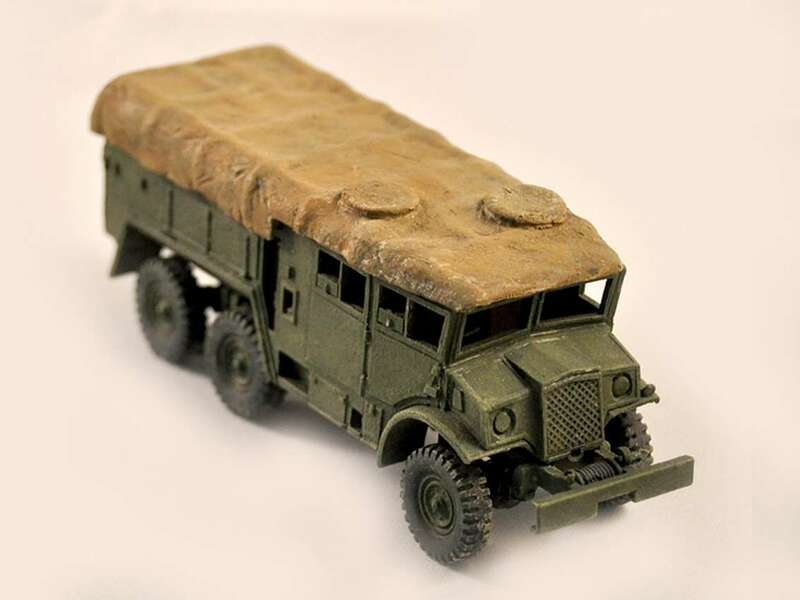 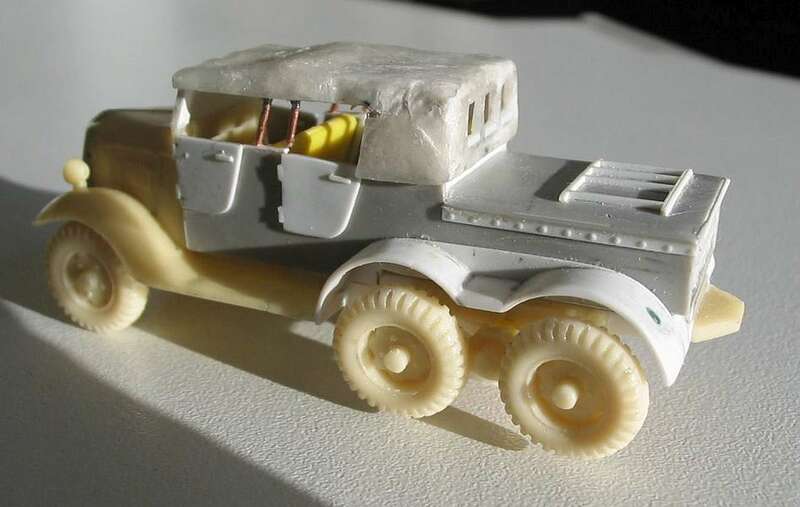 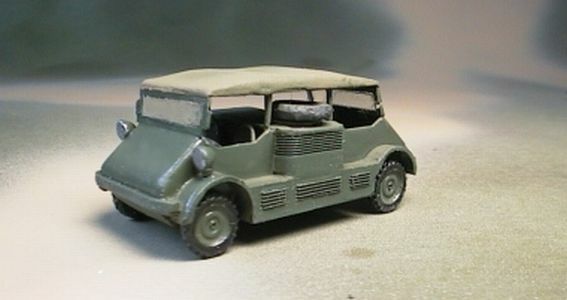 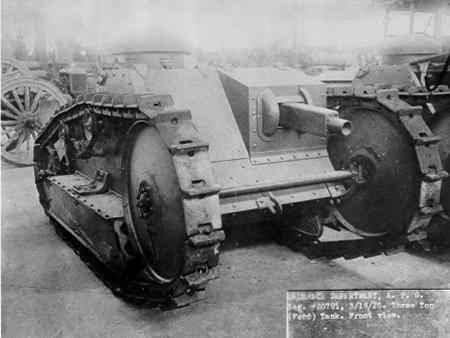 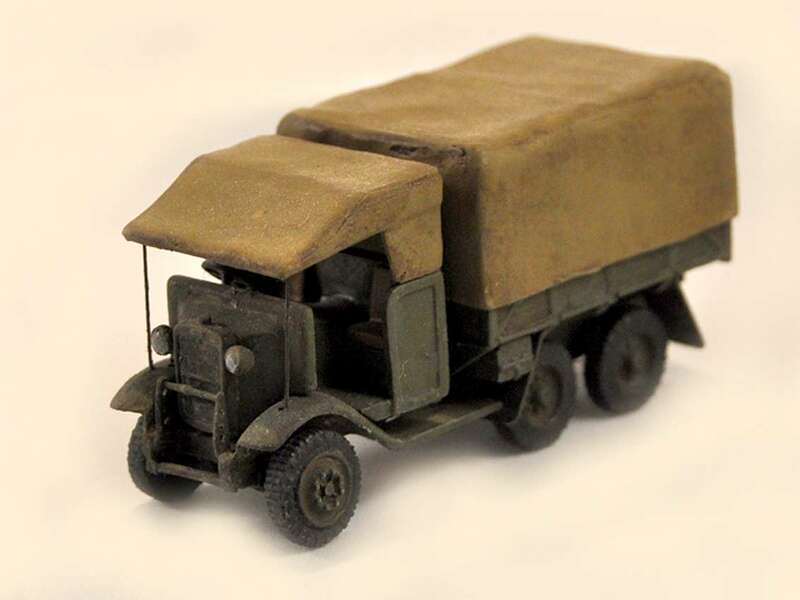 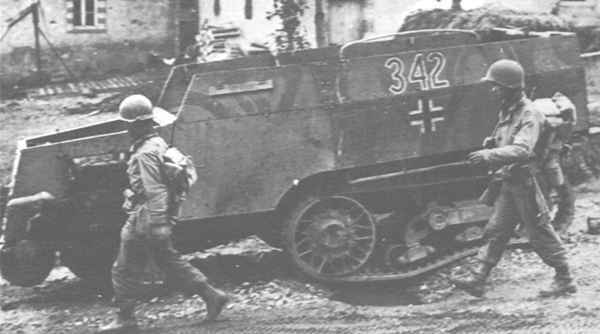 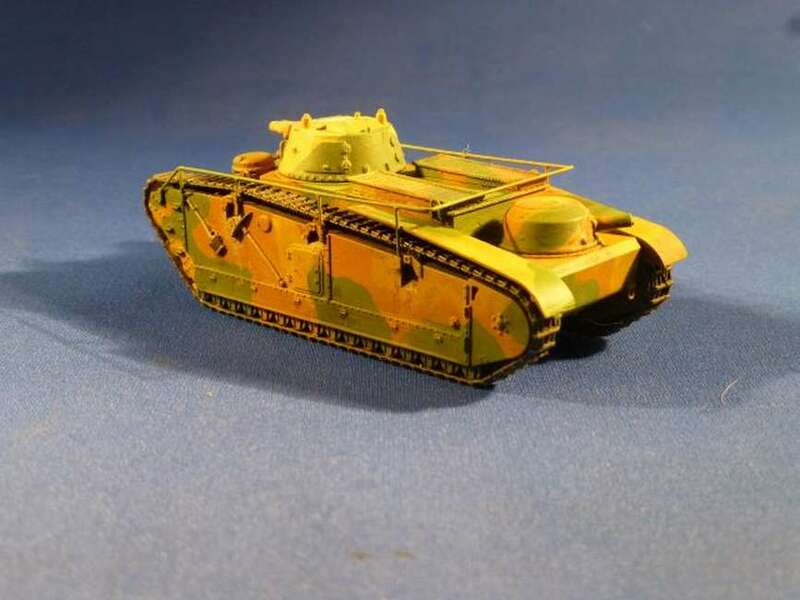 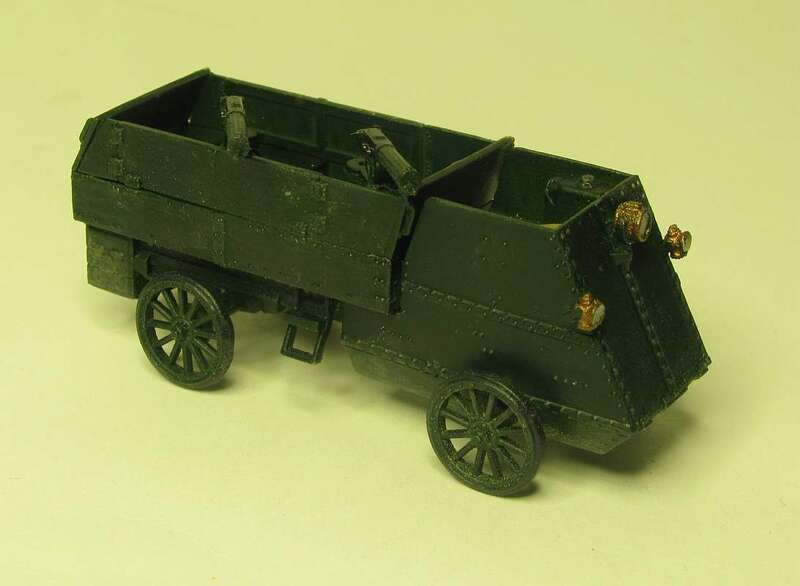 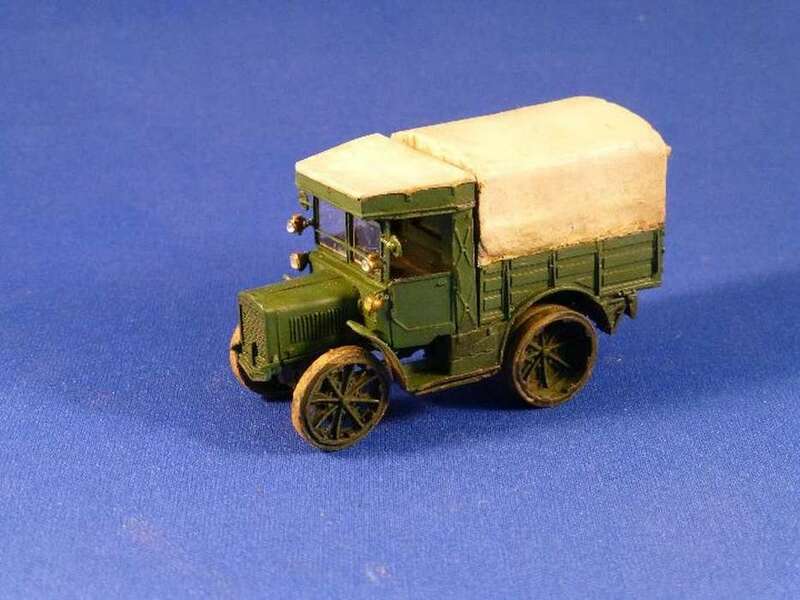 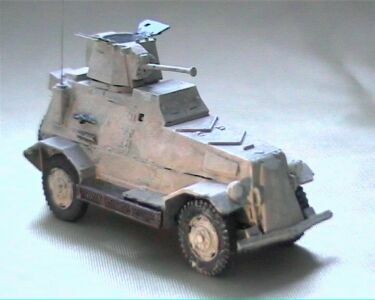 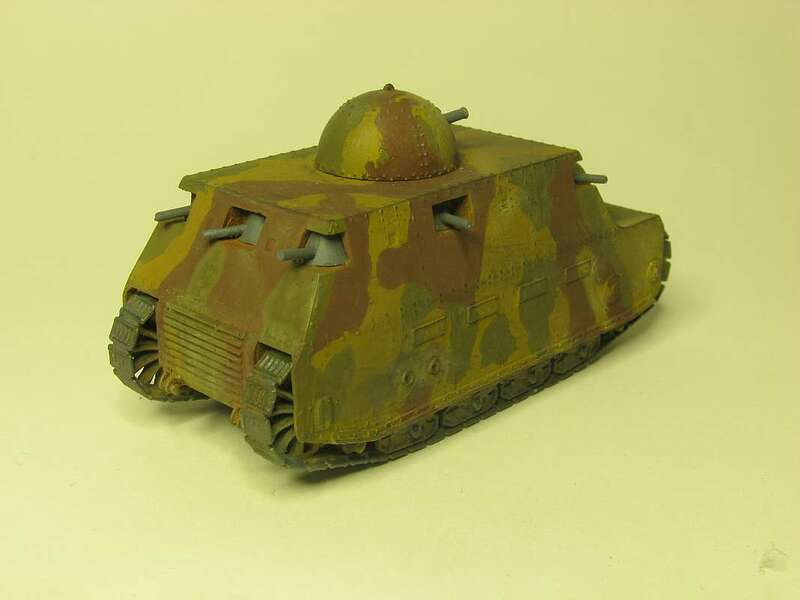 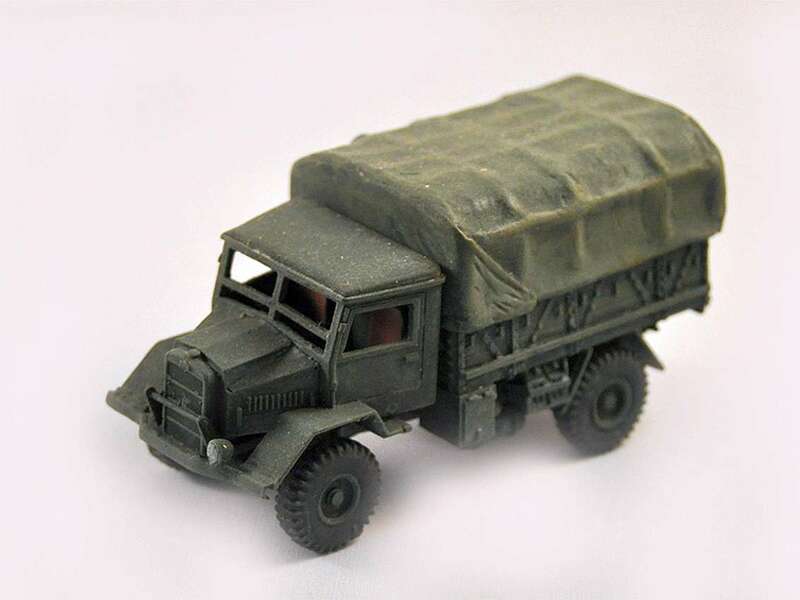 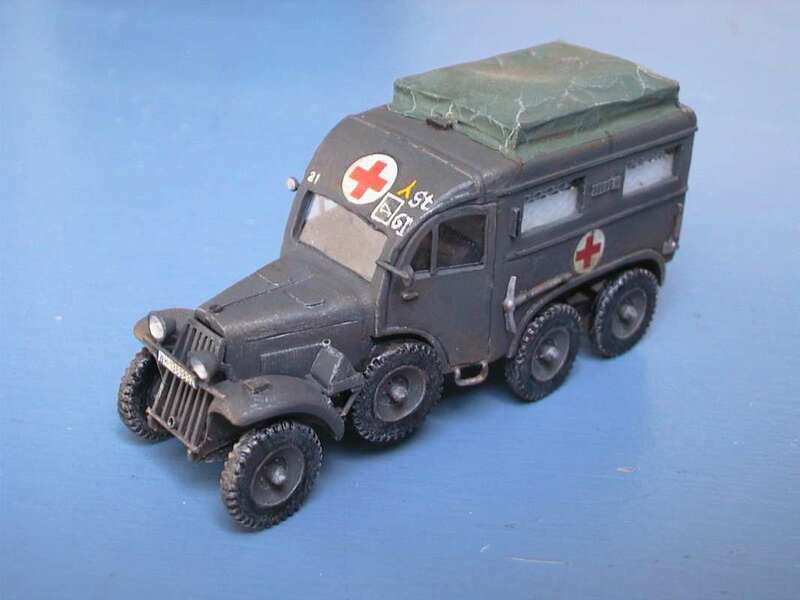 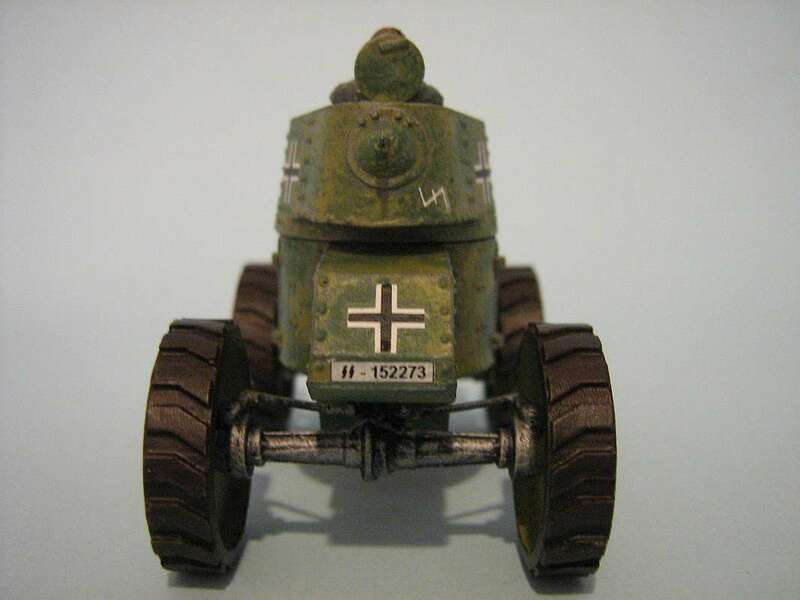 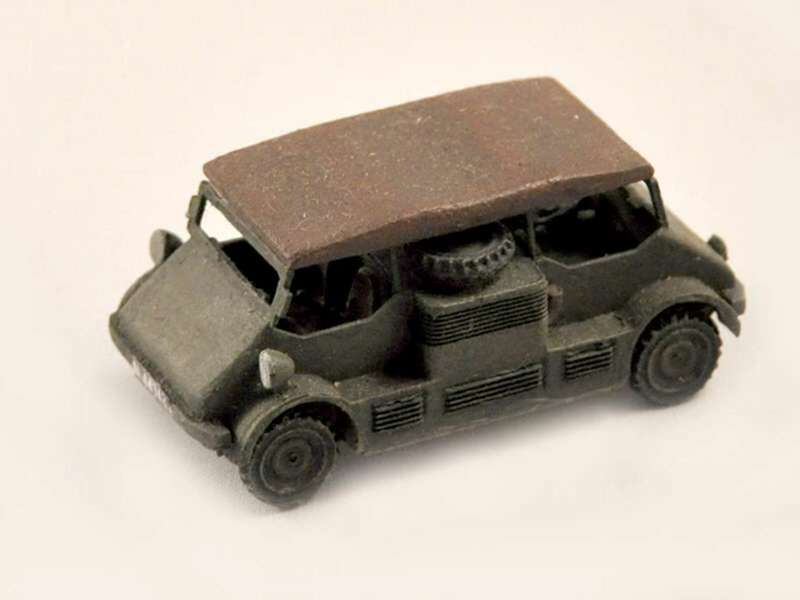 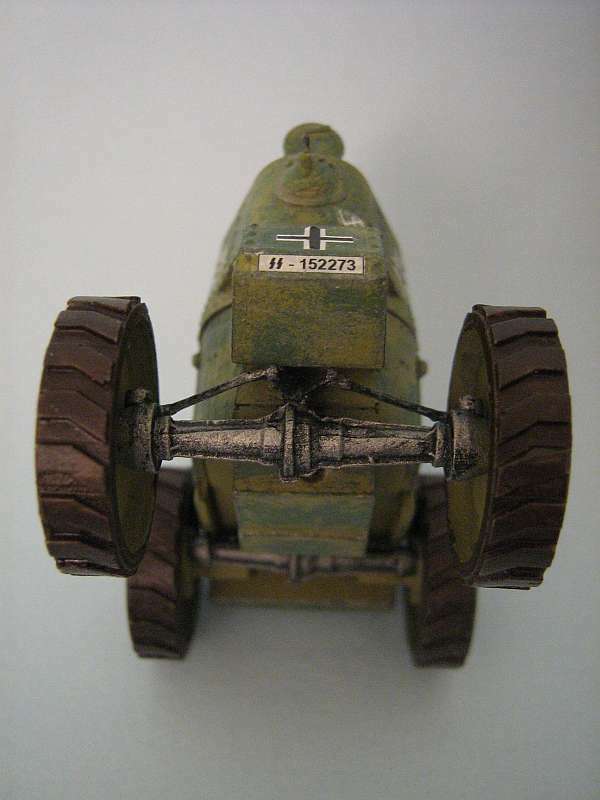 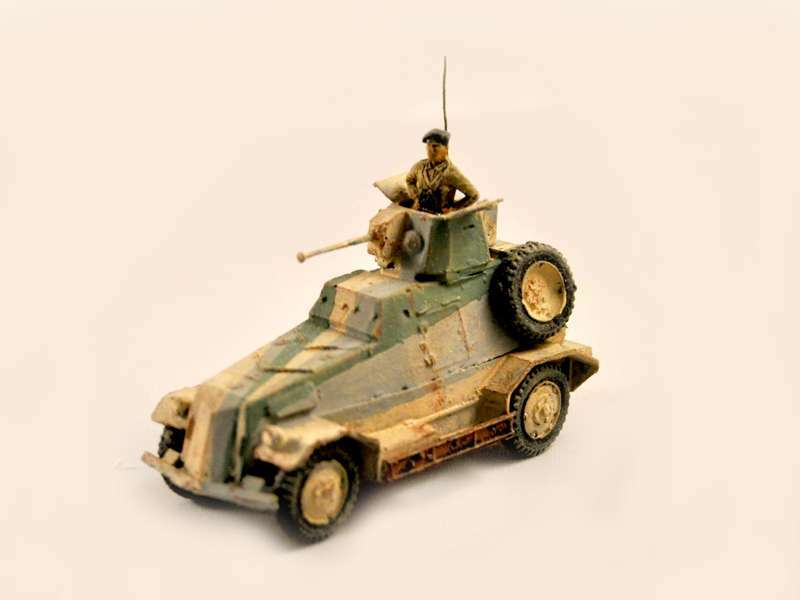 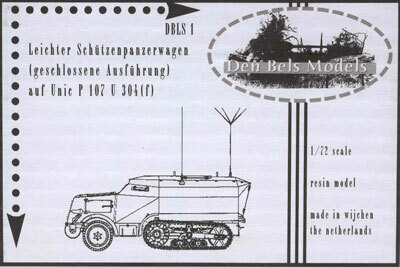 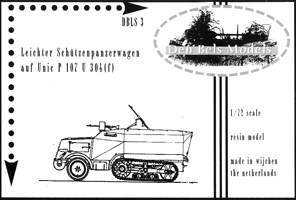 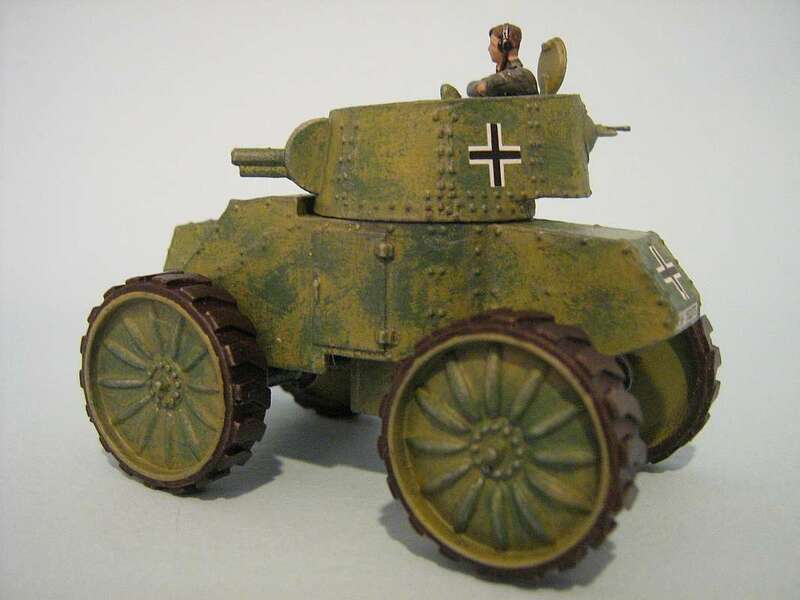 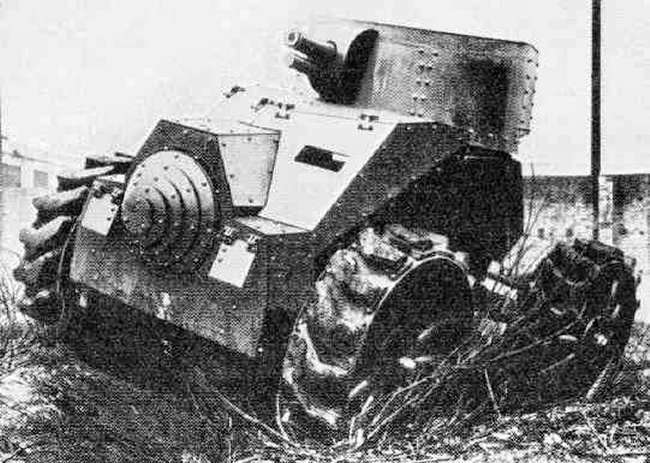 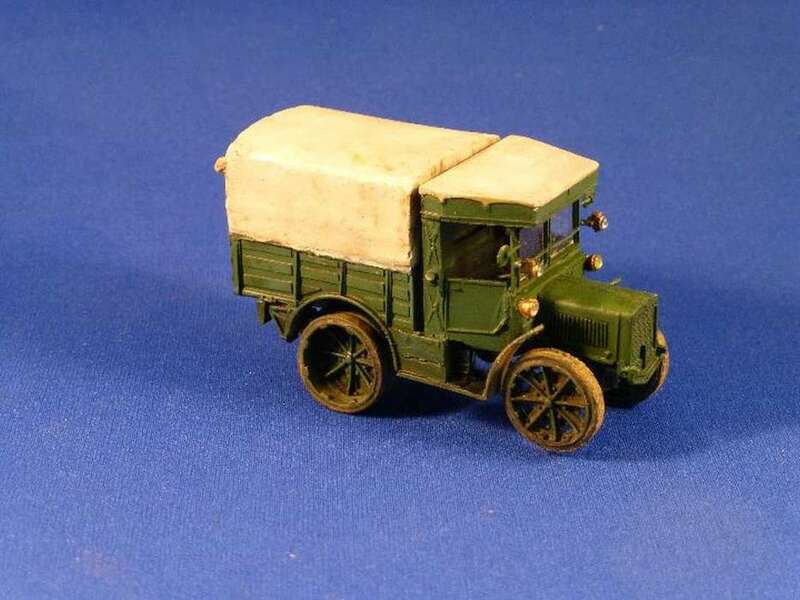 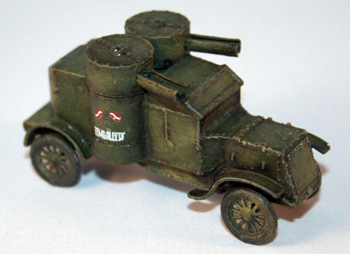 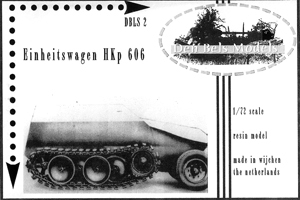 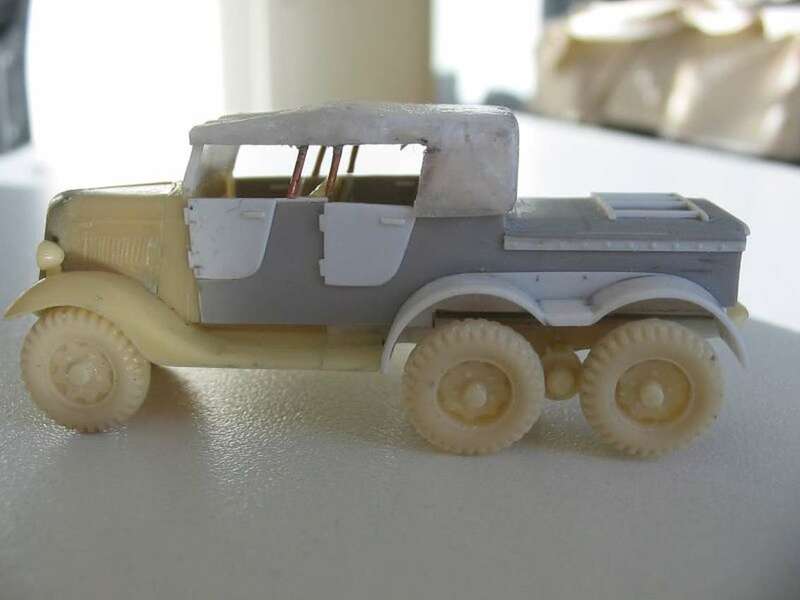 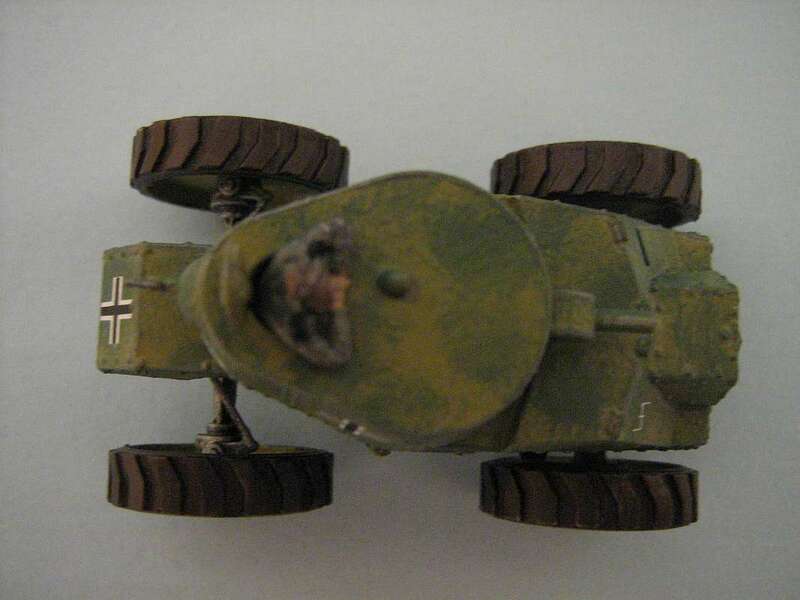 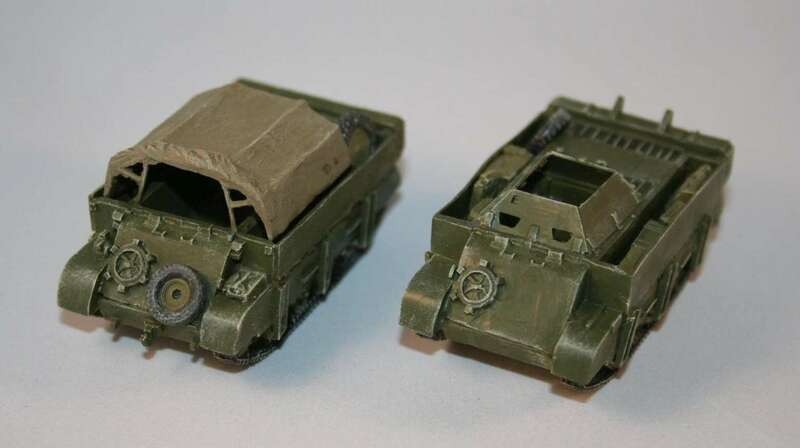 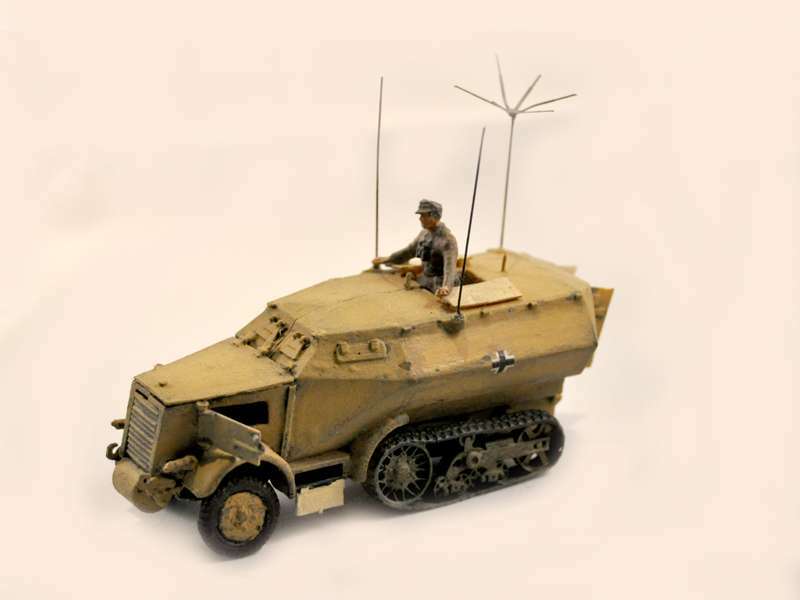 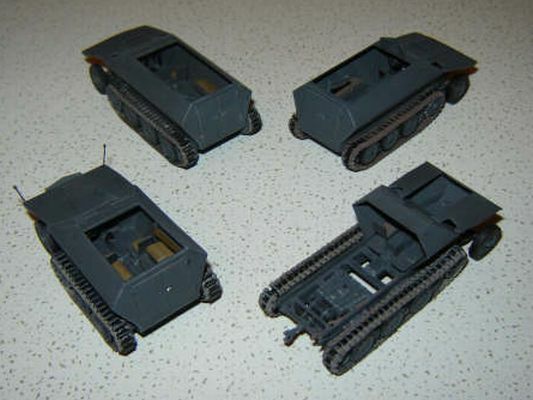 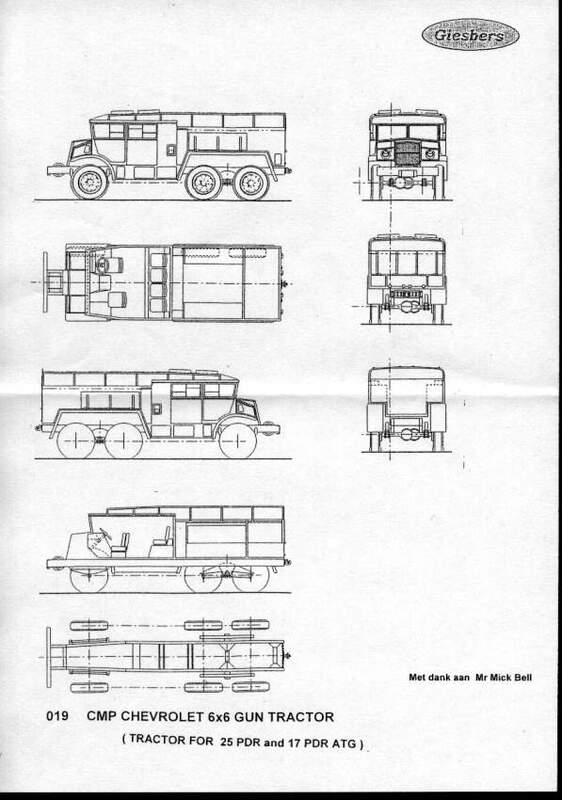 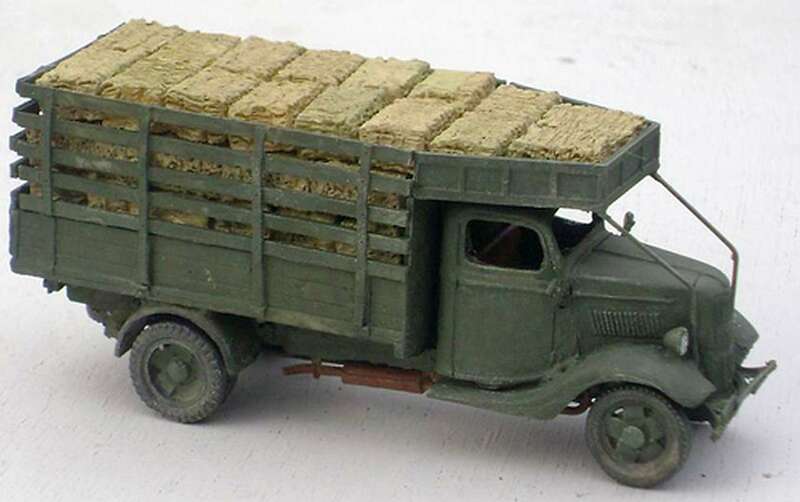 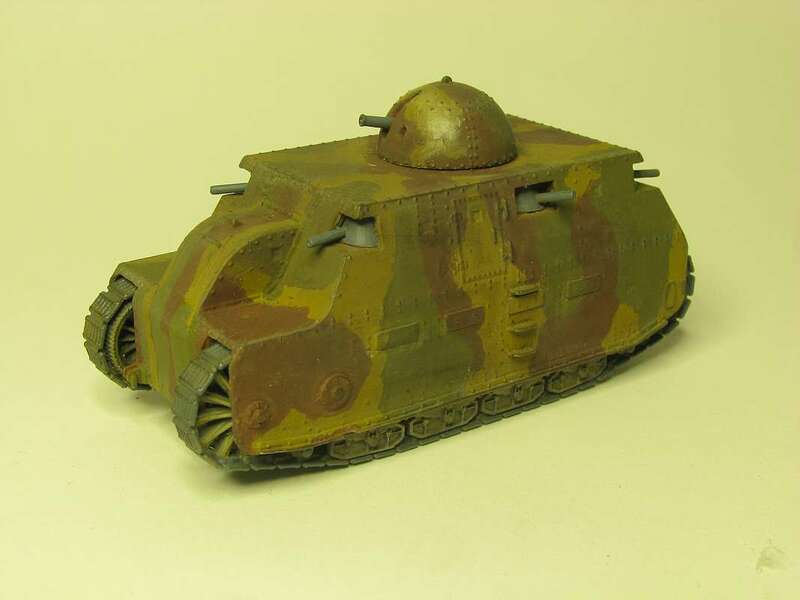 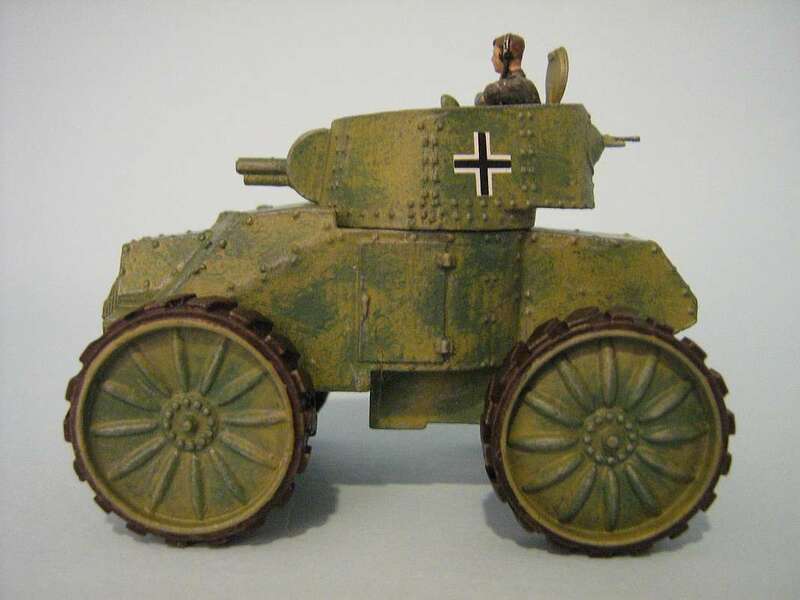 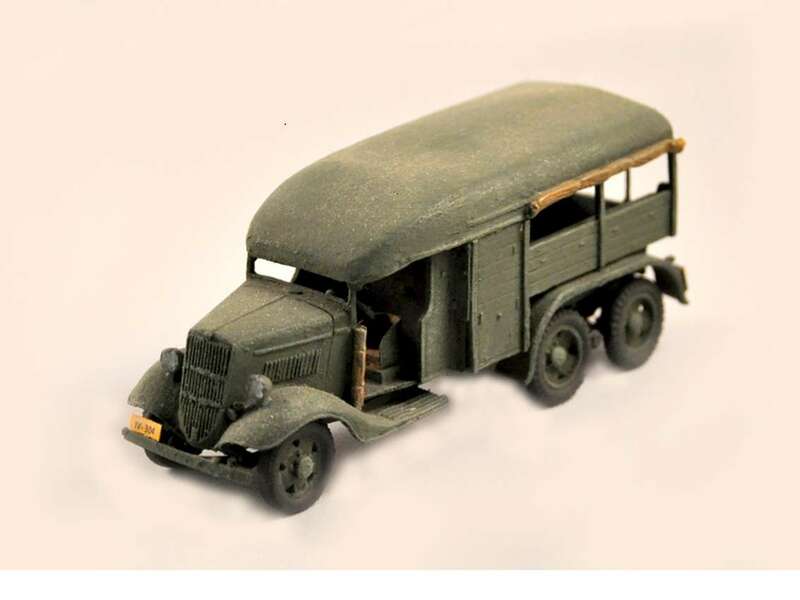 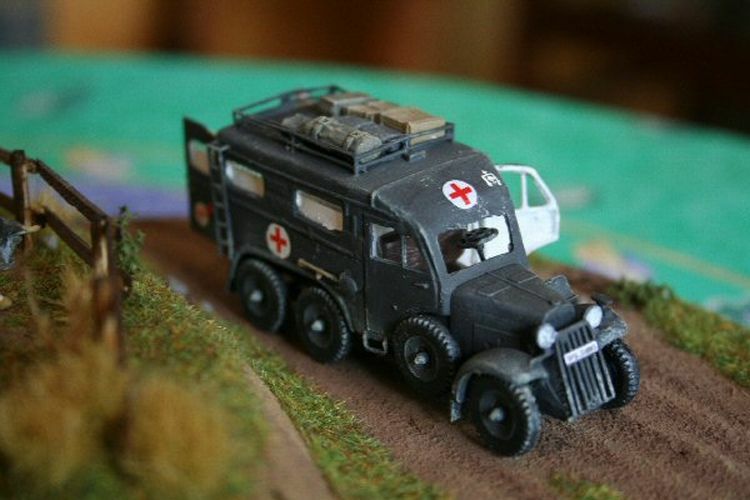 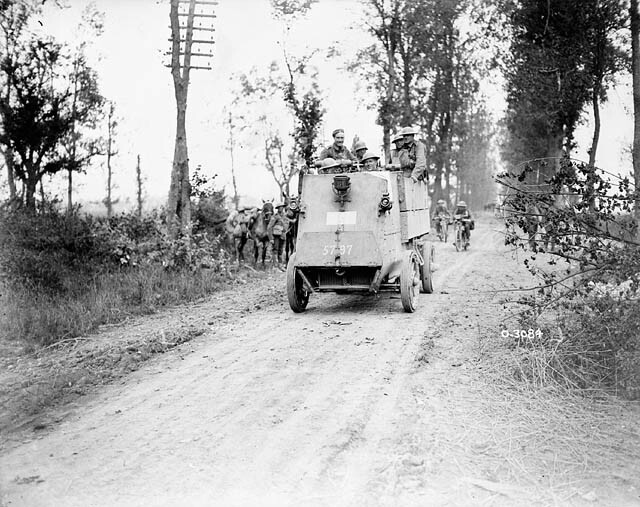 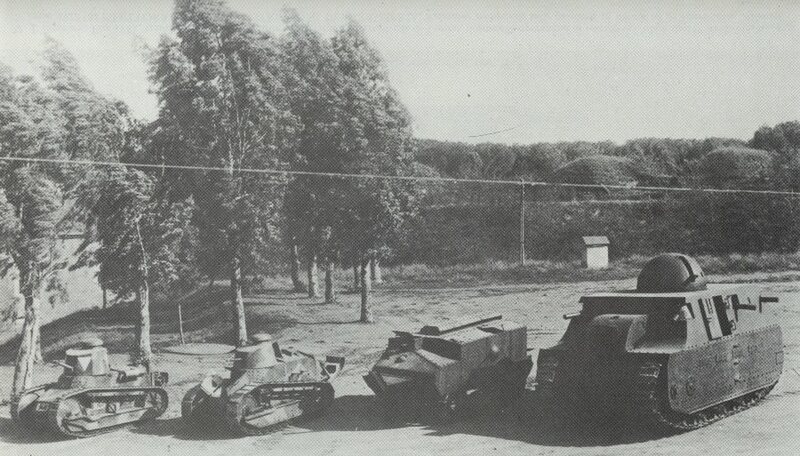 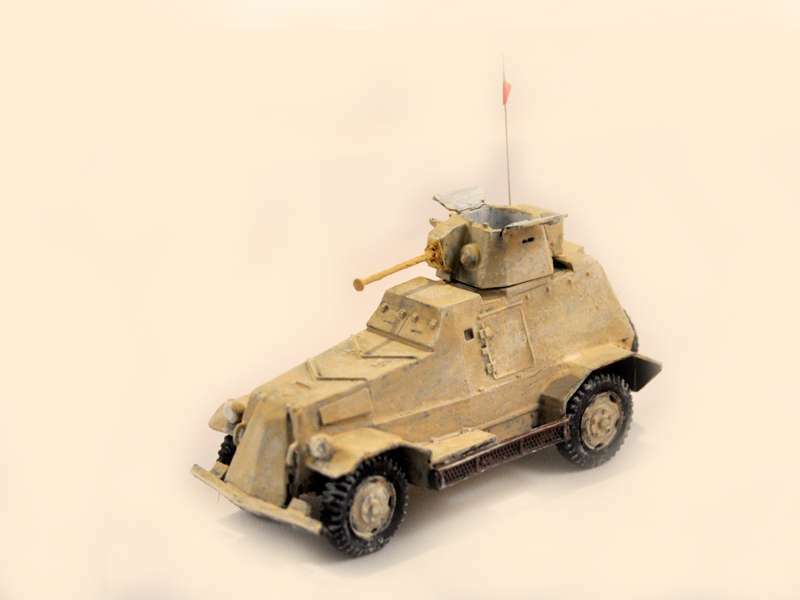 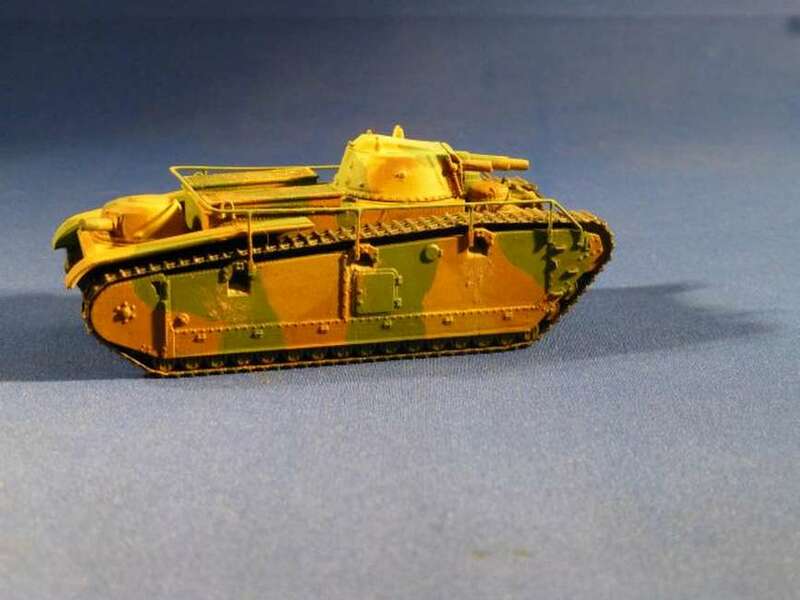 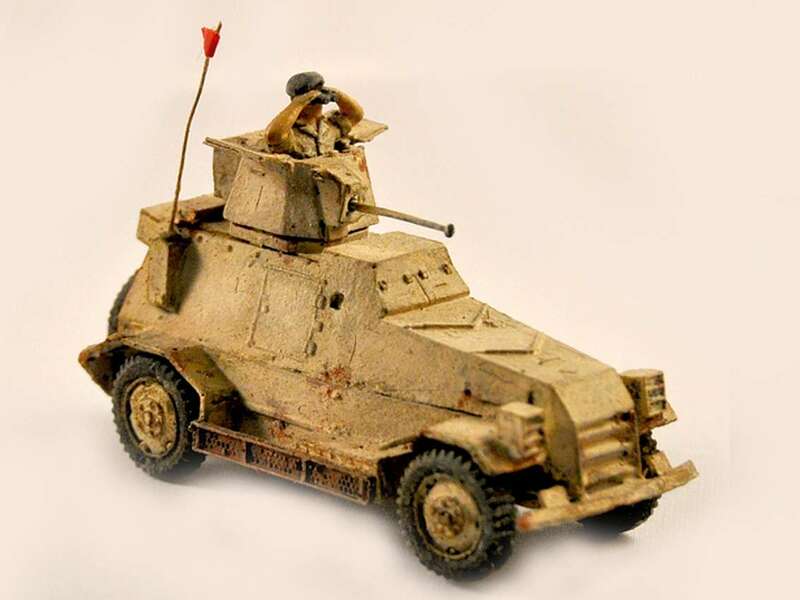 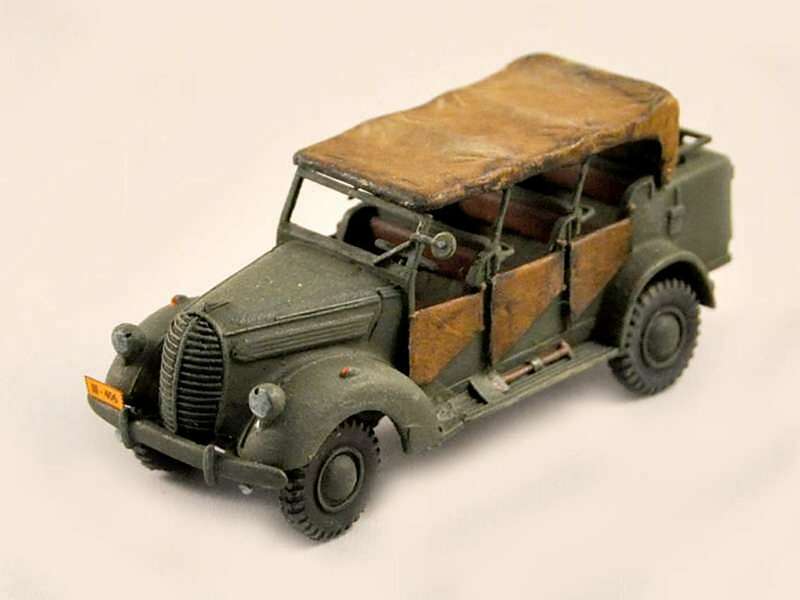 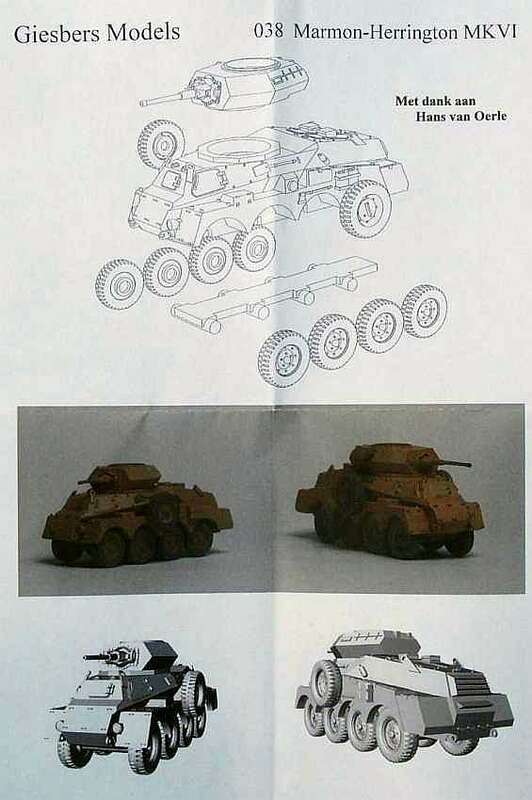 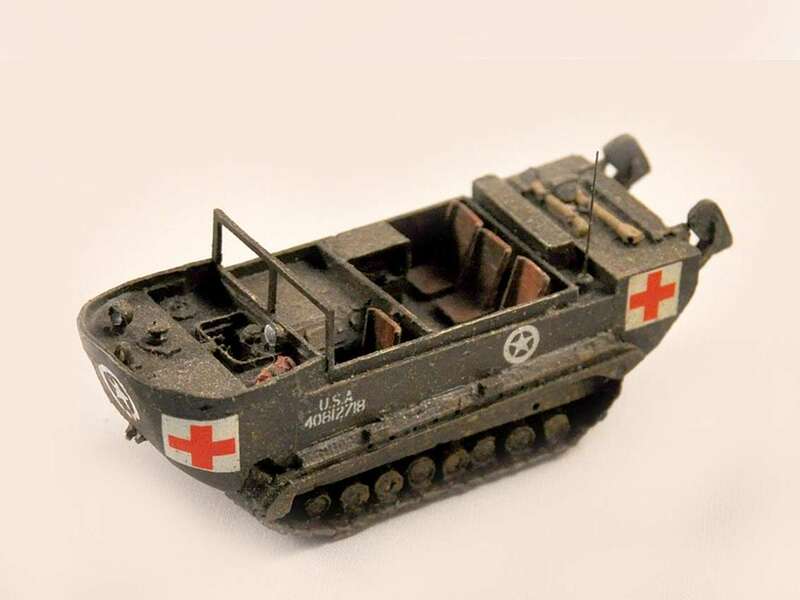 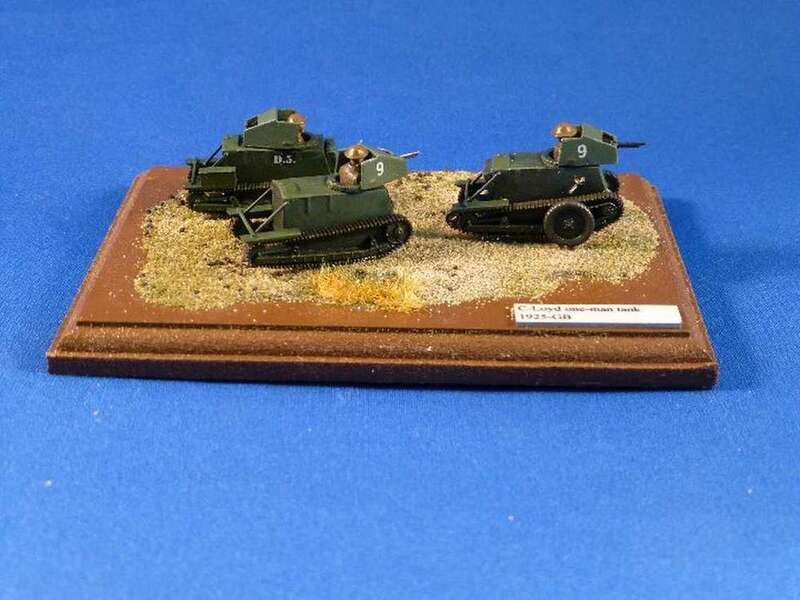 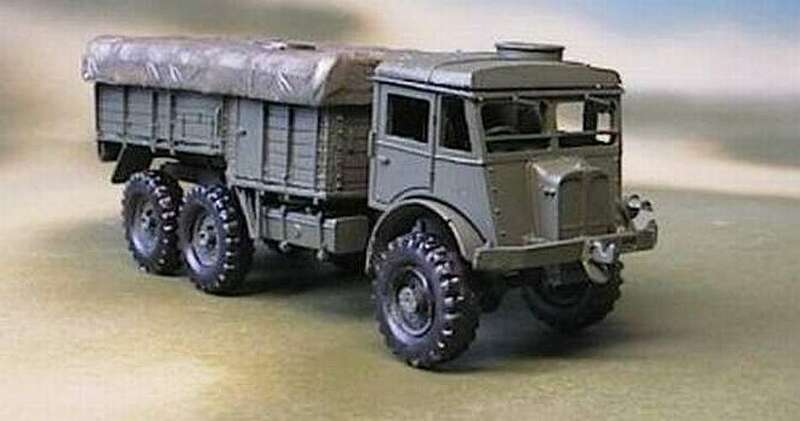 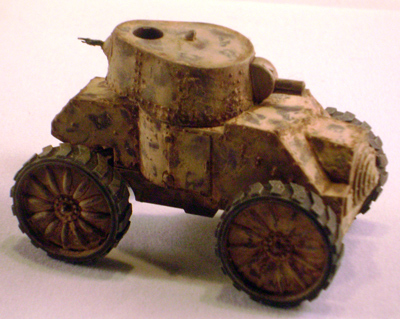 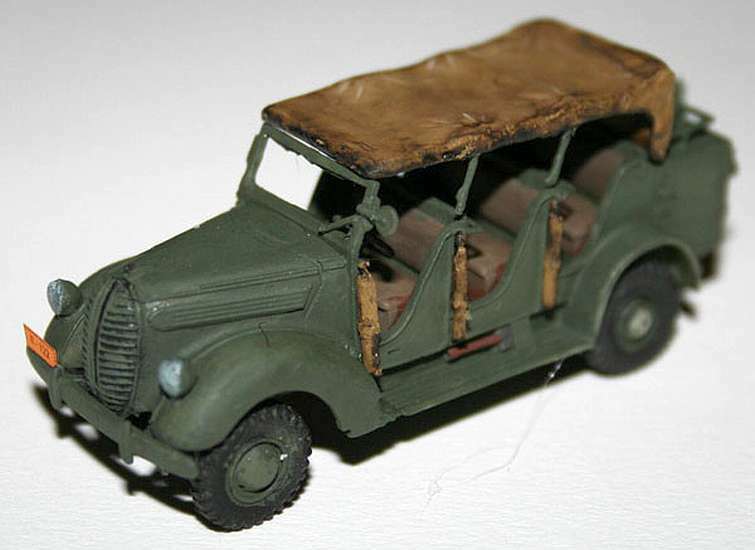 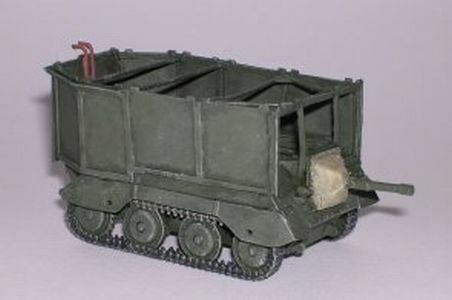 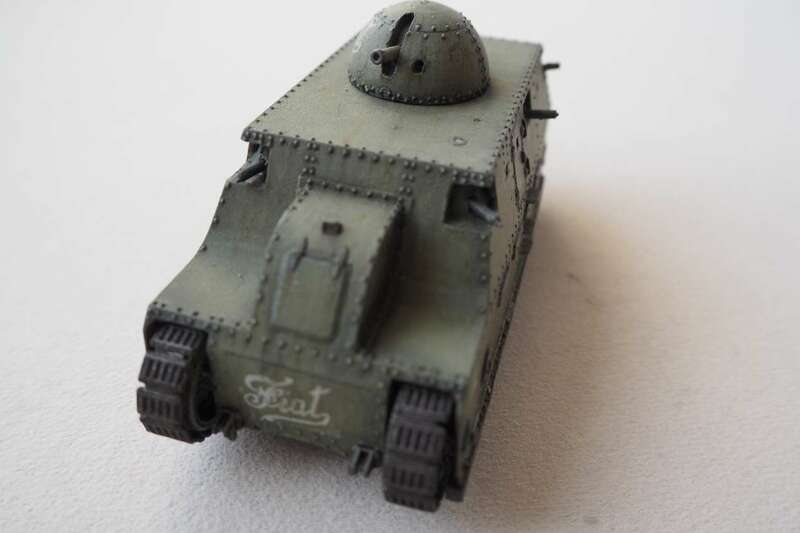 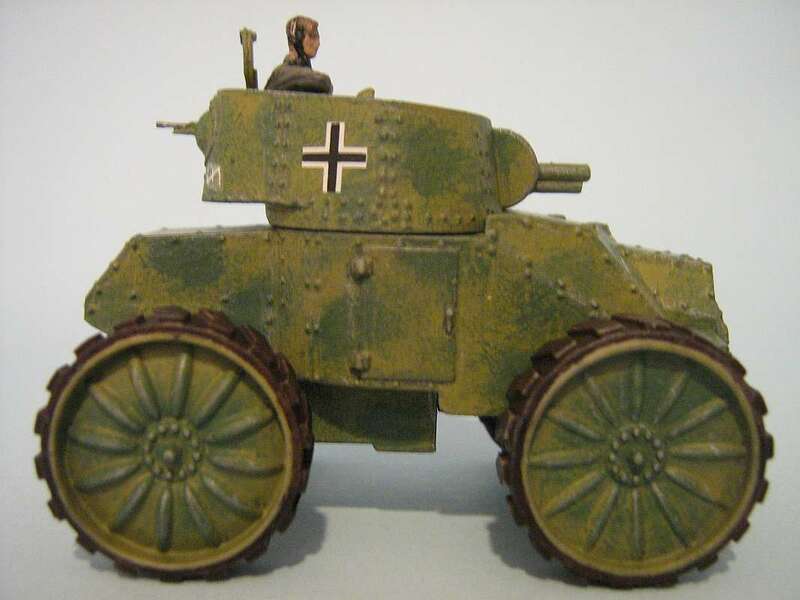 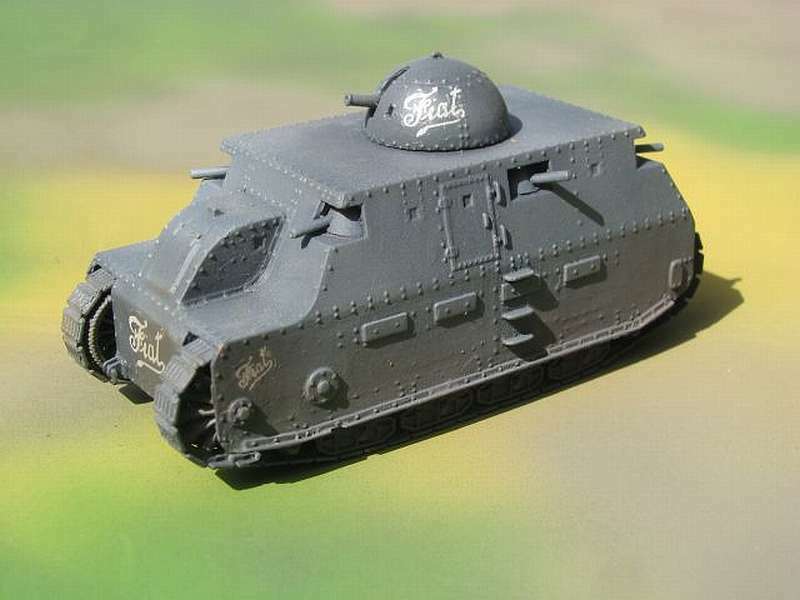 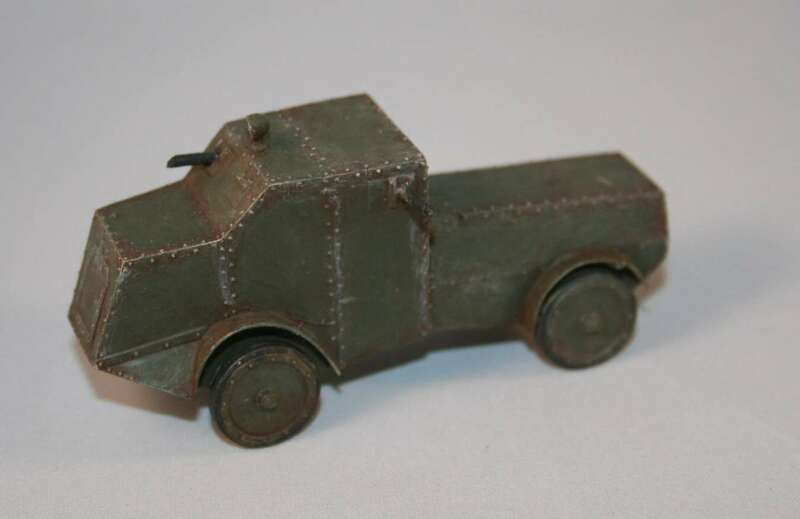 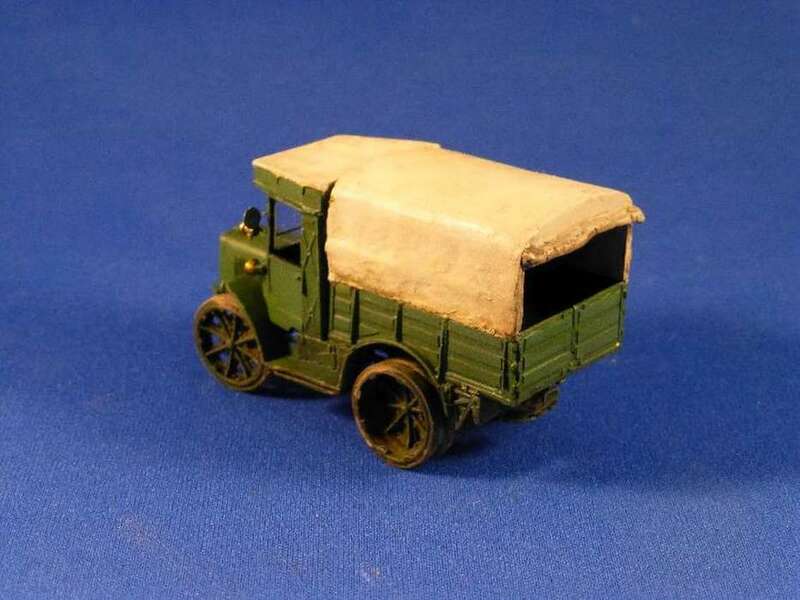 Captured vehicles were used by the Germans as well as the Japanese.With these two models as a basis a large number of conversions can be made. 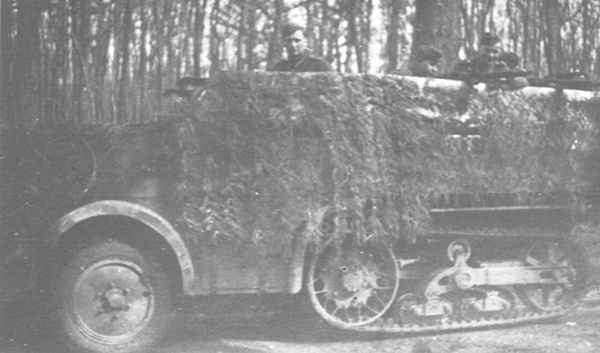 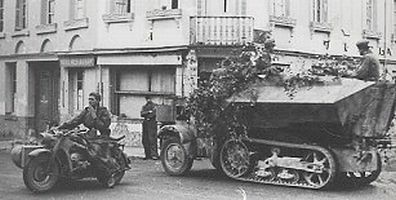 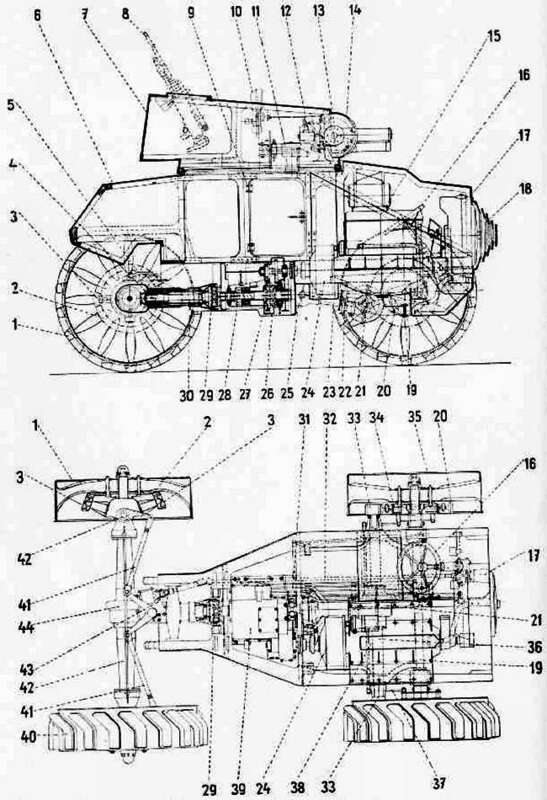 For example the Germans used a turretless captured vehicle and the allies one with the turret removed and replaced by a 2pdr AT gun. 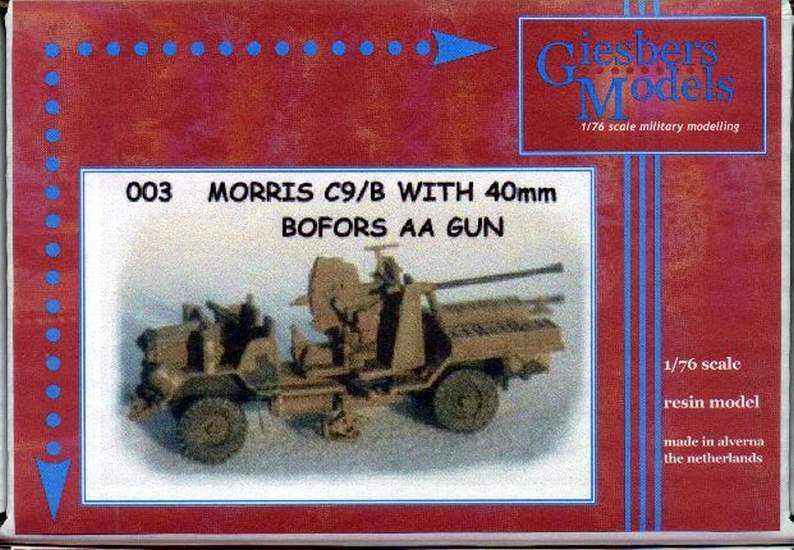 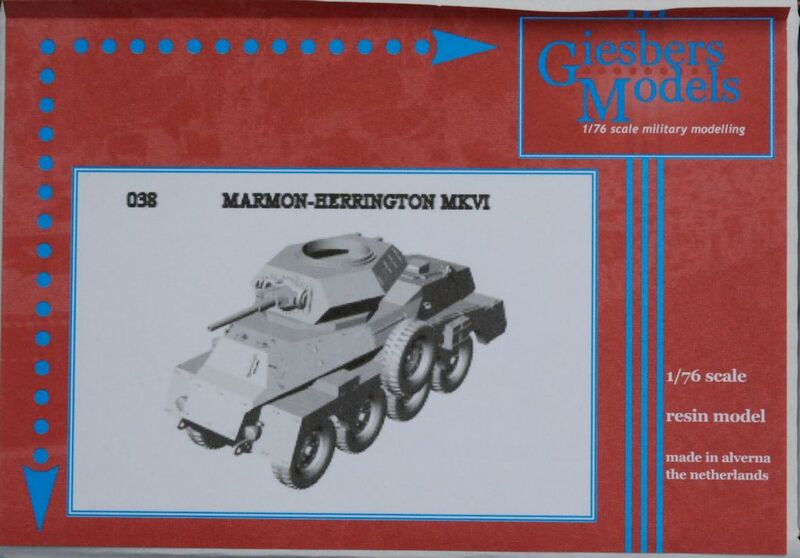 This is a model of the 40 mm Bofors on the Morris-Commercial C9/B. 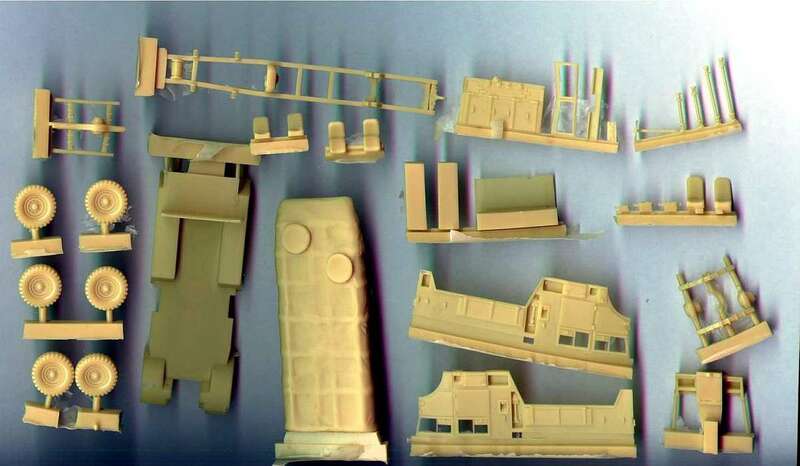 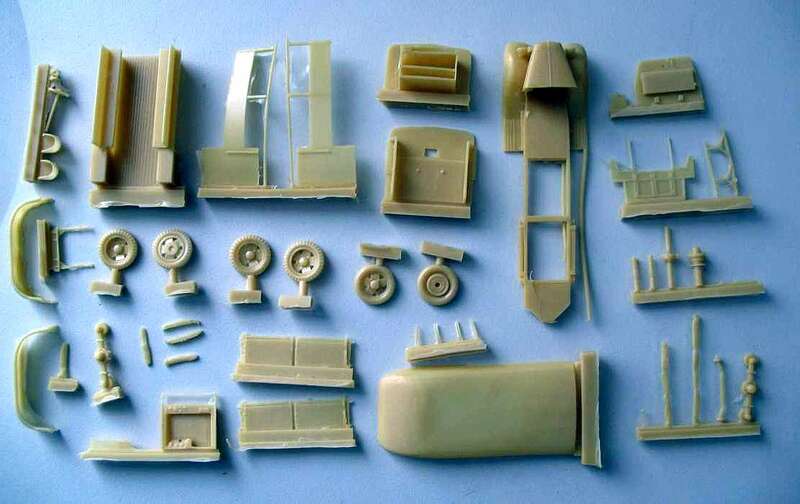 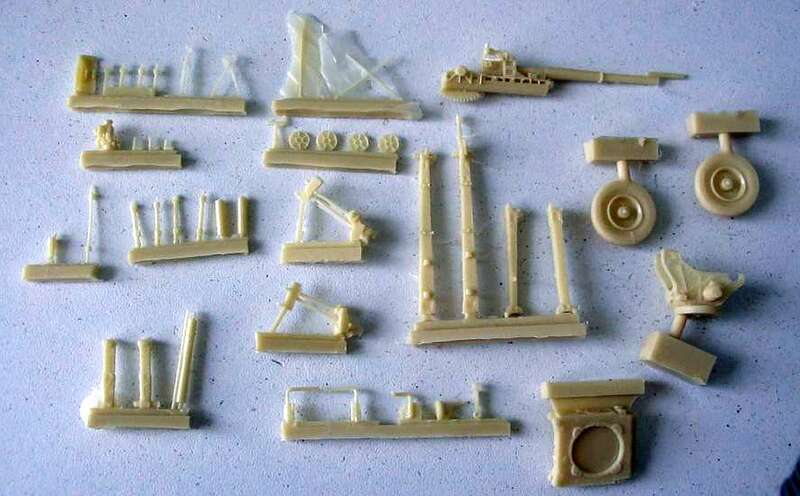 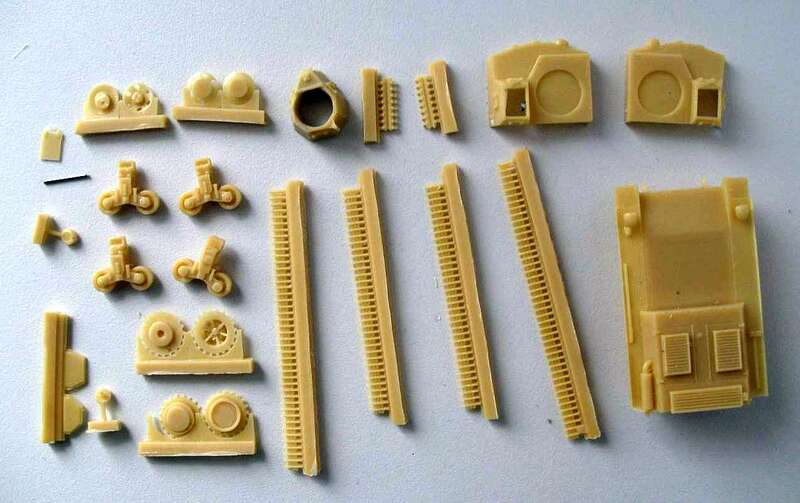 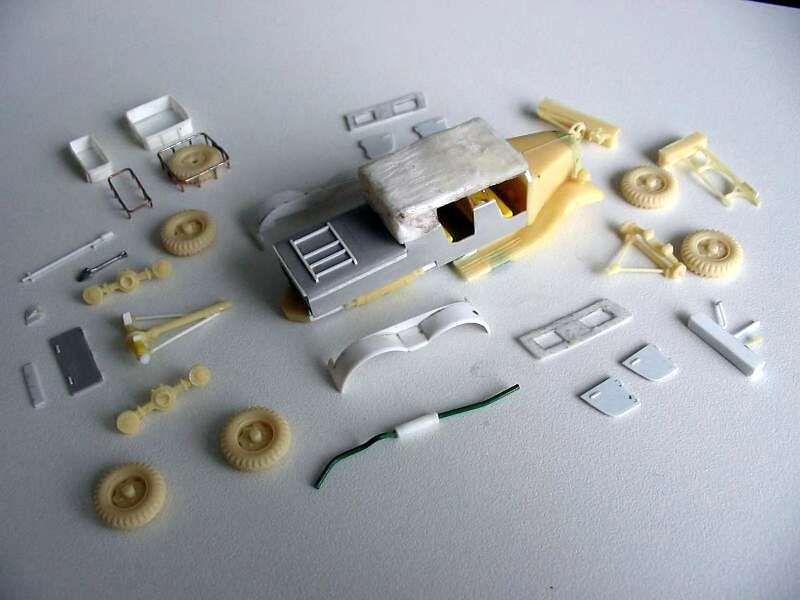 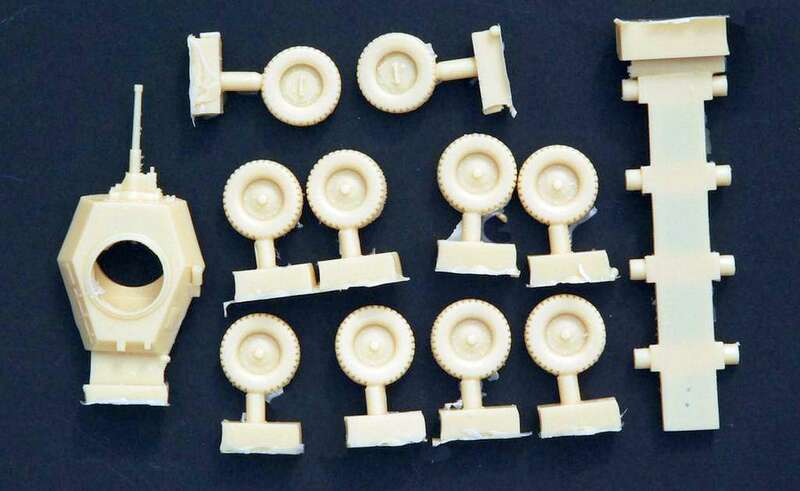 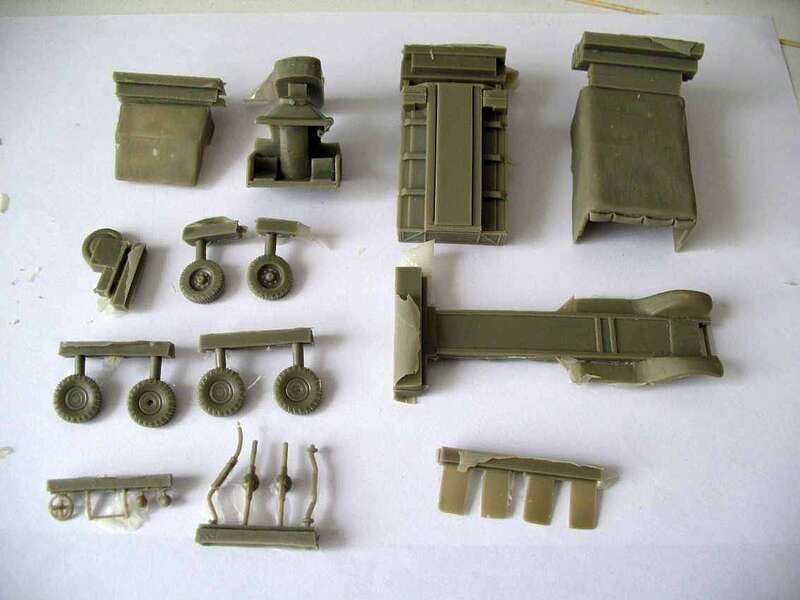 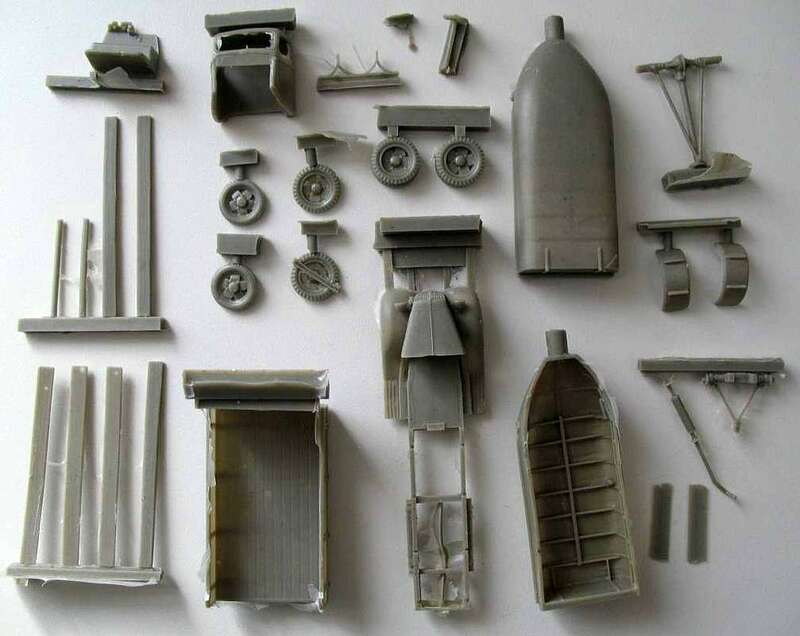 The kit consist of a large number of cleanly cast parts. 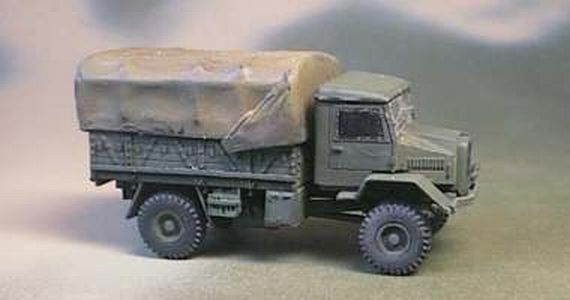 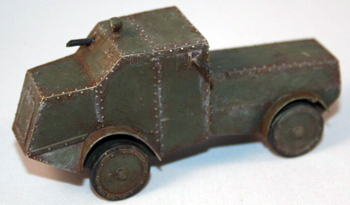 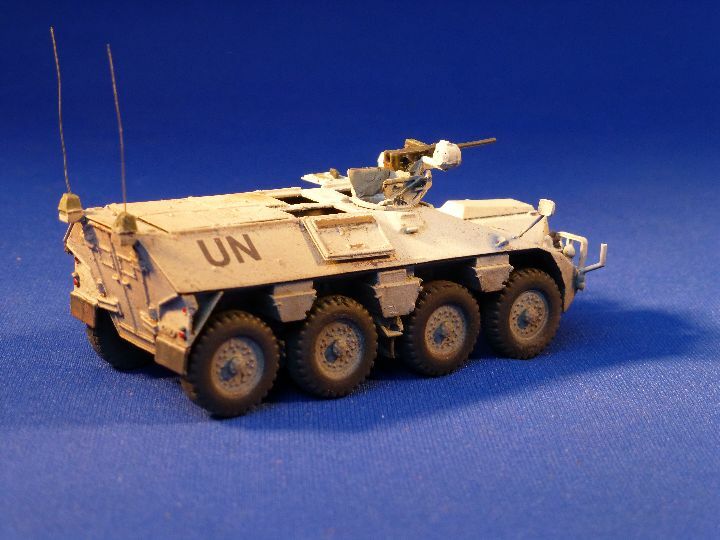 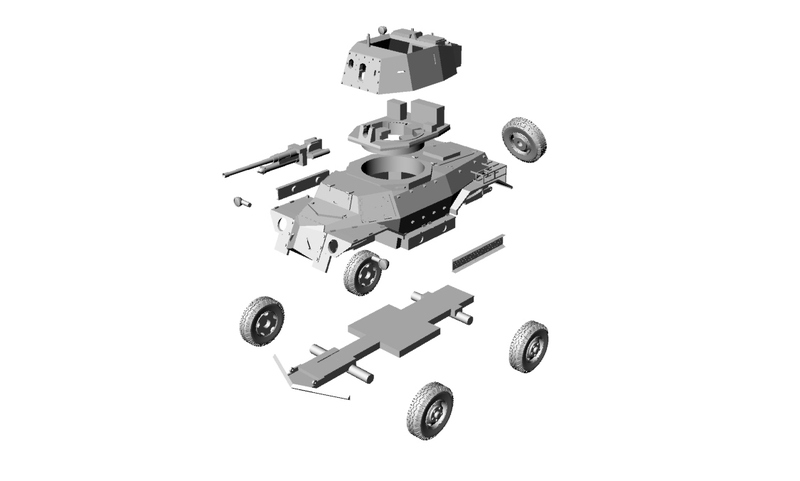 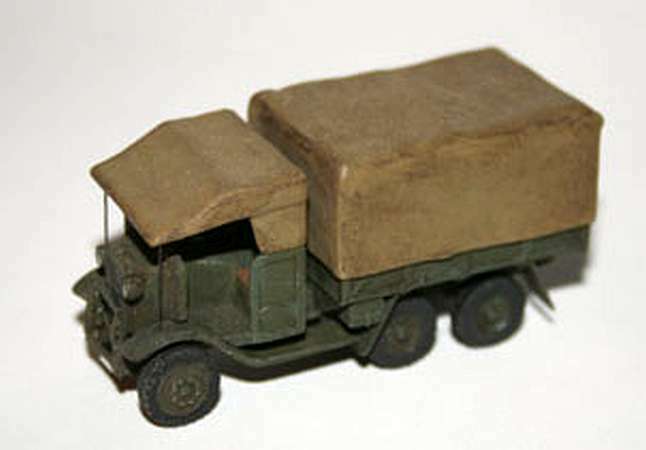 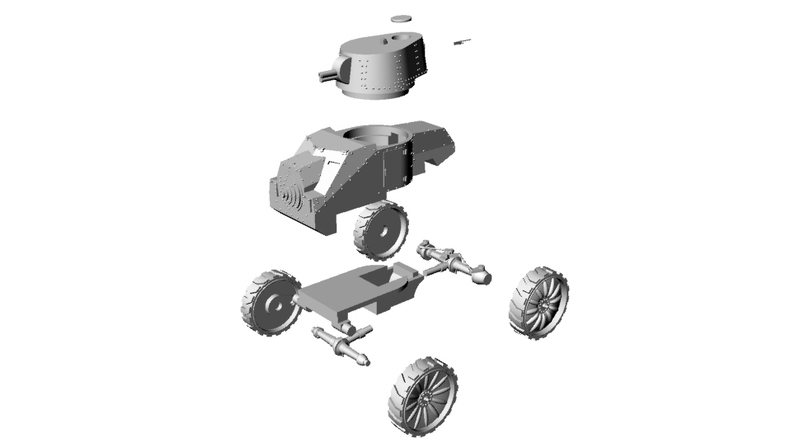 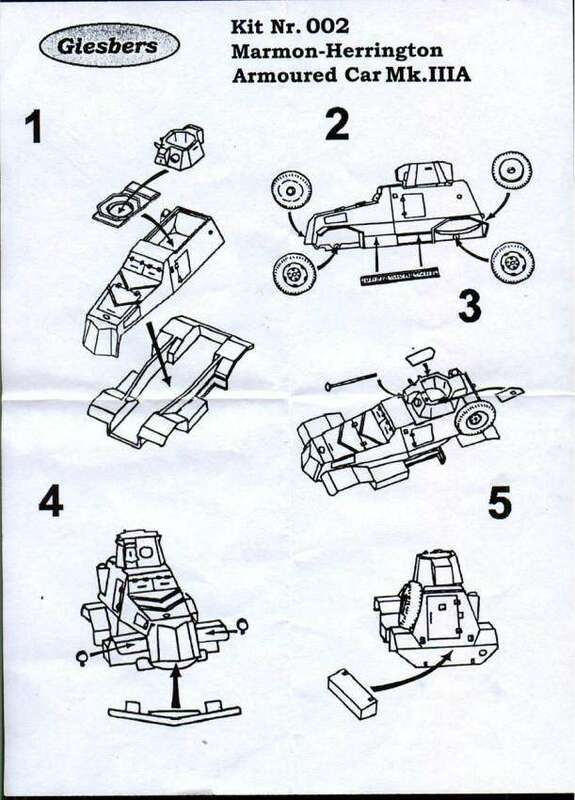 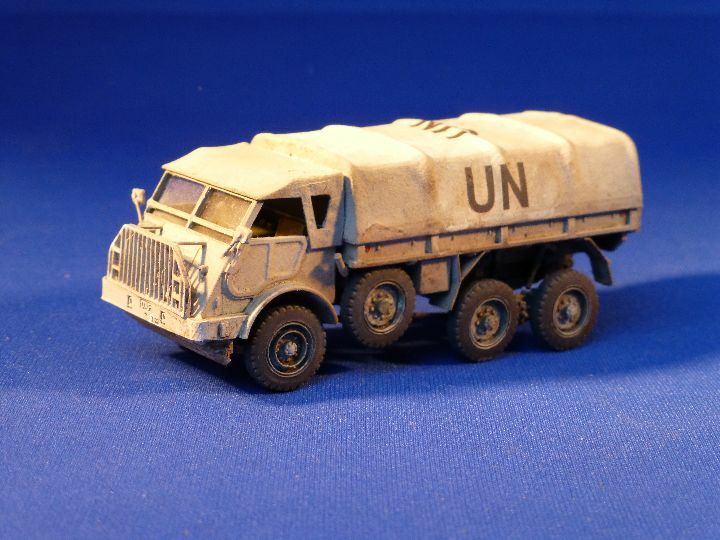 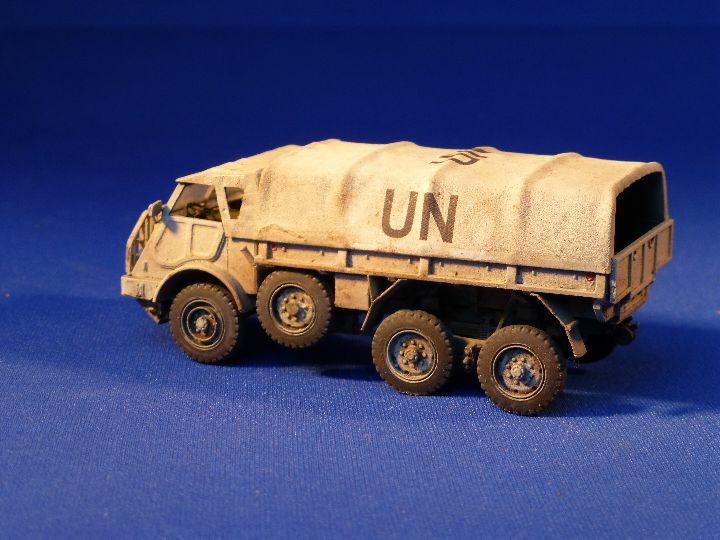 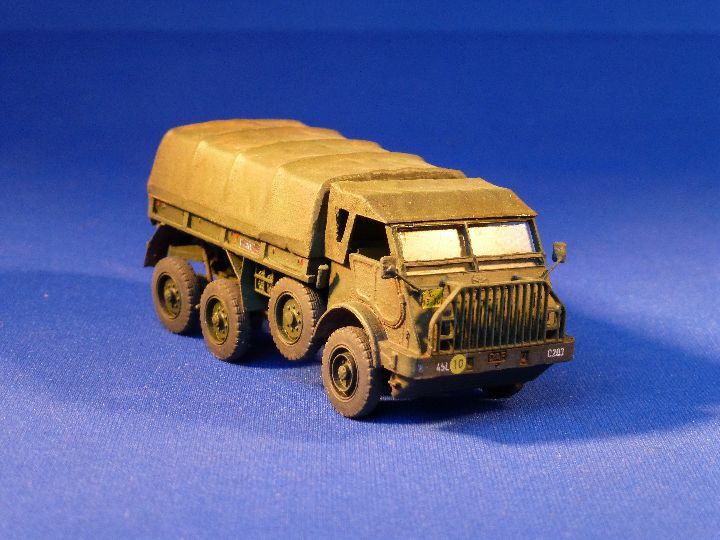 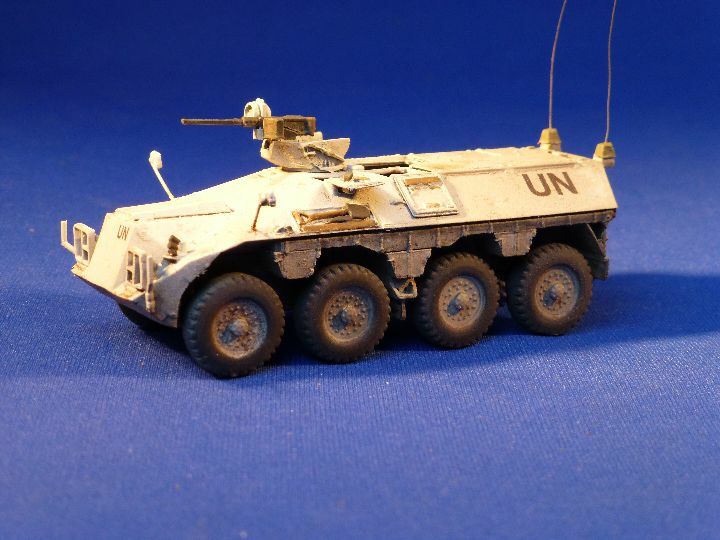 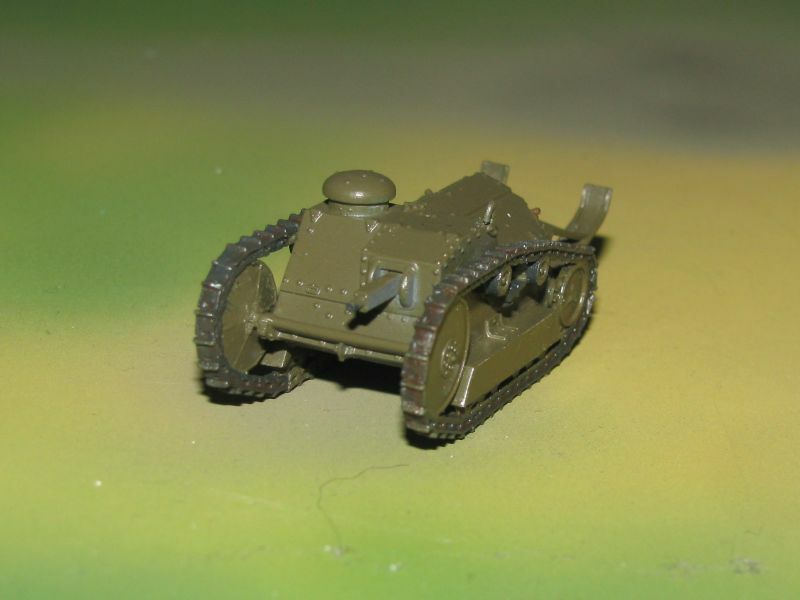 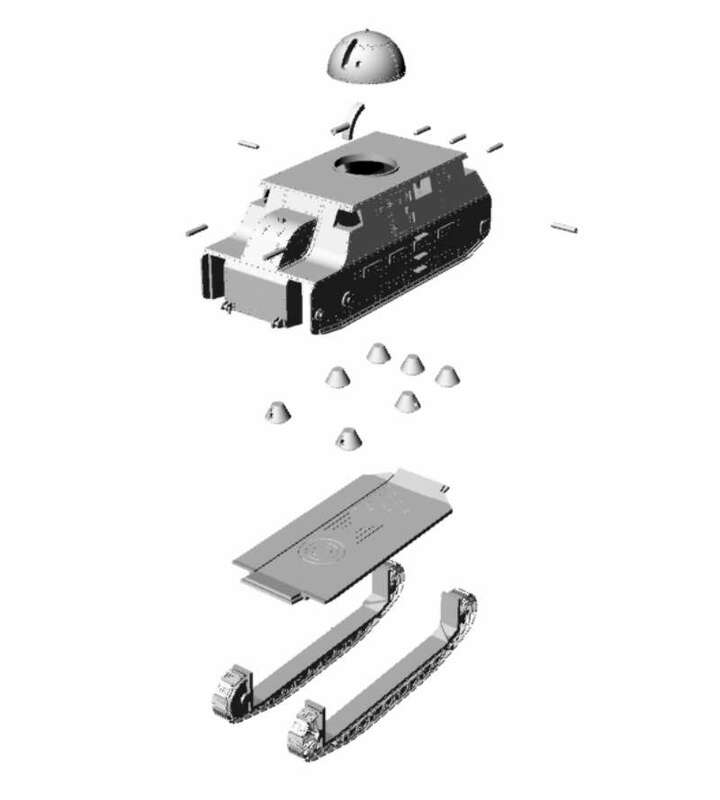 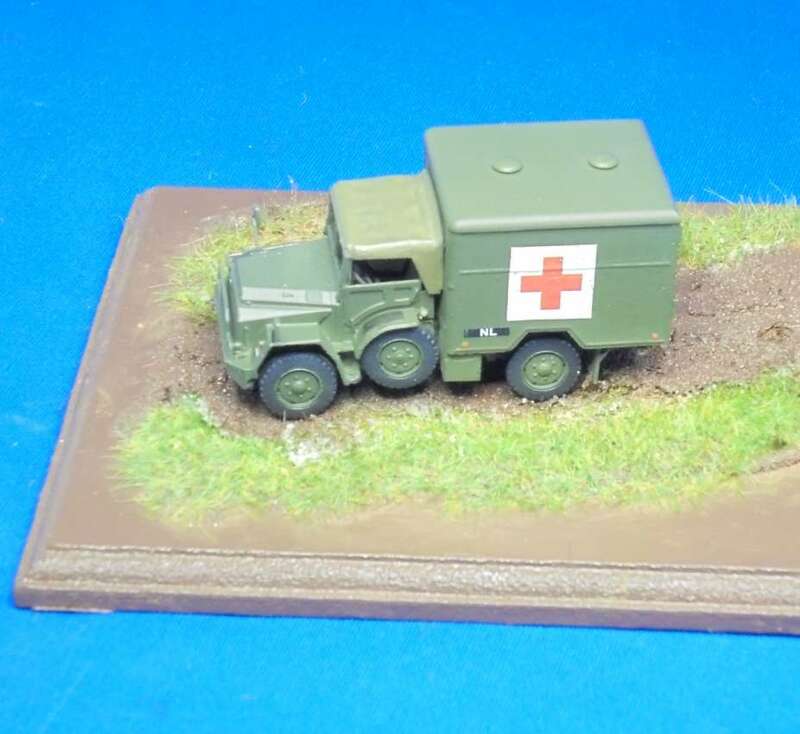 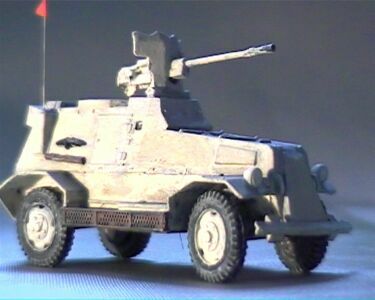 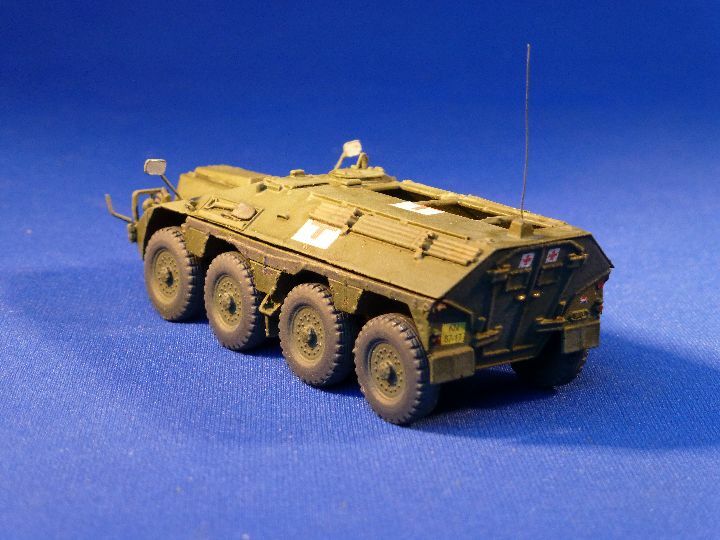 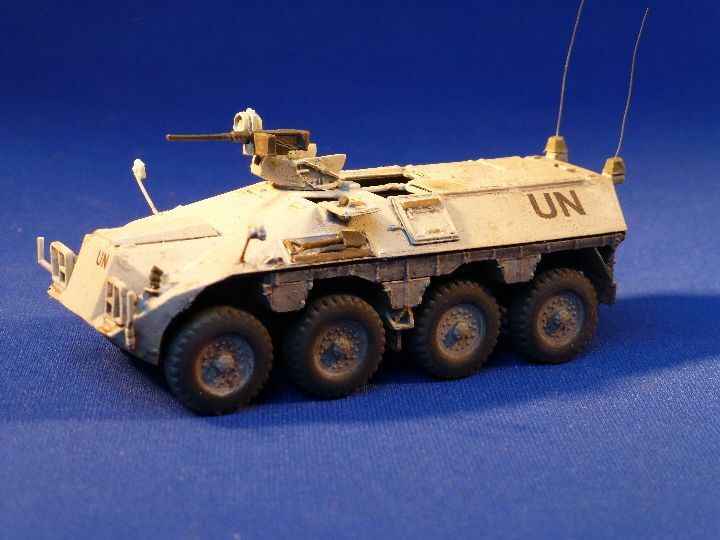 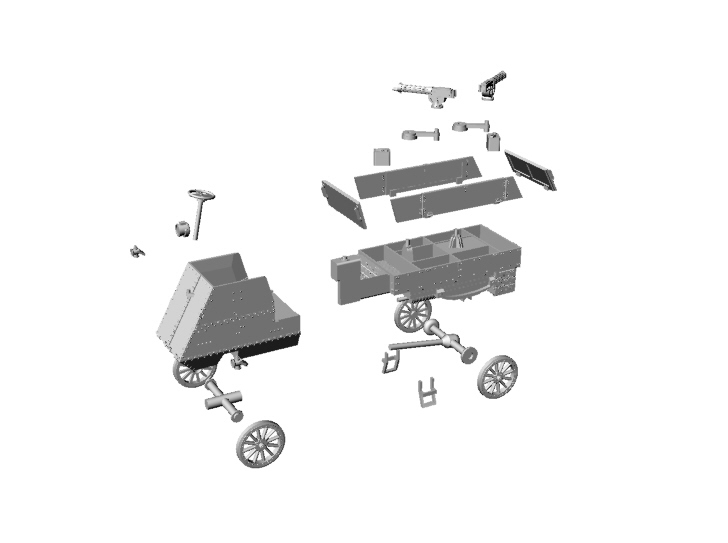 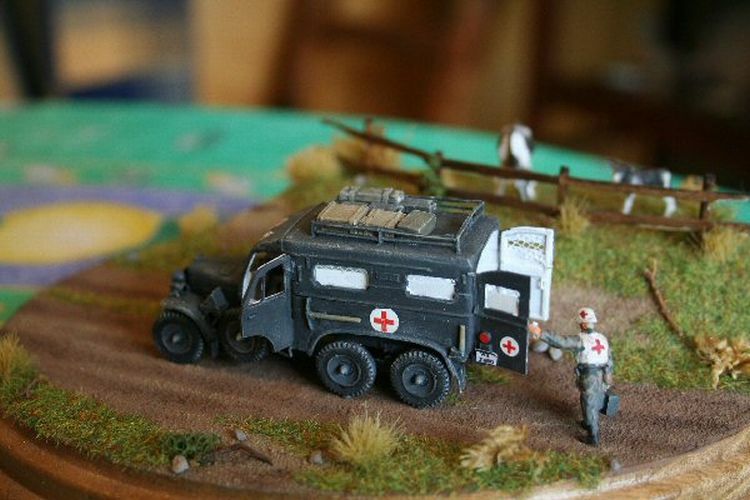 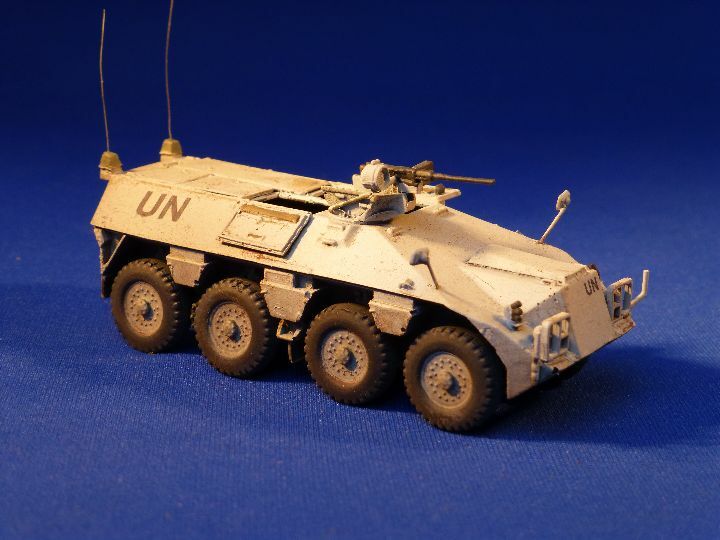 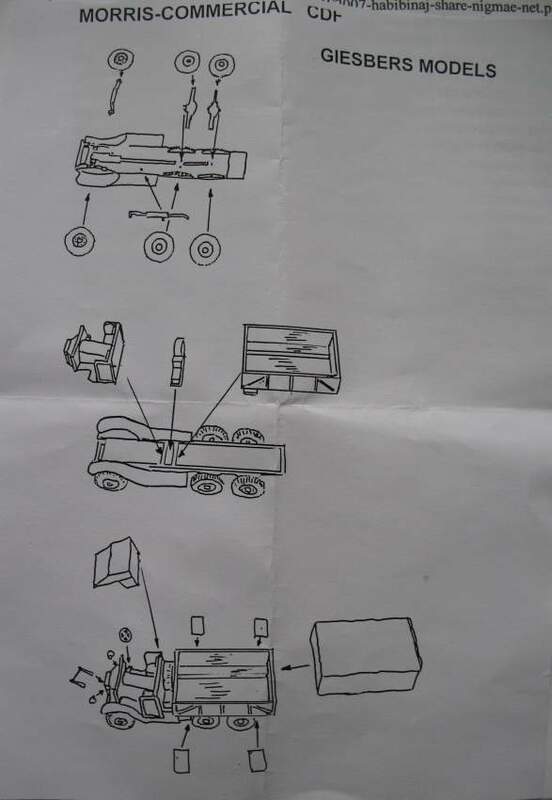 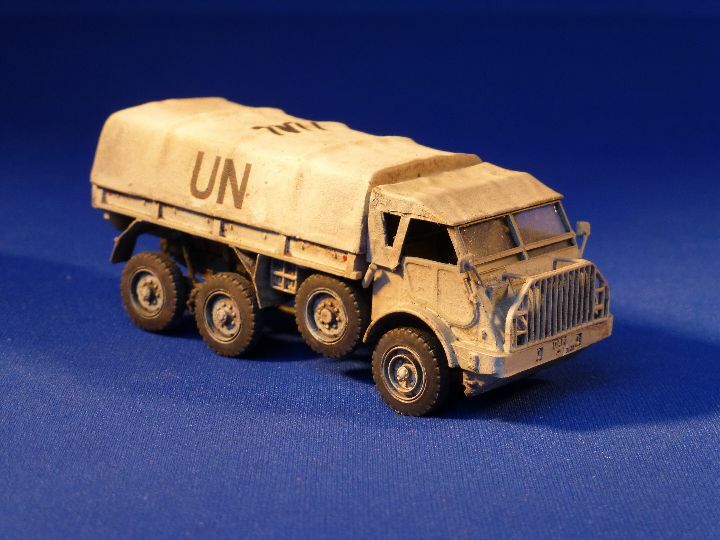 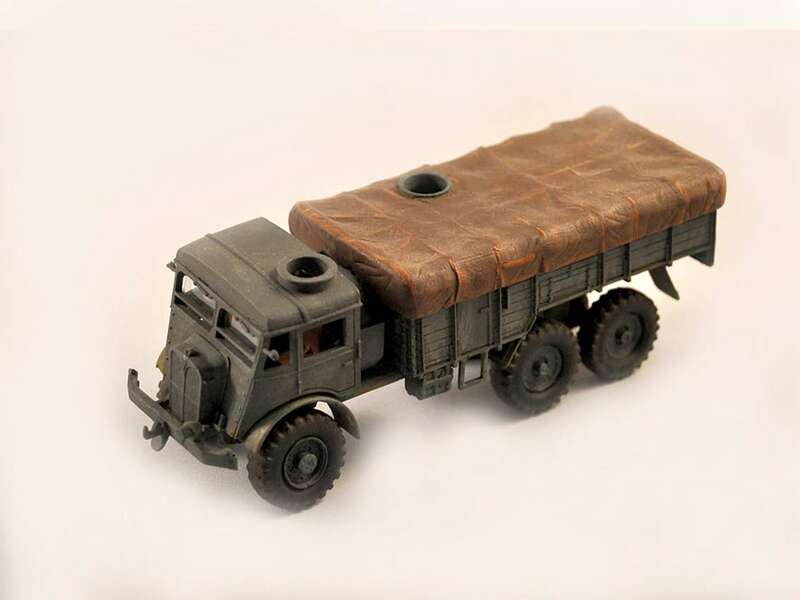 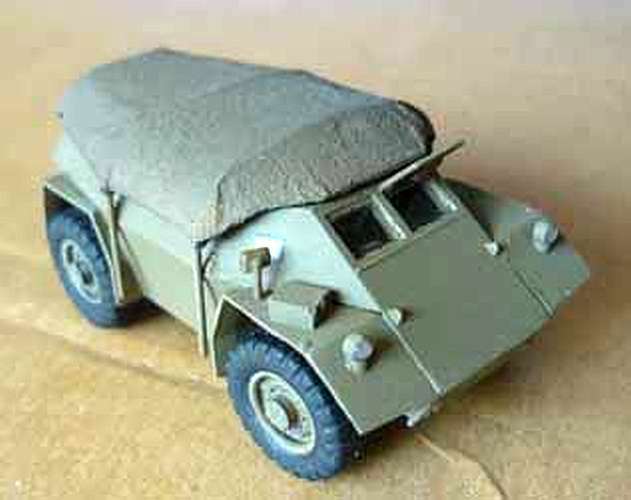 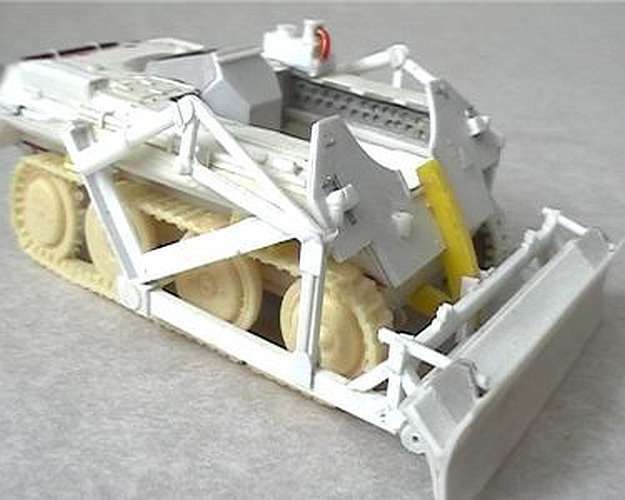 The vehicle can be made in travelling or in firing position with the stabilising jacks out. 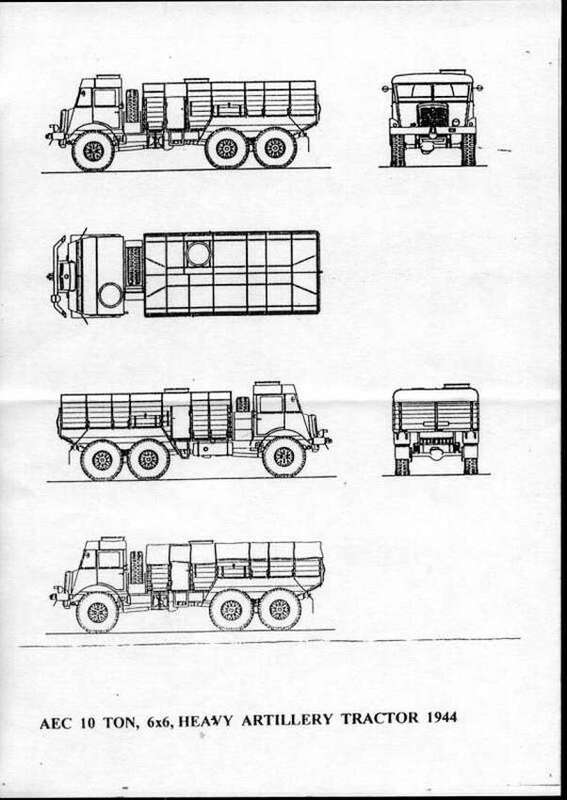 C.M.P. 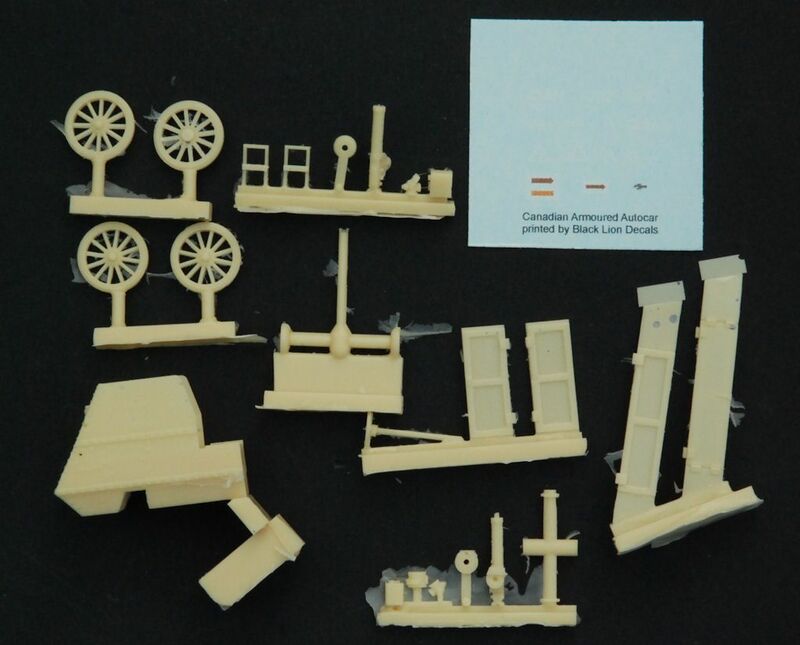 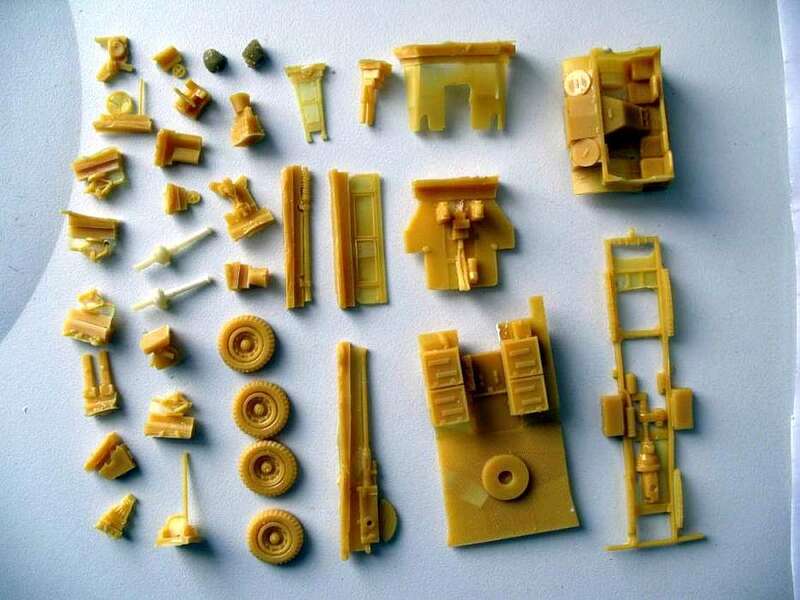 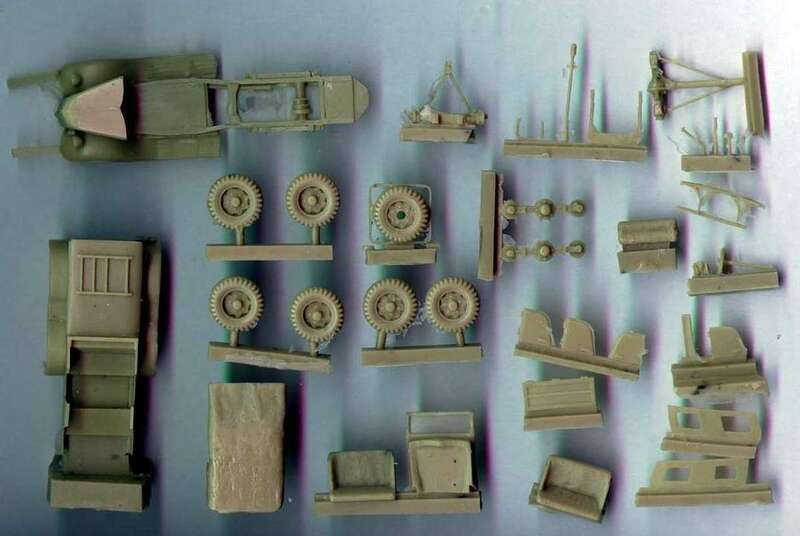 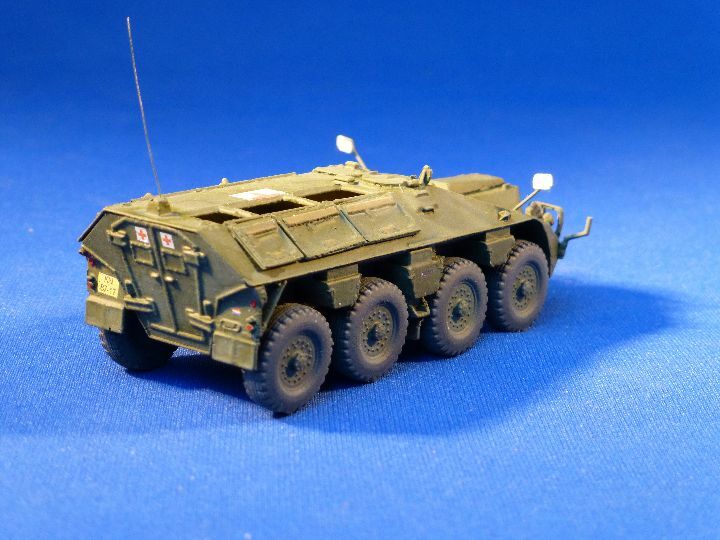 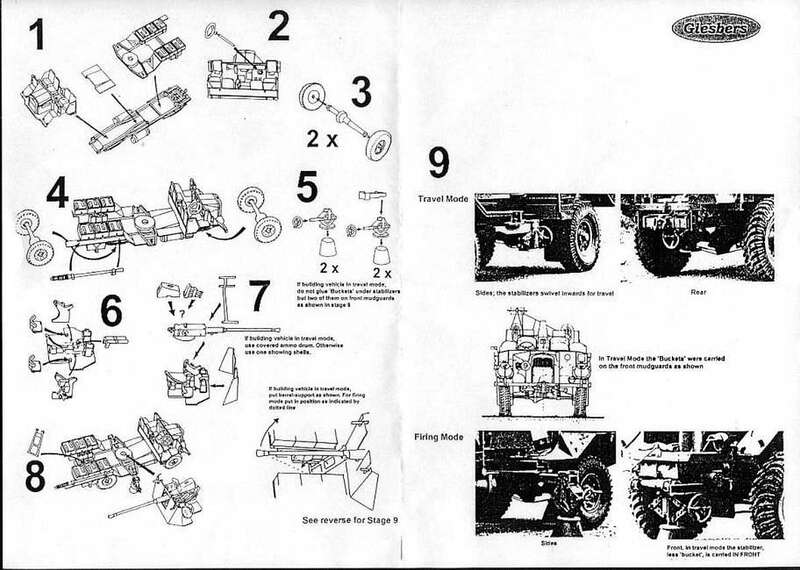 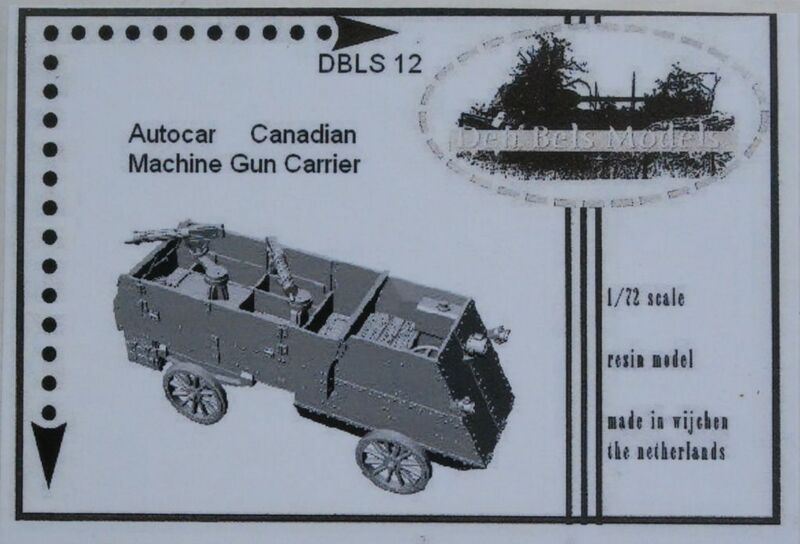 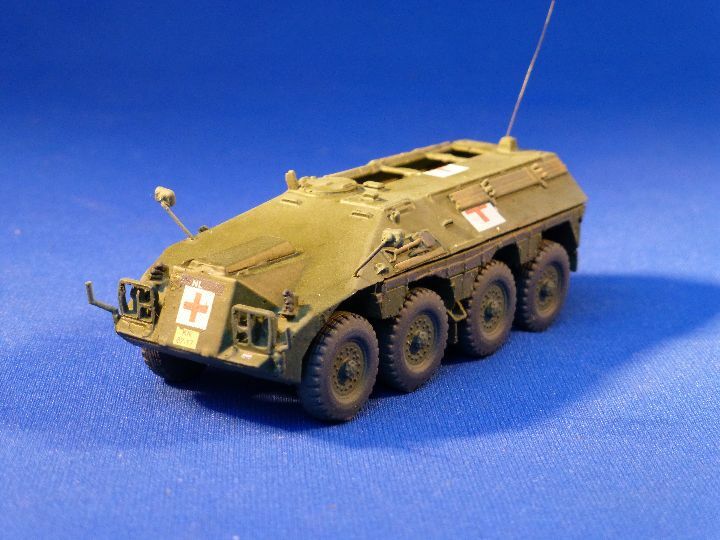 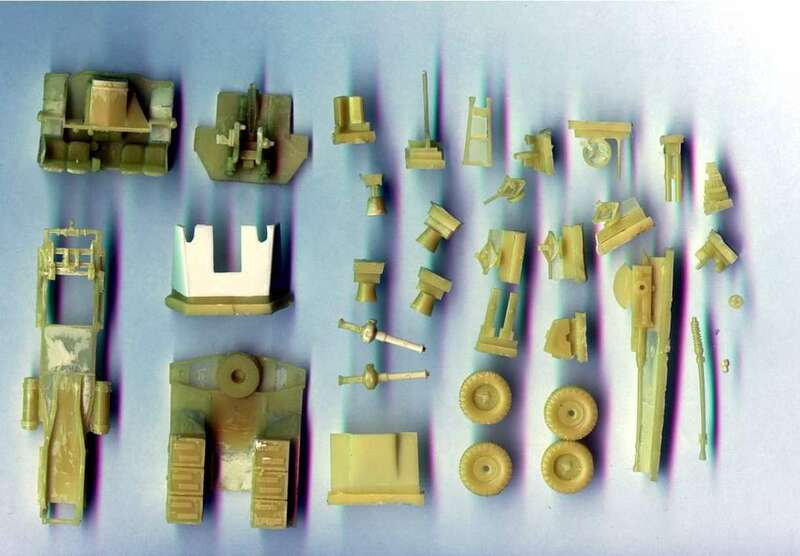 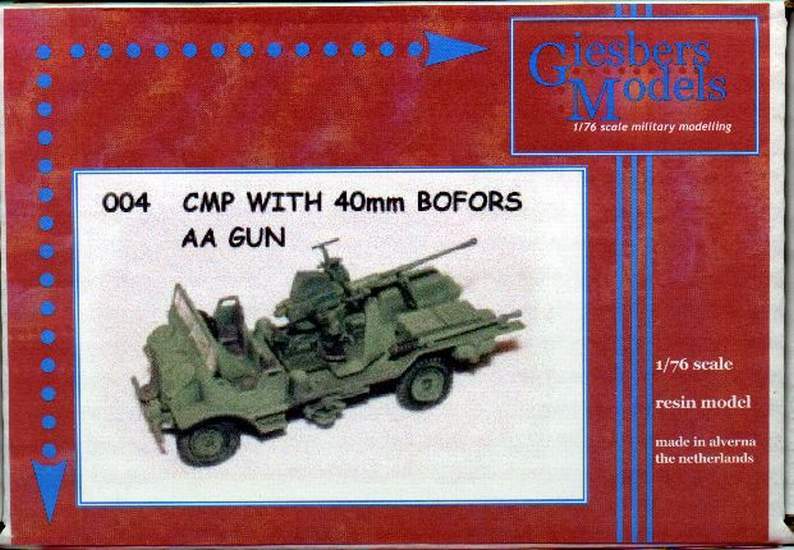 Ford Canada 40mm Bofors S.P. 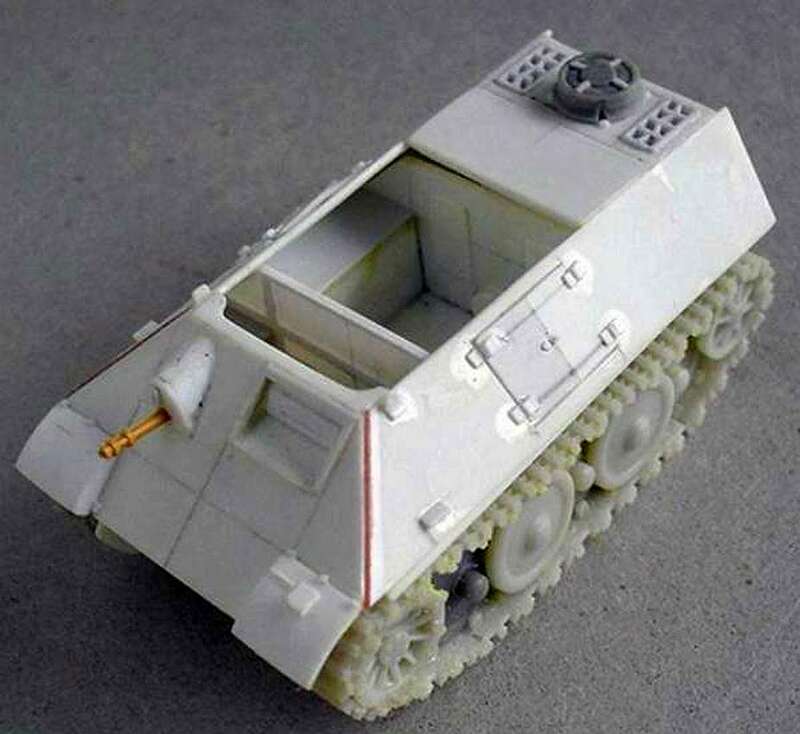 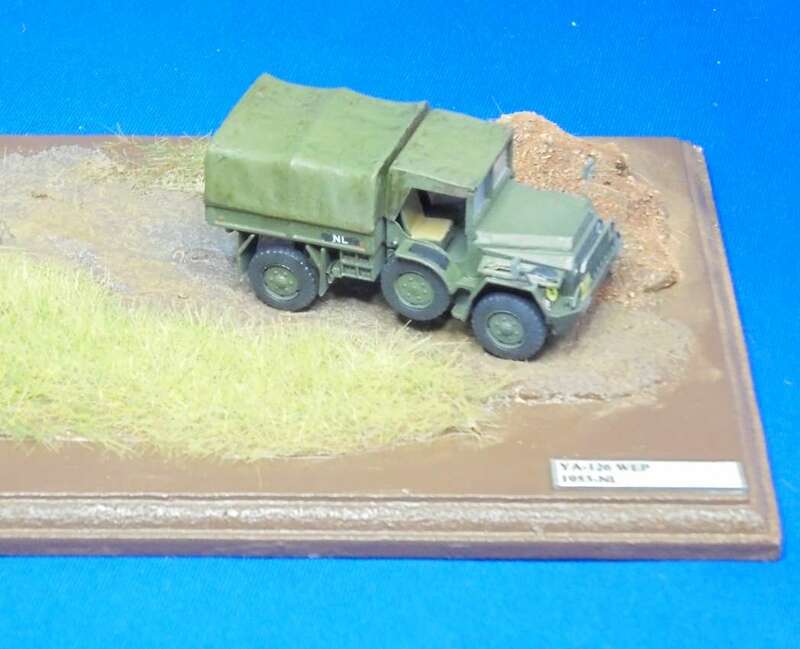 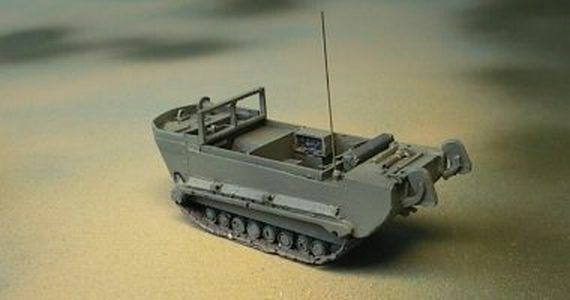 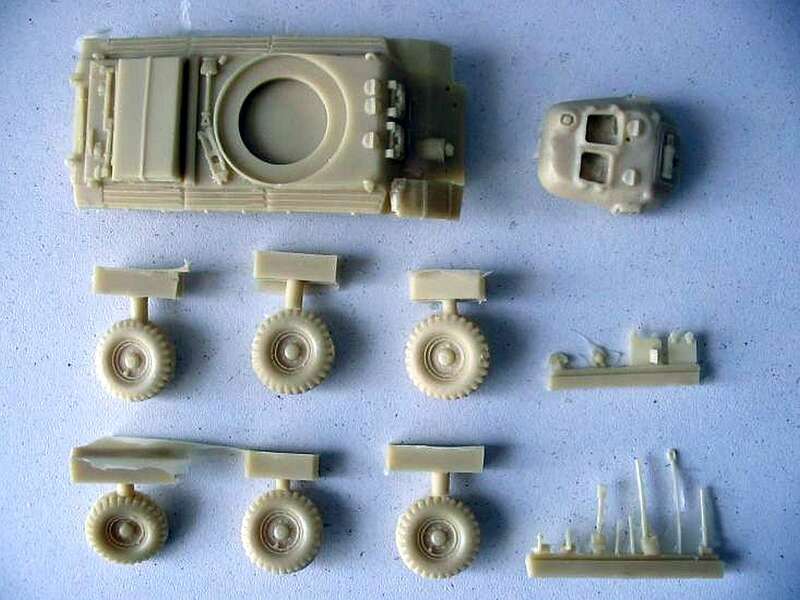 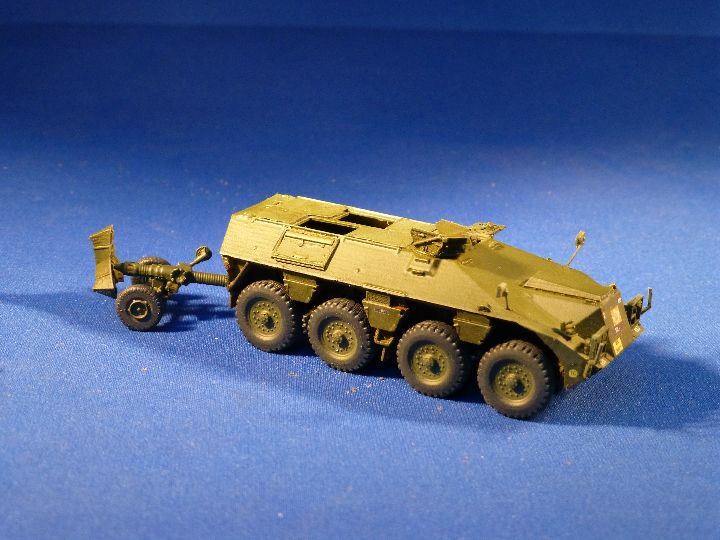 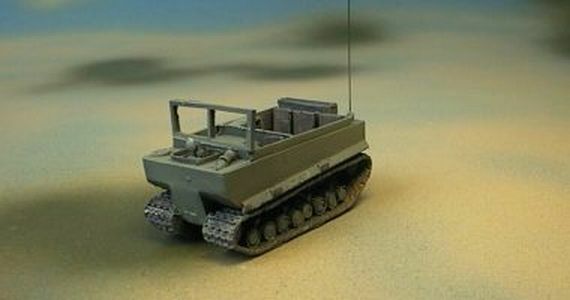 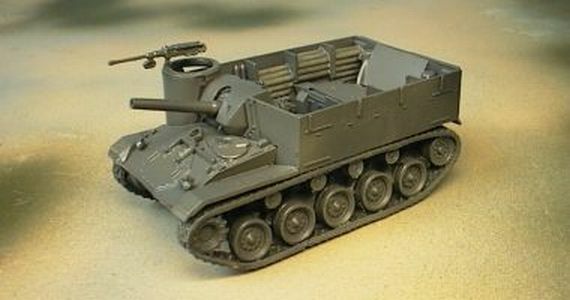 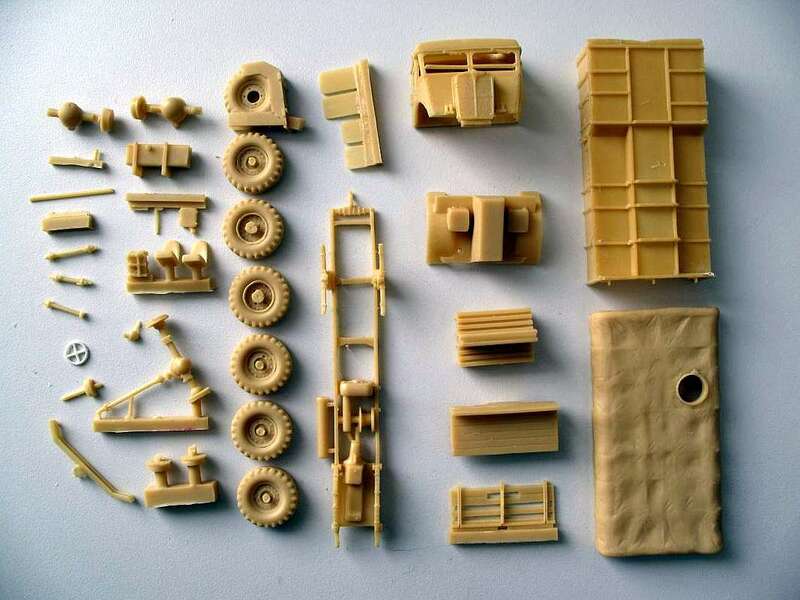 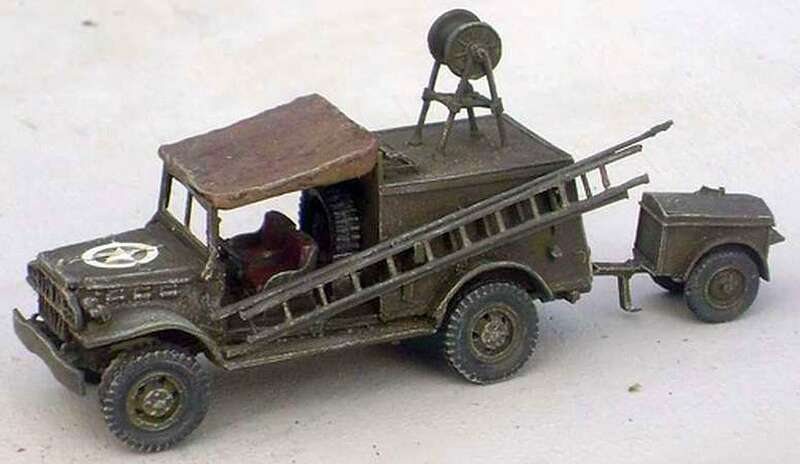 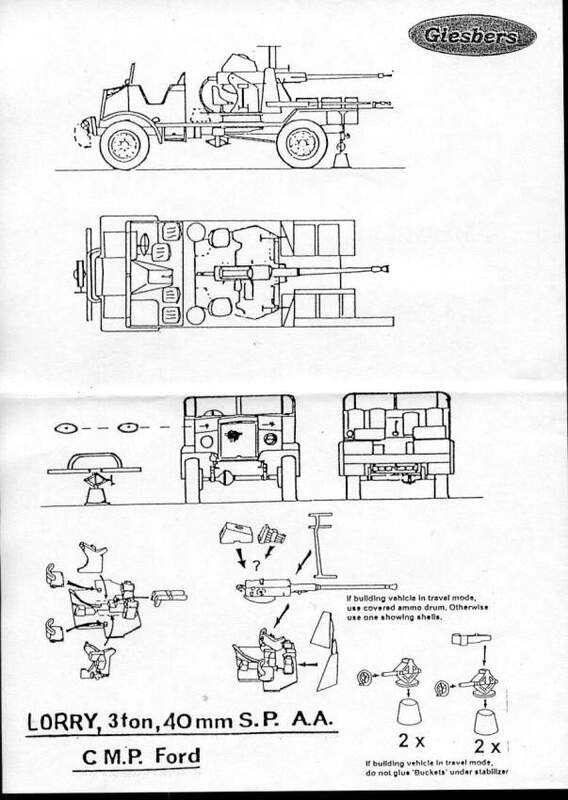 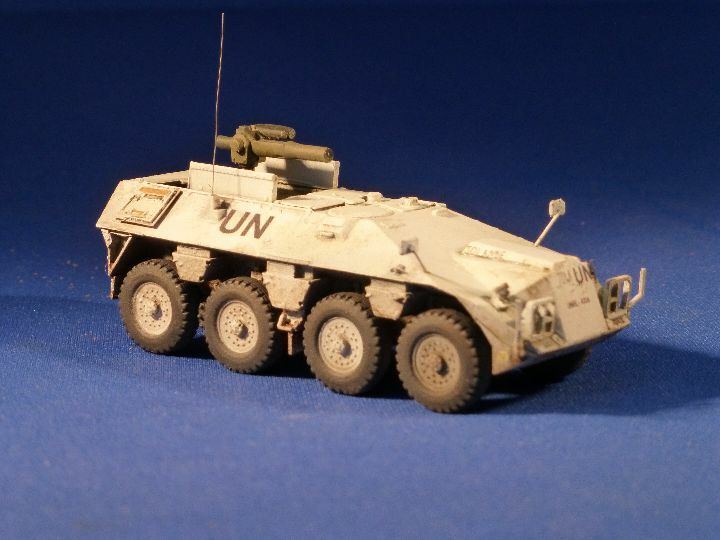 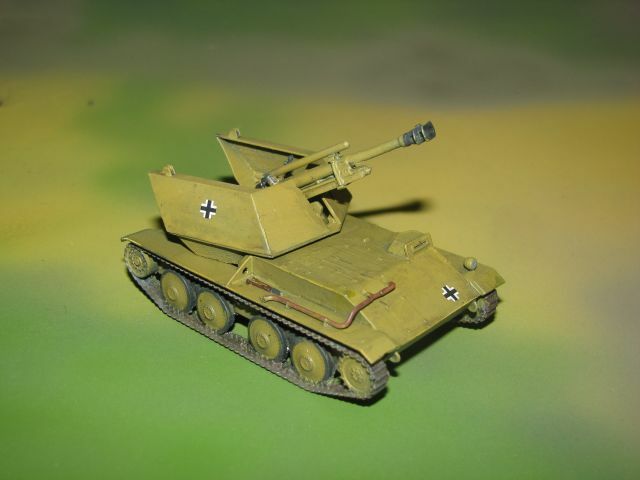 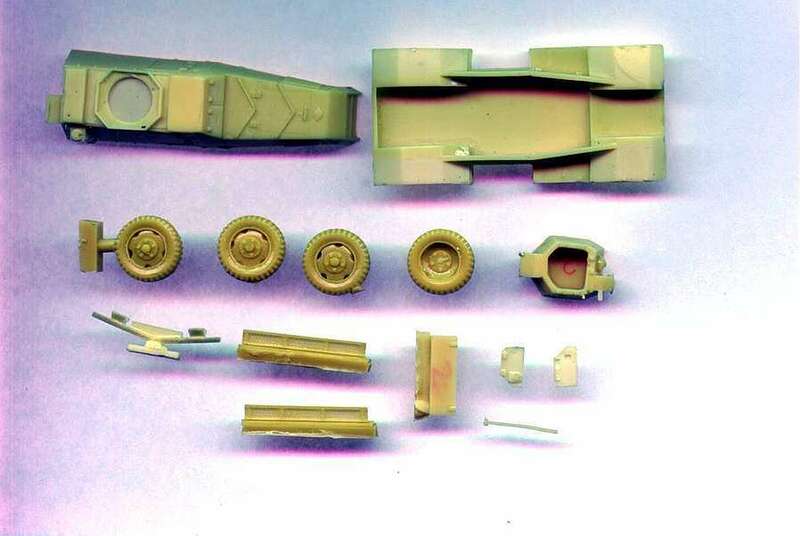 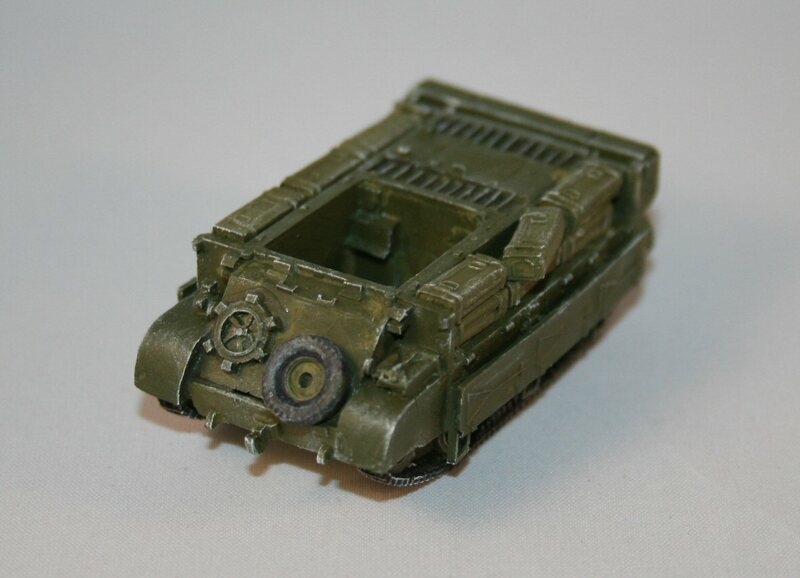 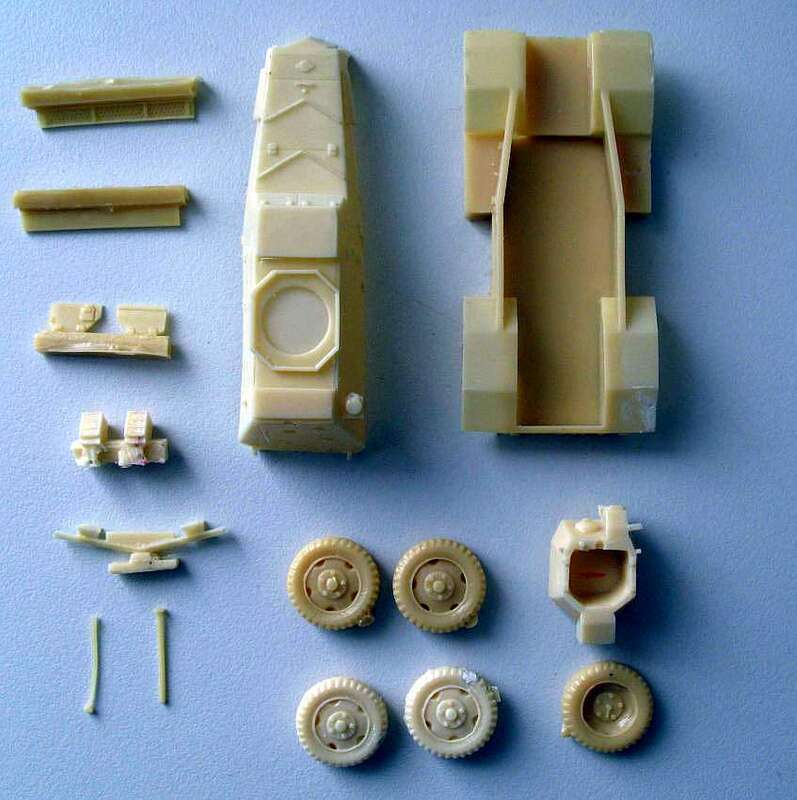 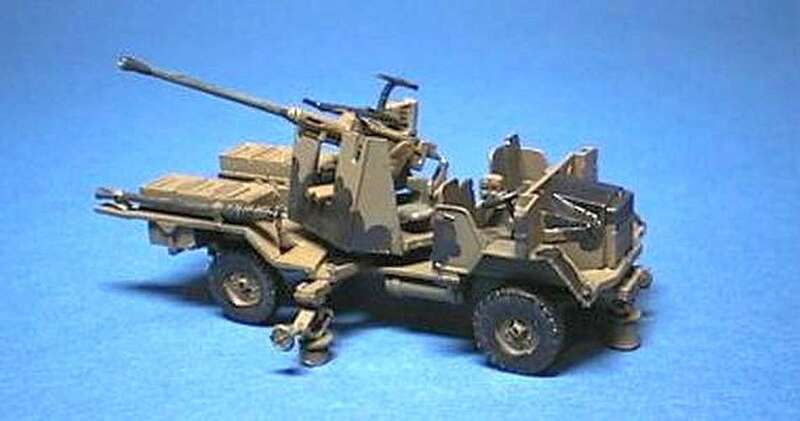 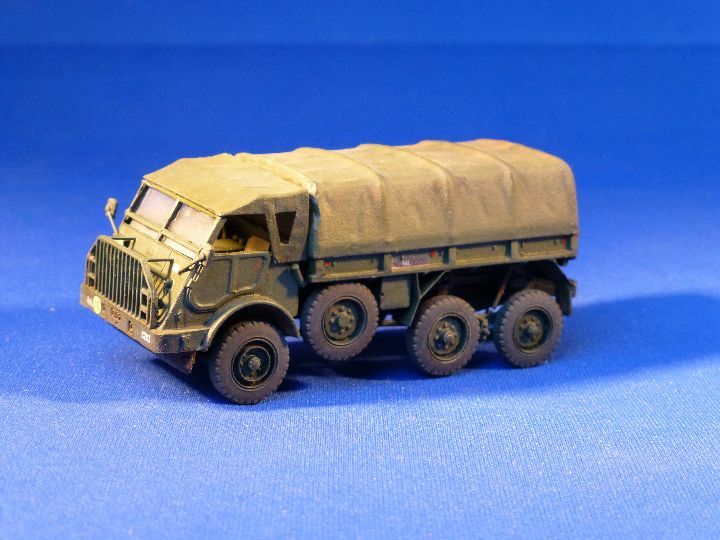 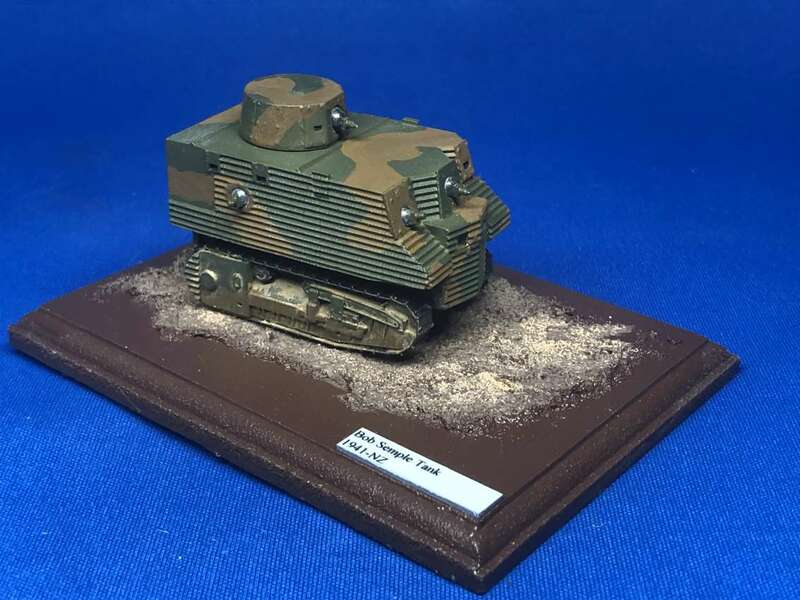 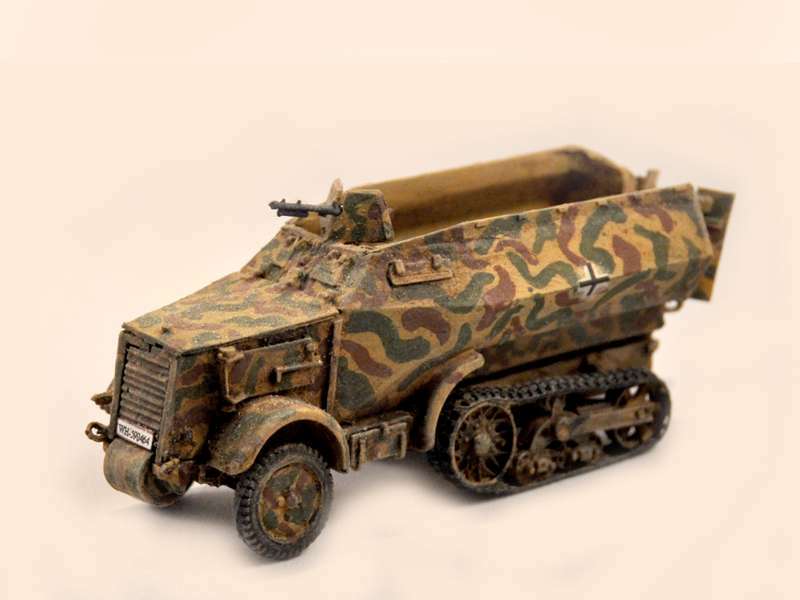 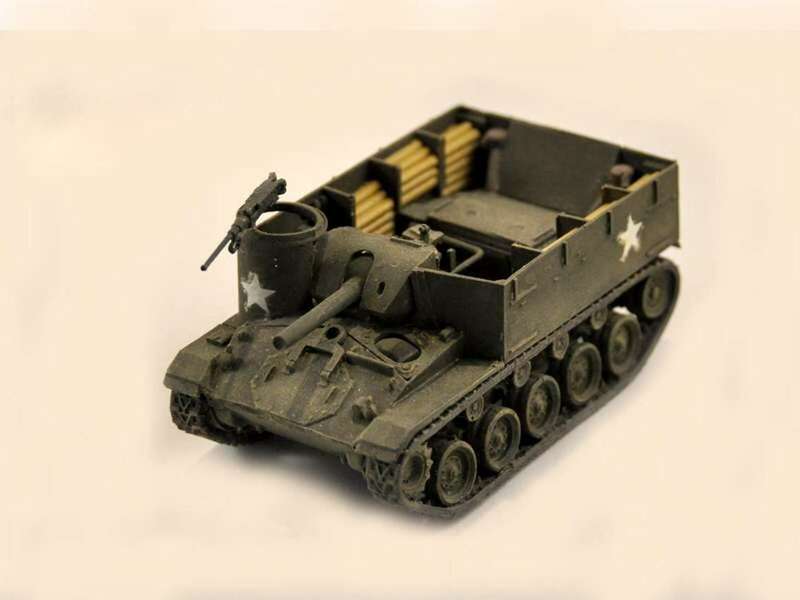 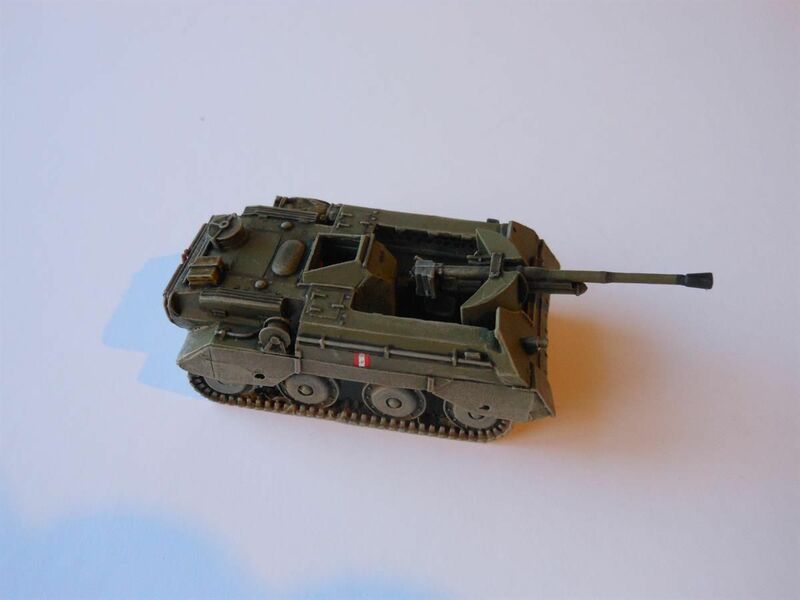 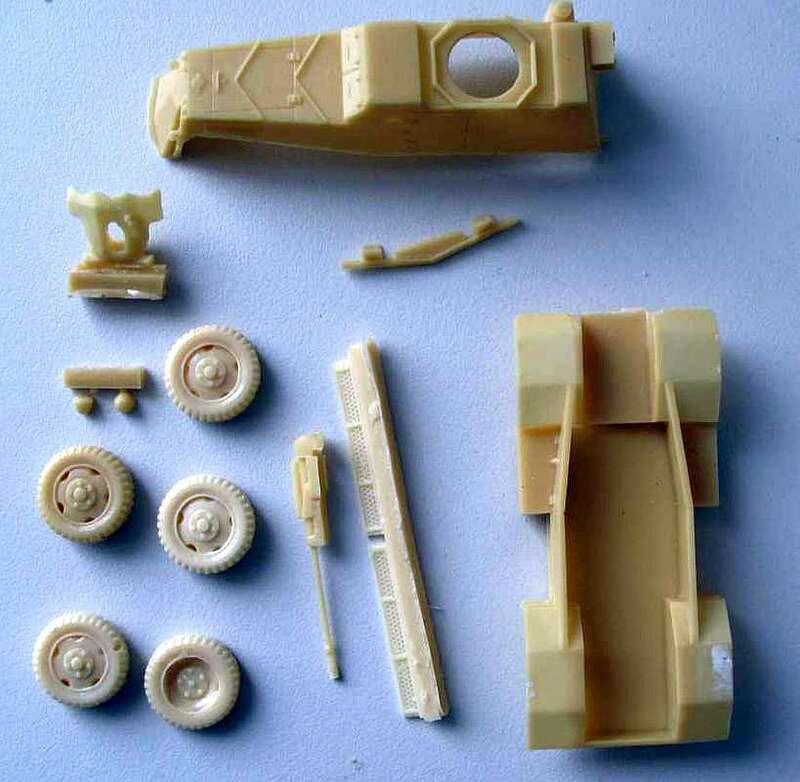 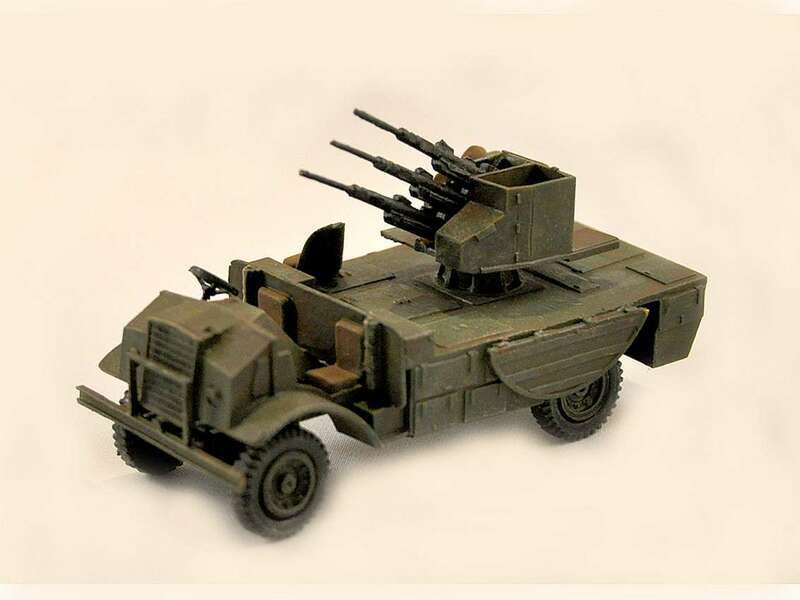 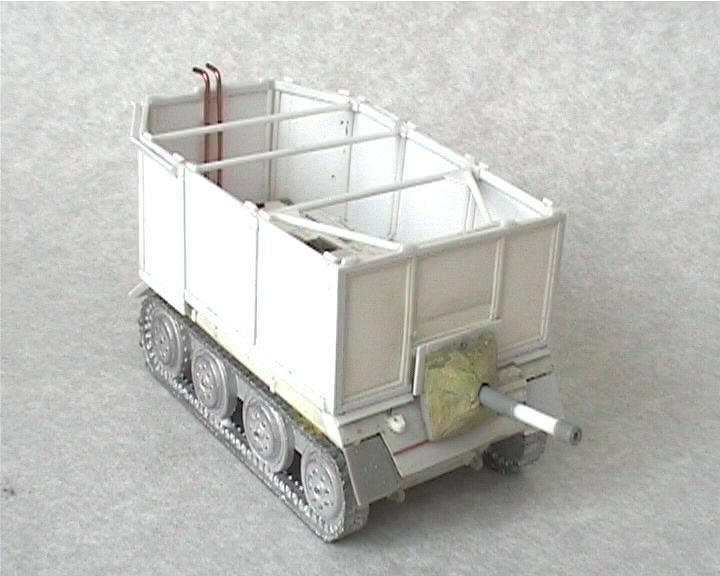 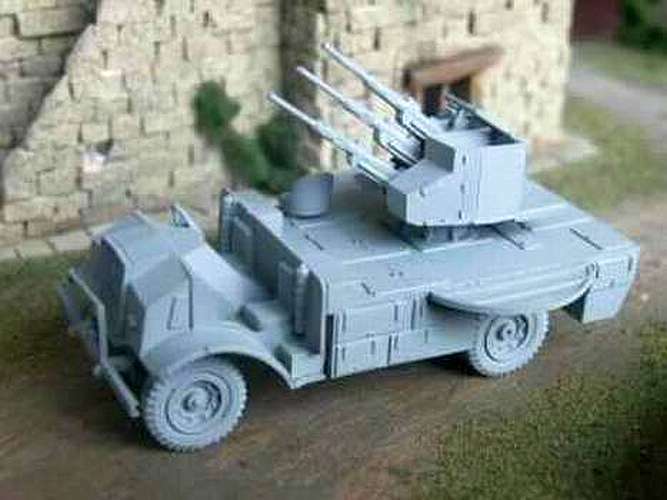 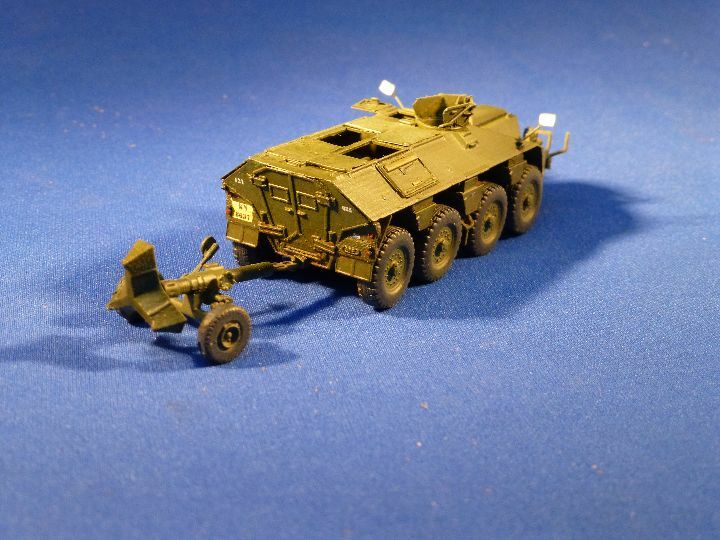 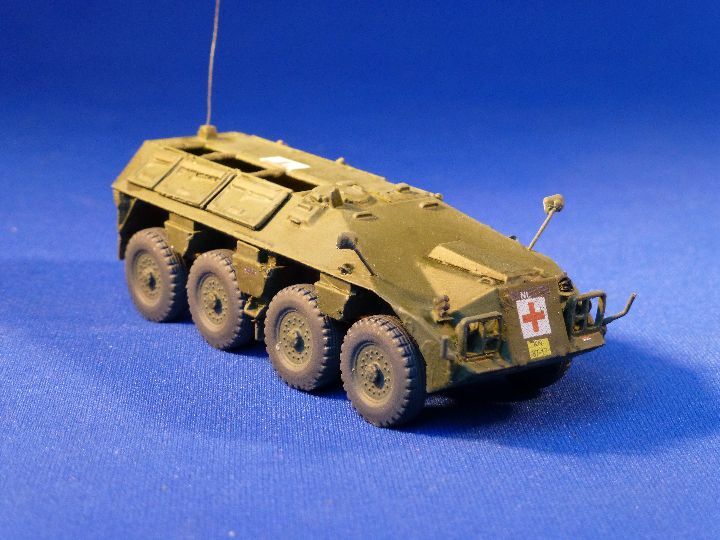 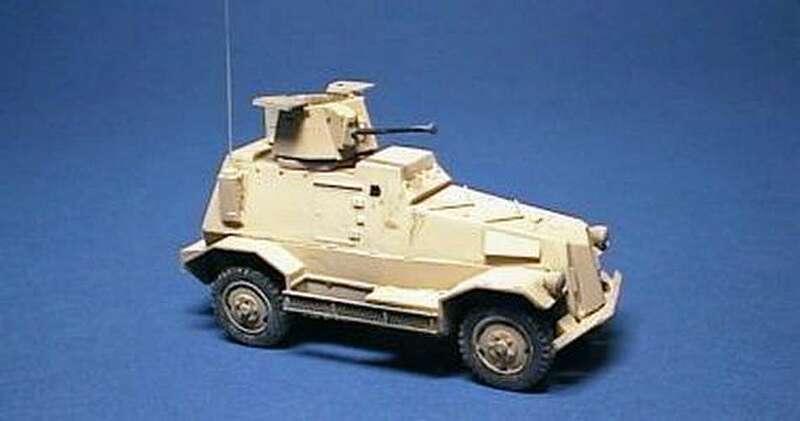 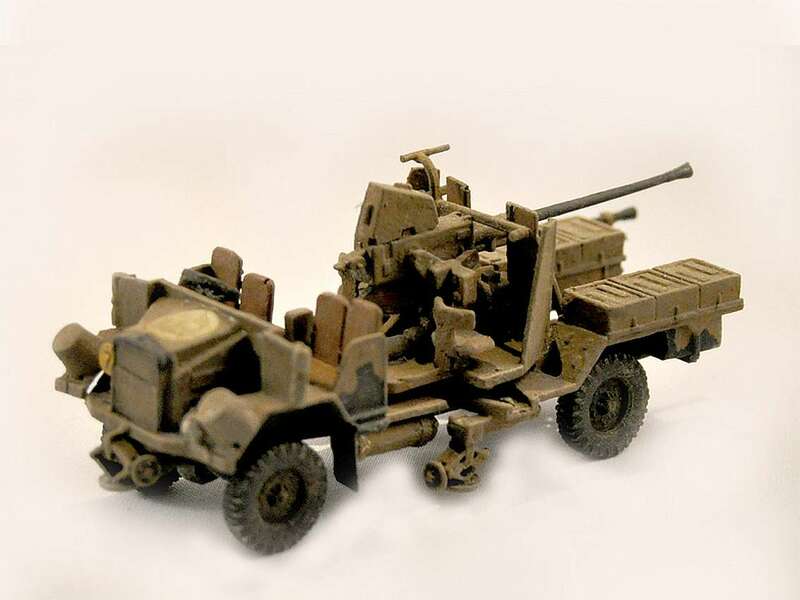 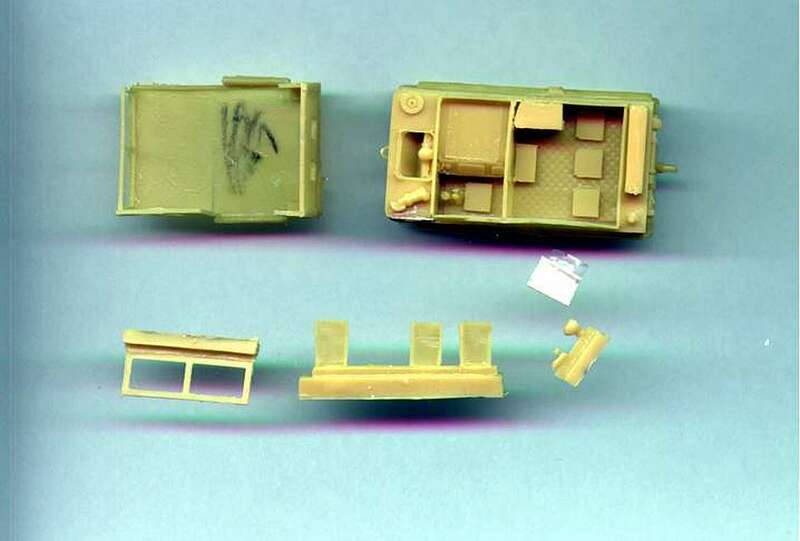 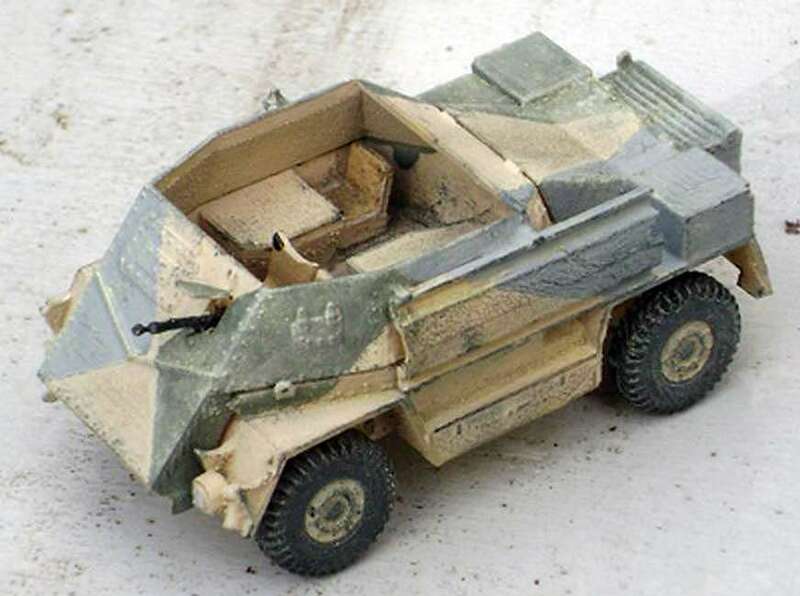 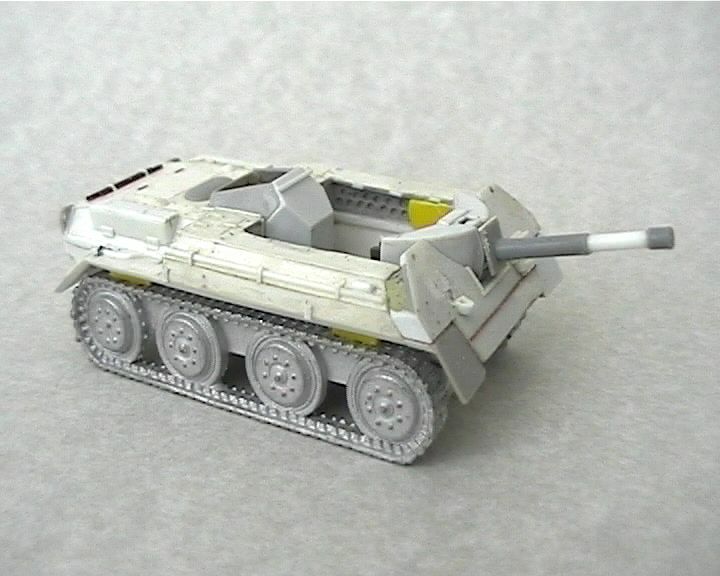 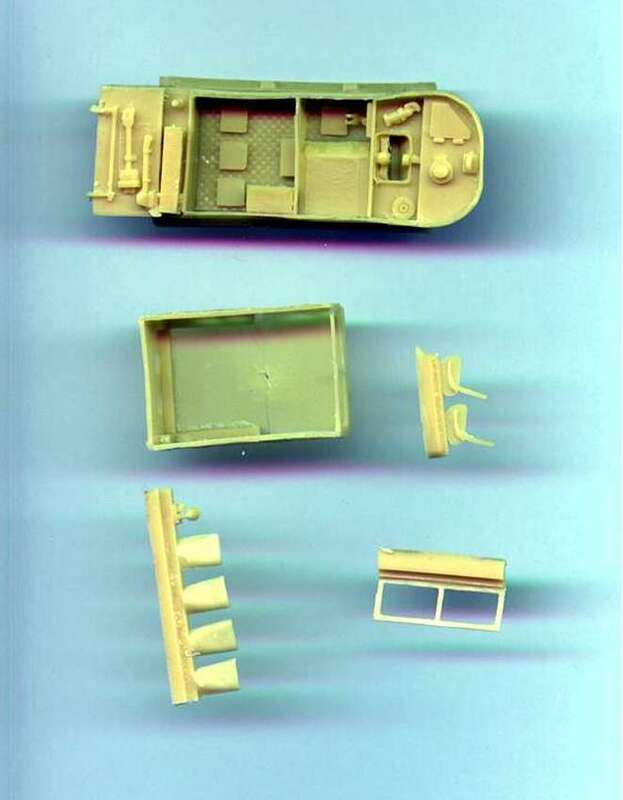 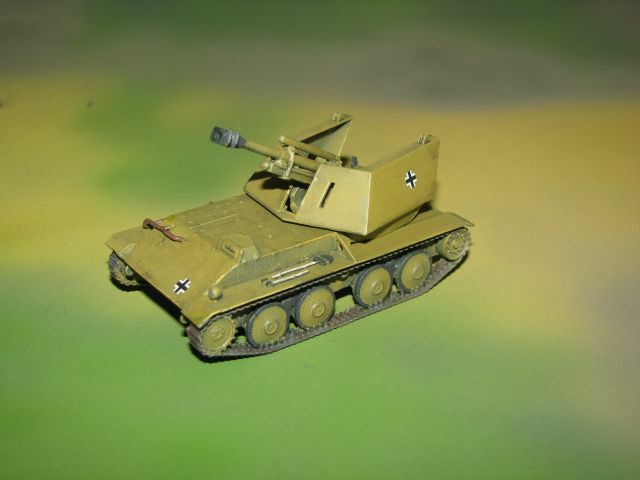 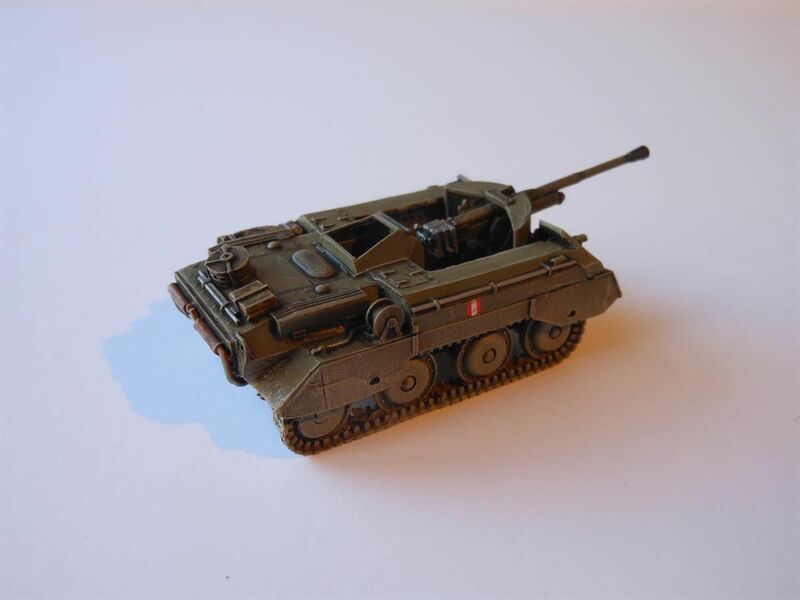 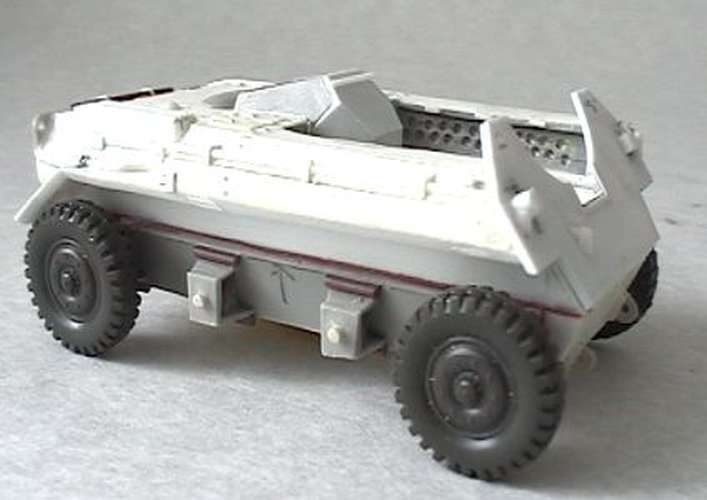 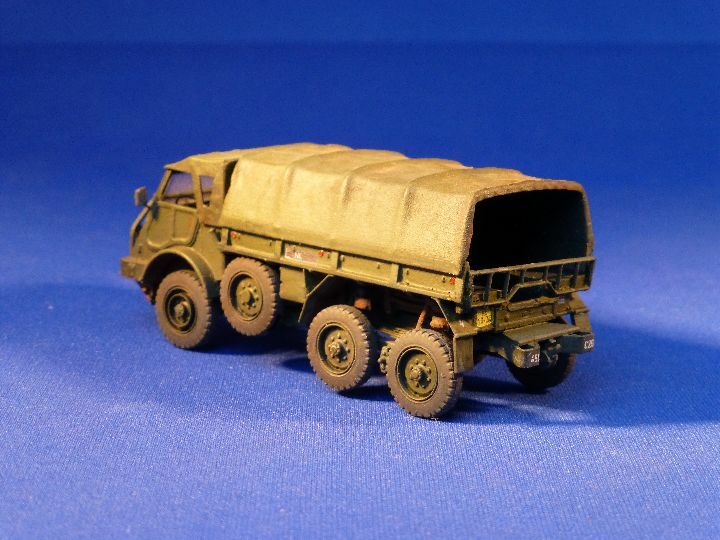 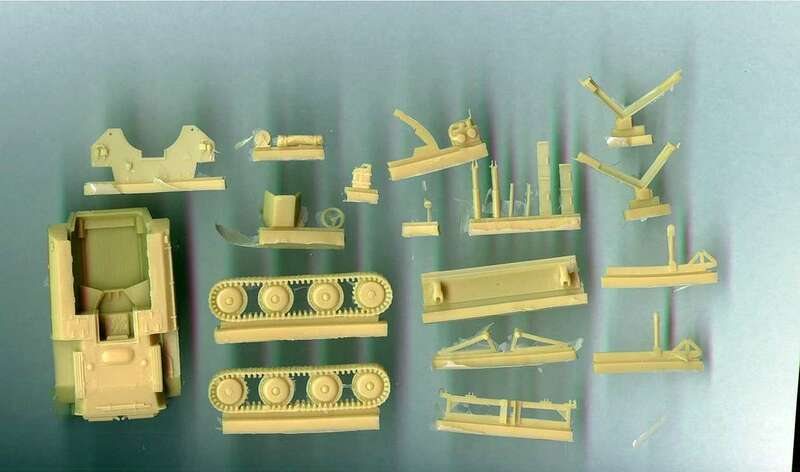 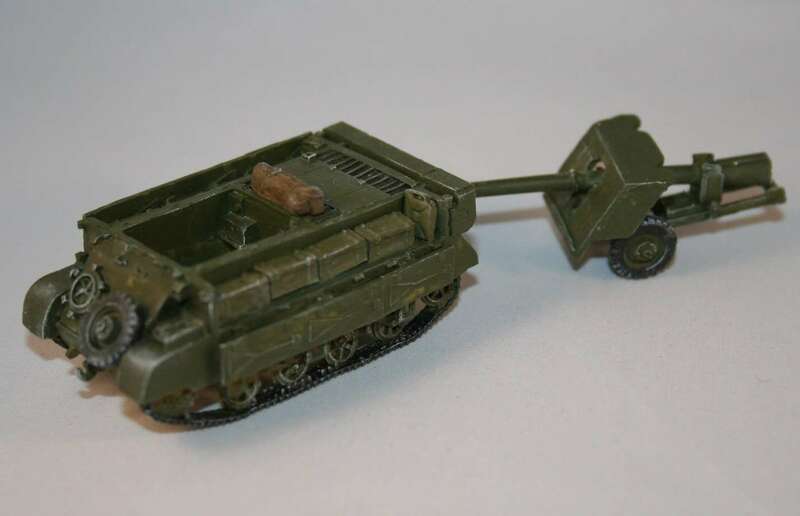 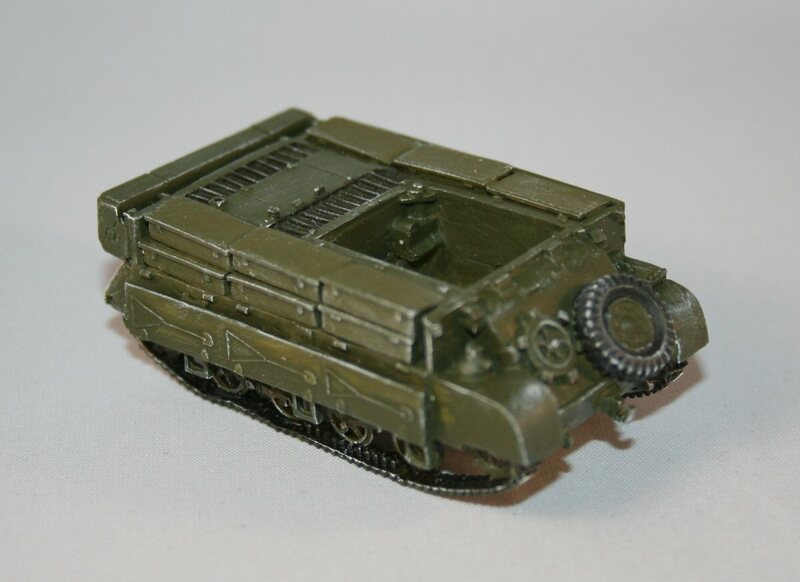 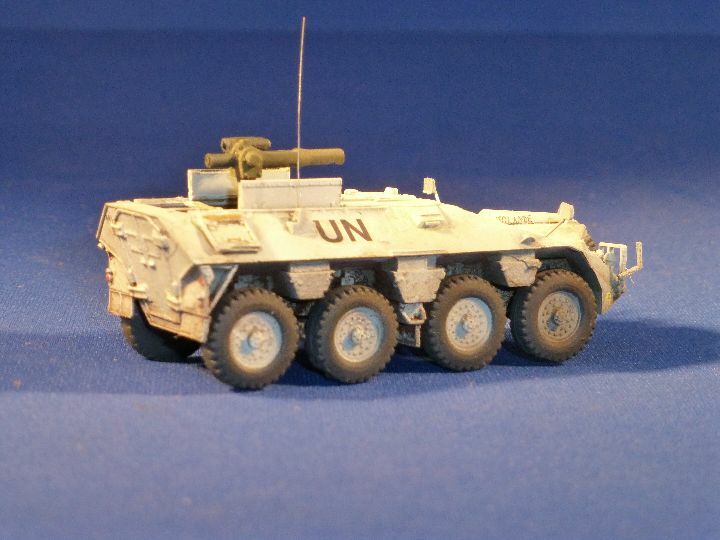 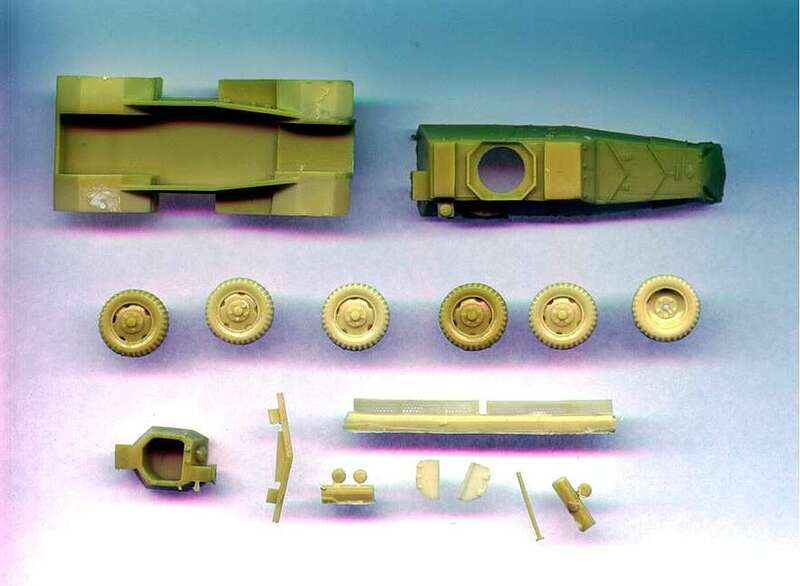 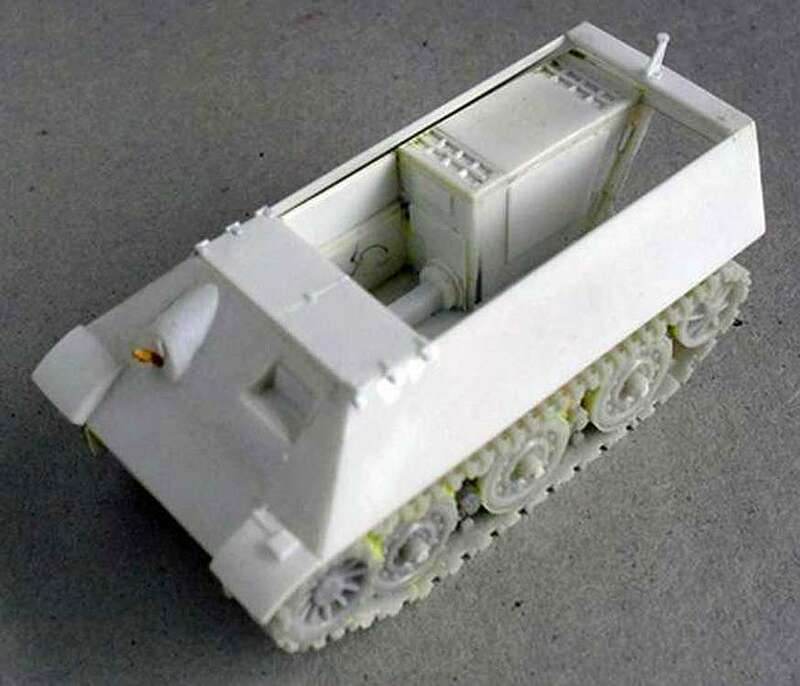 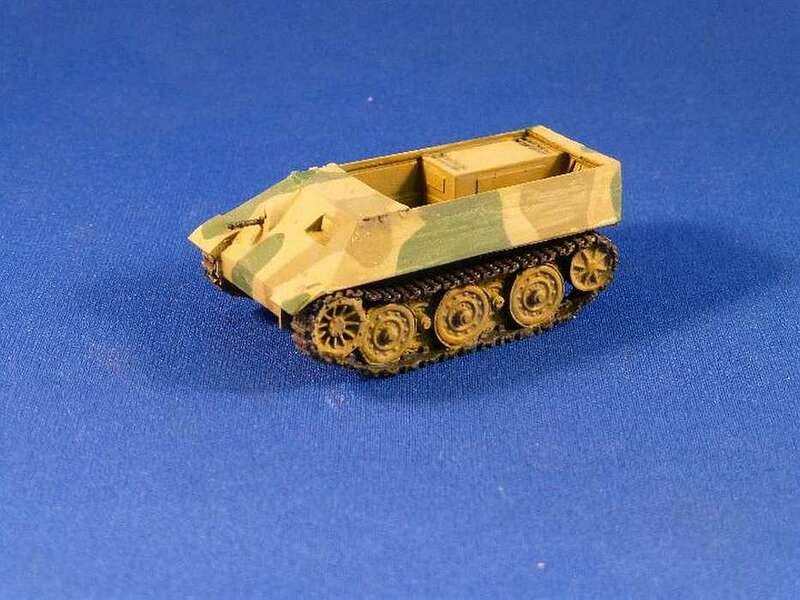 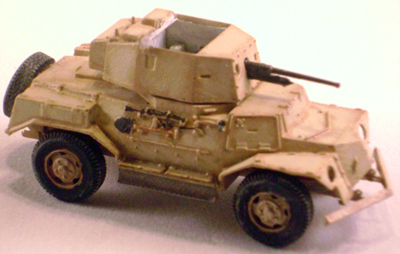 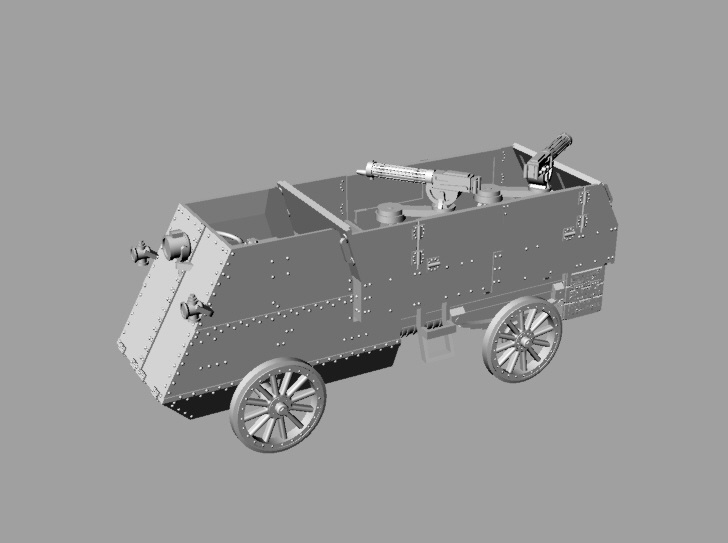 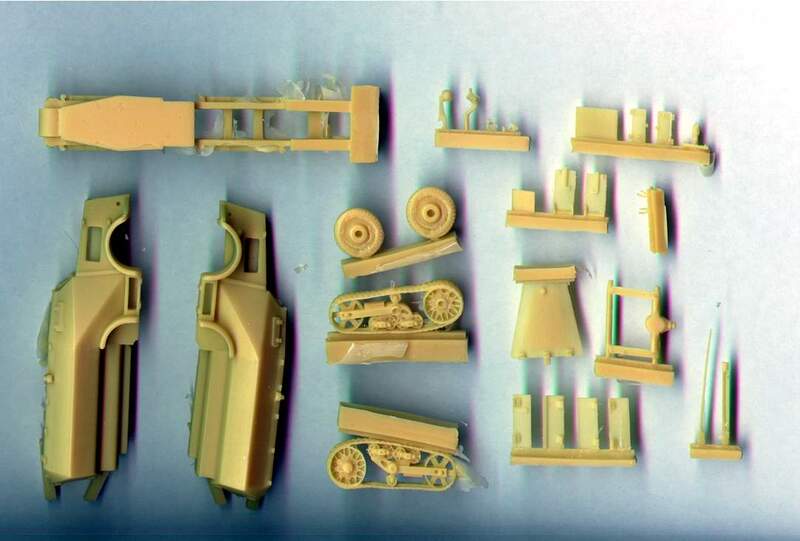 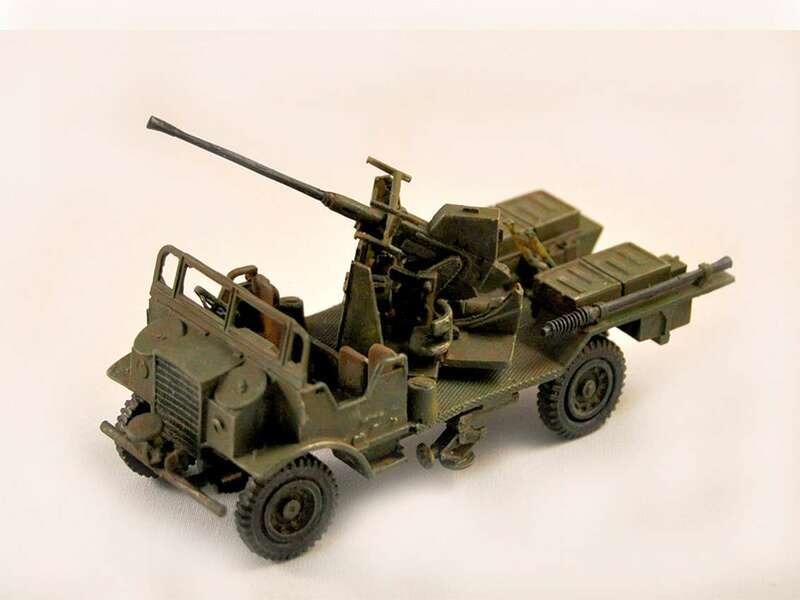 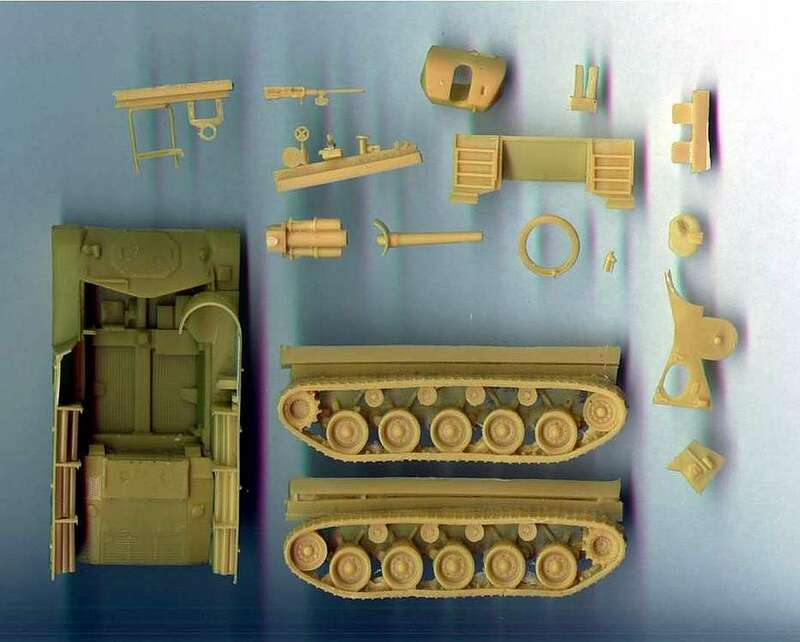 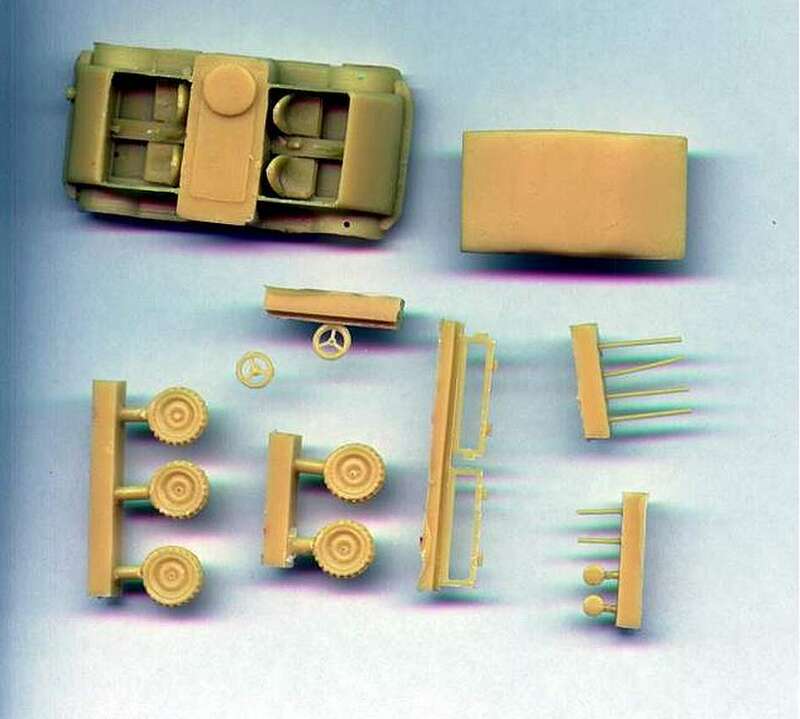 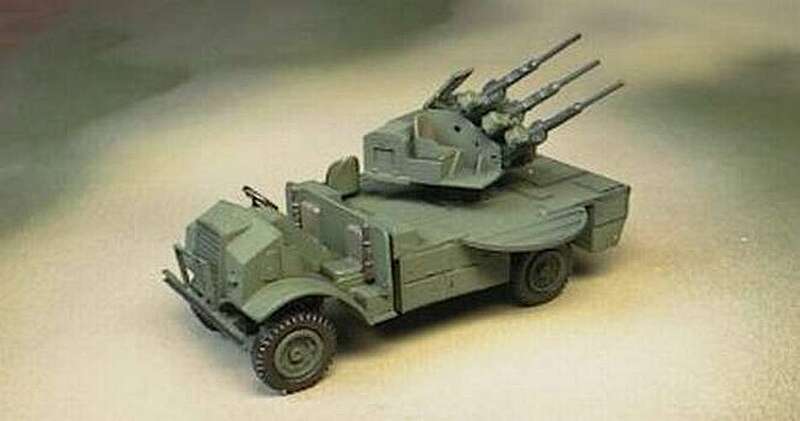 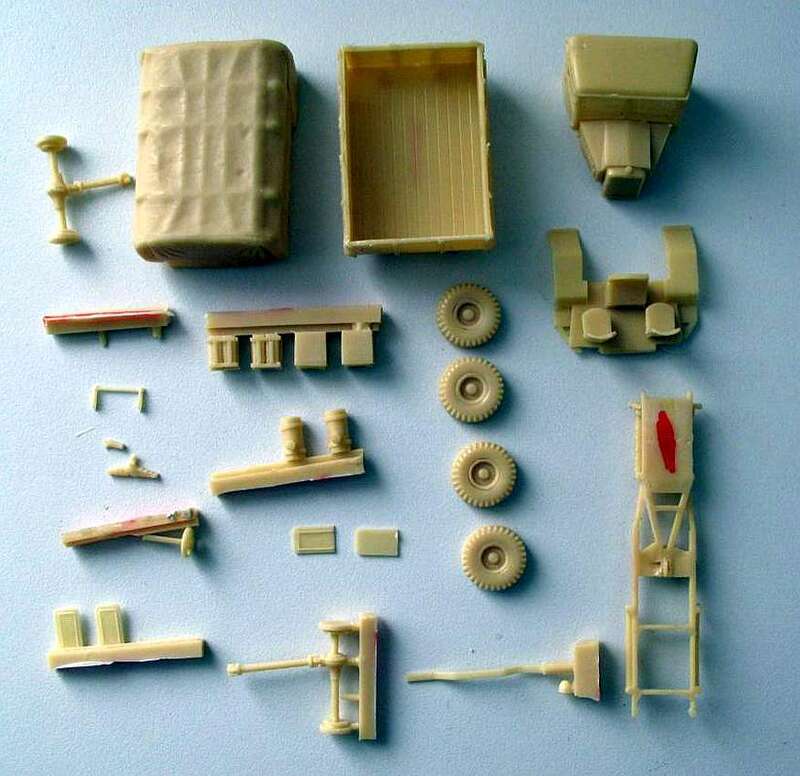 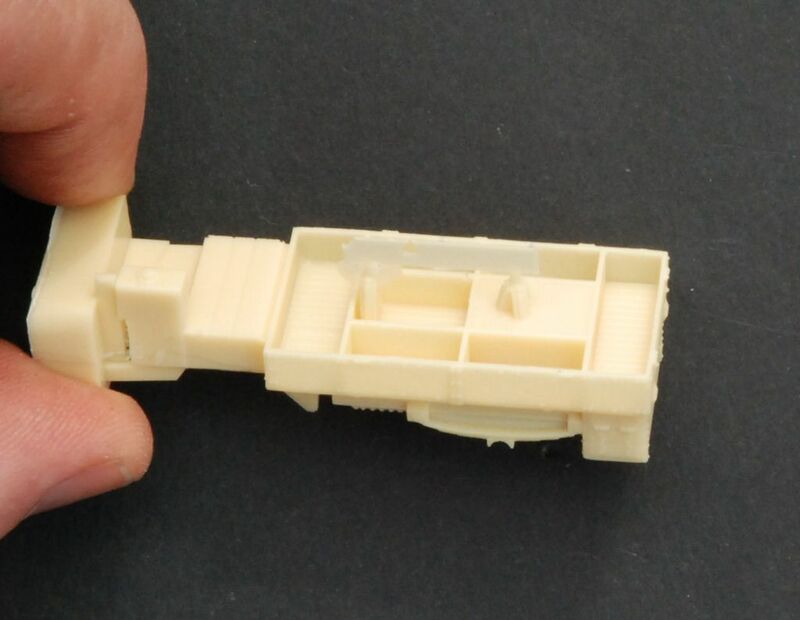 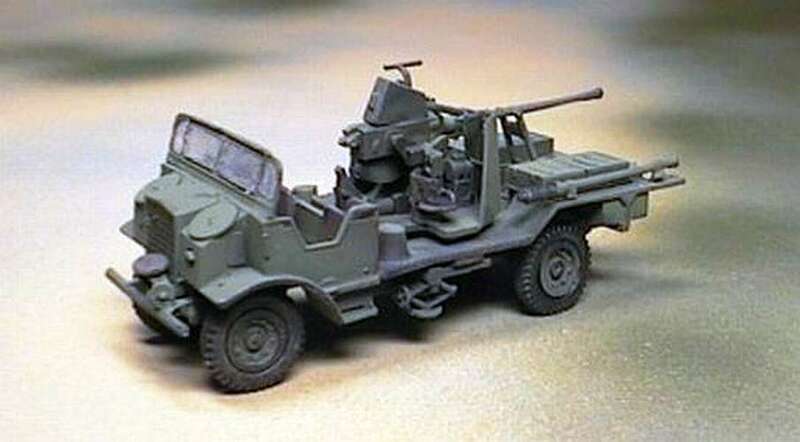 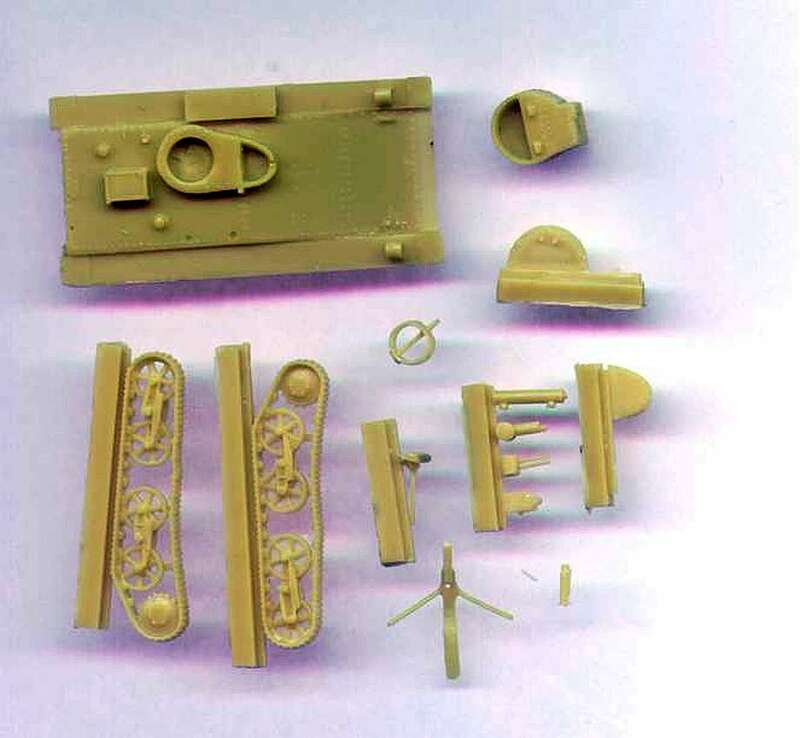 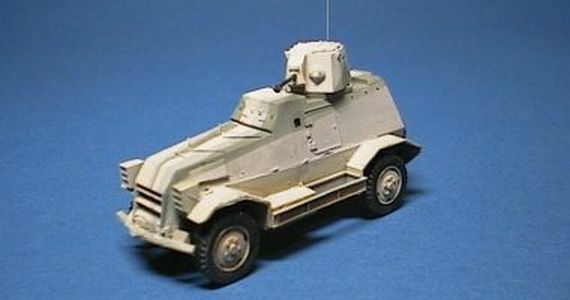 This model shows the 40mm Bofors gun fitted on the Ford F60B chassis. 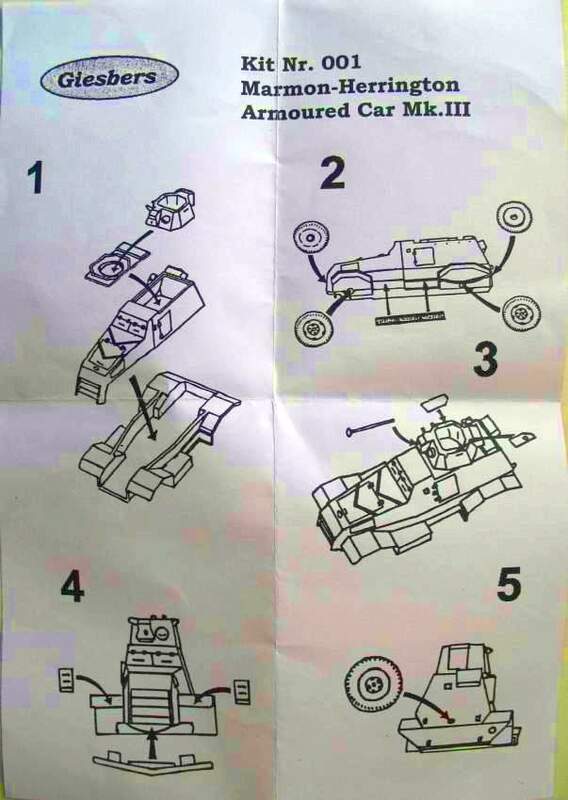 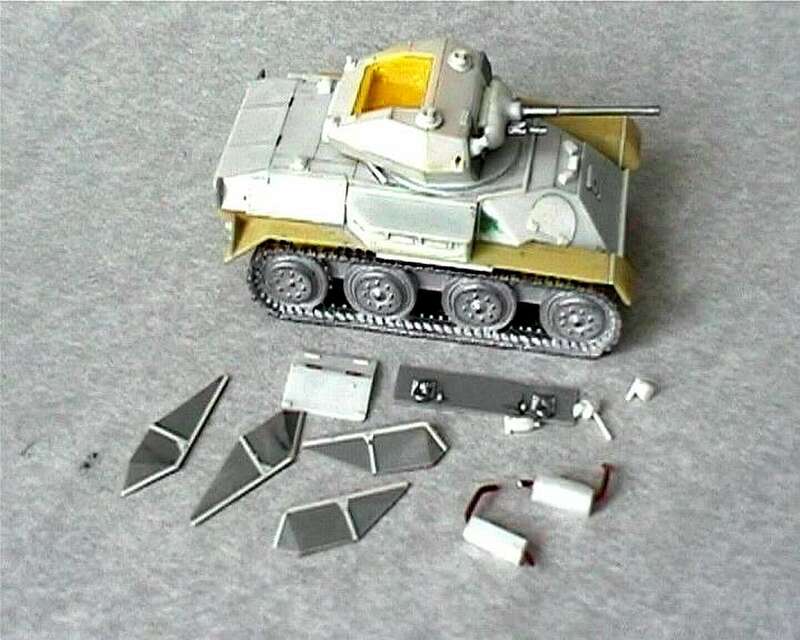 The kit follows the same lines as the model above. 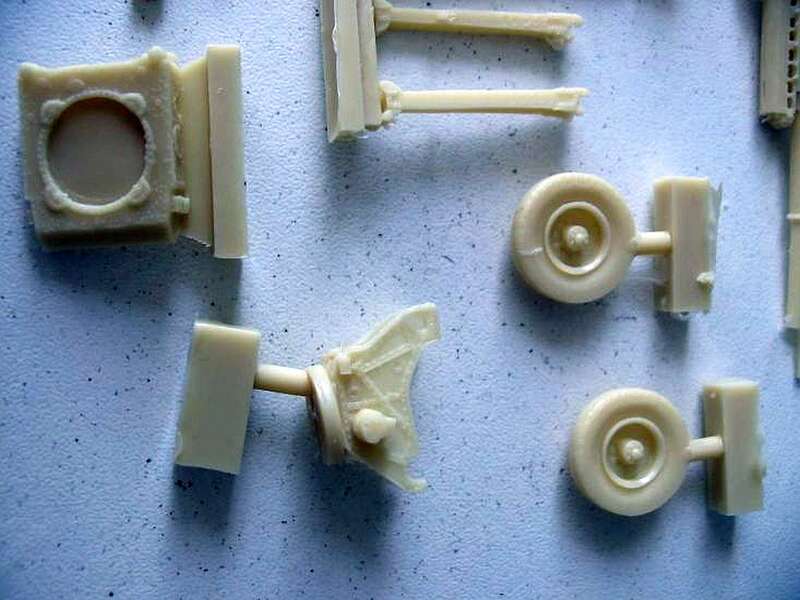 All parts were cleanly cast. 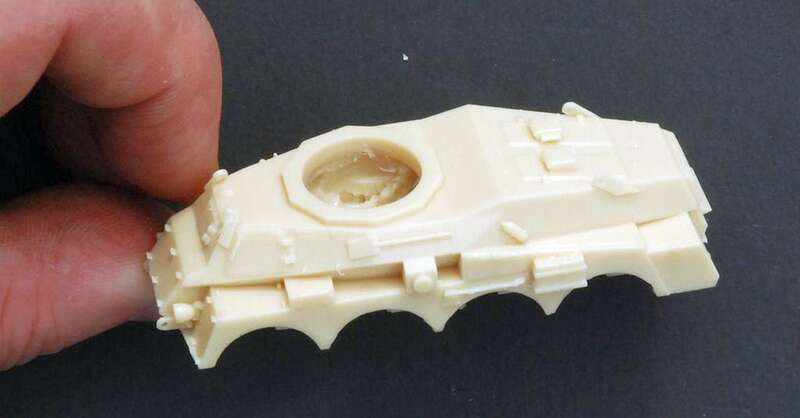 Be careful when removing the excess resin, some parts are easily damaged. 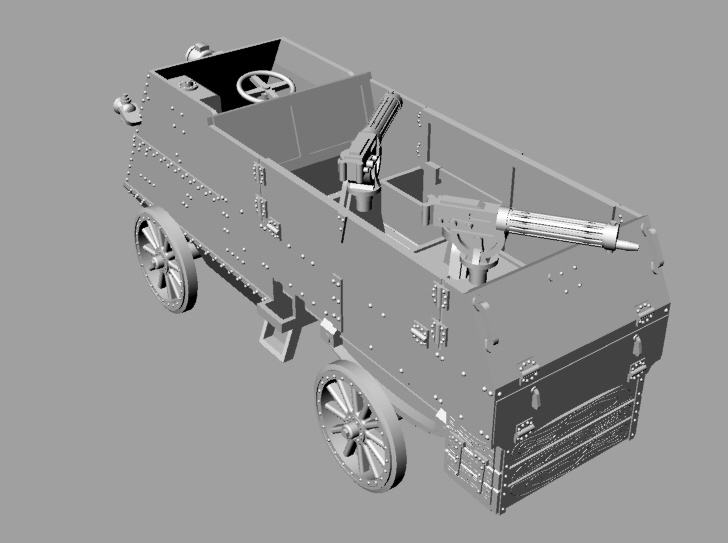 The triple Oerlikon on CMP/Ford chassis. 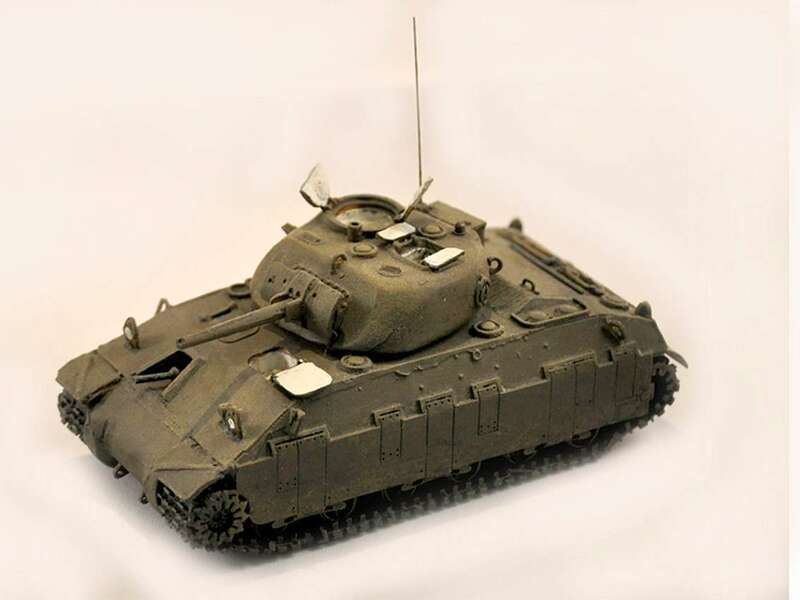 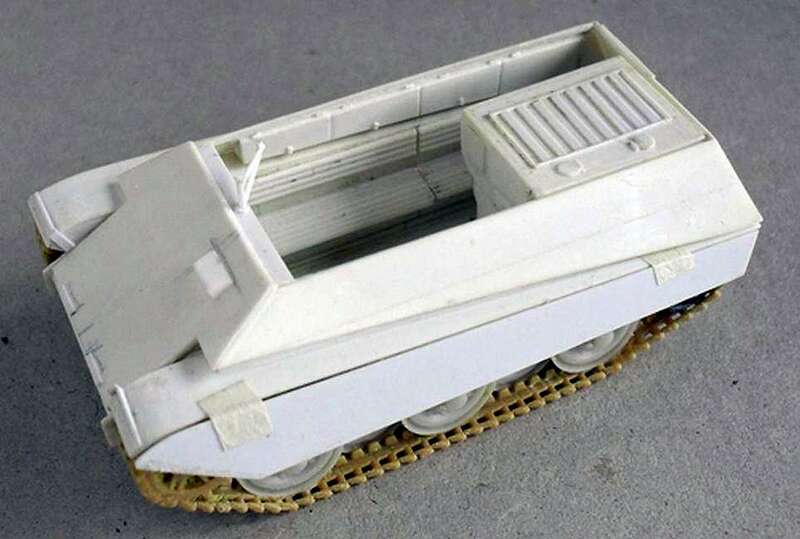 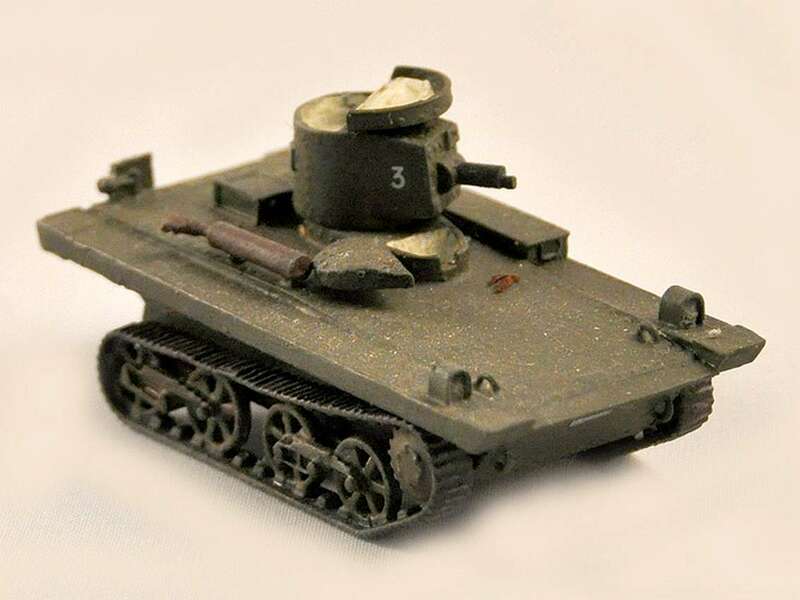 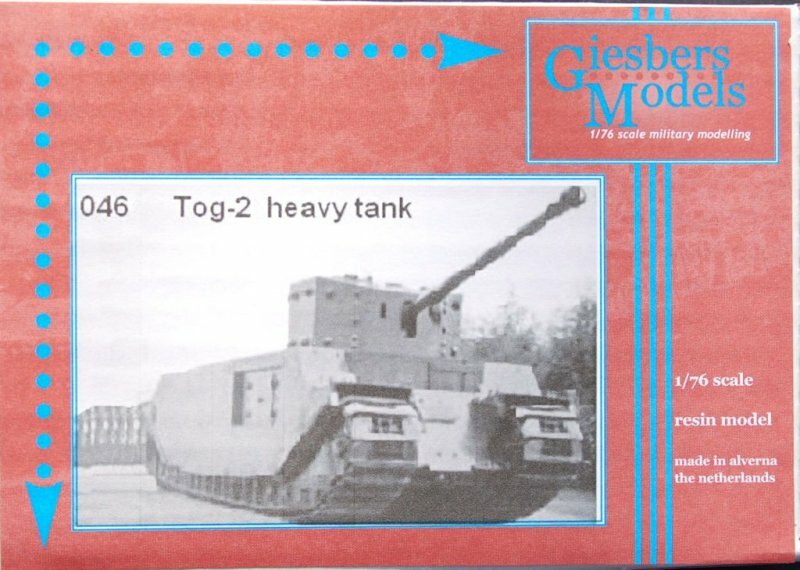 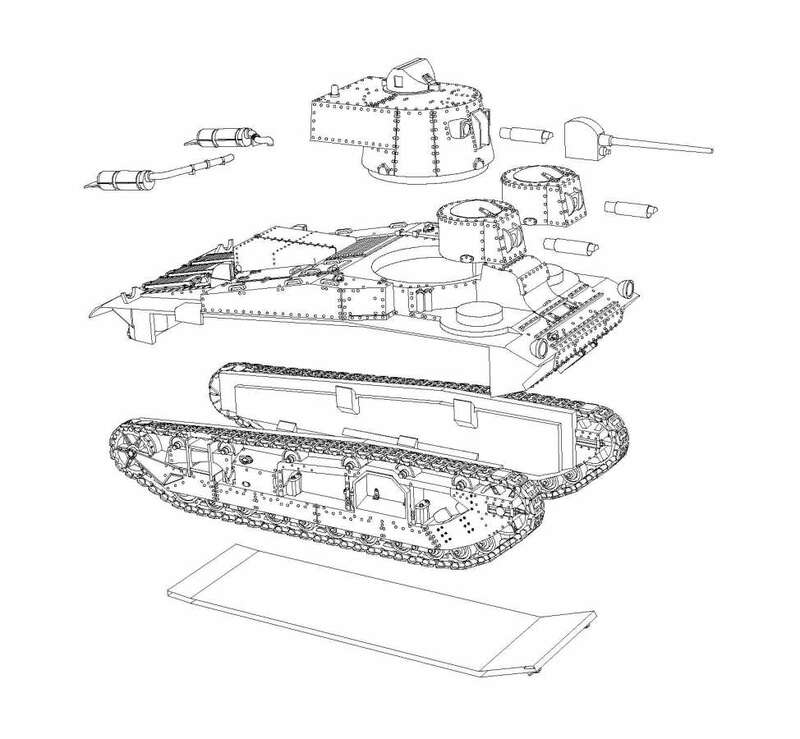 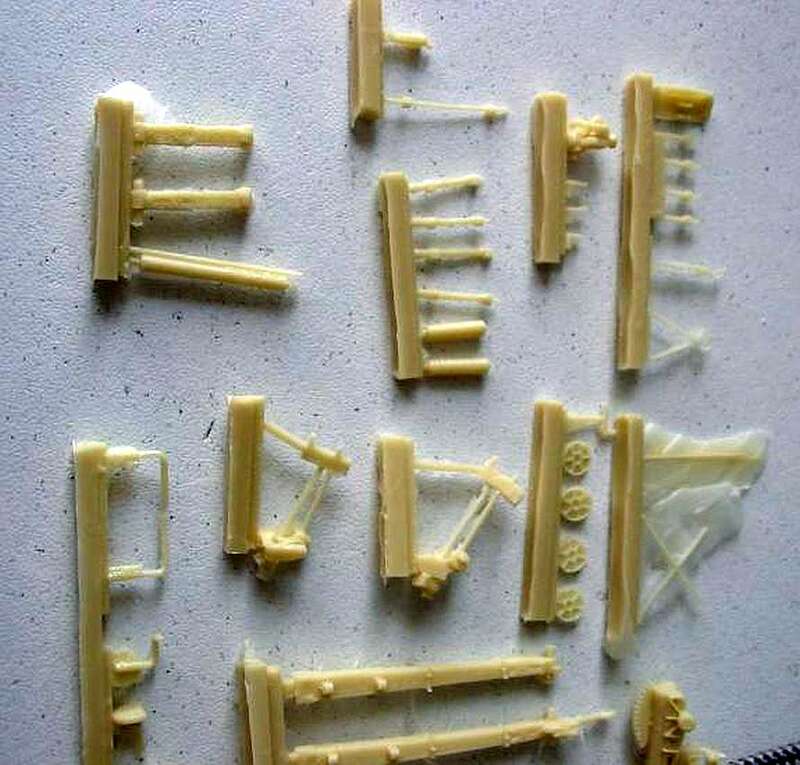 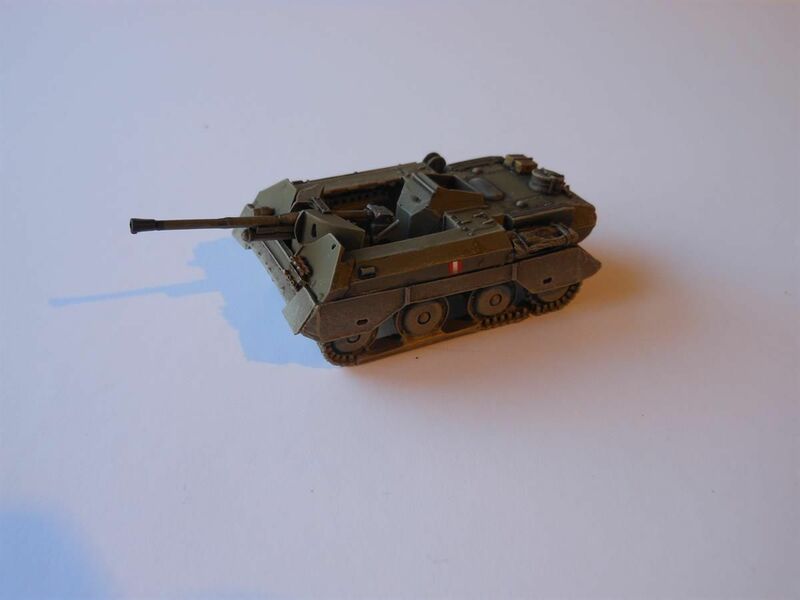 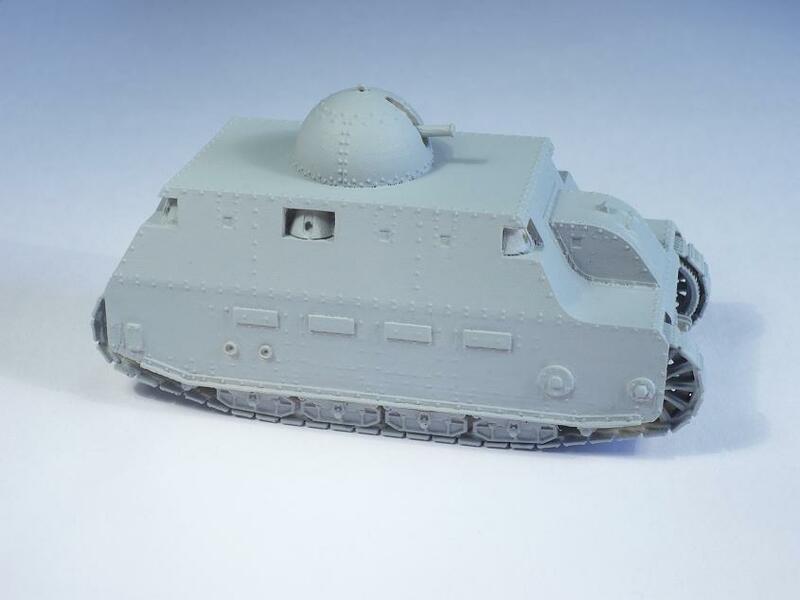 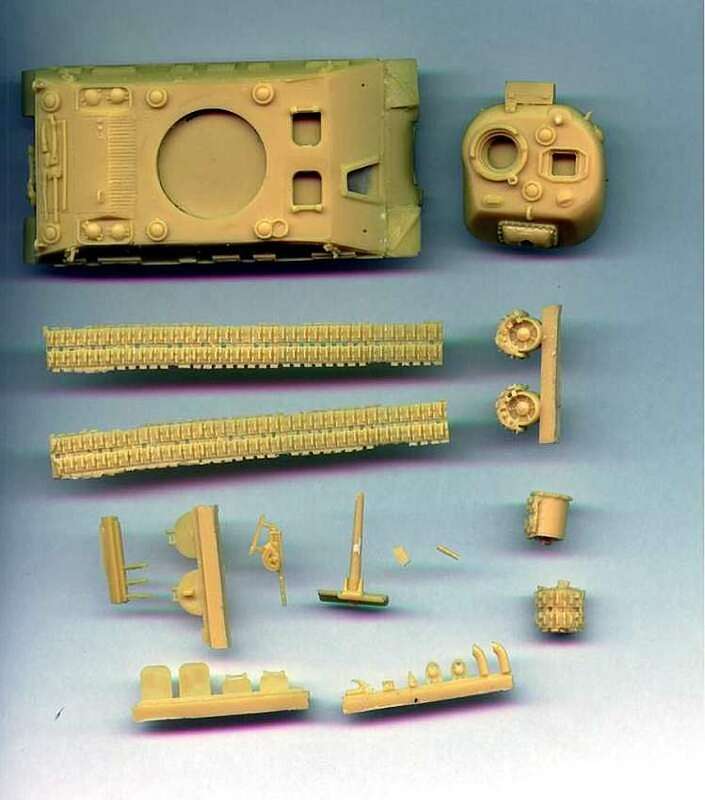 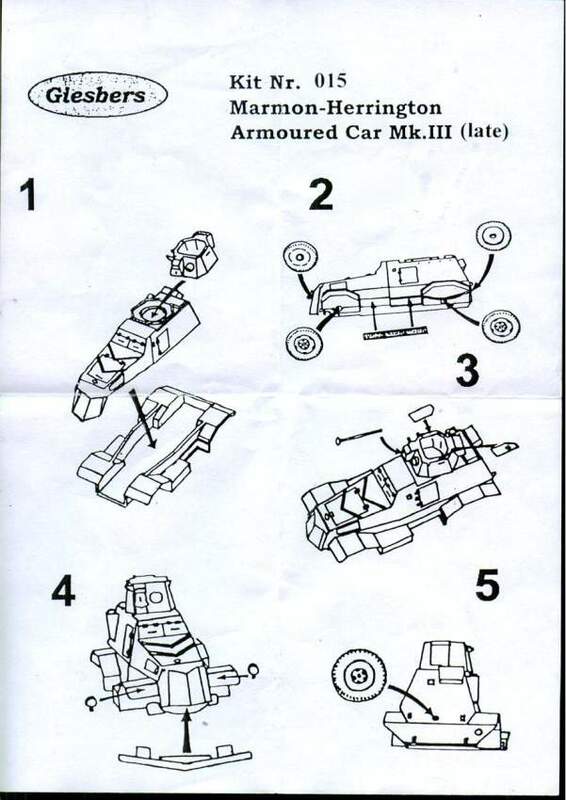 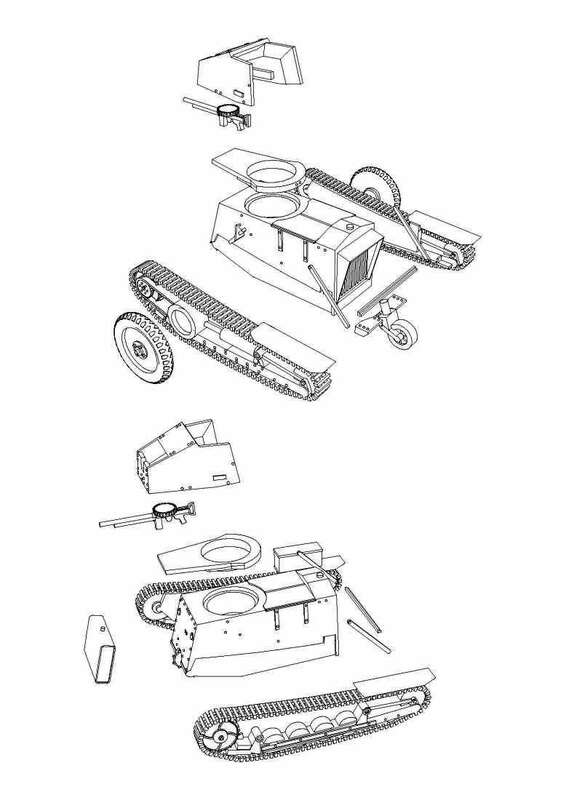 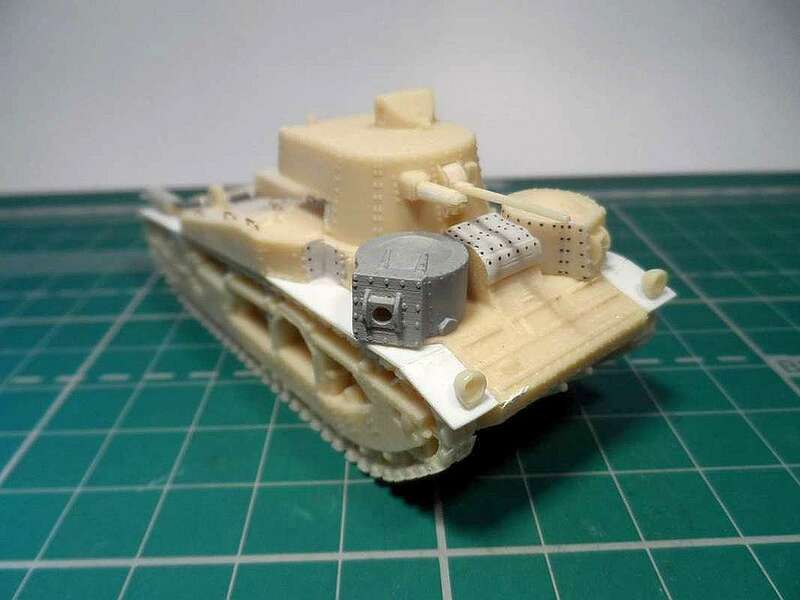 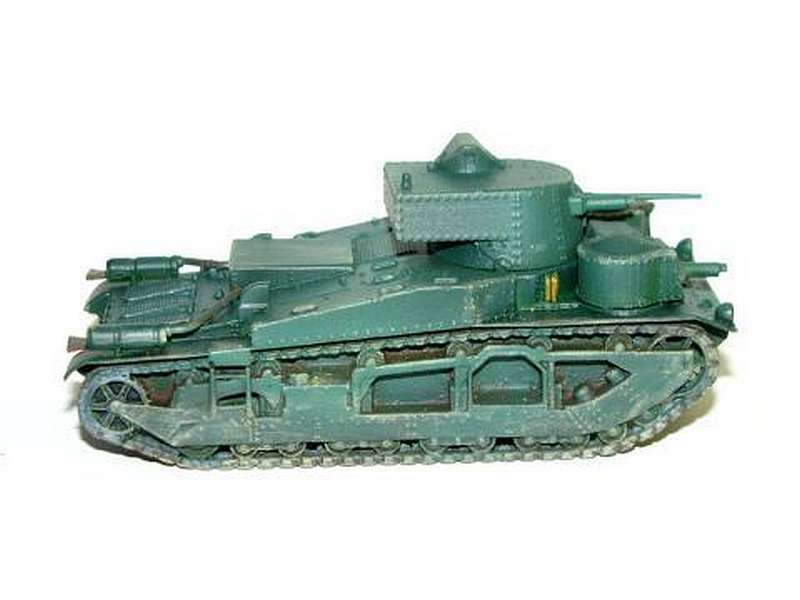 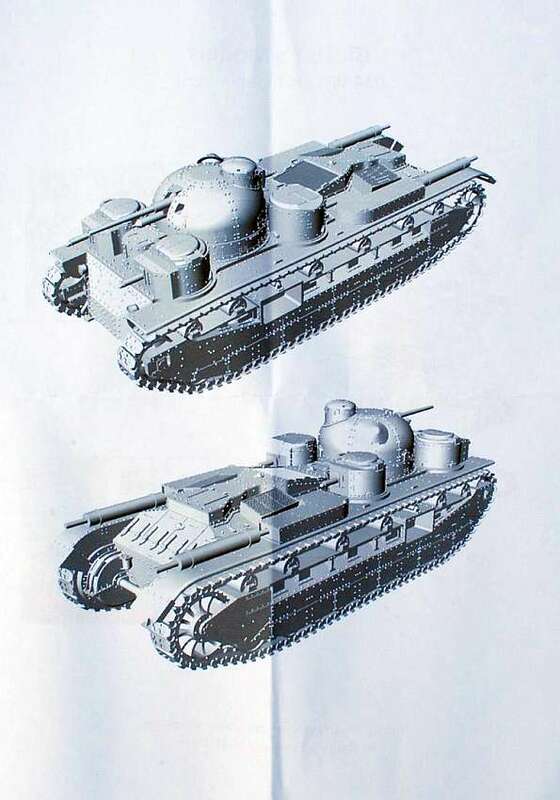 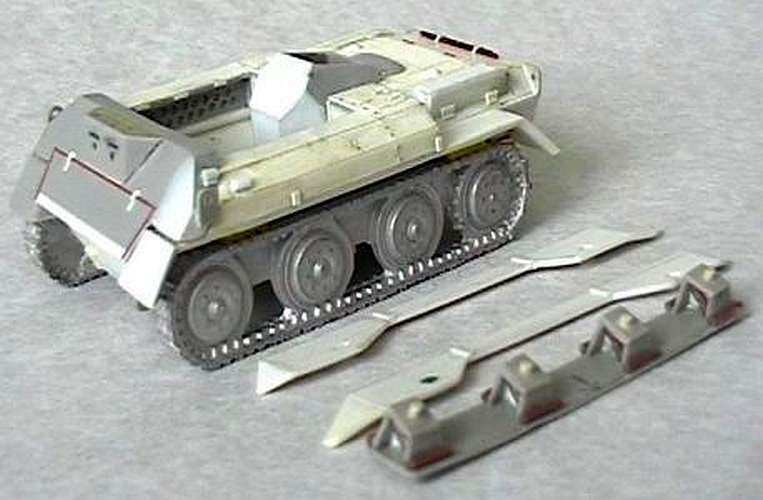 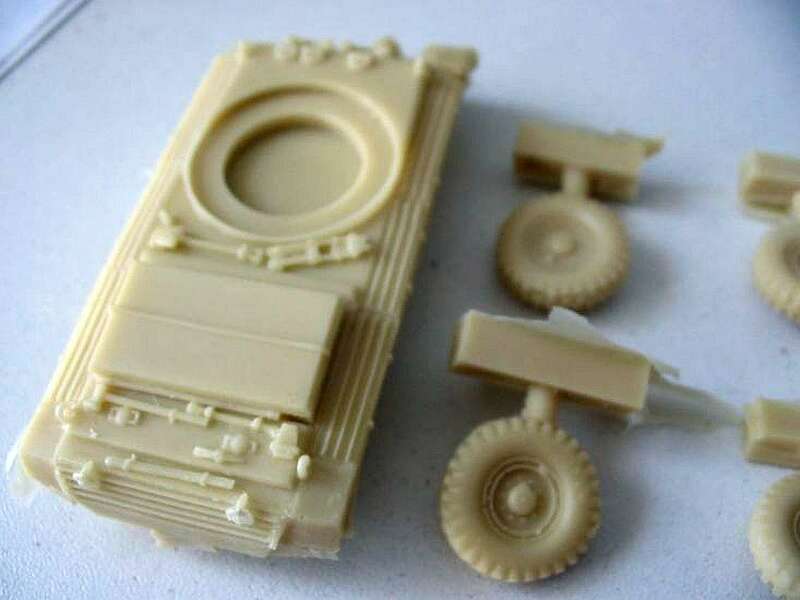 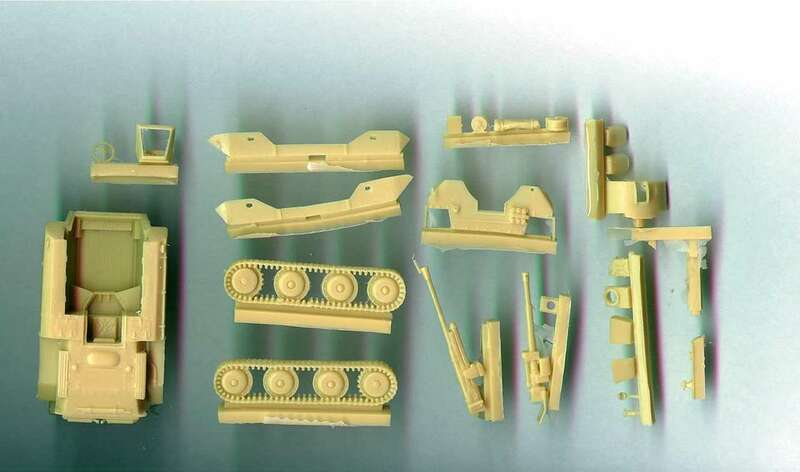 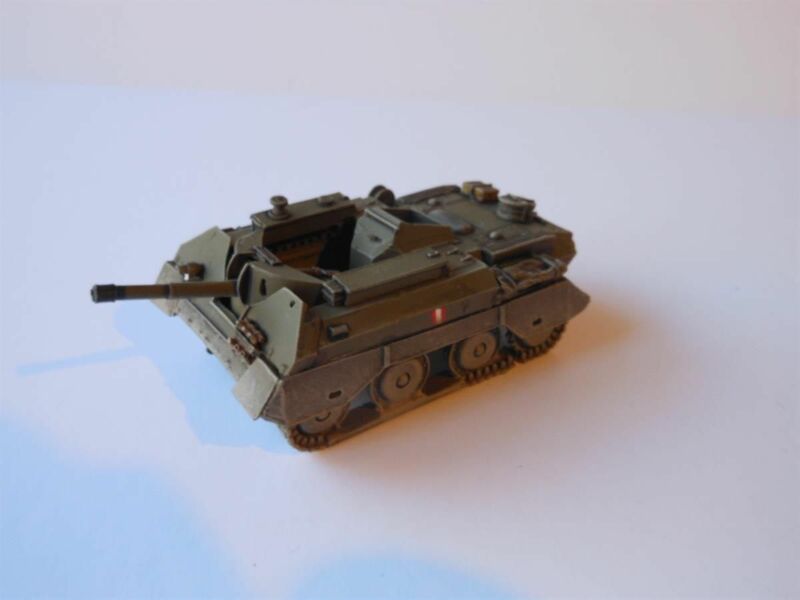 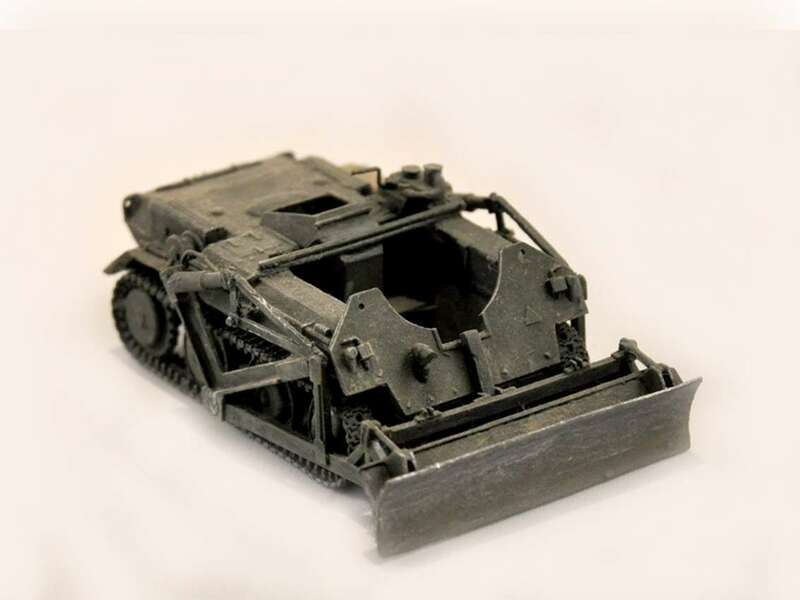 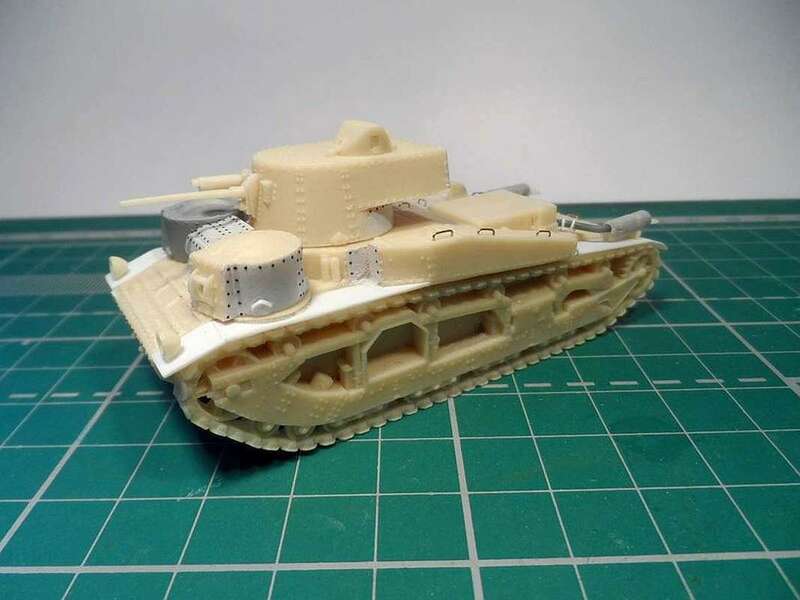 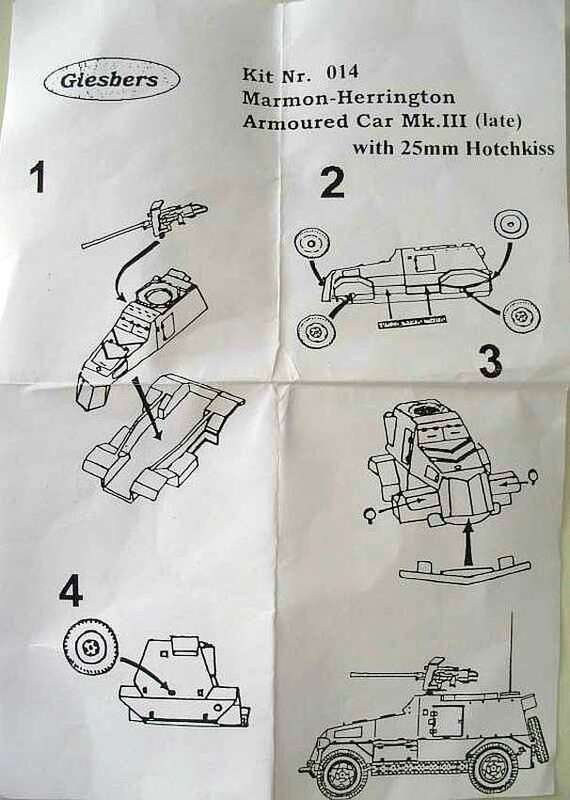 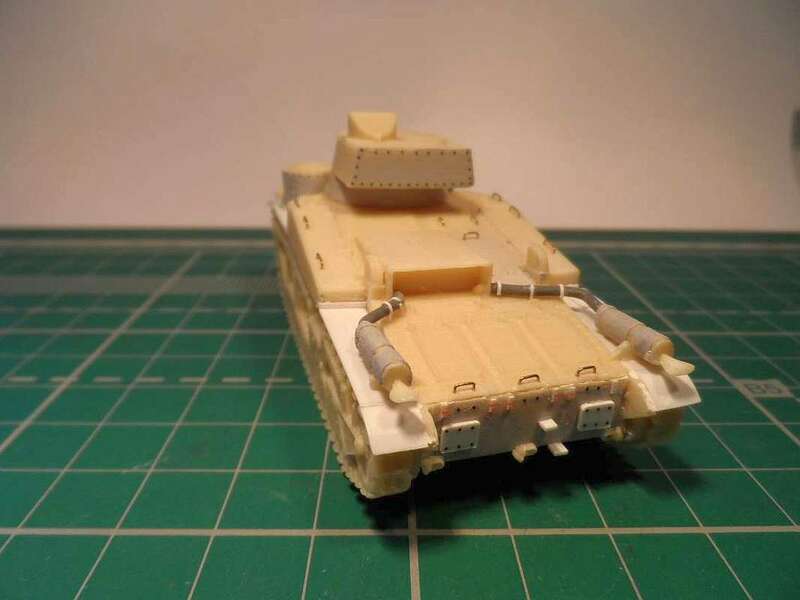 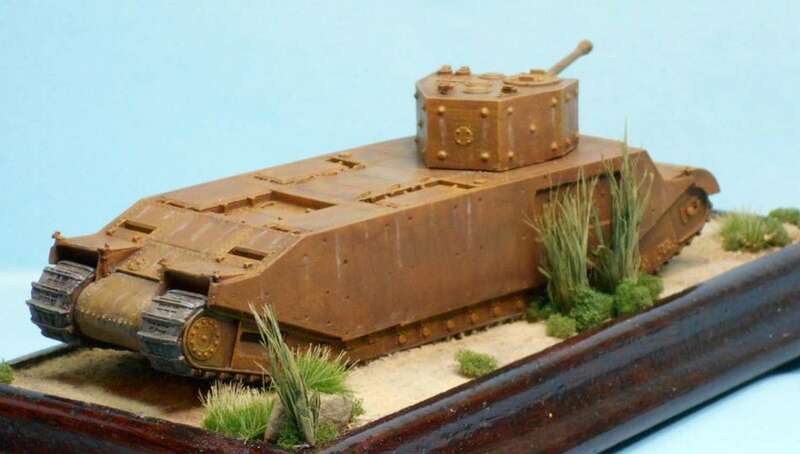 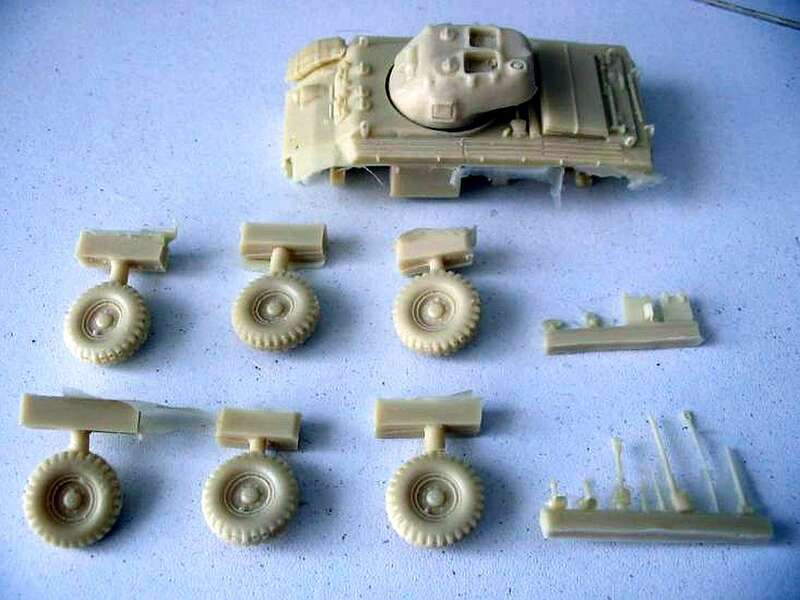 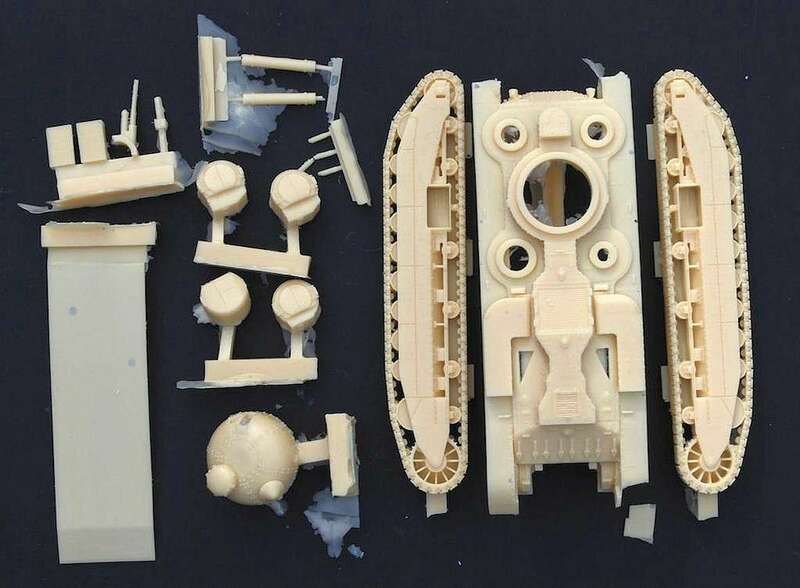 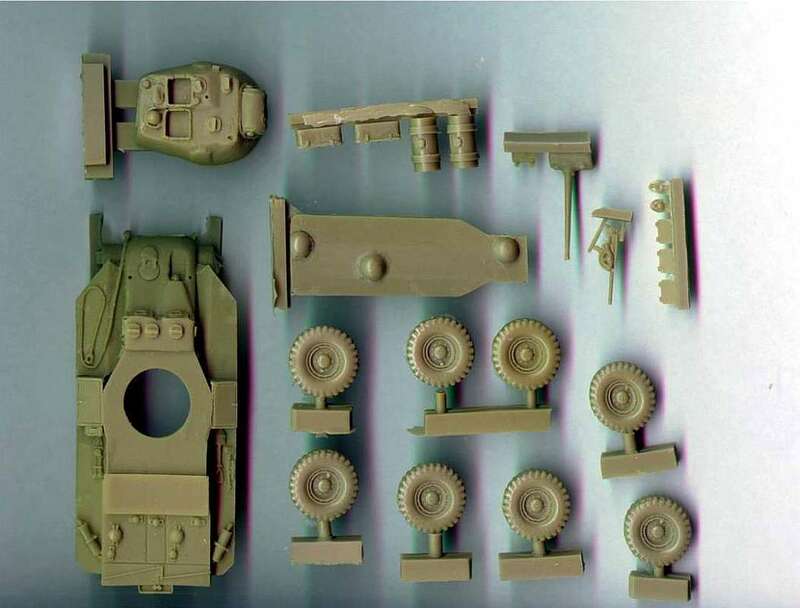 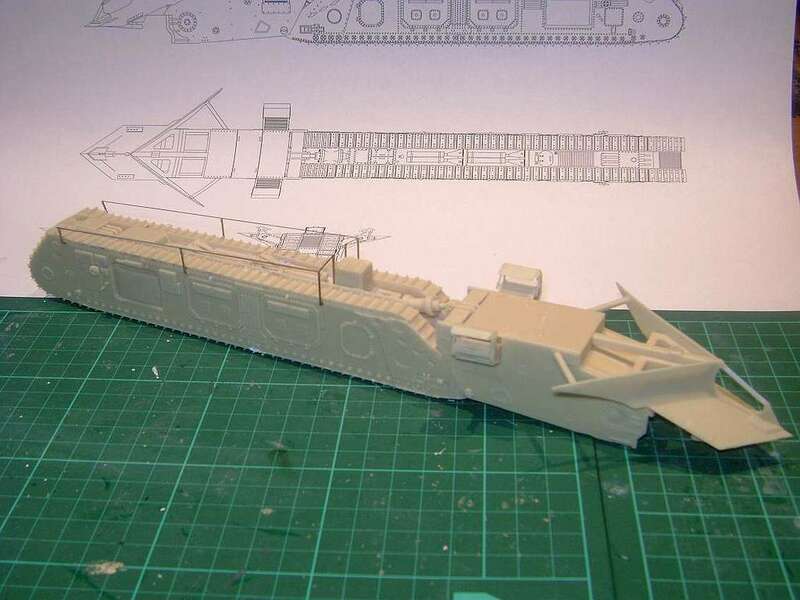 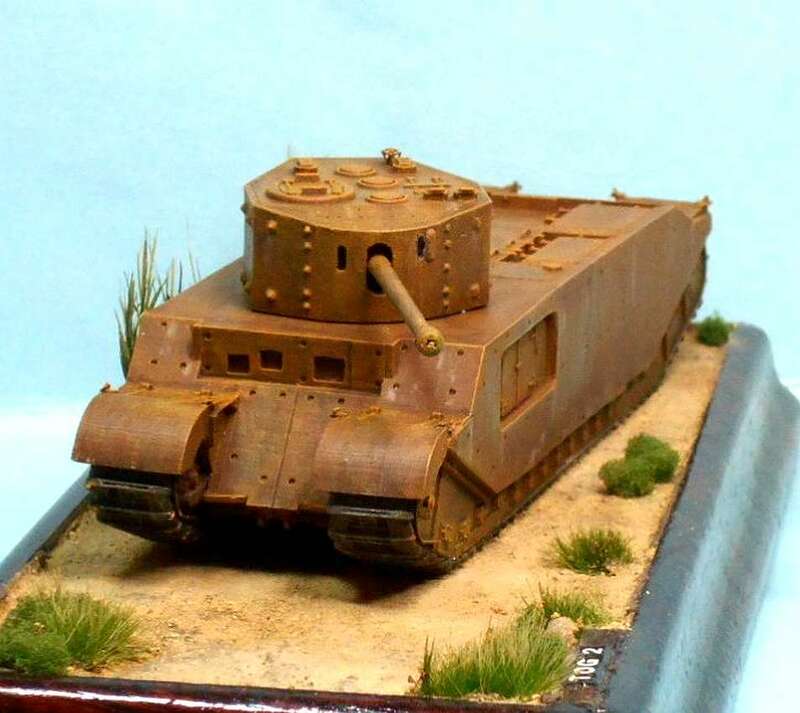 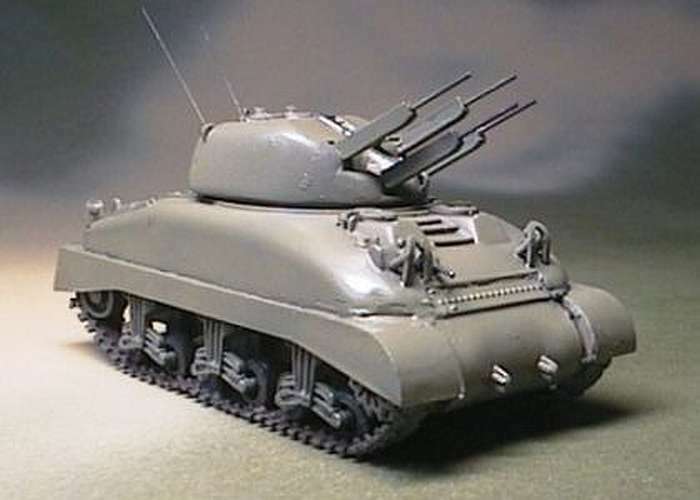 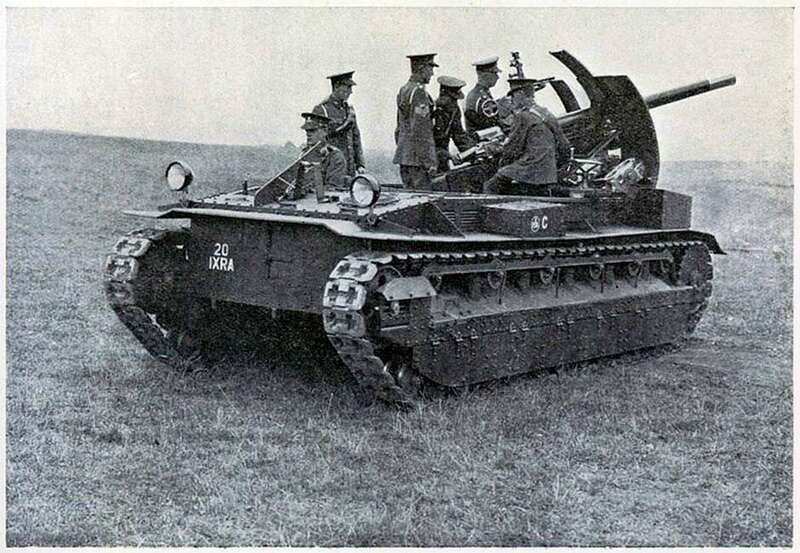 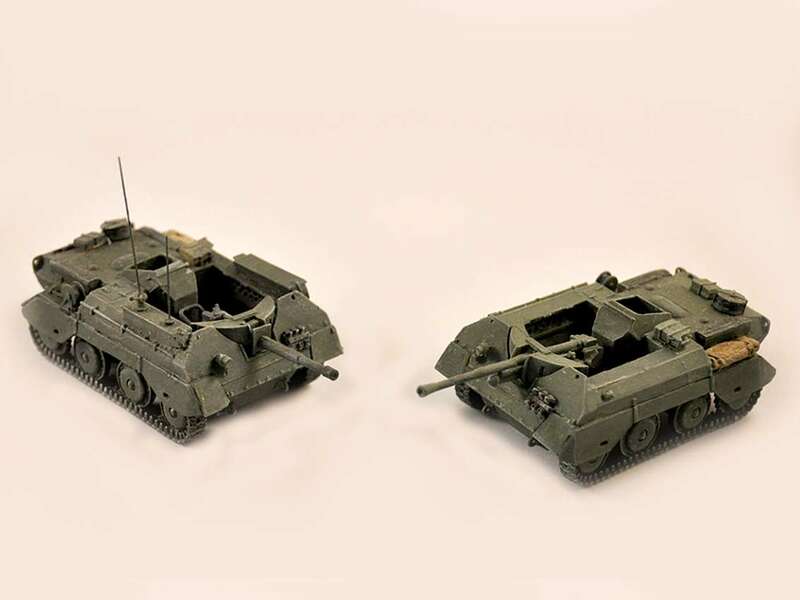 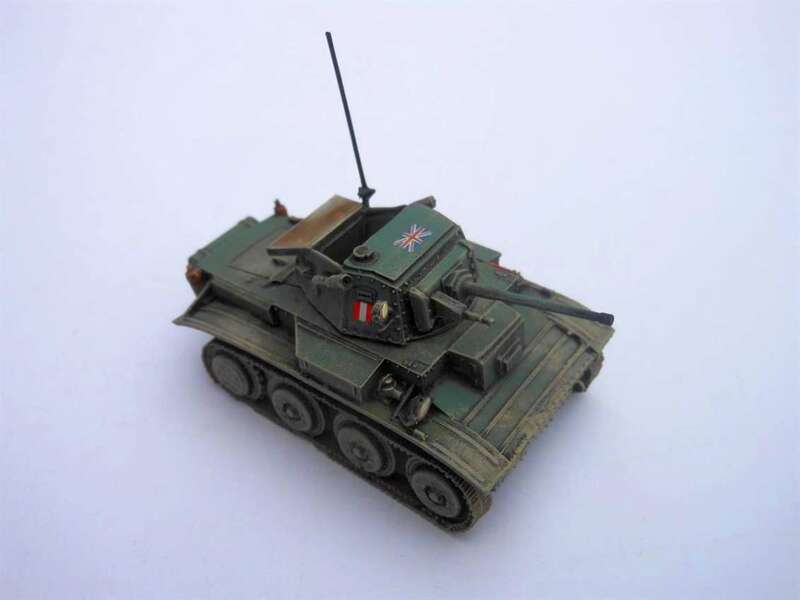 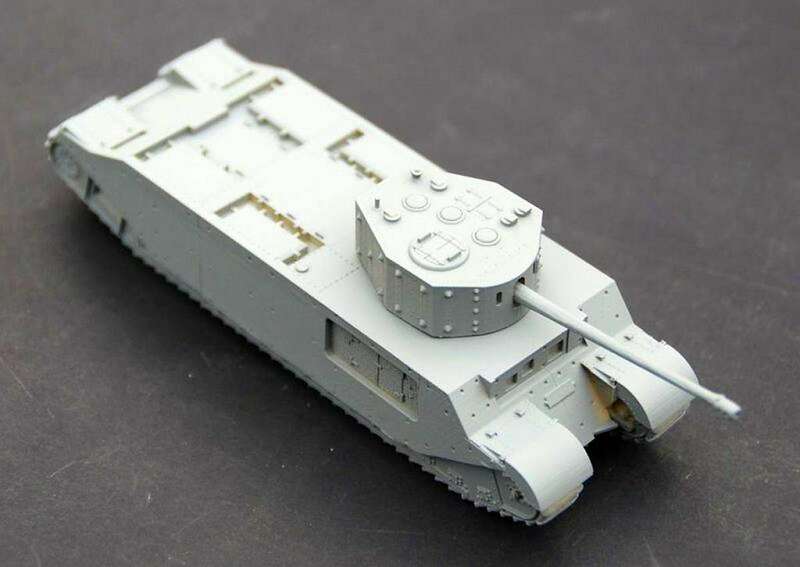 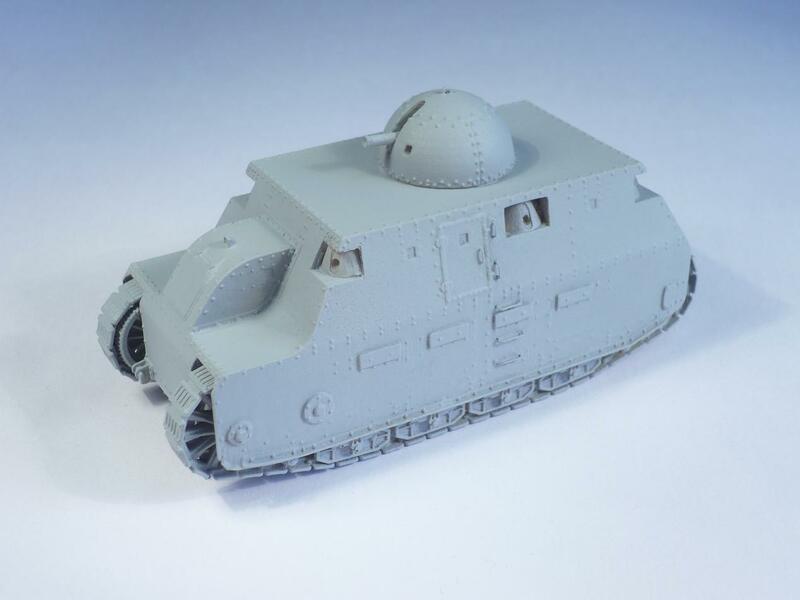 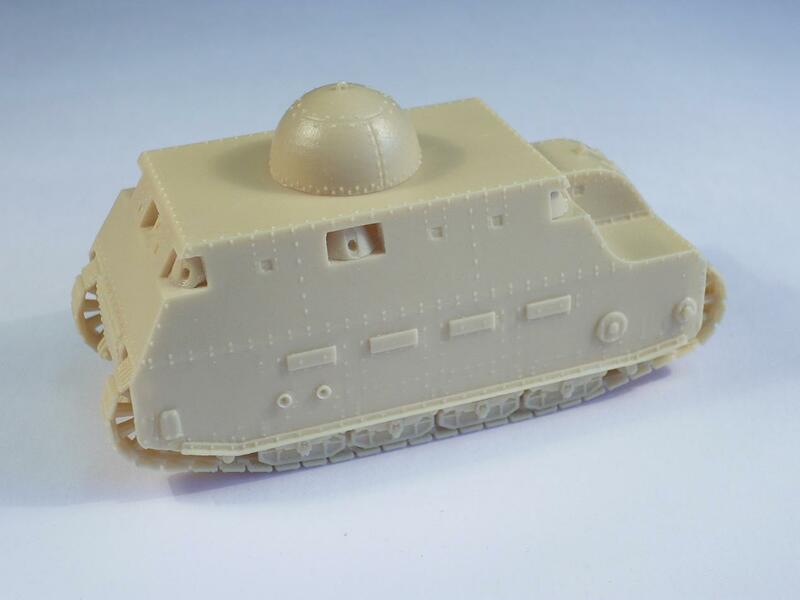 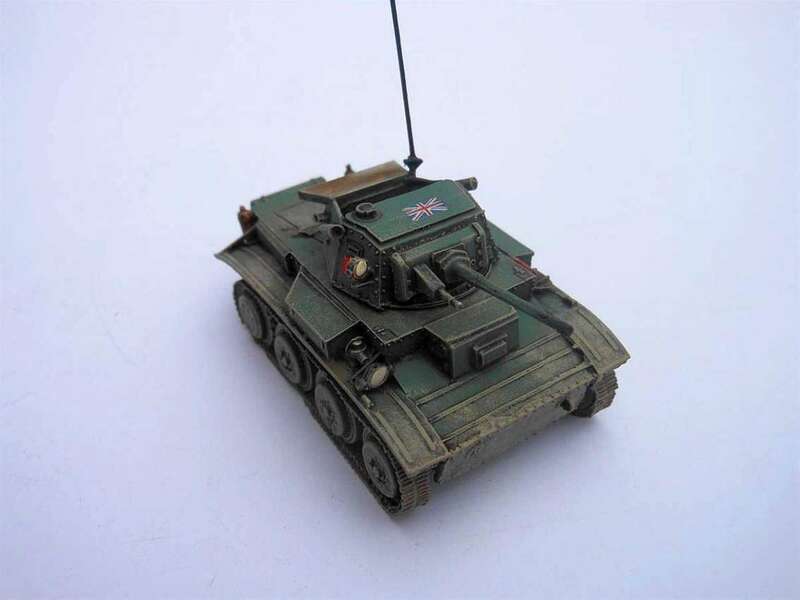 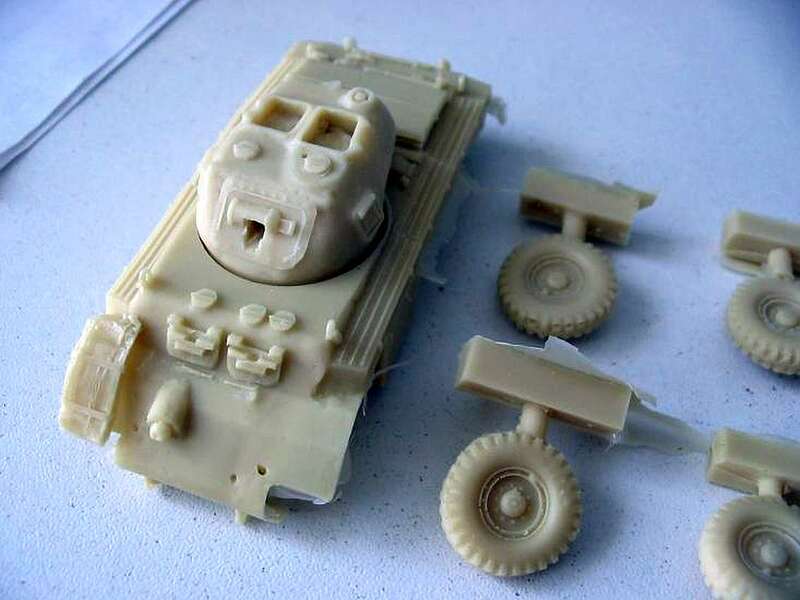 - *TIP* - As a simple conversion you can fit the triple gun mount on the chassis of the British Crusader tank, only a few of these were made. 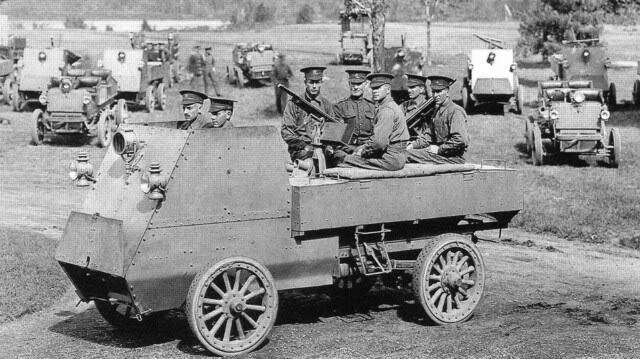 The carrier was originally designed as a vehicle for use in arctic terrain, this with the idea of a future invasion of Norway in mind. 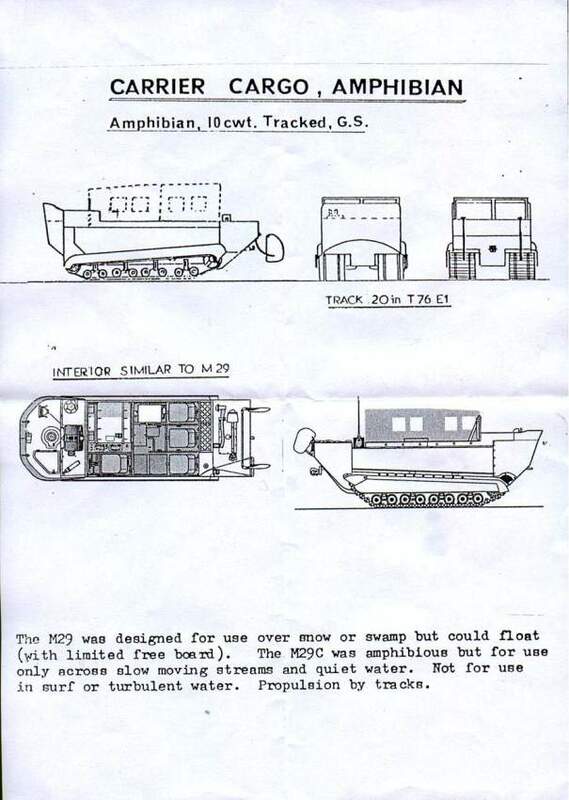 The vehicle could float but had only a very limited freeboard and a low speed in water. 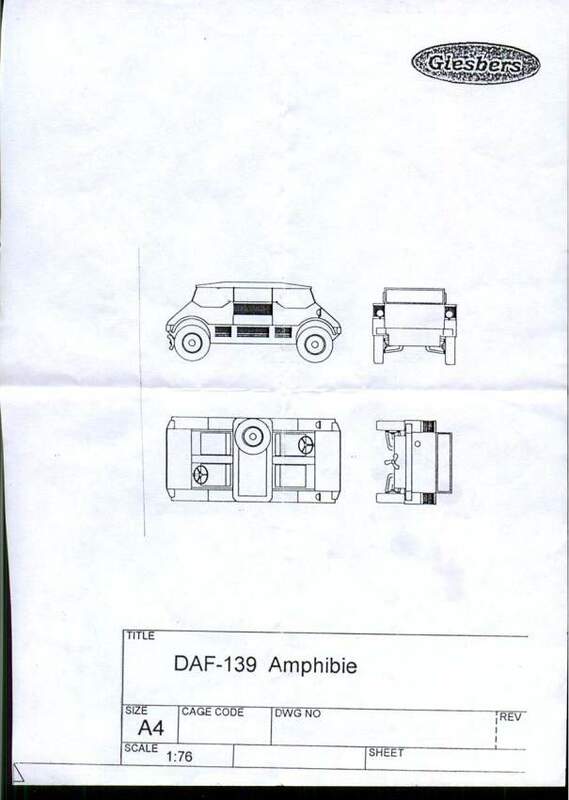 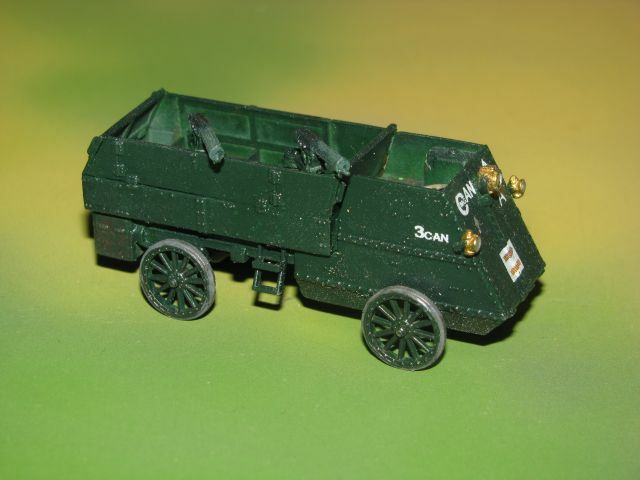 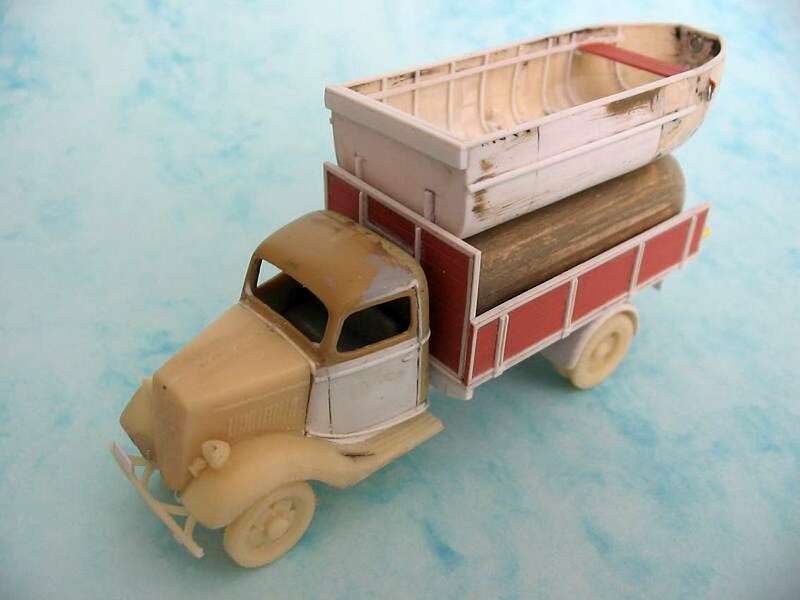 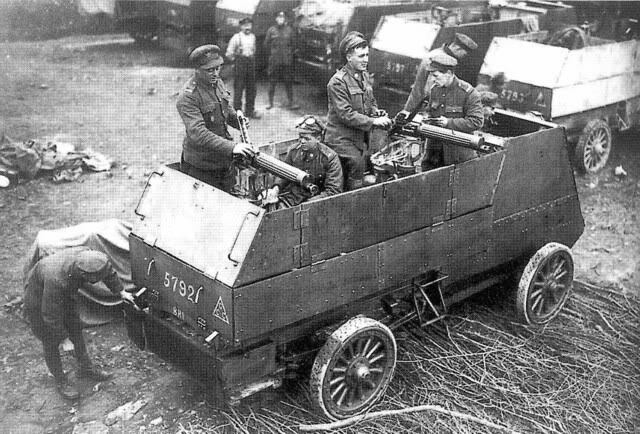 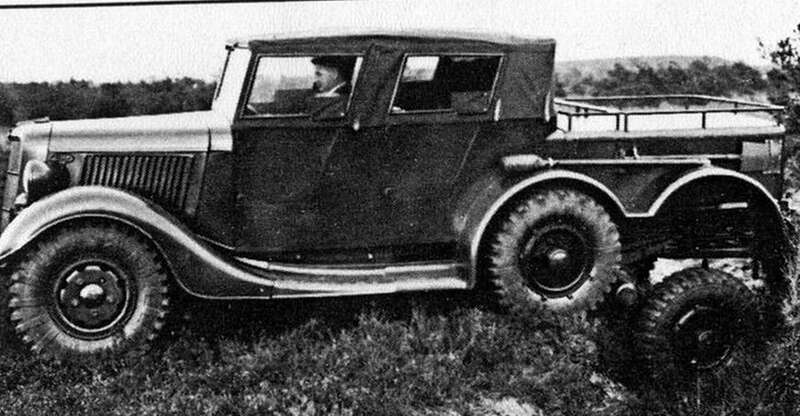 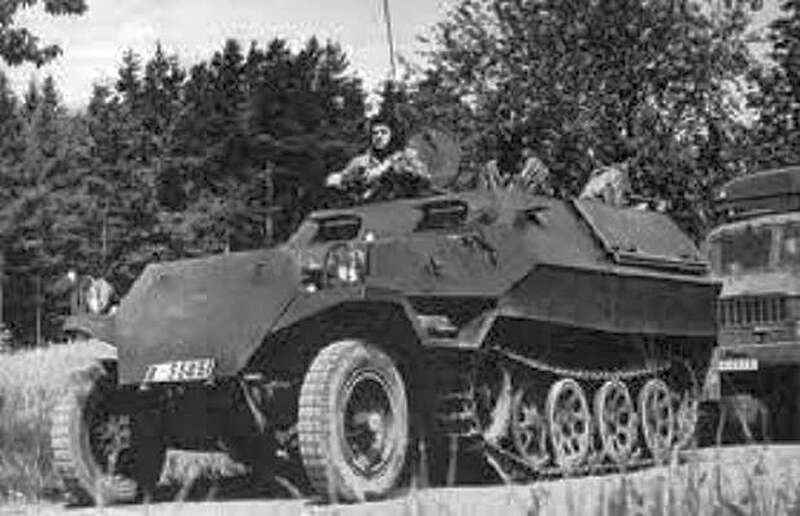 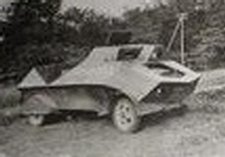 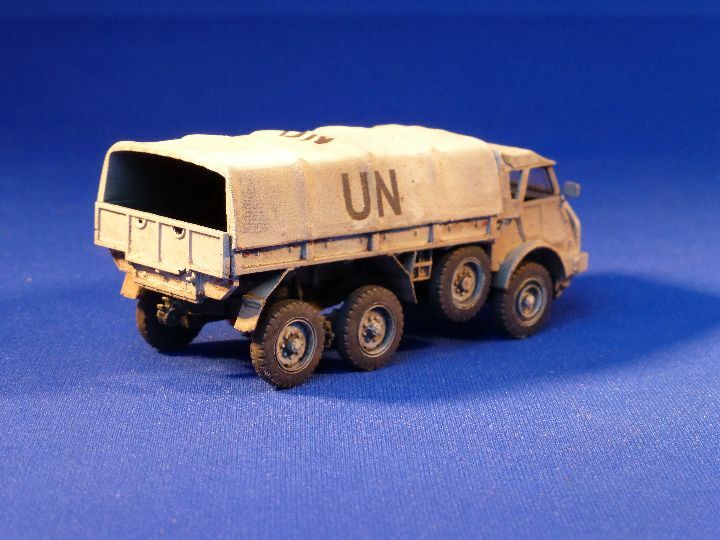 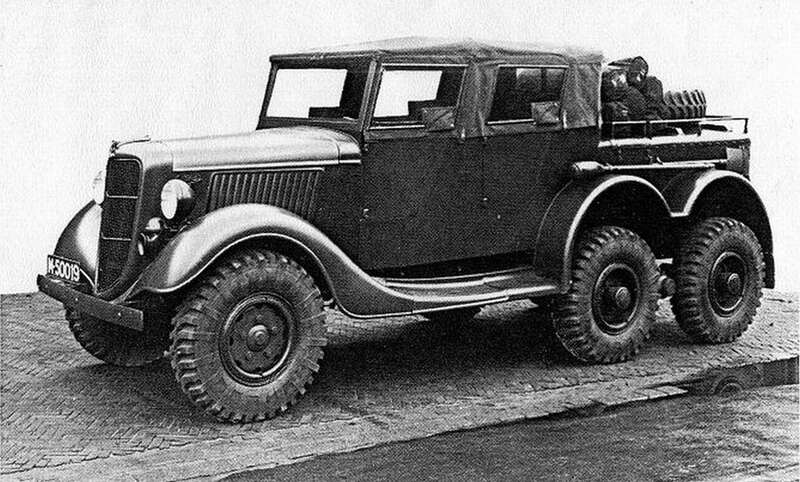 The DAF 139 amphibious car was under development for the Dutch army in 1939/40. 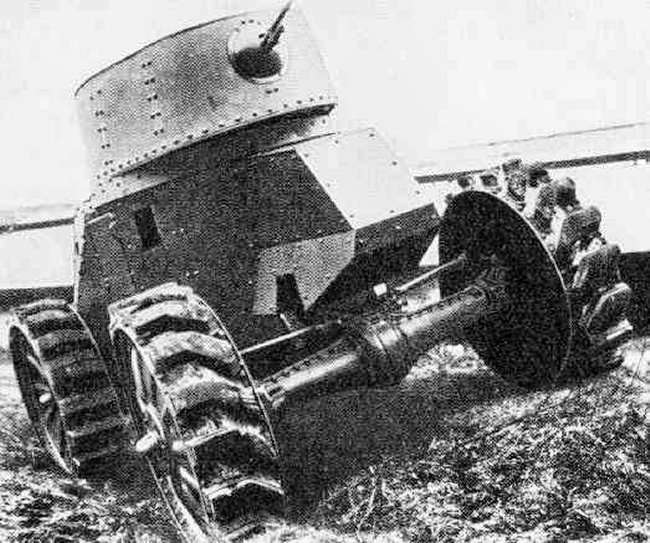 Only one prototype was made and tested, it seems it disappeared without a trace during the fighting in may 1940. 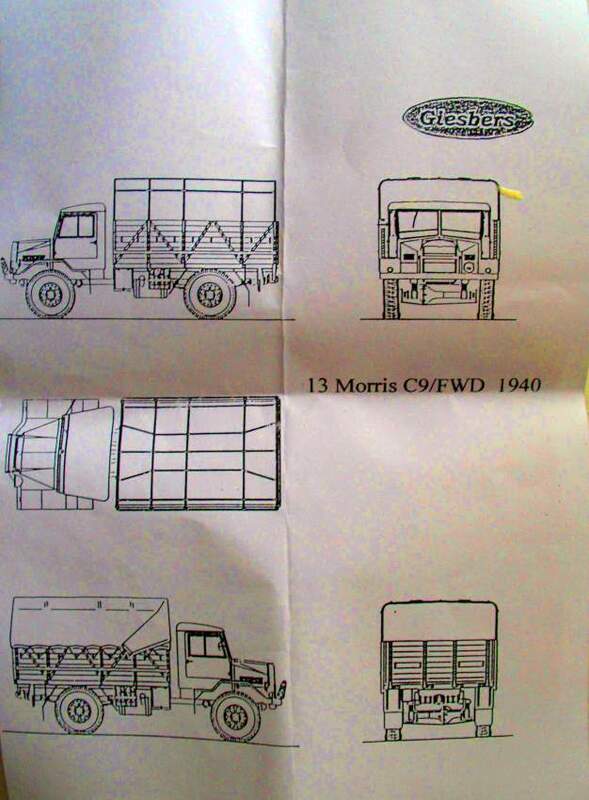 Perhaps it is still hidden somewhere in a barn? 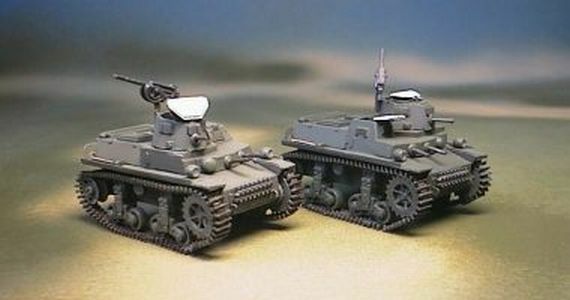 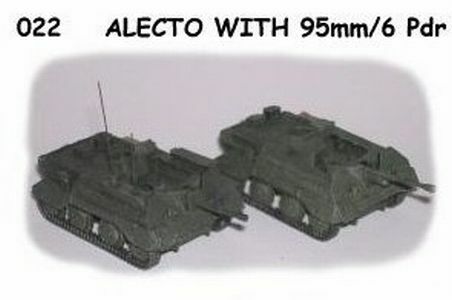 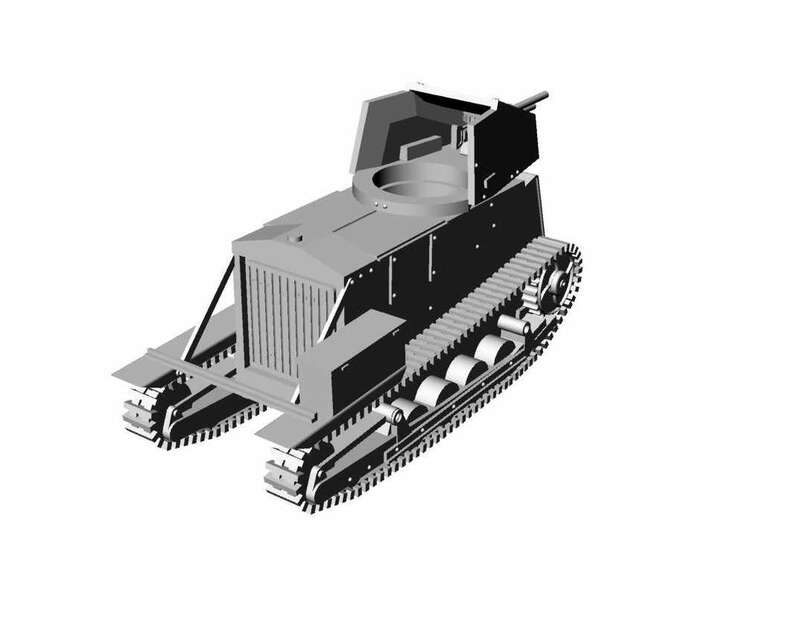 The masters for these two models were made by Andrew Crutchley, the only difference between the two versions is the location of the turret. 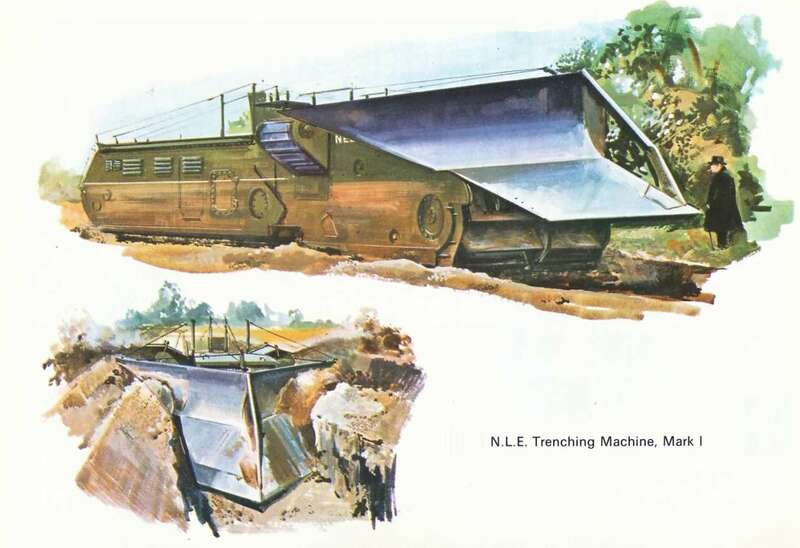 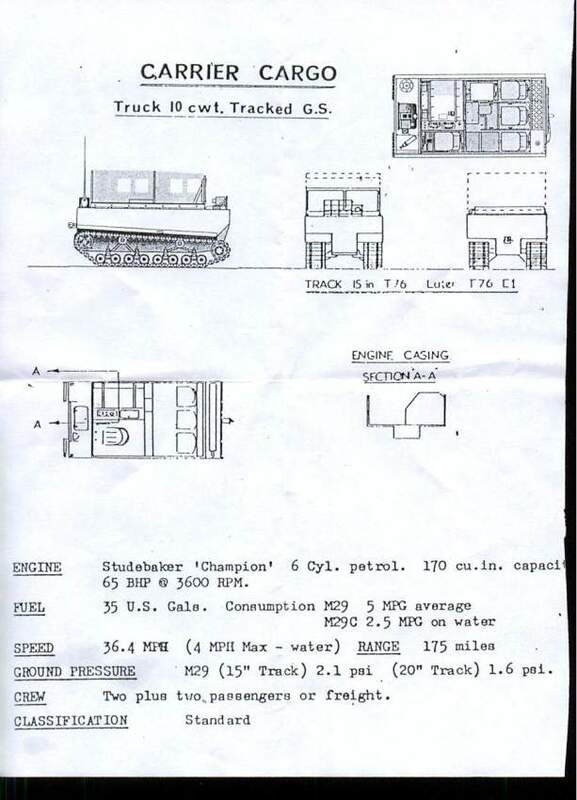 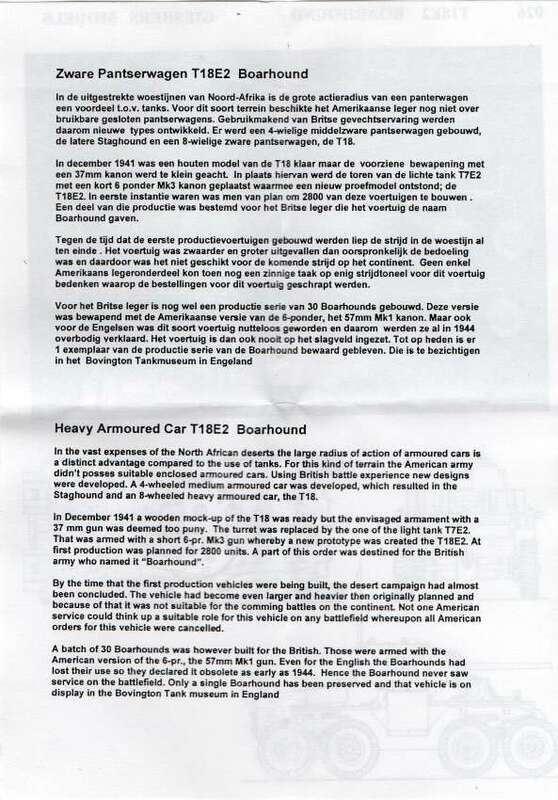 These tanks were originally ordered by the Netherlands Purchasing Commission but after Pearl Harbour the contracts were taken over by the US army. 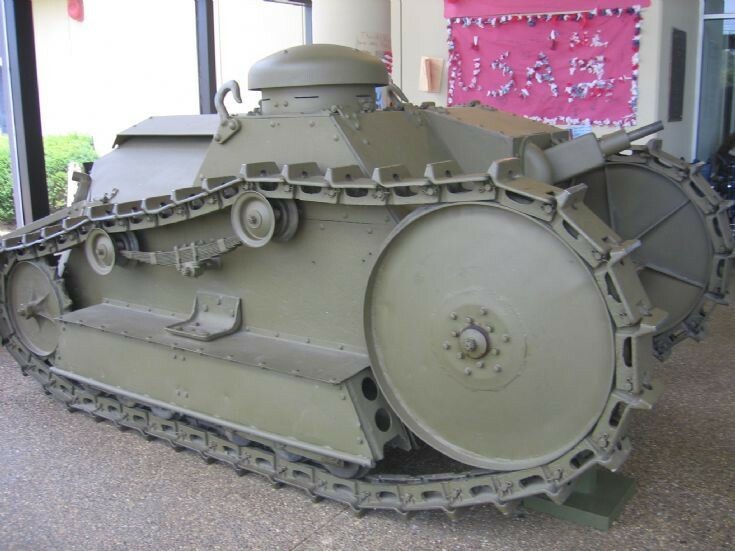 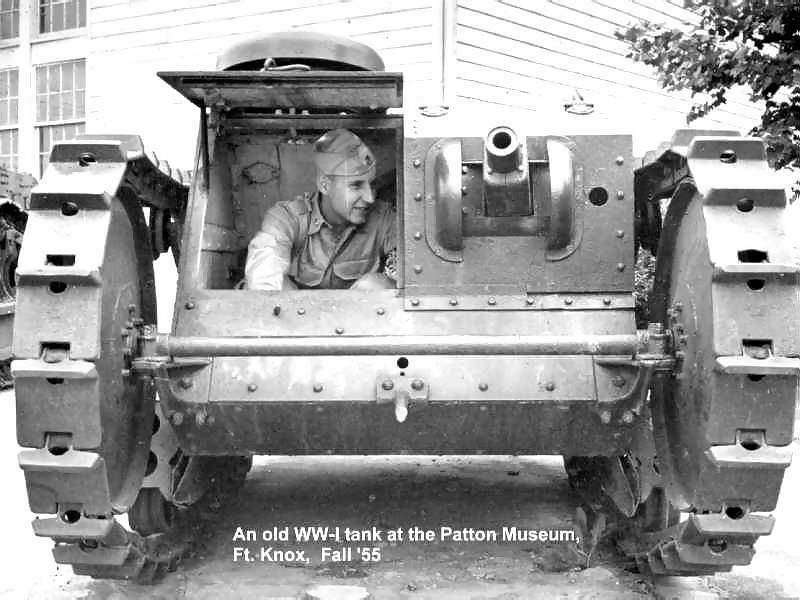 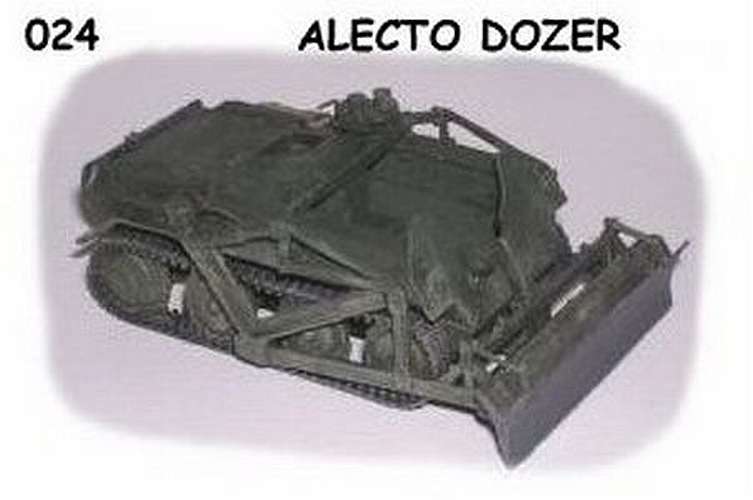 Although called the worst tank made in the USA they used it for a long time for training and security duties. 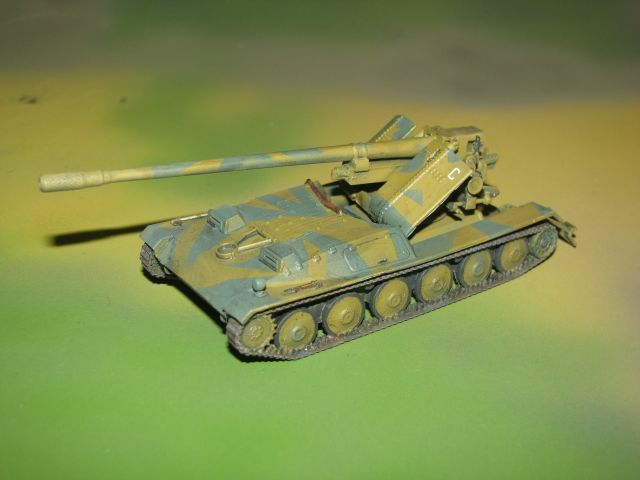 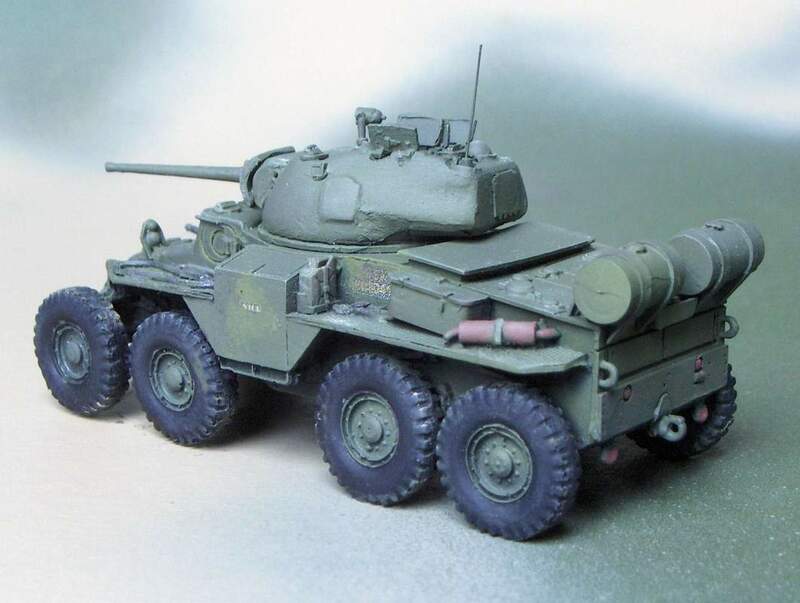 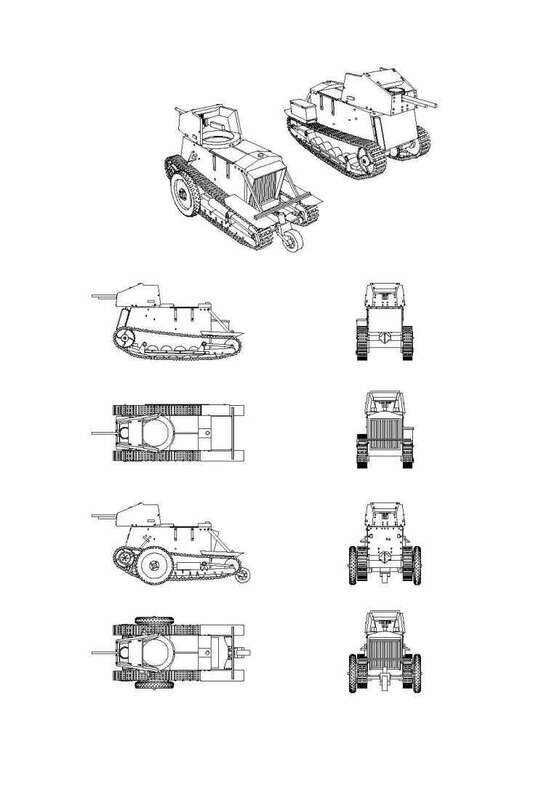 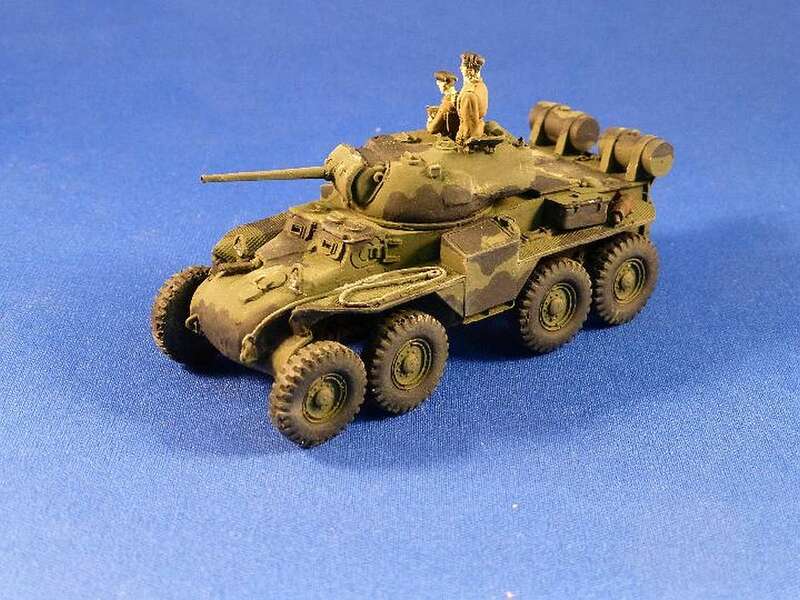 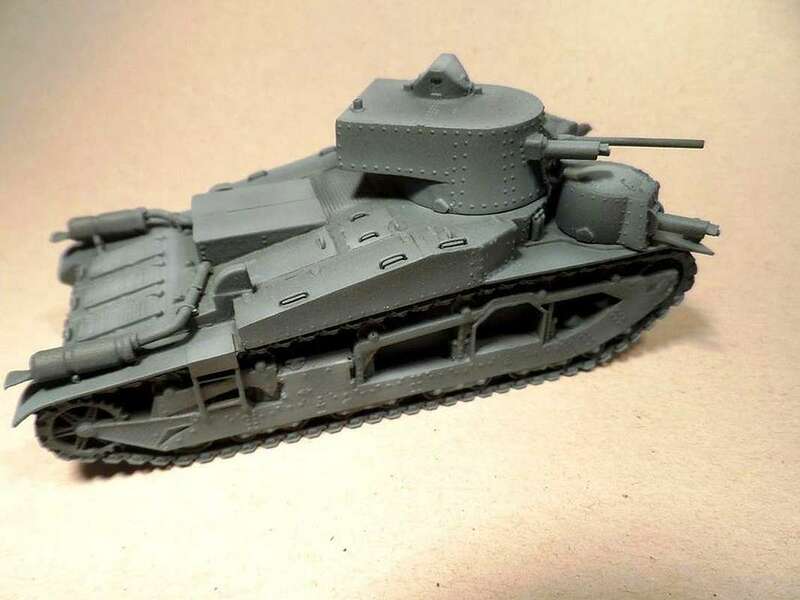 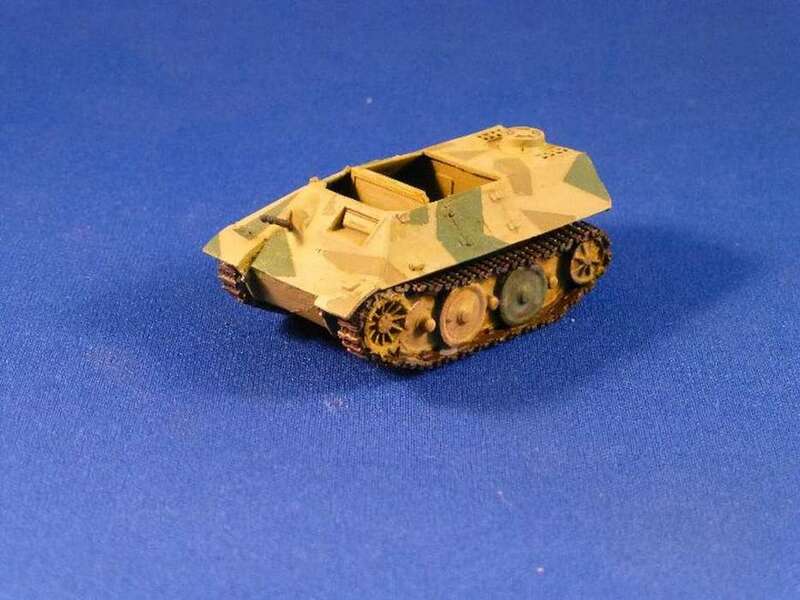 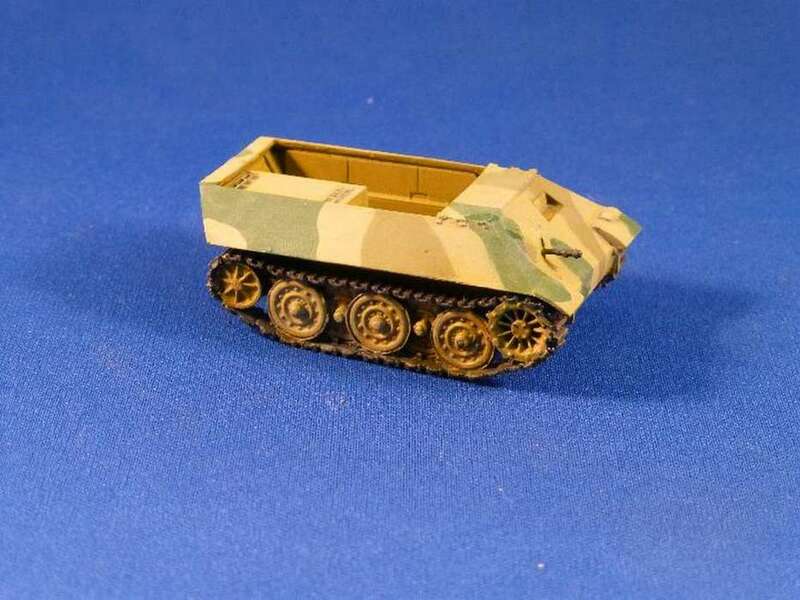 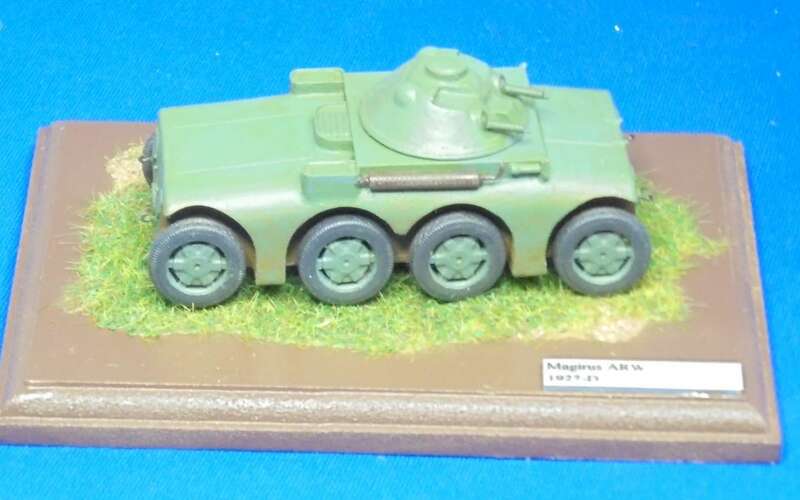 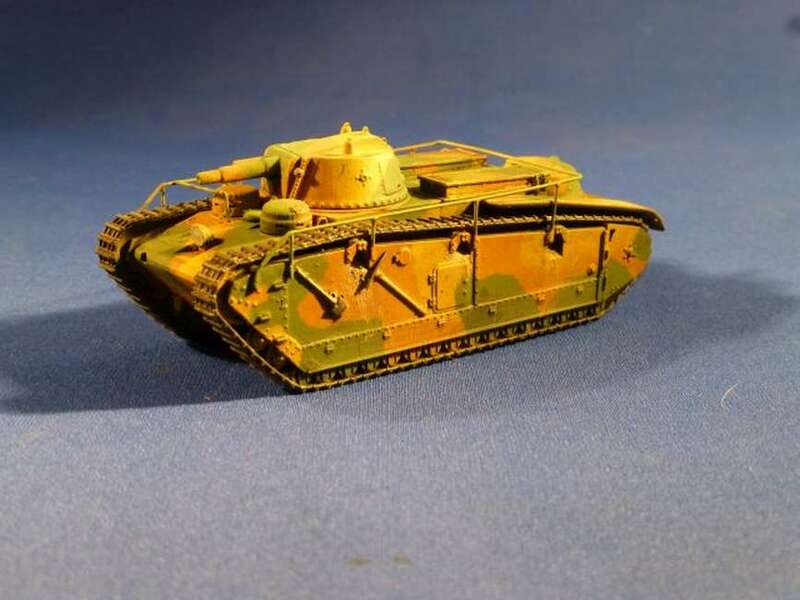 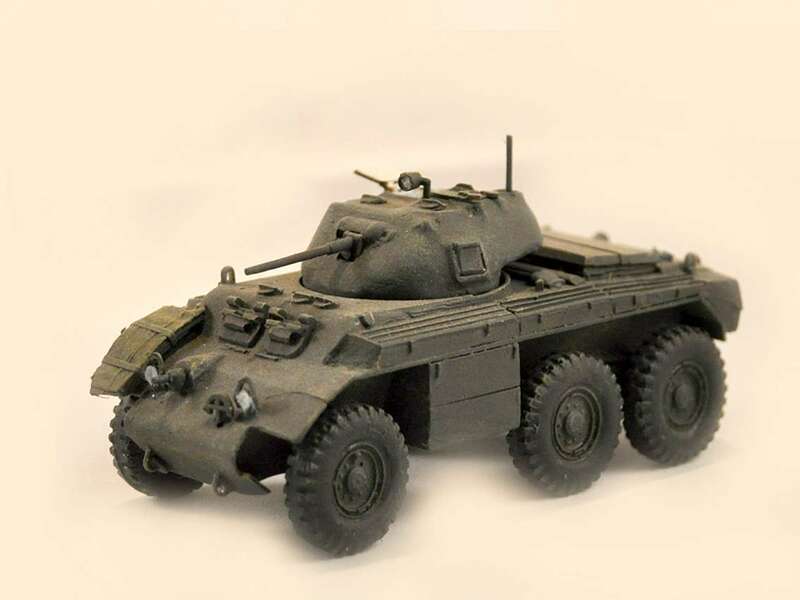 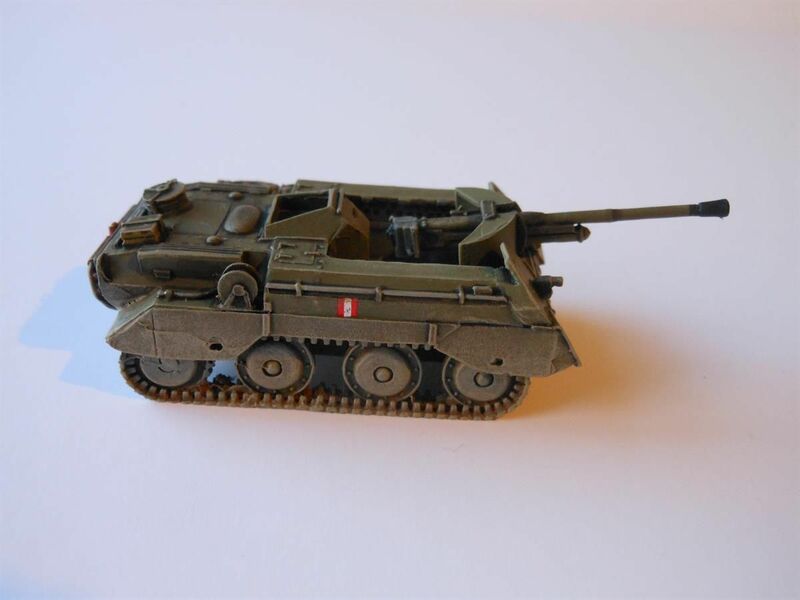 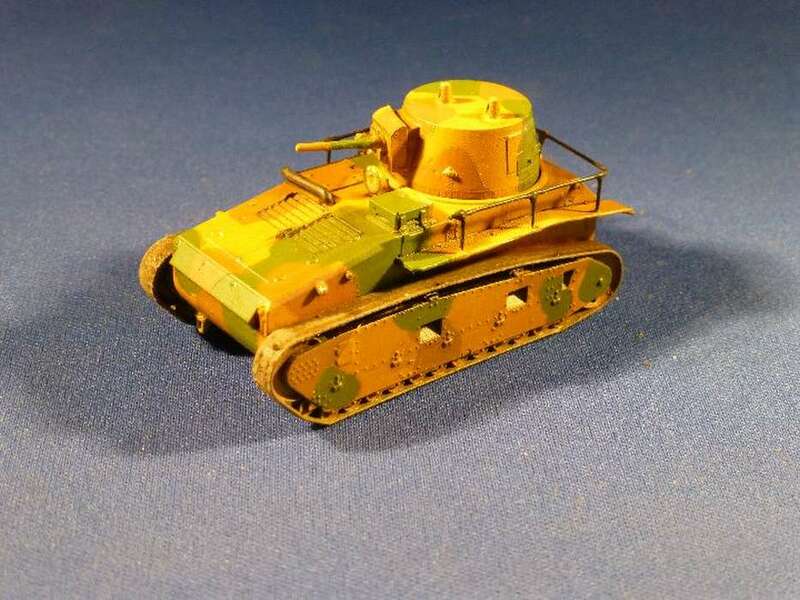 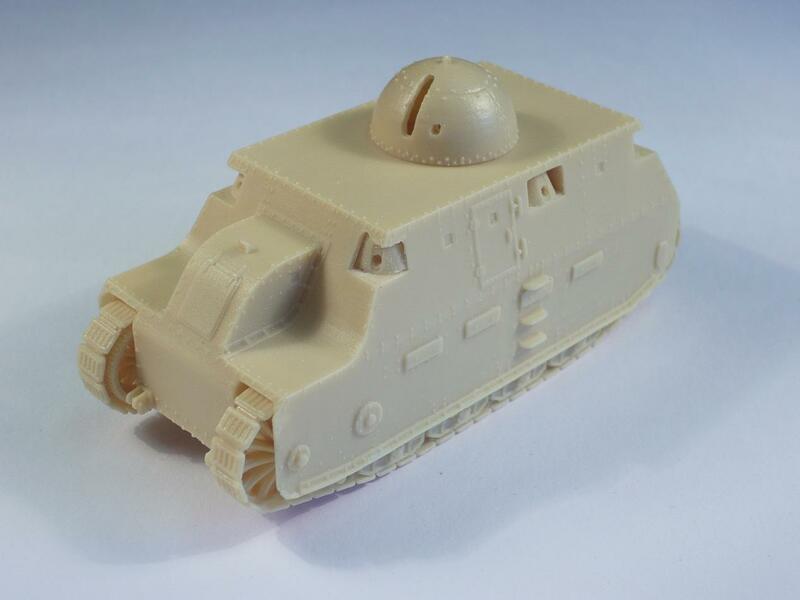 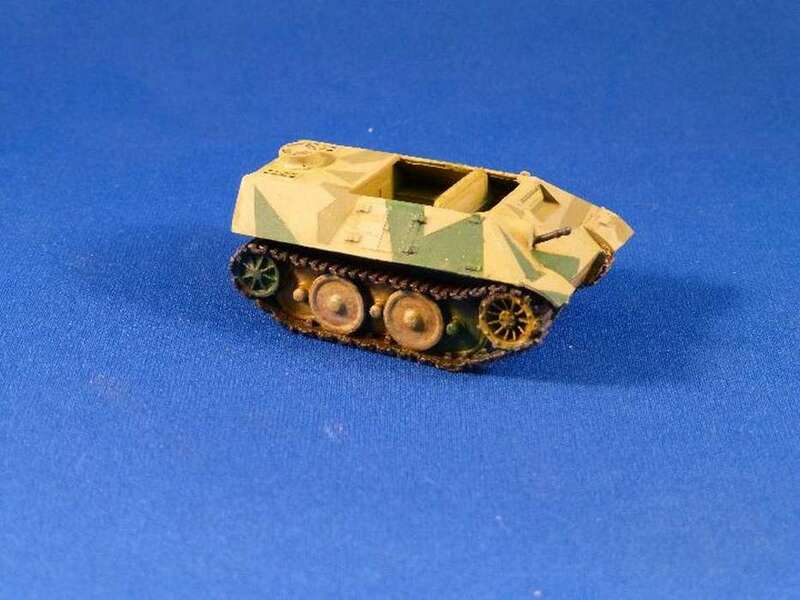 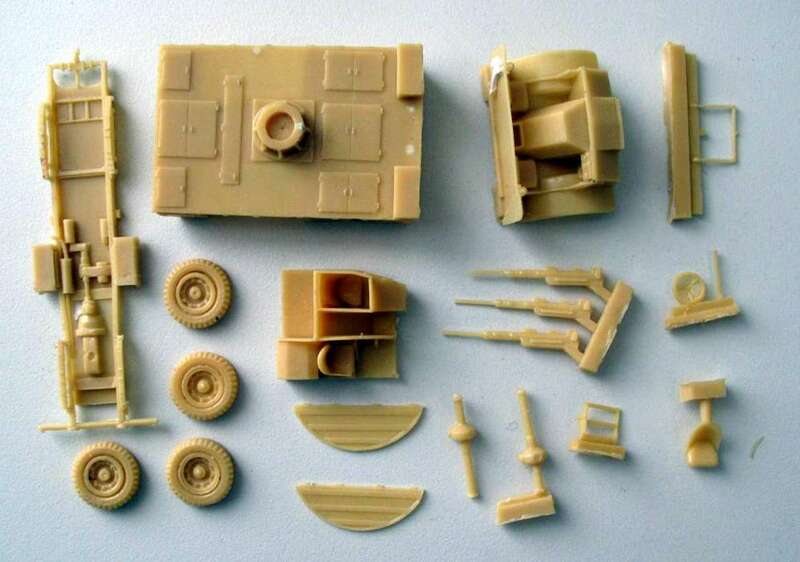 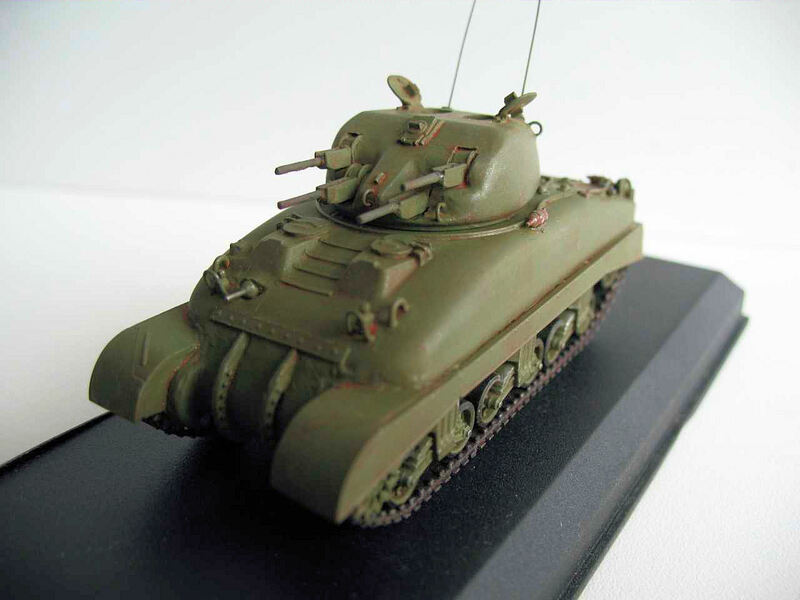 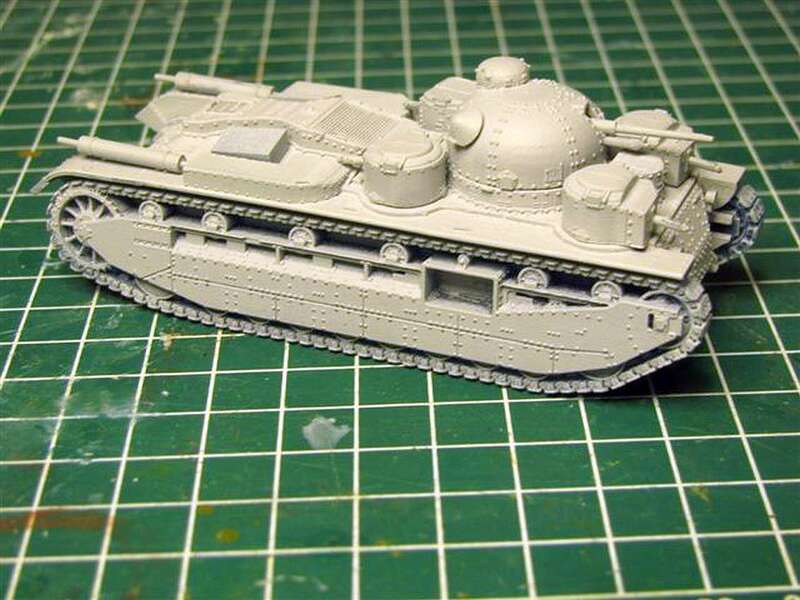 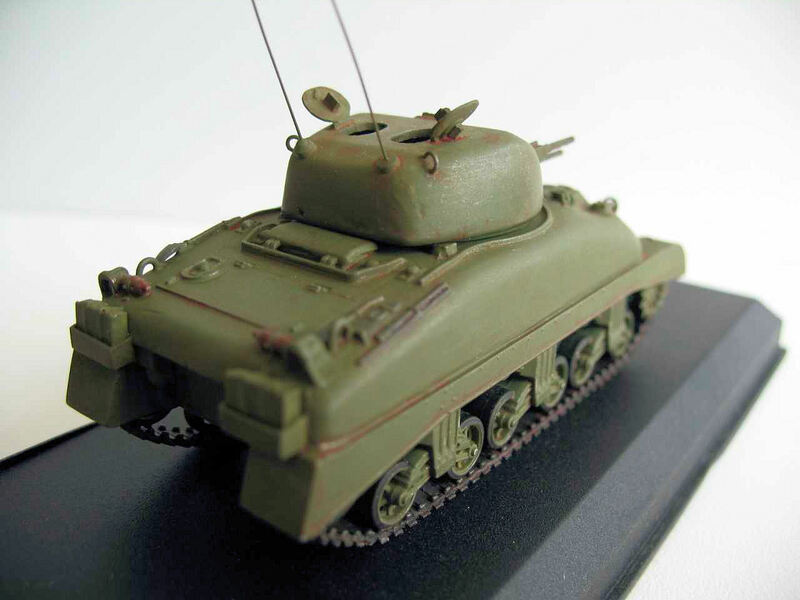 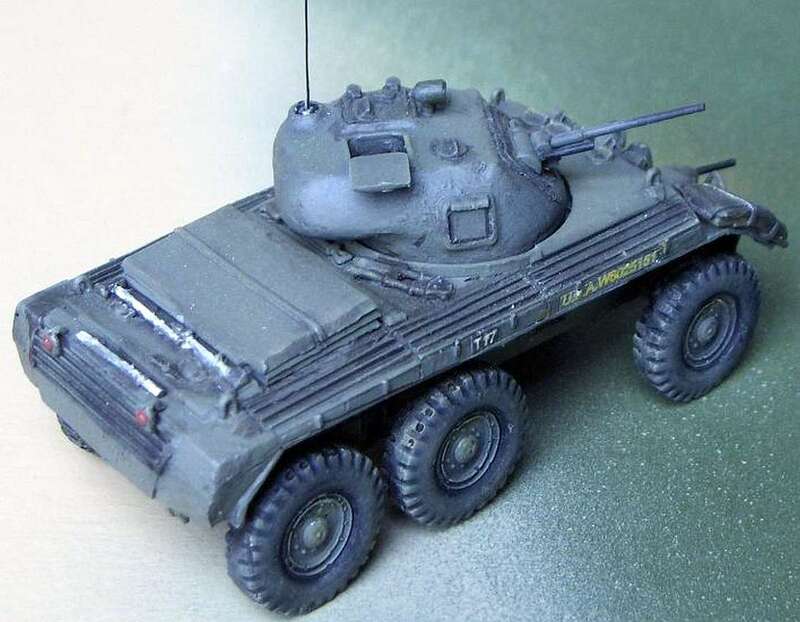 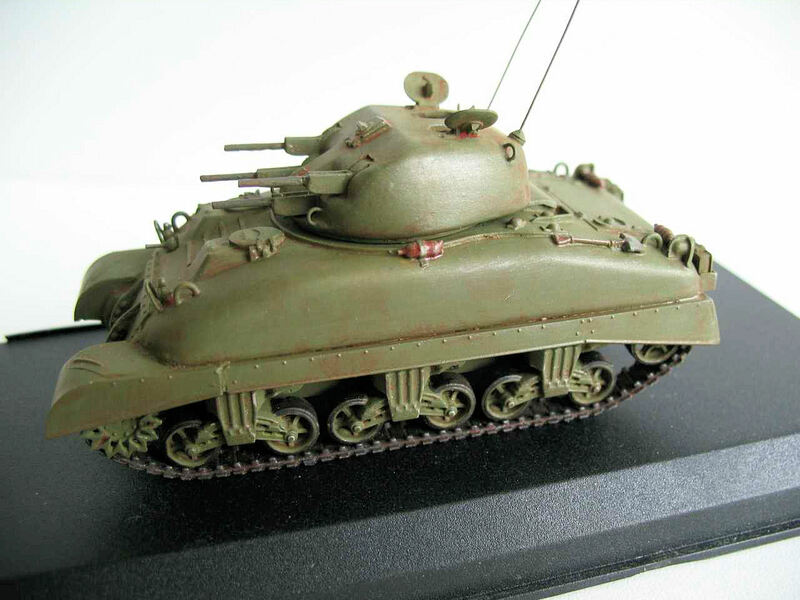 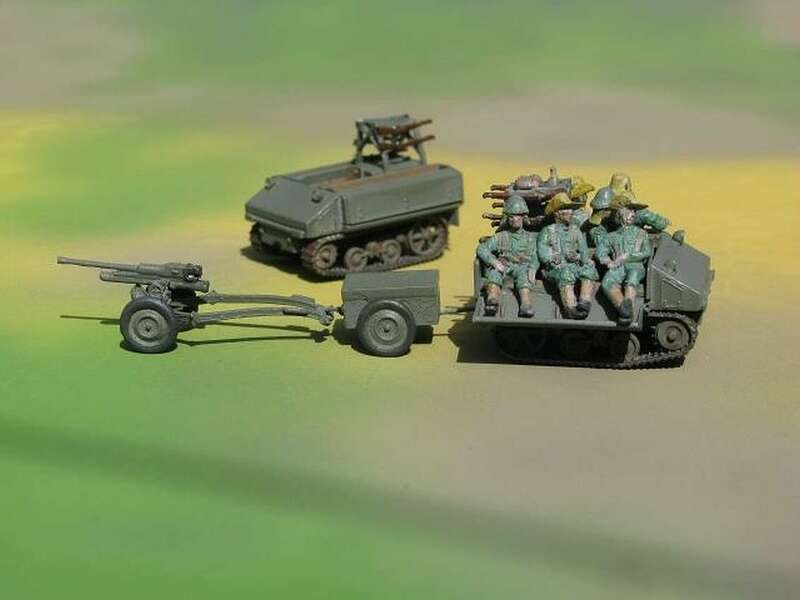 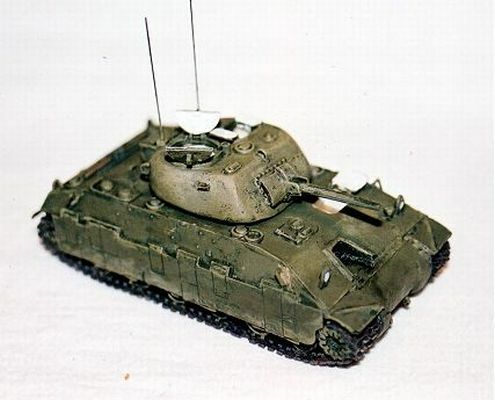 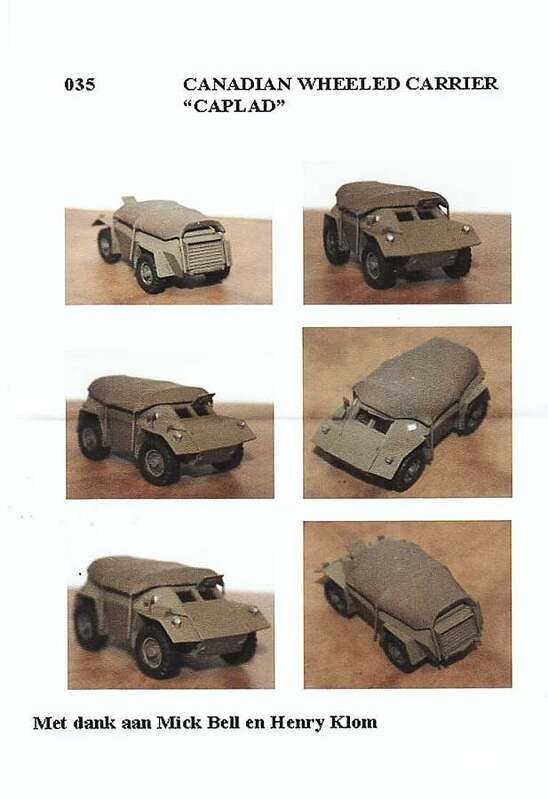 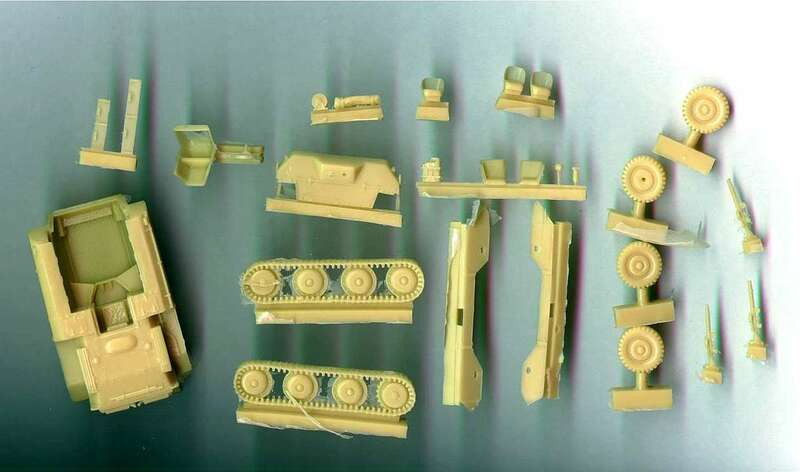 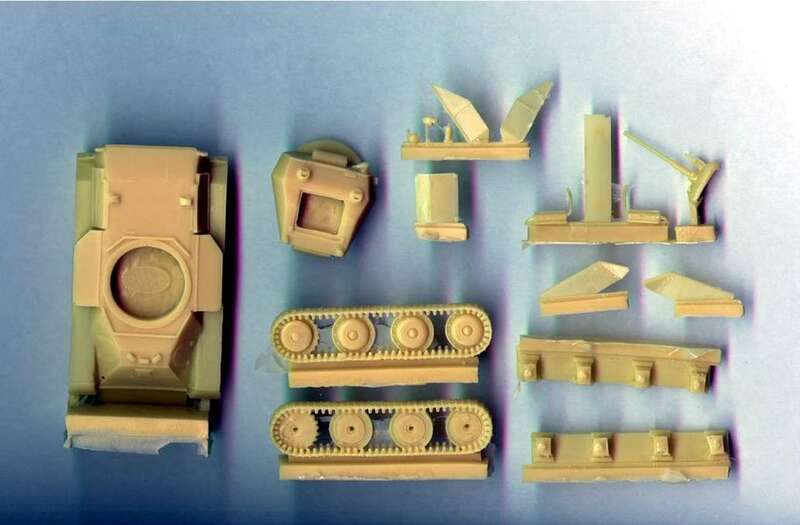 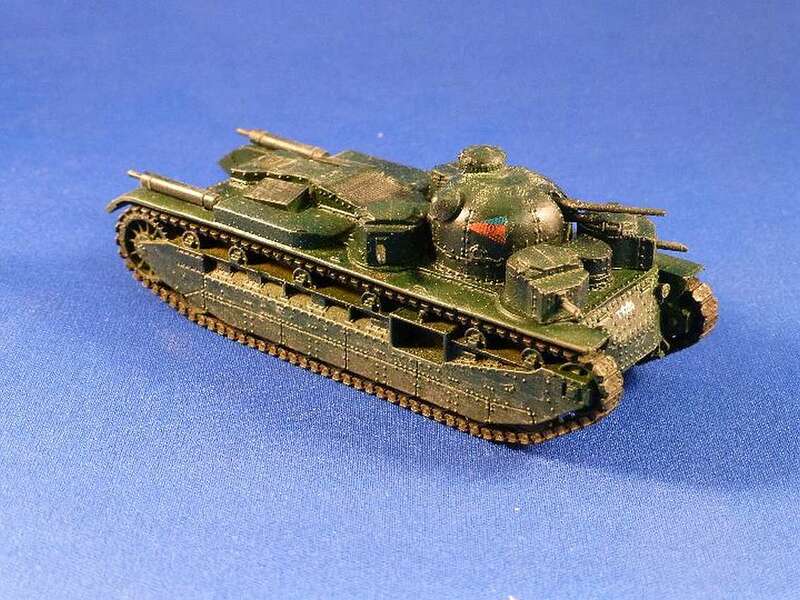 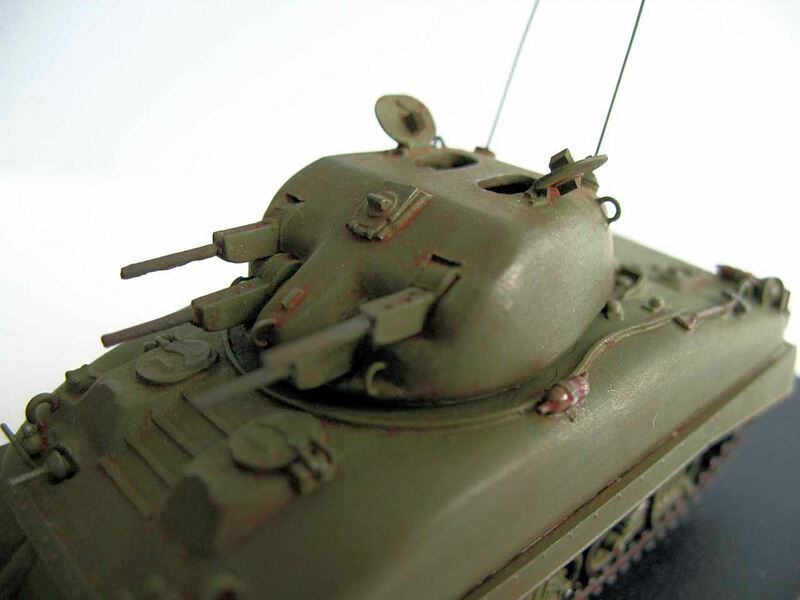 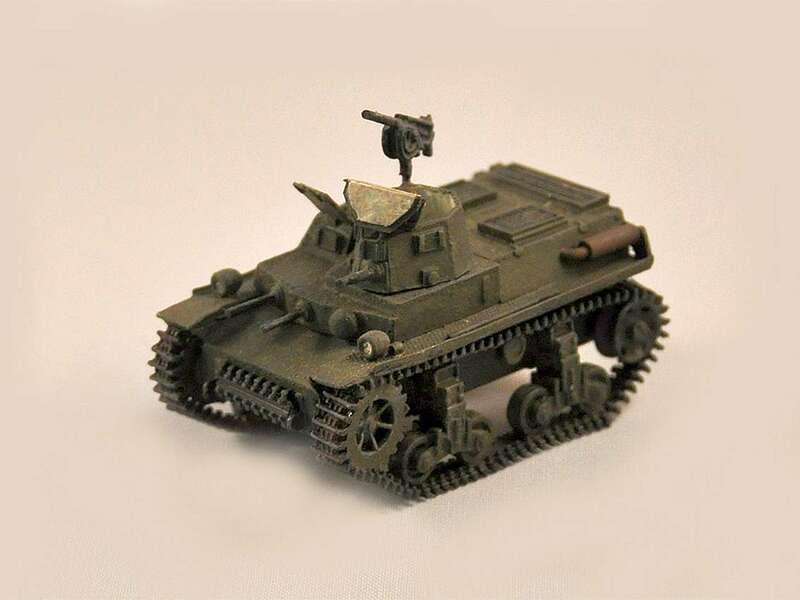 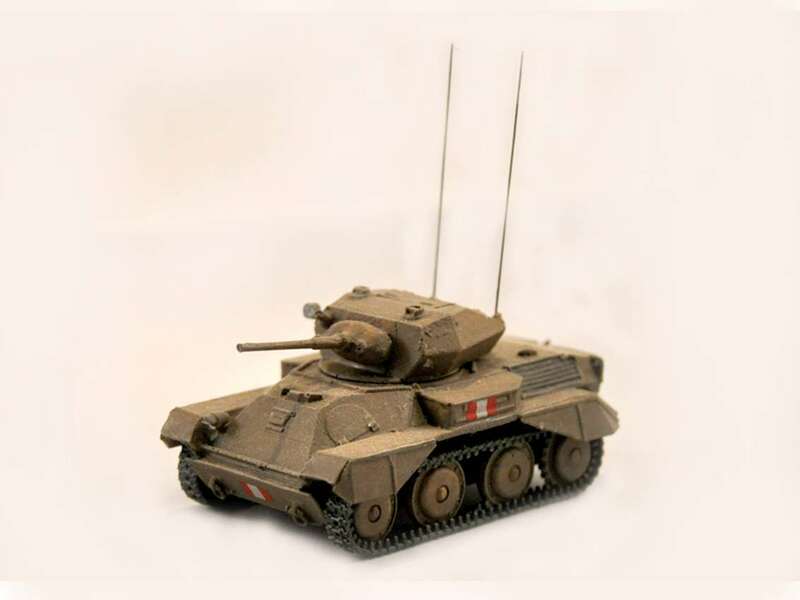 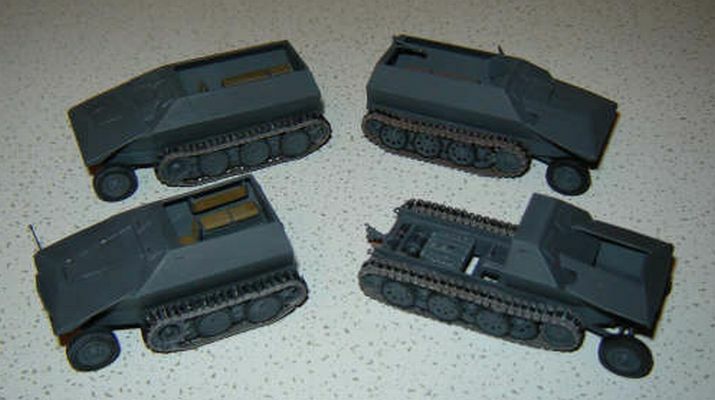 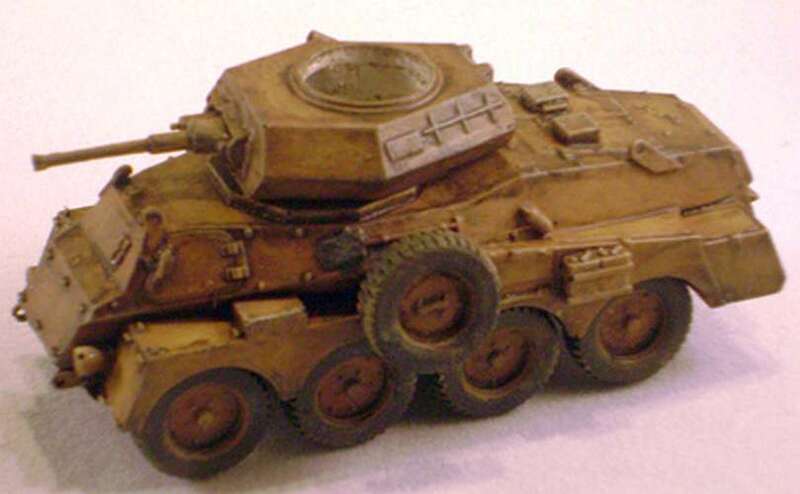 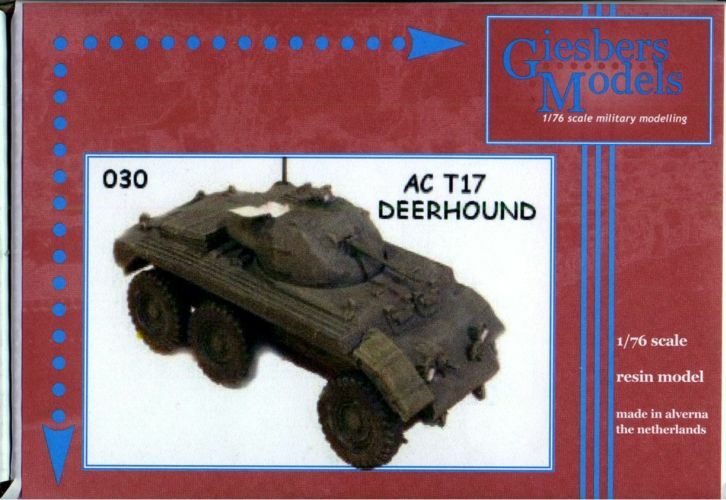 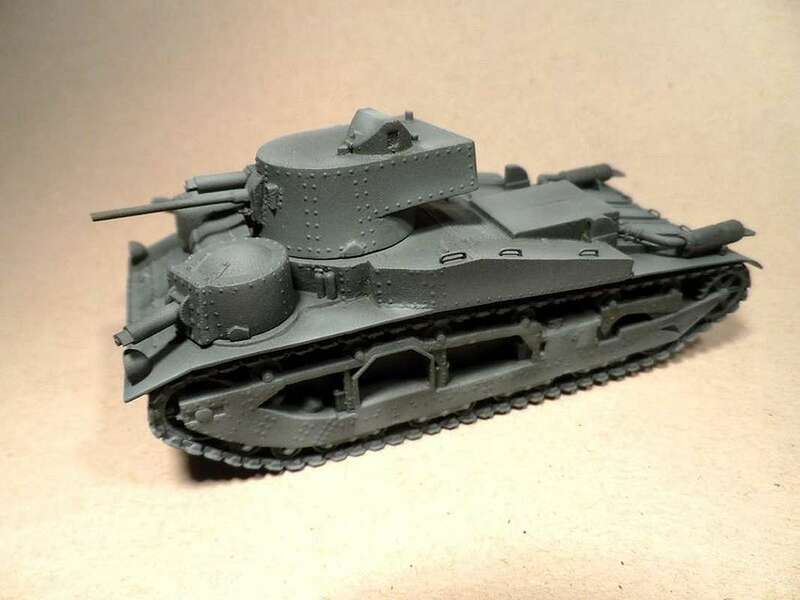 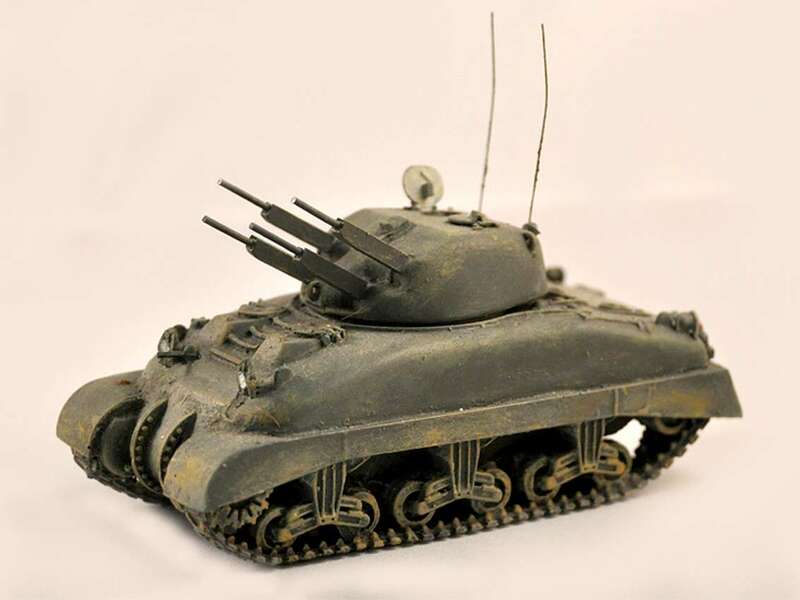 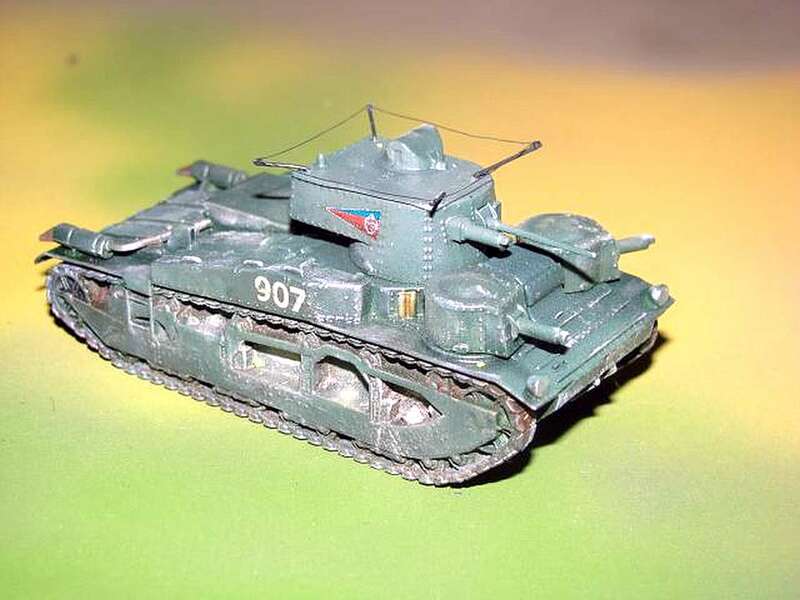 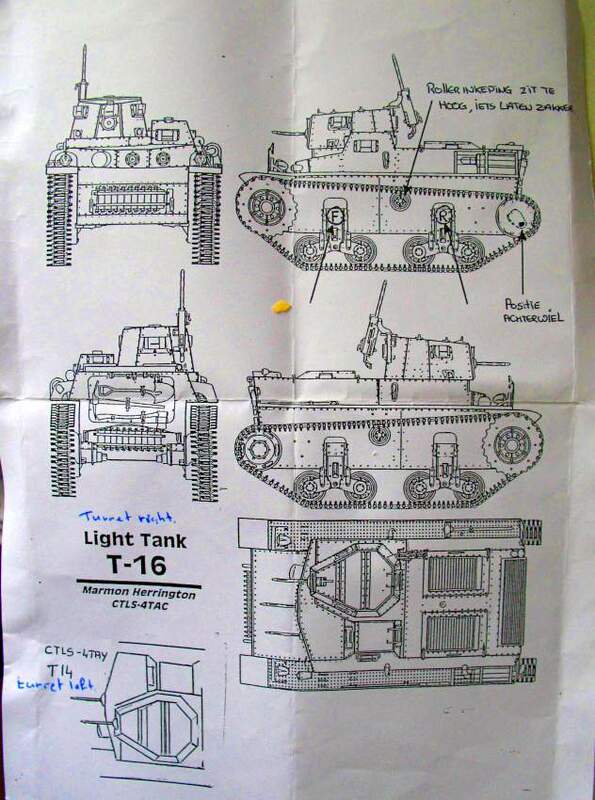 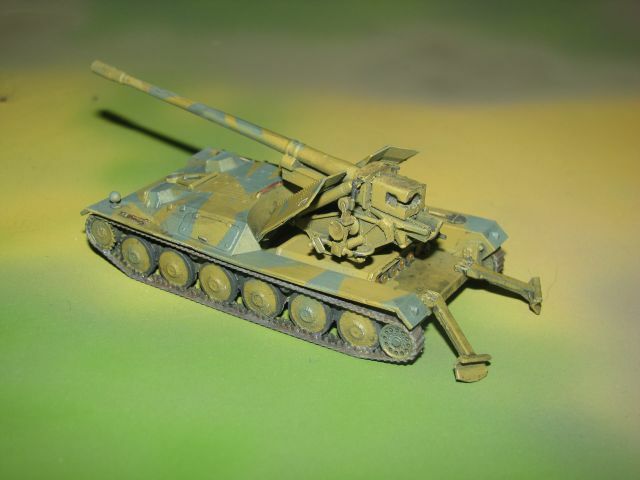 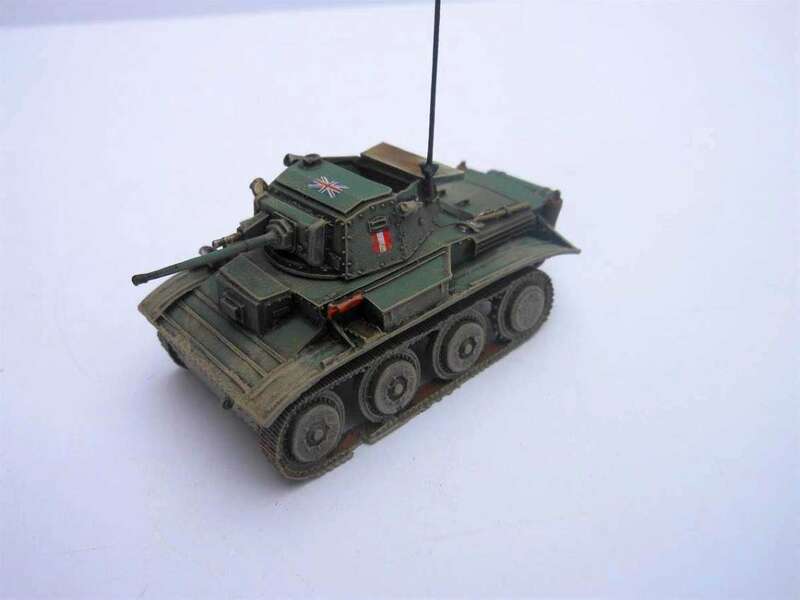 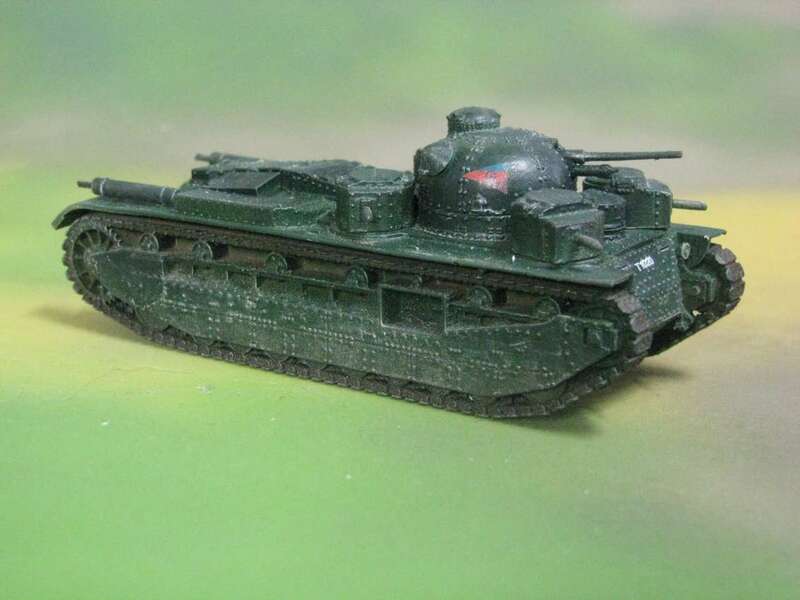 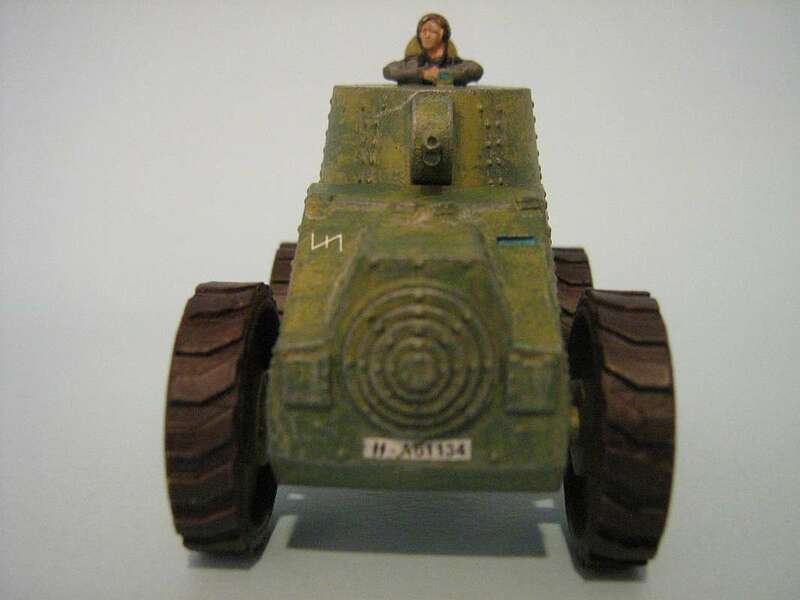 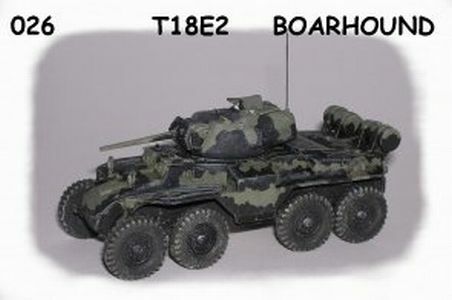 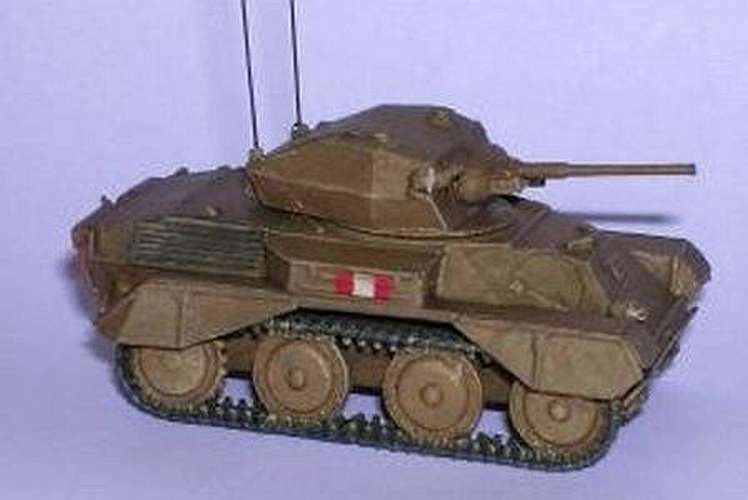 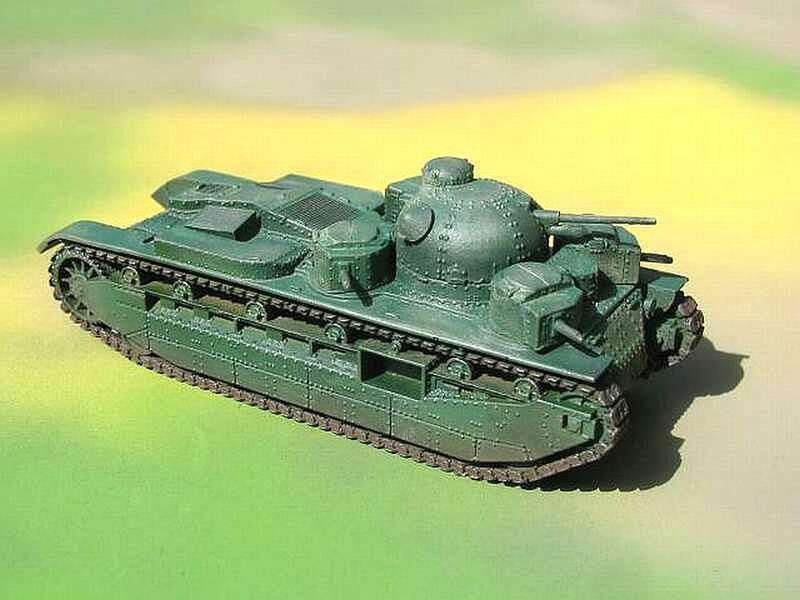 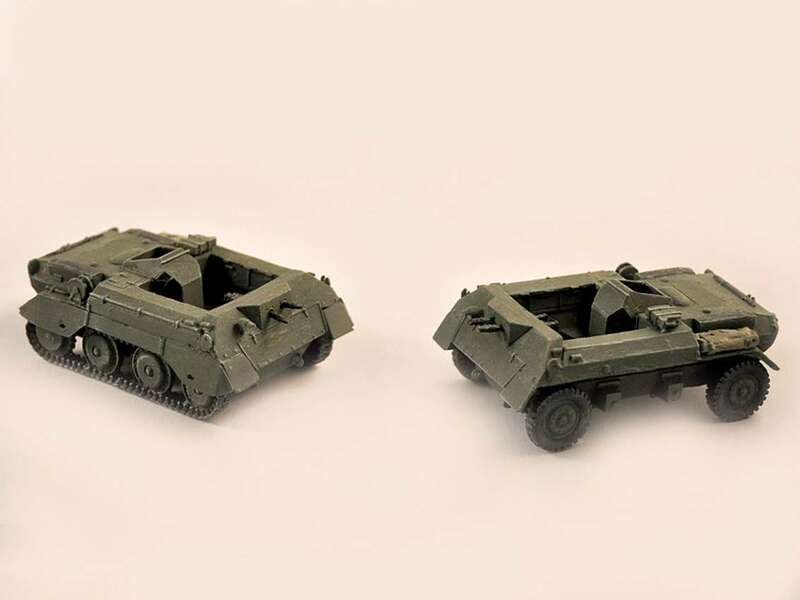 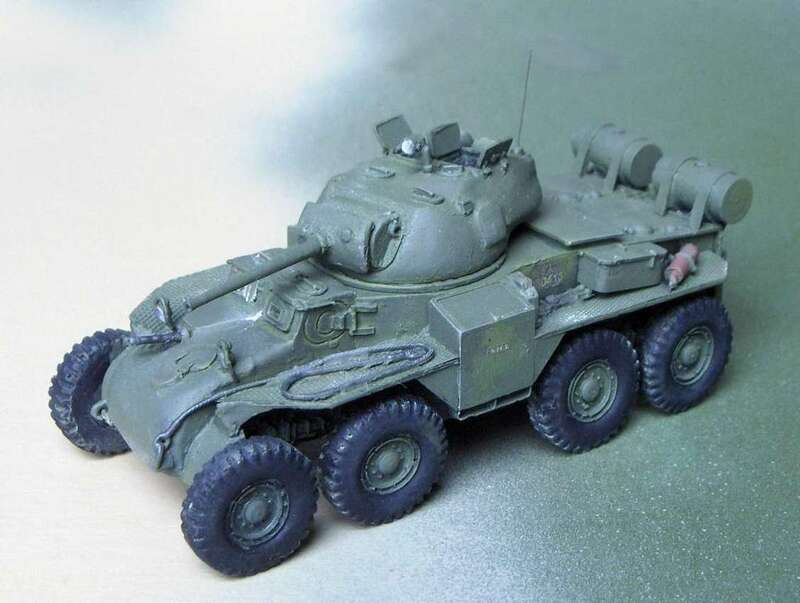 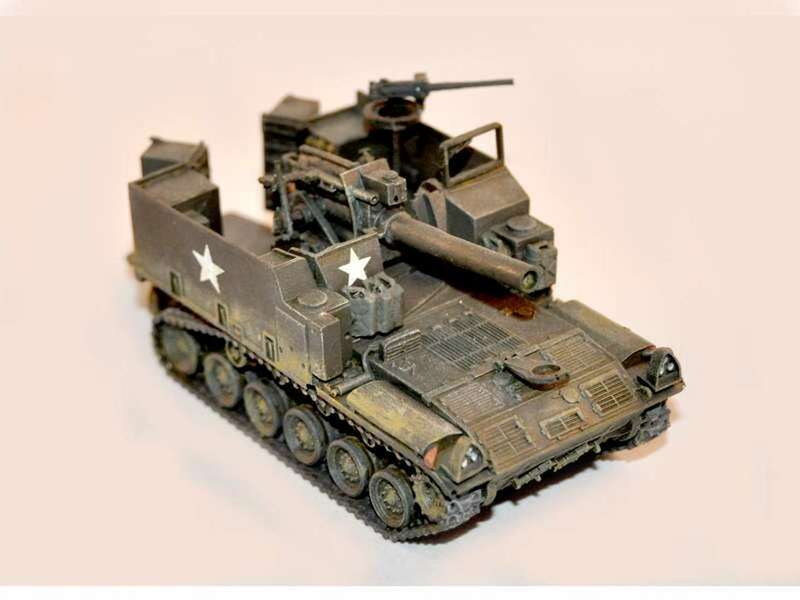 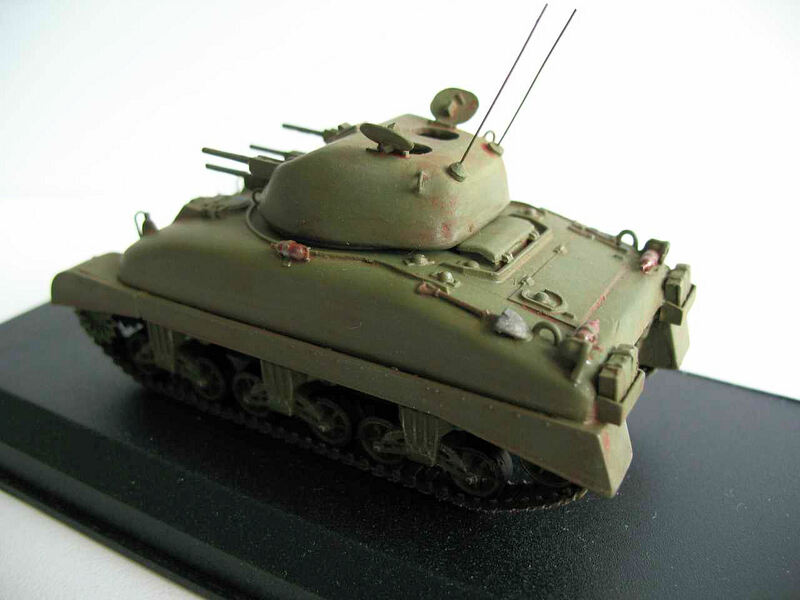 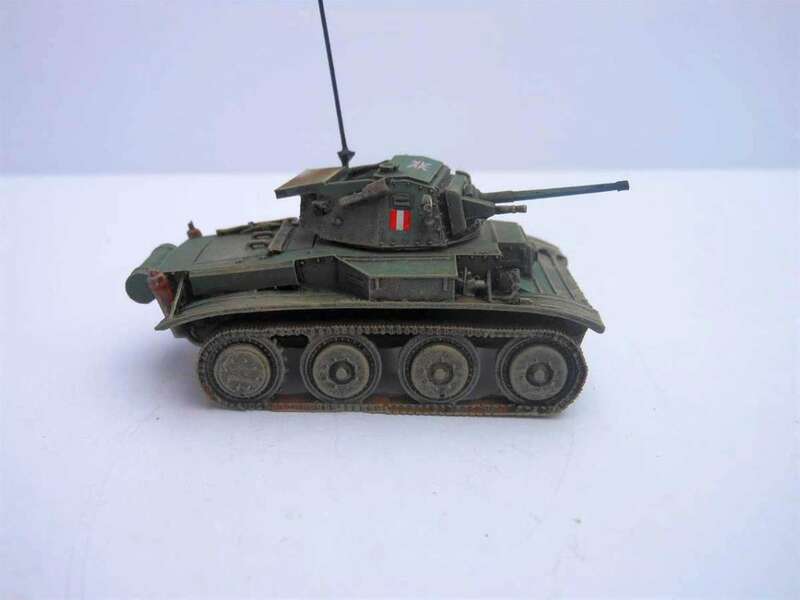 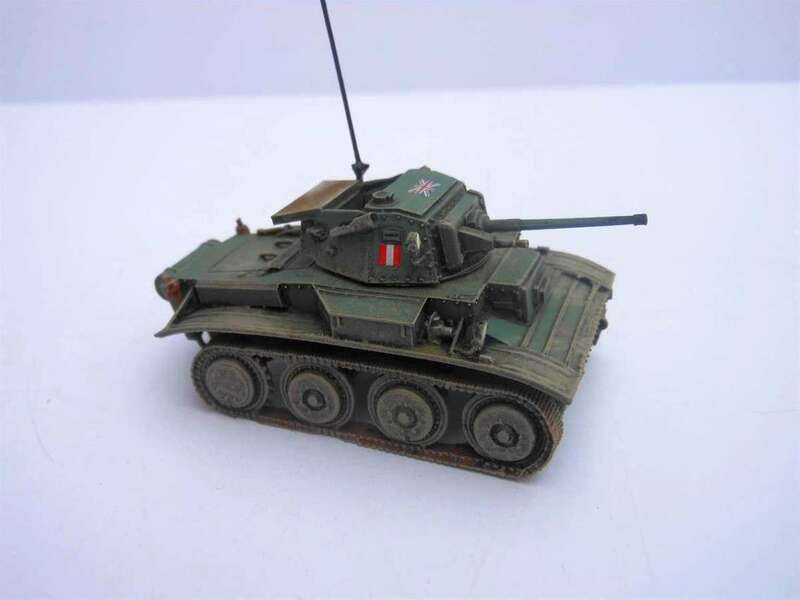 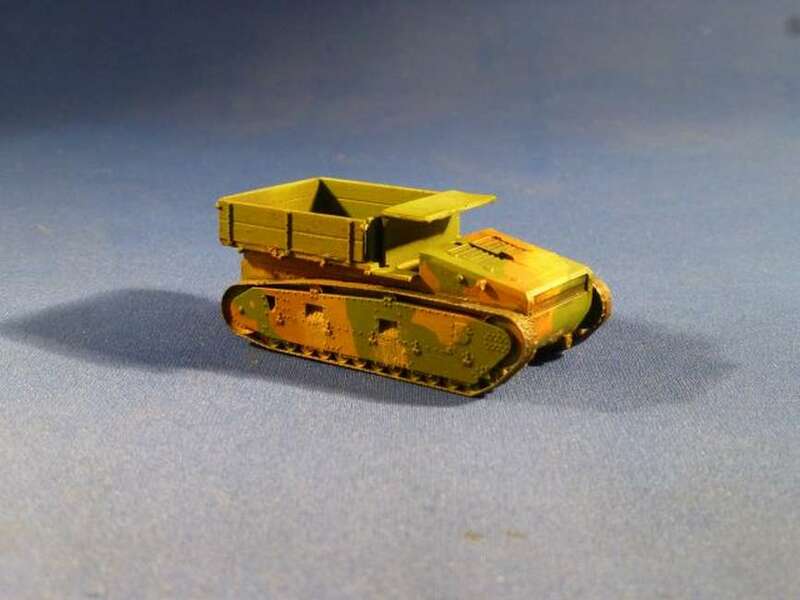 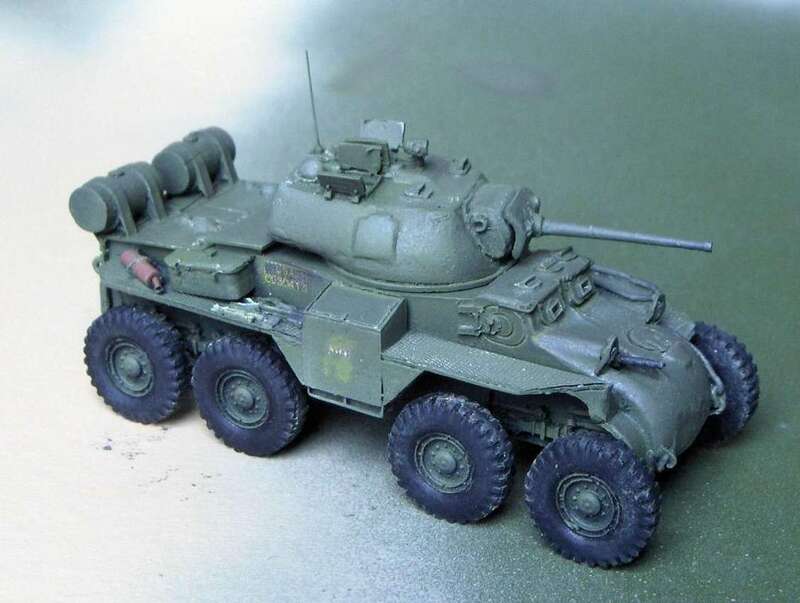 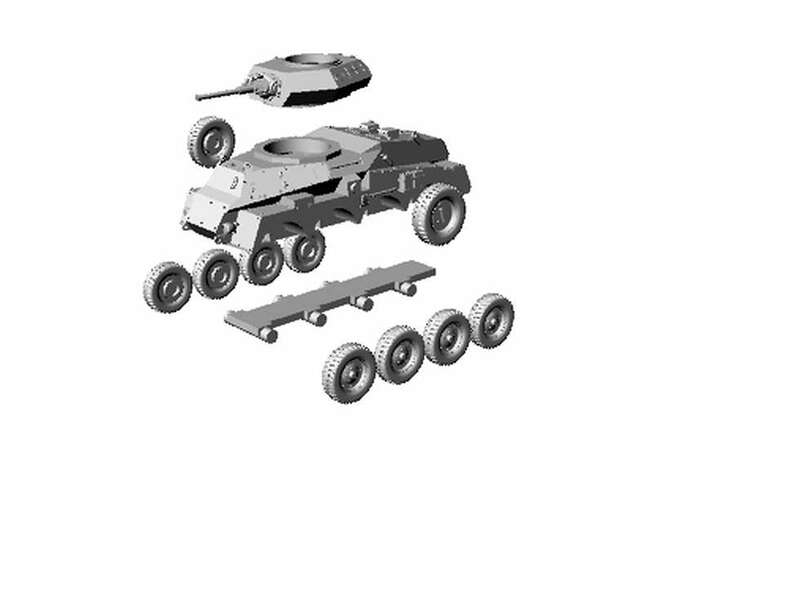 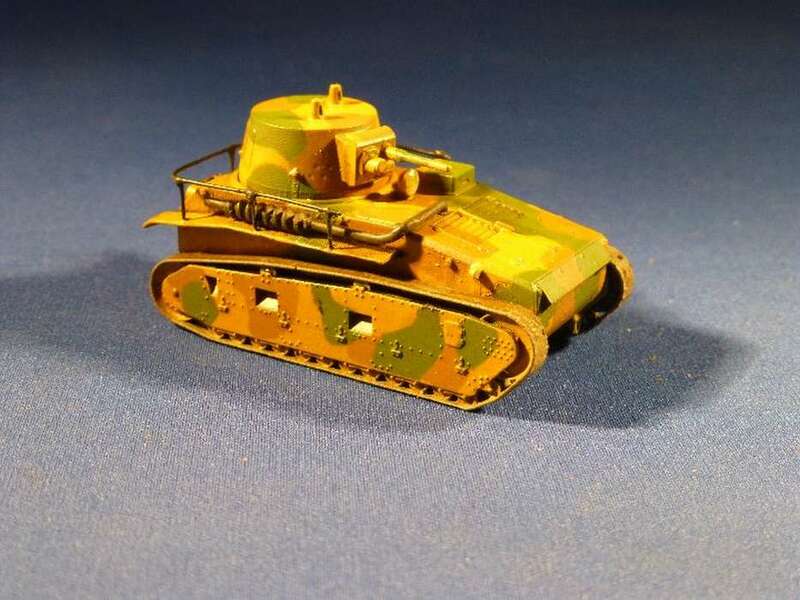 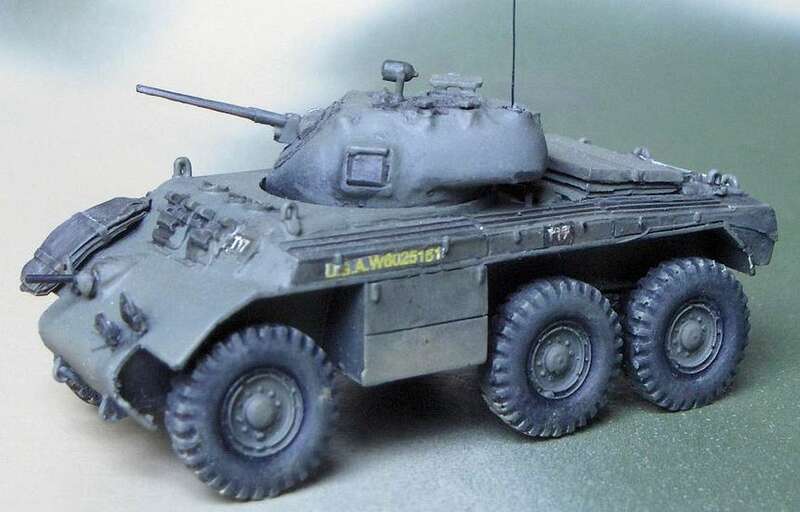 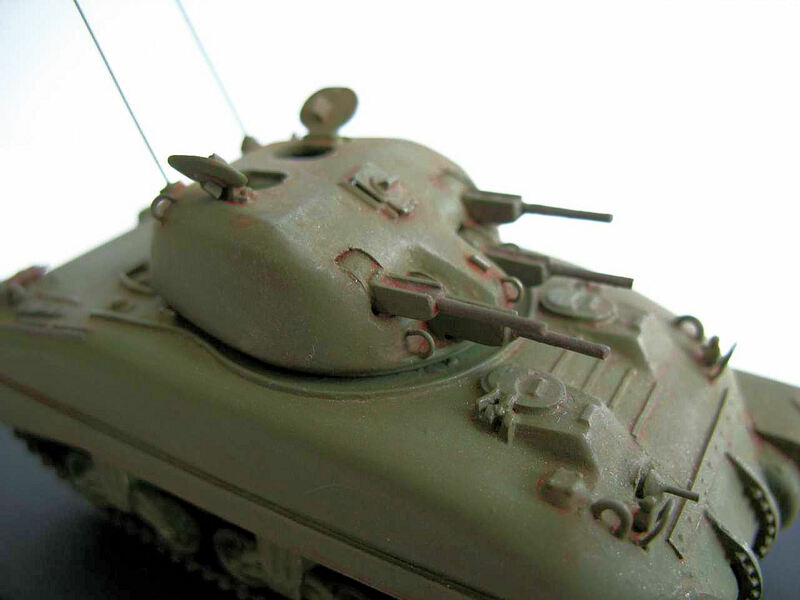 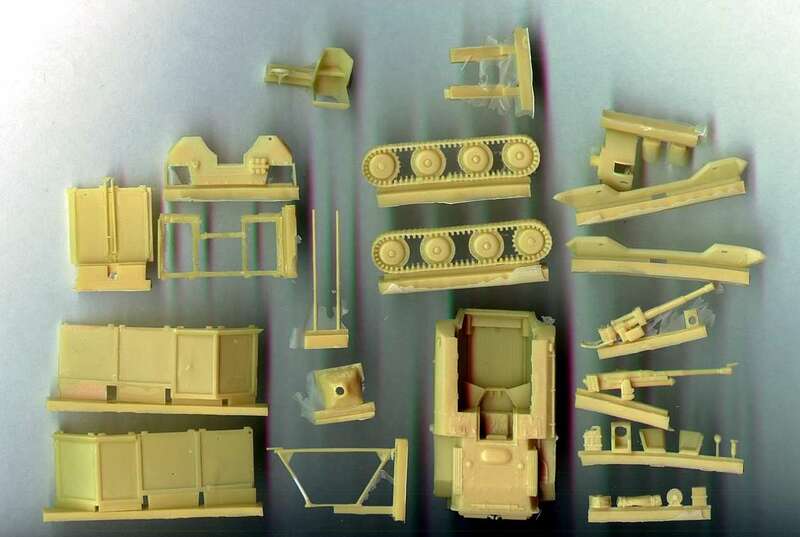 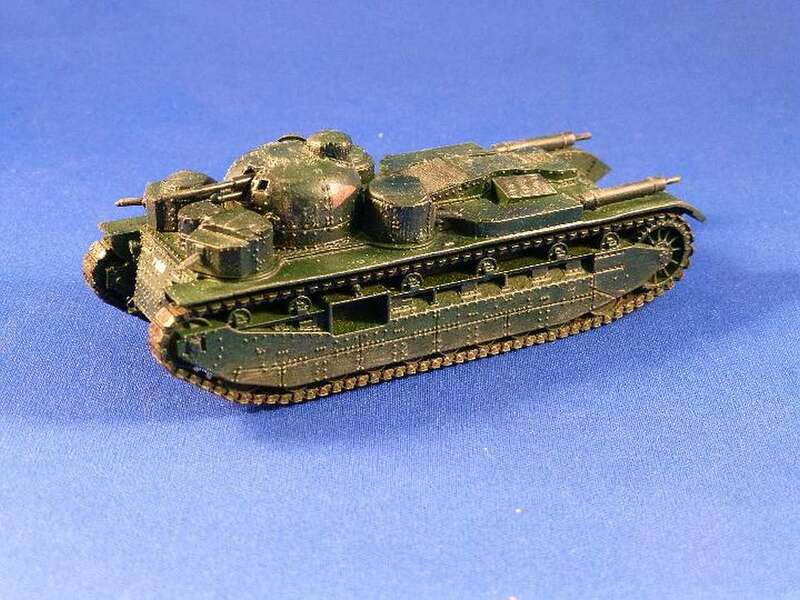 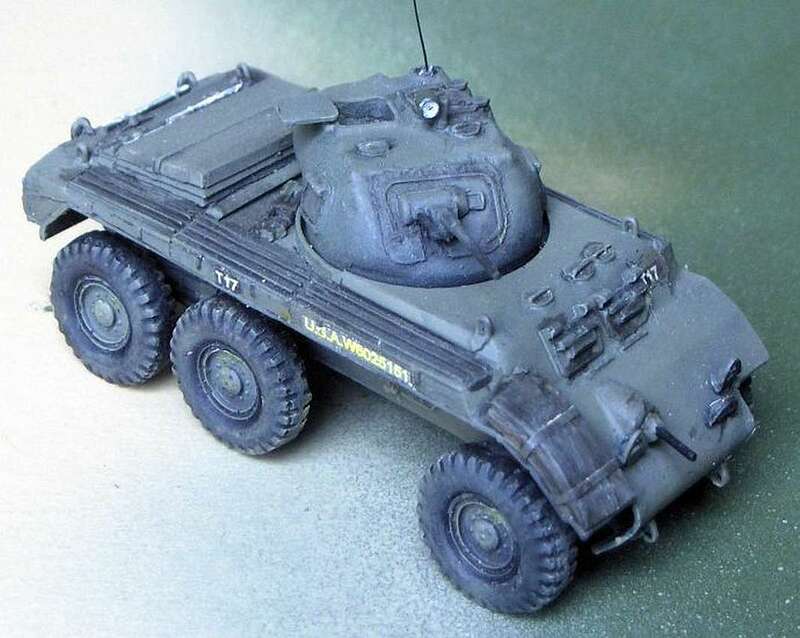 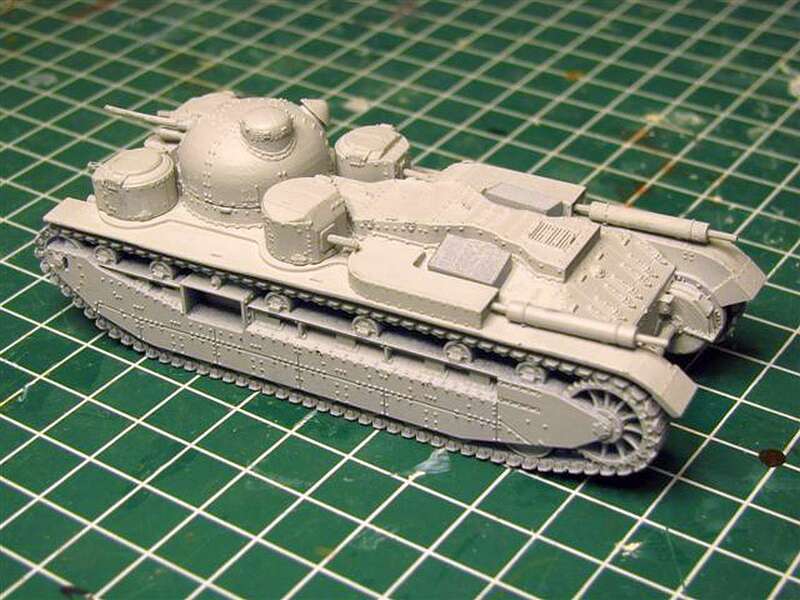 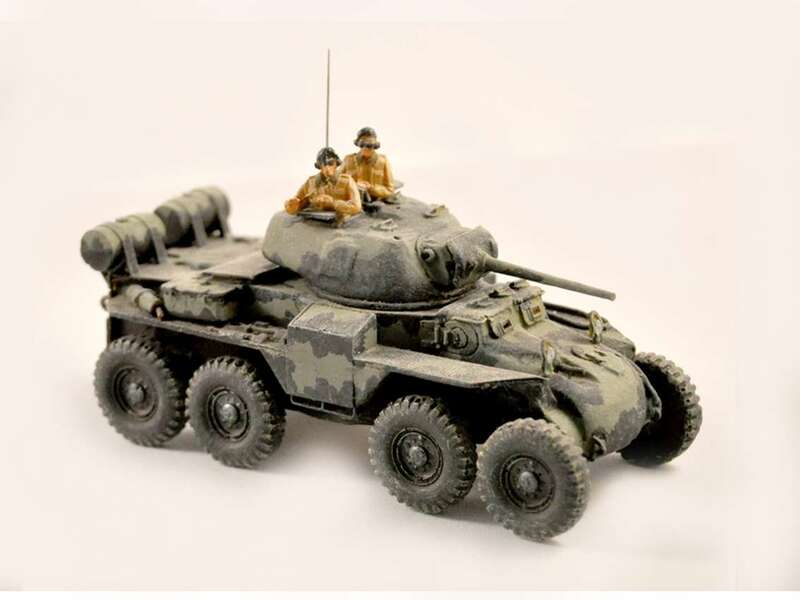 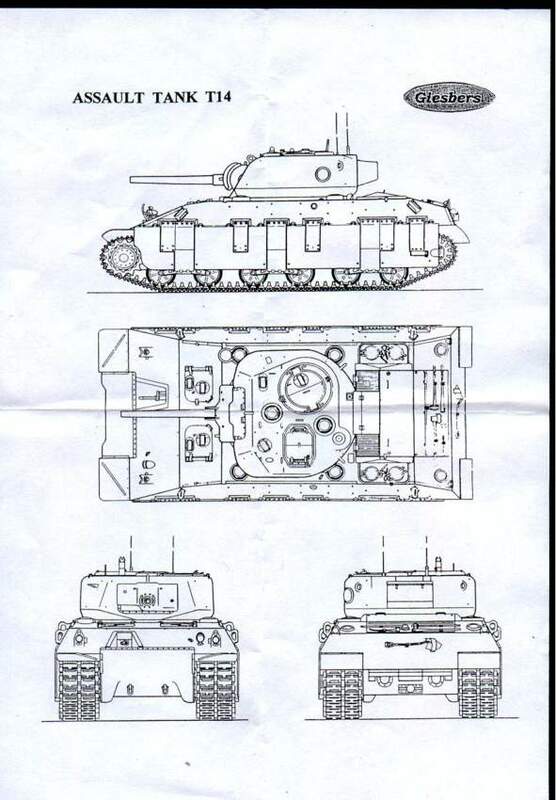 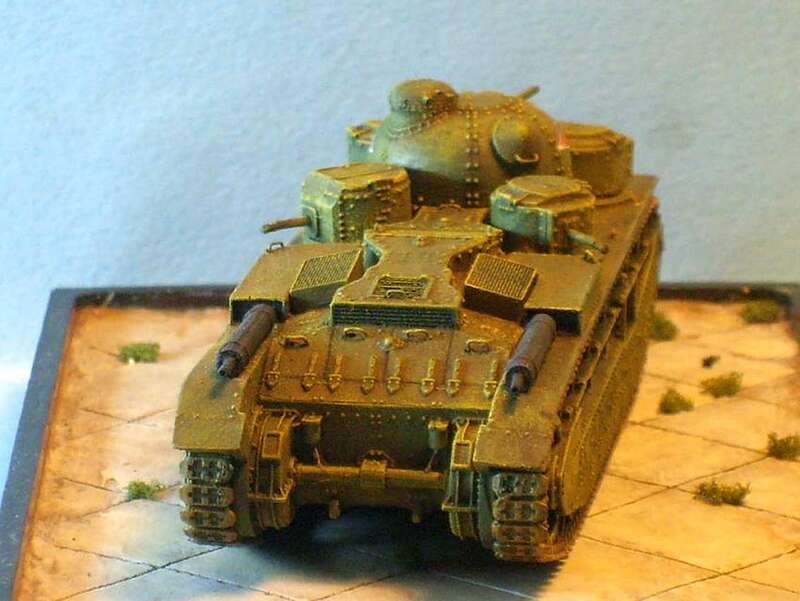 Together with Milicast's M19 AA vehicle and M41 Gorilla and Hasegawa/Matchbox Chaffee tank this makes the light combat team based on the M24 Chaffee complete. 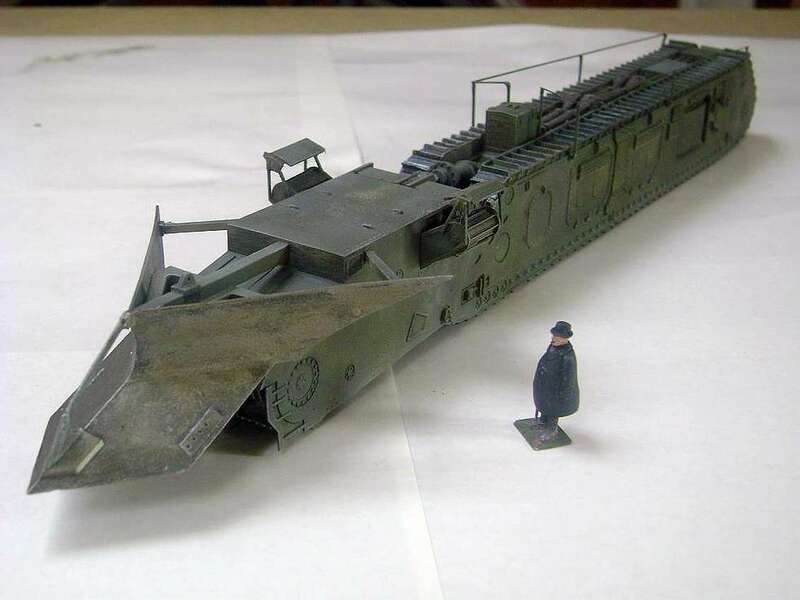 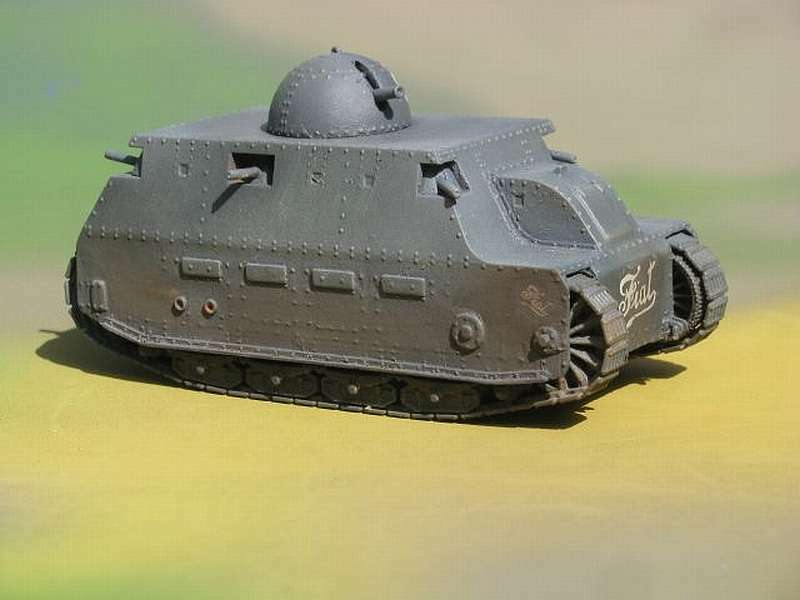 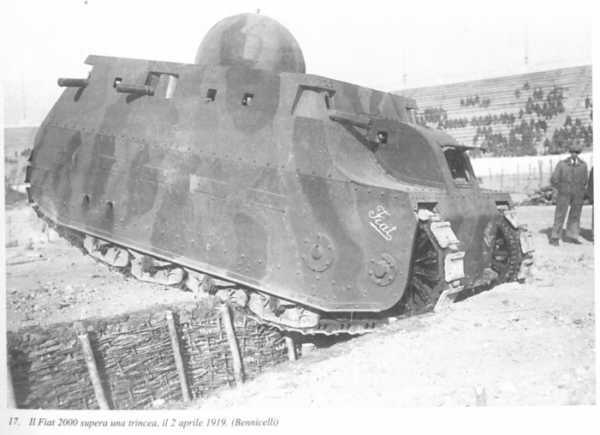 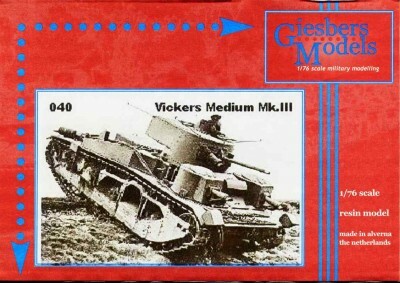 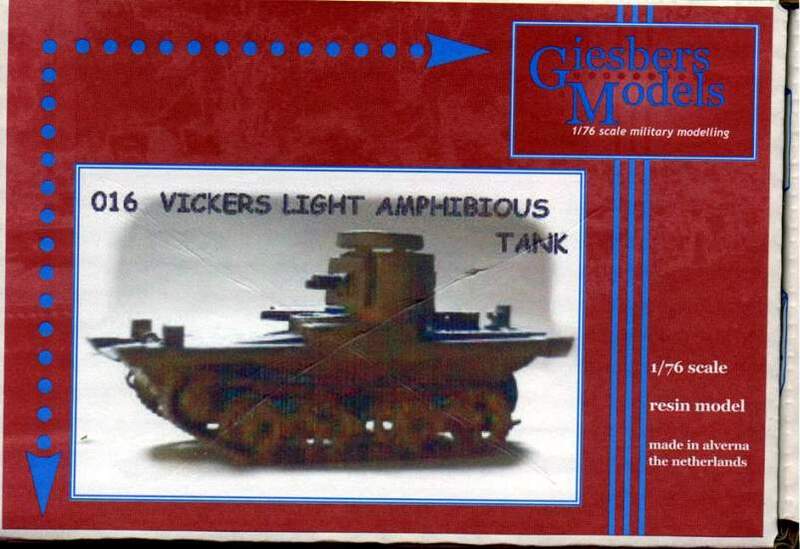 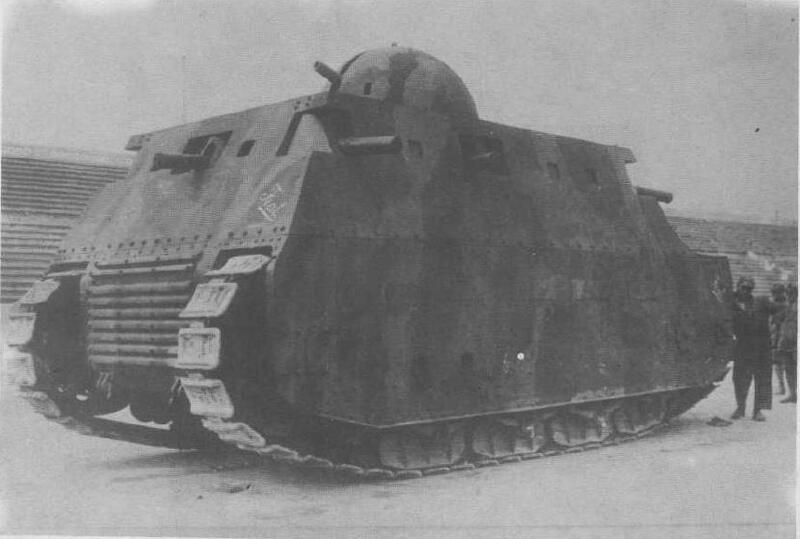 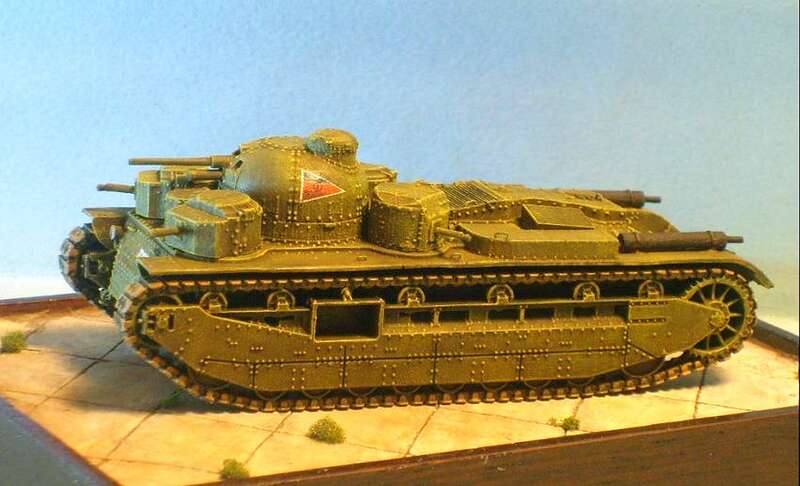 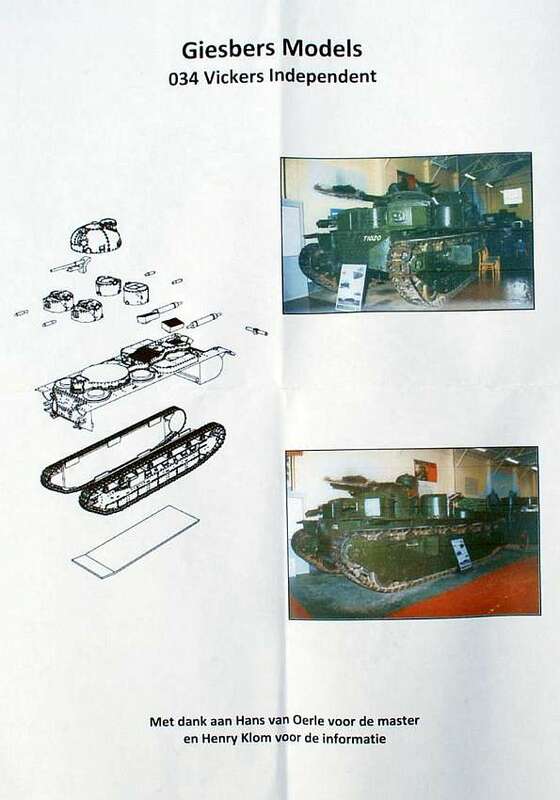 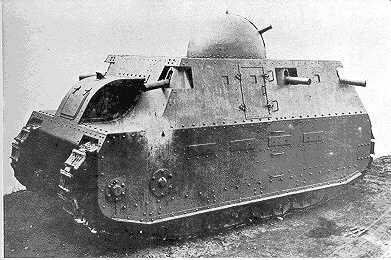 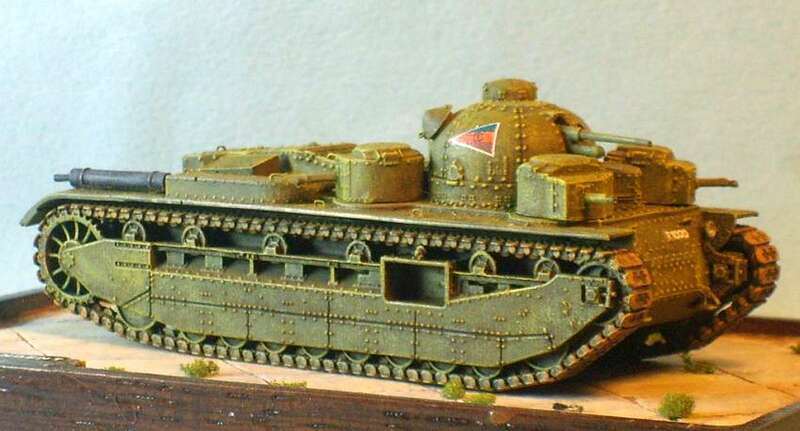 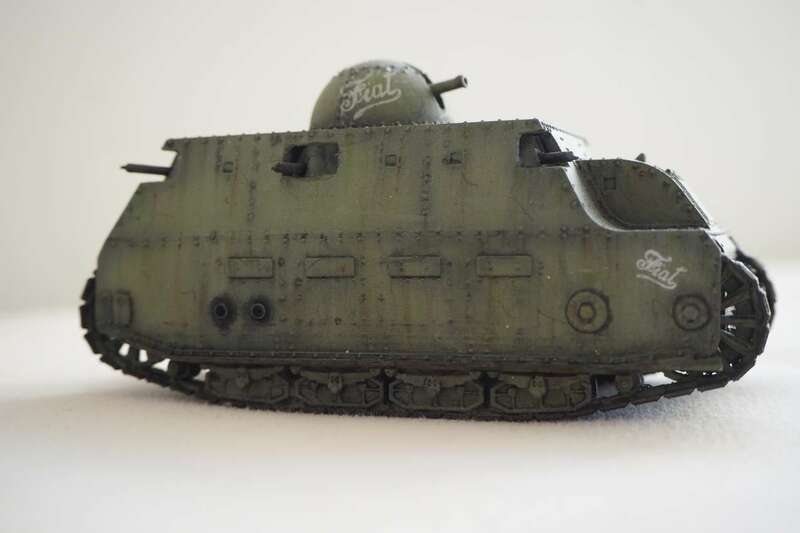 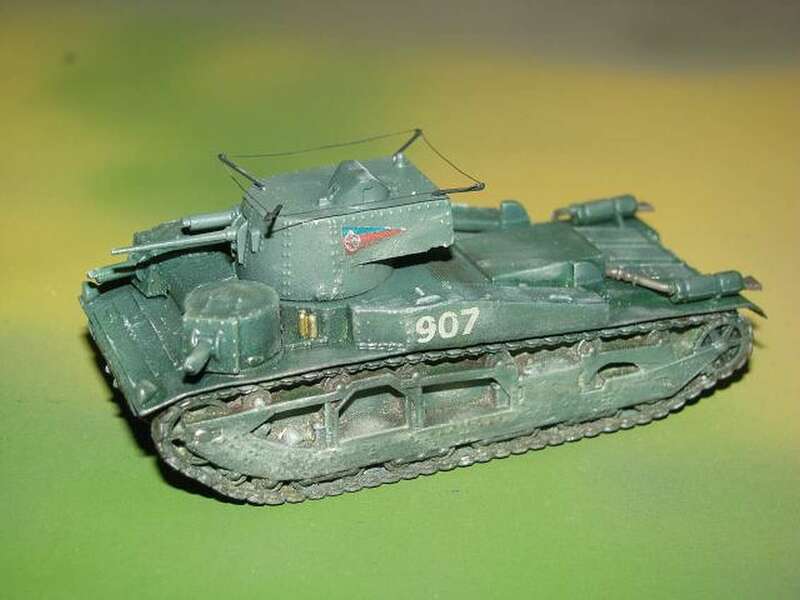 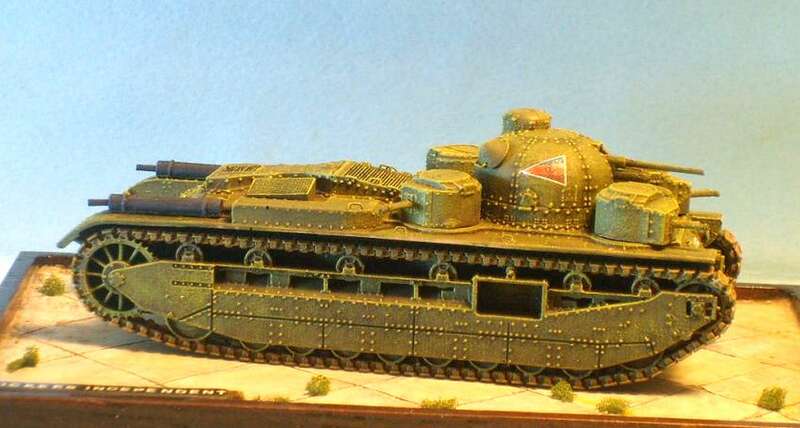 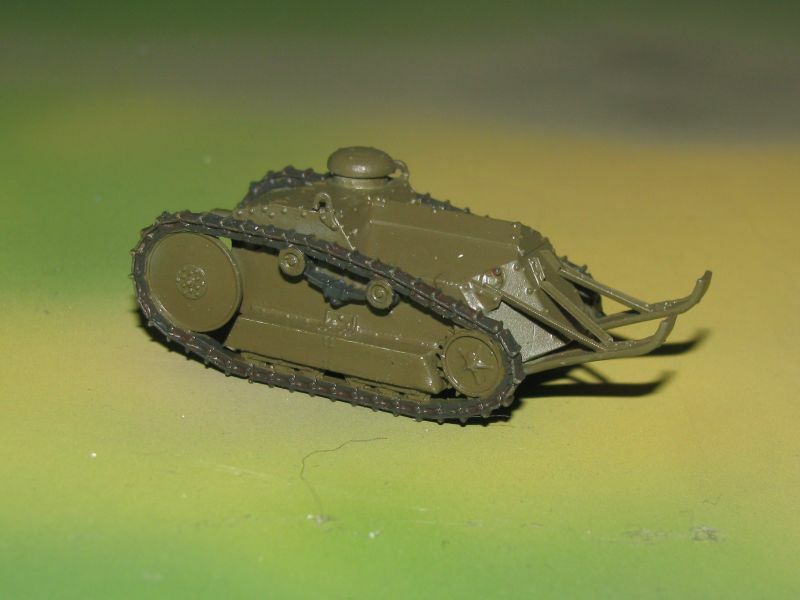 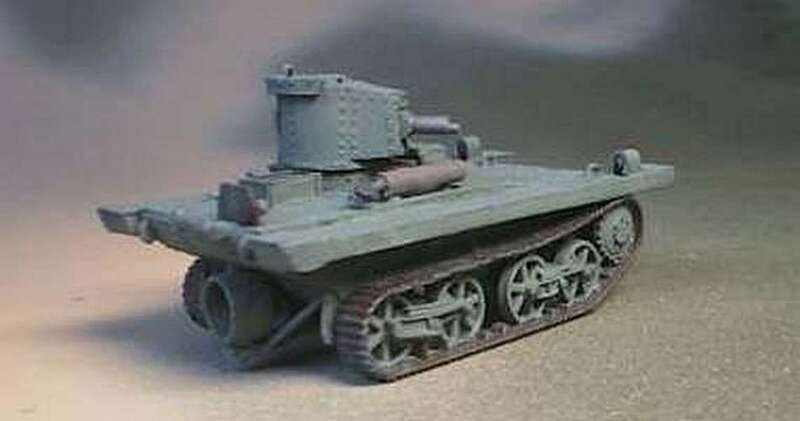 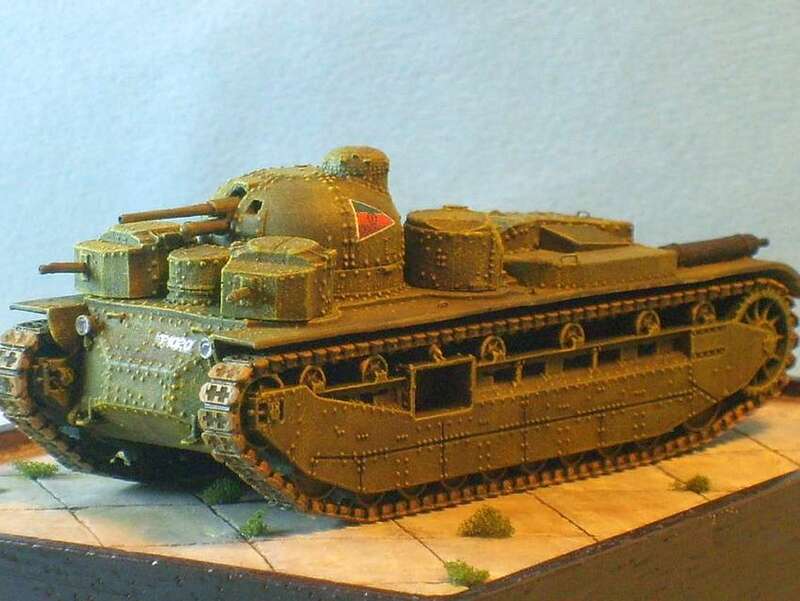 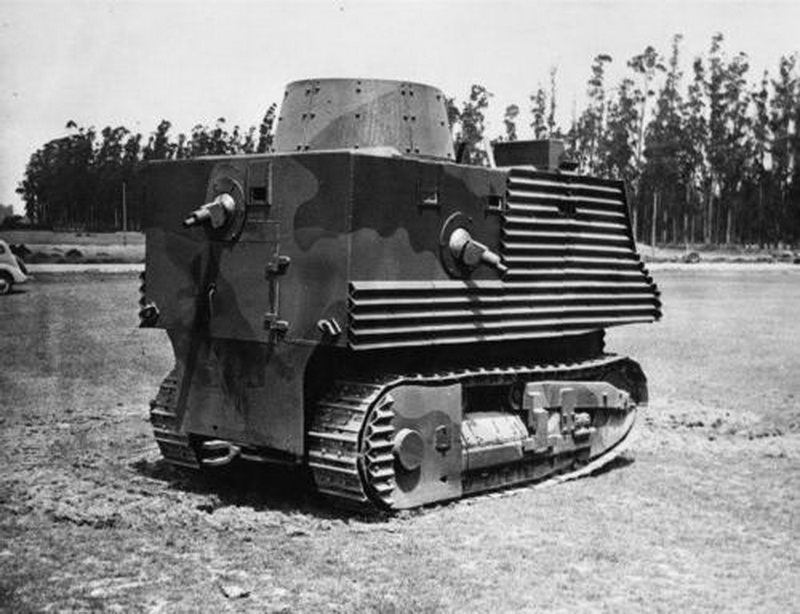 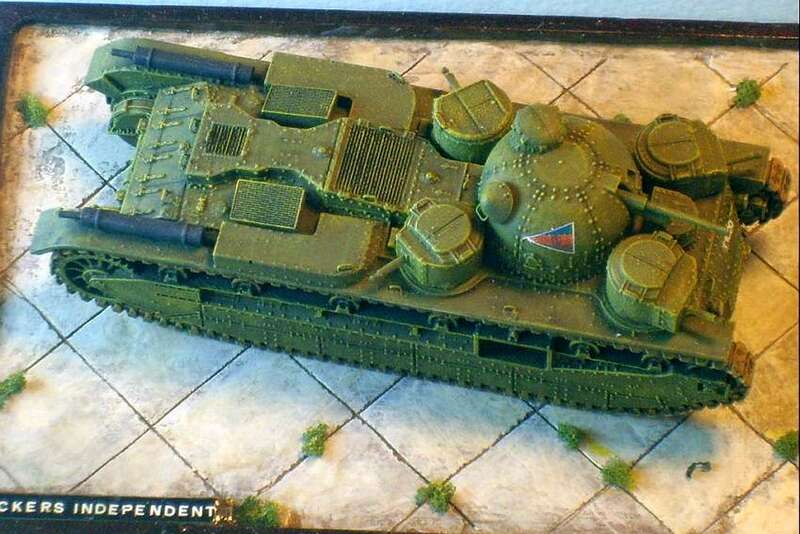 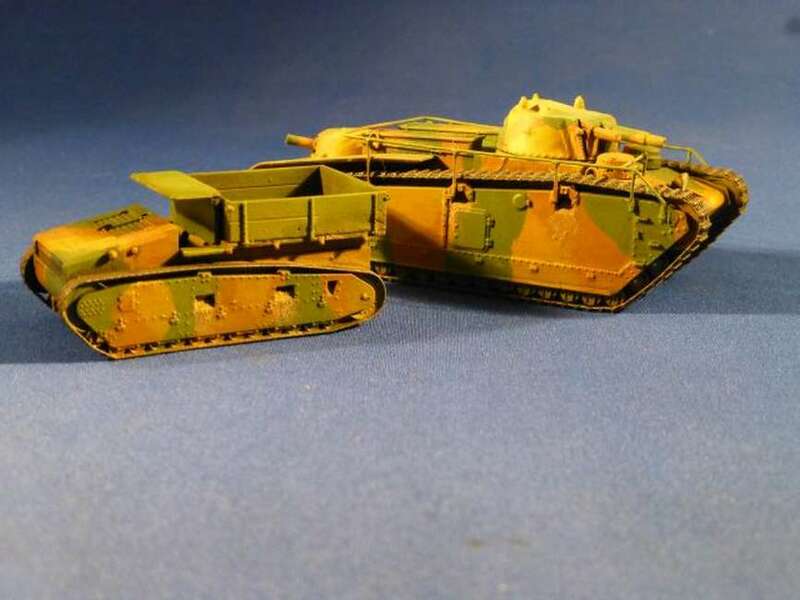 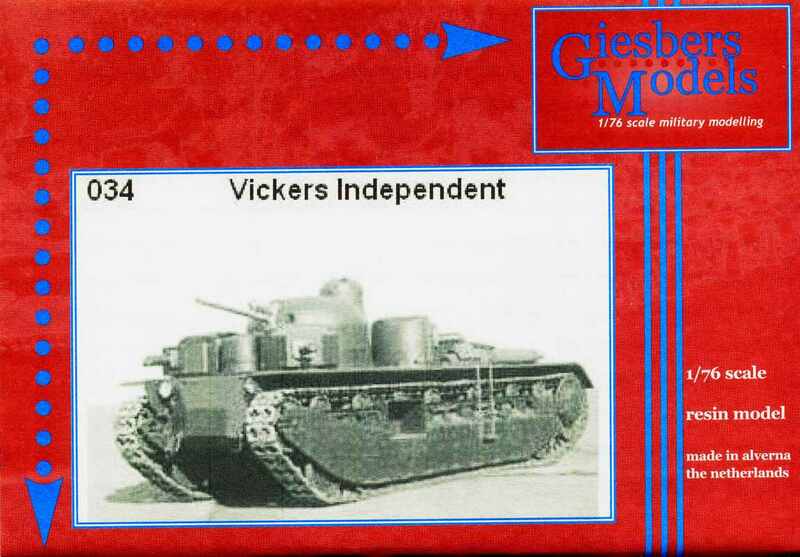 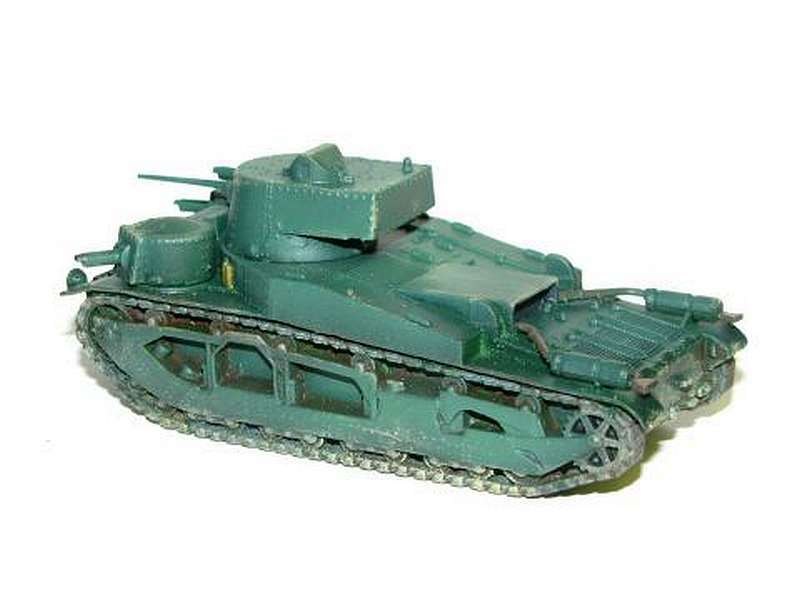 The Vickers amphibious tank was a commercial design, it was used by the Chinese and also bought/copied by the USSR. 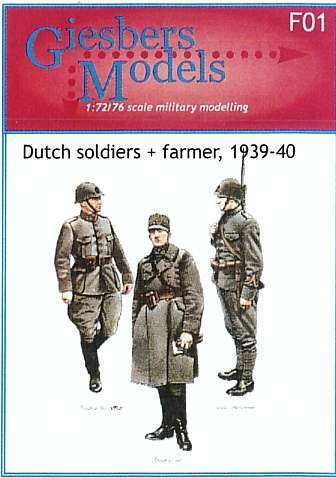 This is the Dutch version as used in very small numbers by the KNIL- the Dutch East Indies Army. 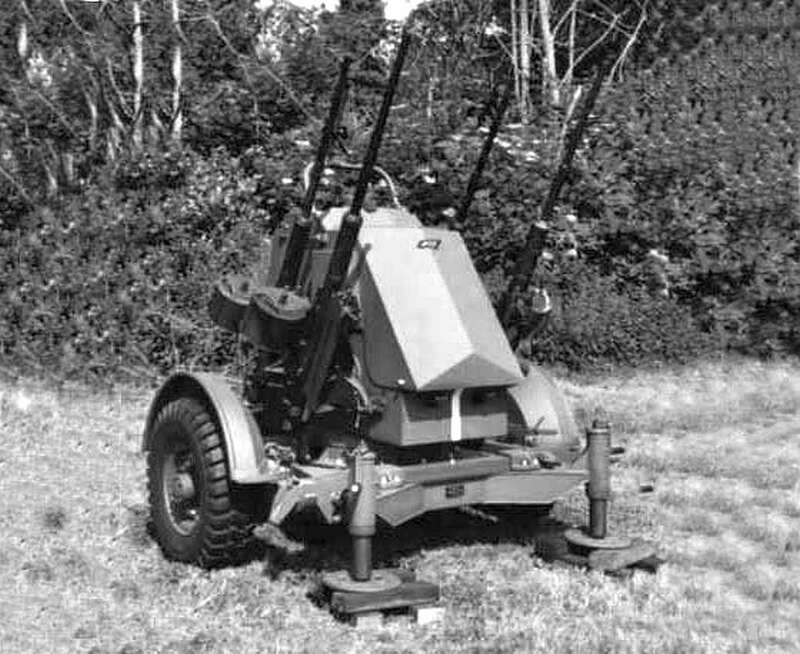 The British firm of Vickers designed this Anti-Aircraft gun in the early 1930's. 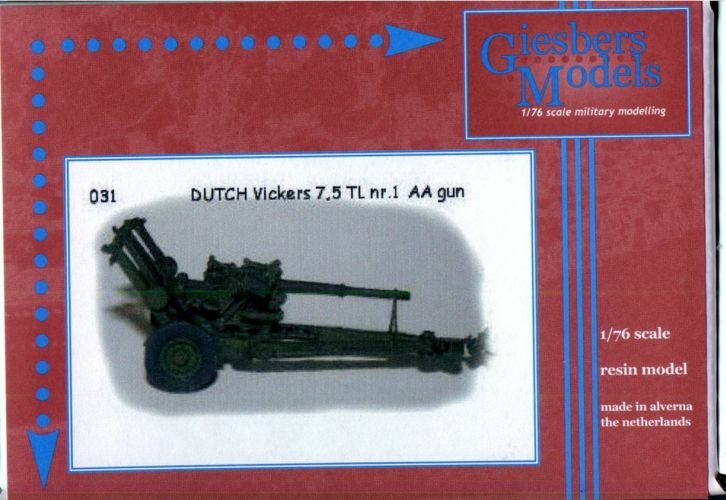 It was employed by the Dutch Army under the designation 7.5 TL, TL is an abbreviation of "Tegen Luchtdoelen" meaning anti-arial targets. 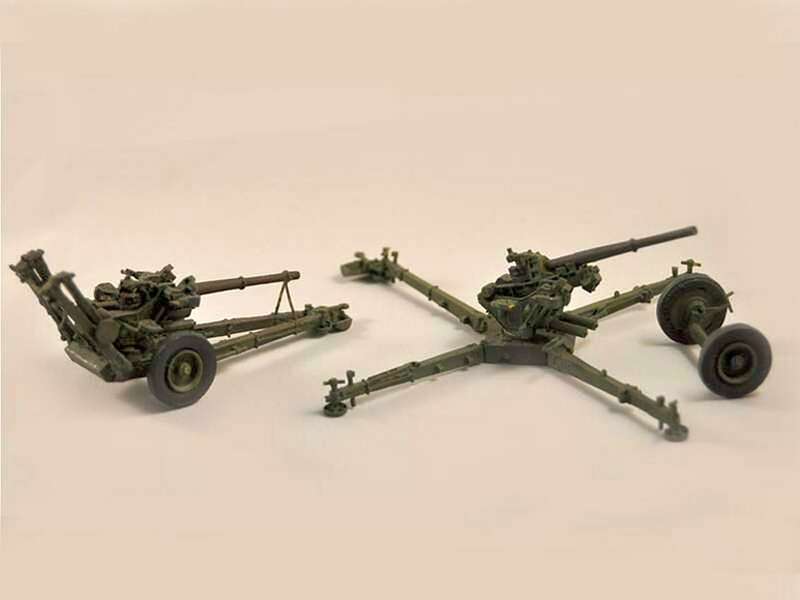 The Dutch guns were license built by the state owned firm of Artillery Inrichtingen and came into service from 1935 onwards. 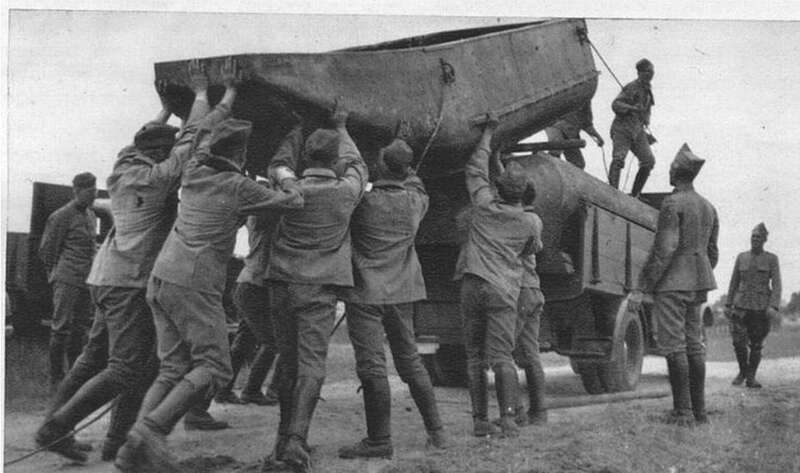 They were the mainstay of the Dutch anti-aircraft defences. 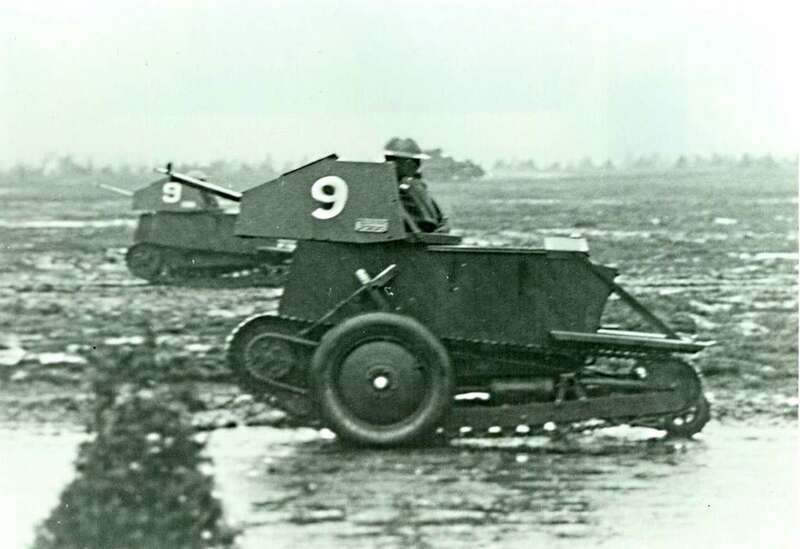 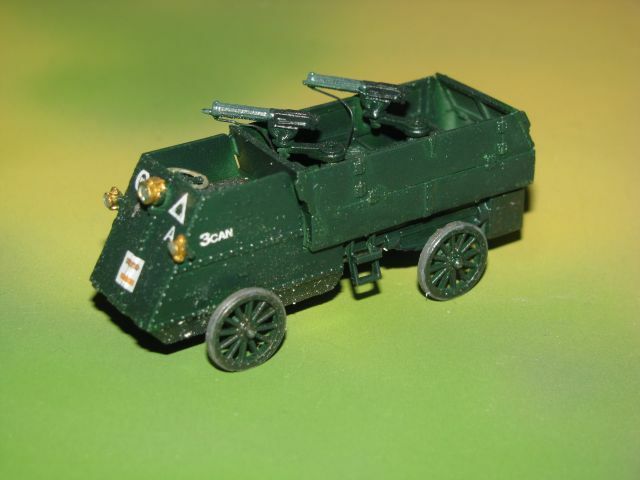 Prior the outbreak of the war the Dutch Army also acquired 7,5 cm Skoda AA guns. 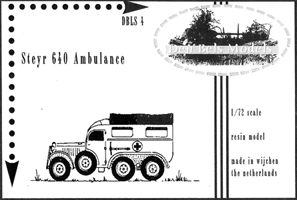 Therefore the designation 7,5 TL was changed into 7,5 TL nr1. 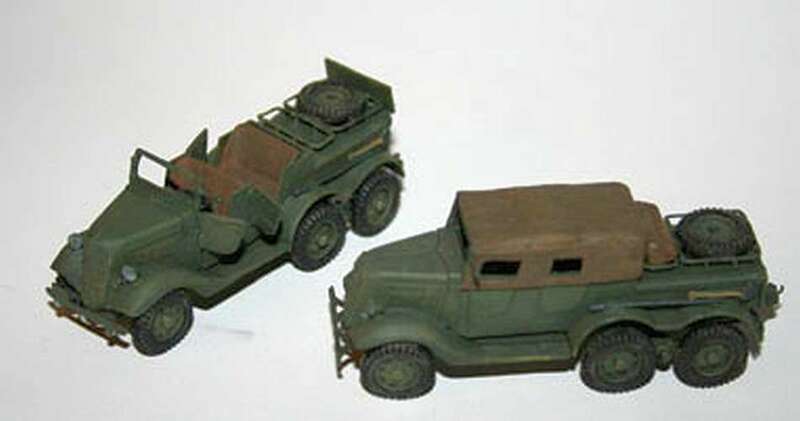 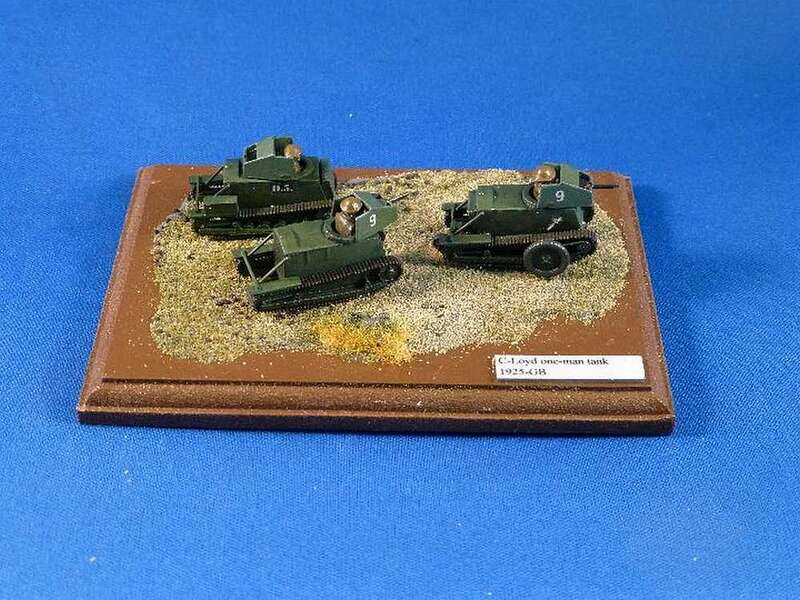 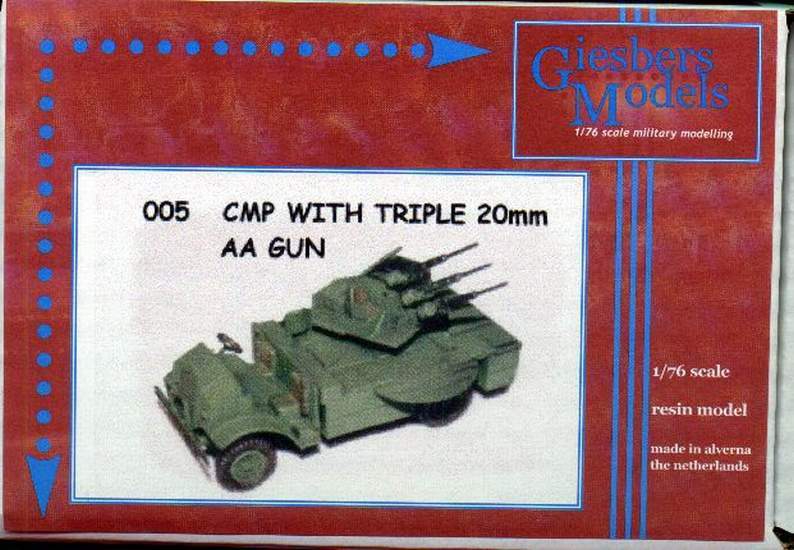 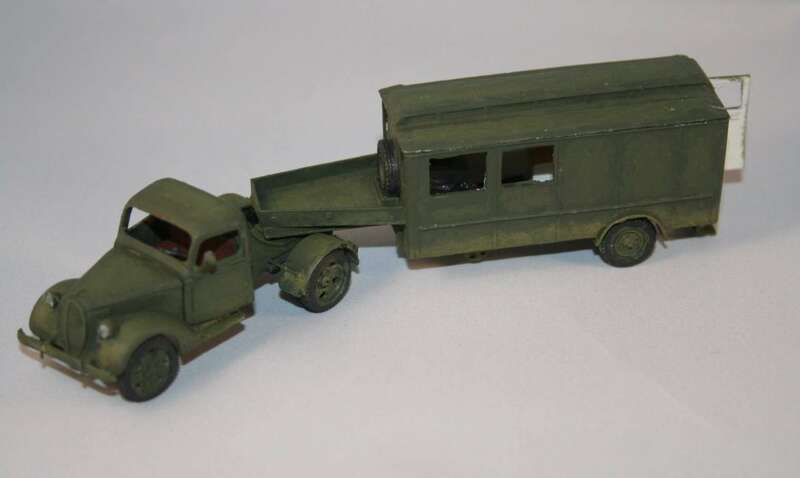 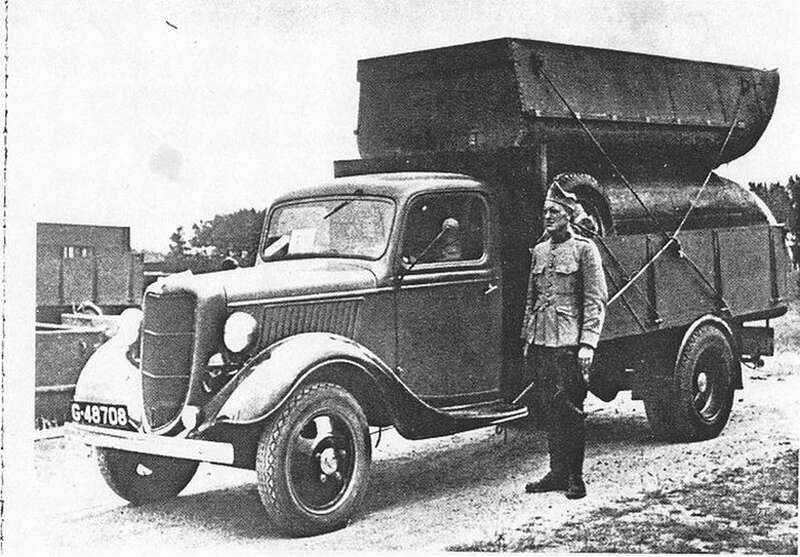 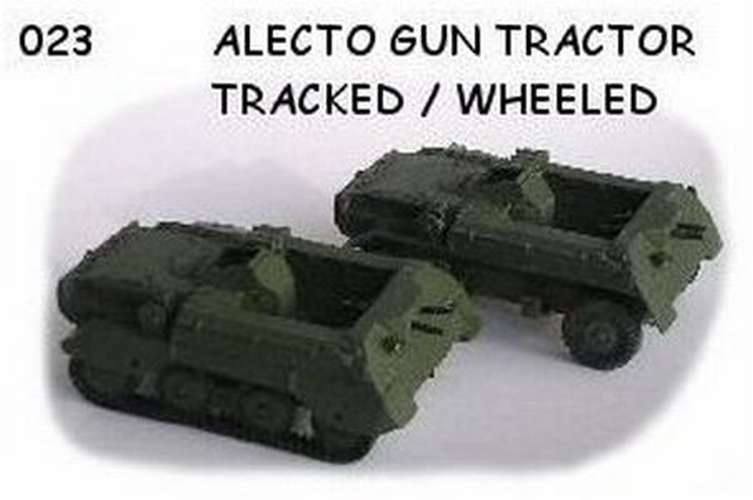 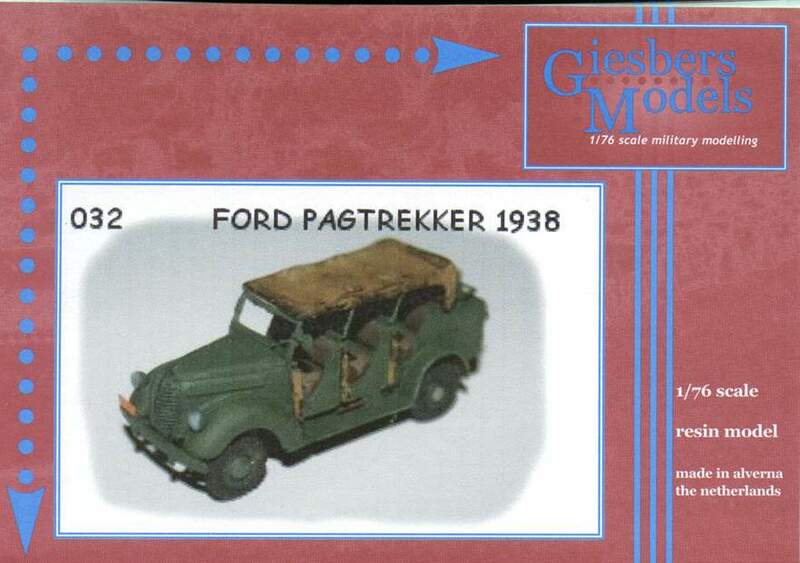 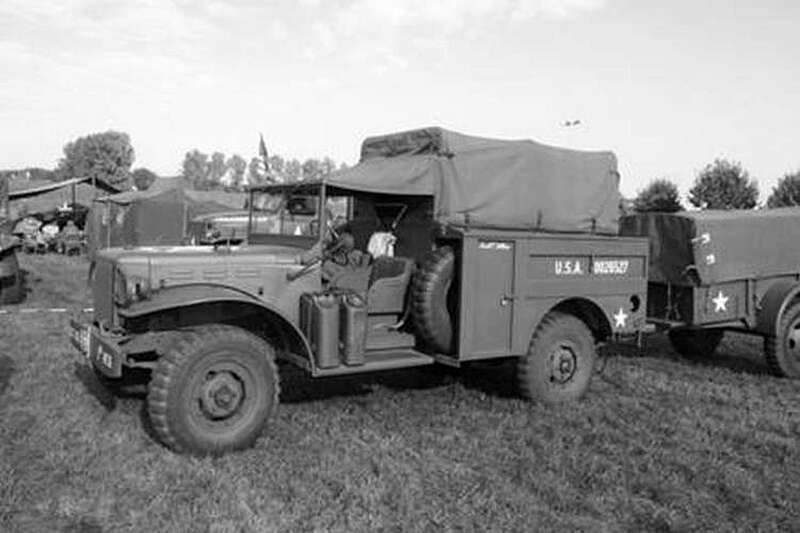 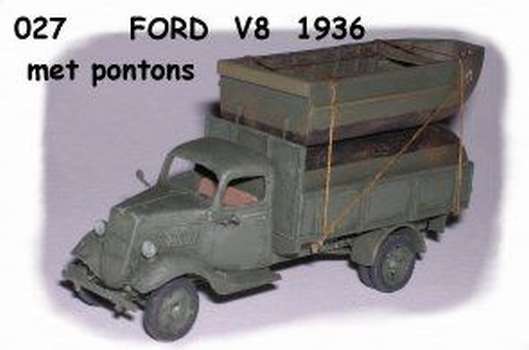 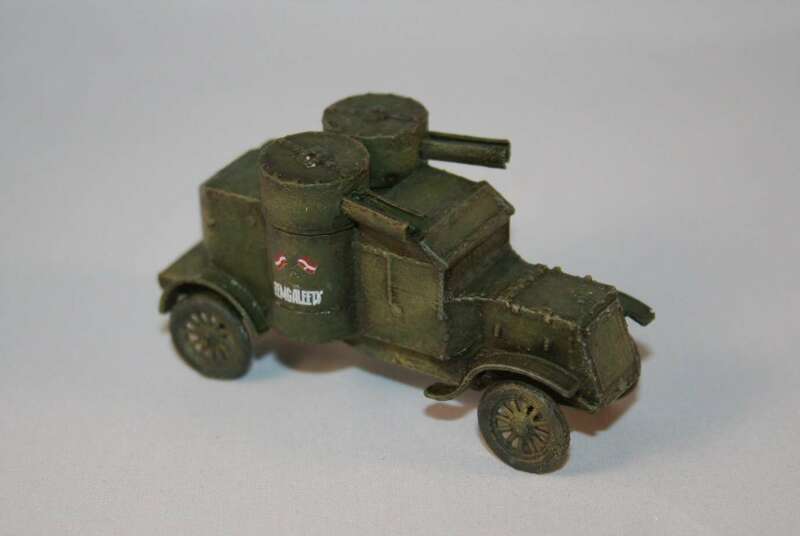 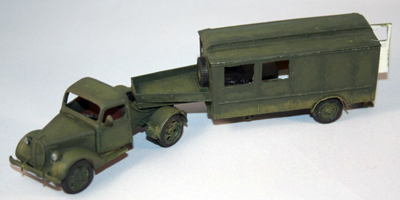 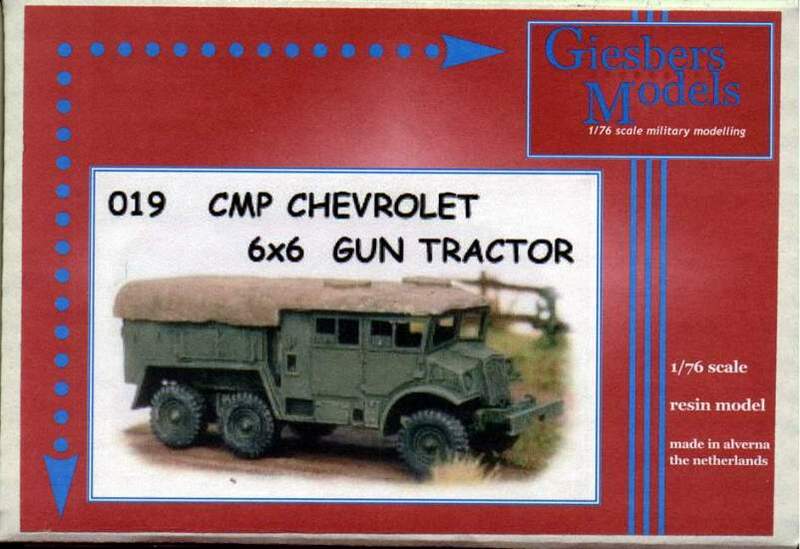 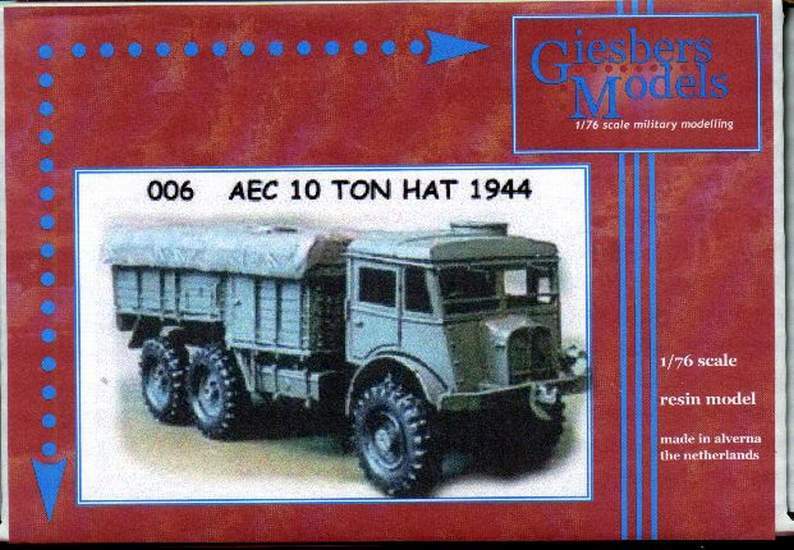 The guns were towed by Trado equipped Chevrolet and Ford artillery tractors (Giesbers kit no.20). 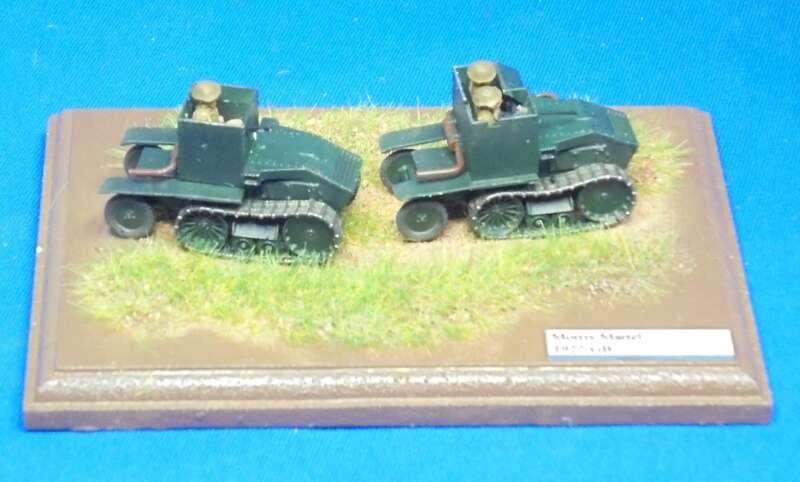 These tractors carried the entire the gun crew and ammonution. 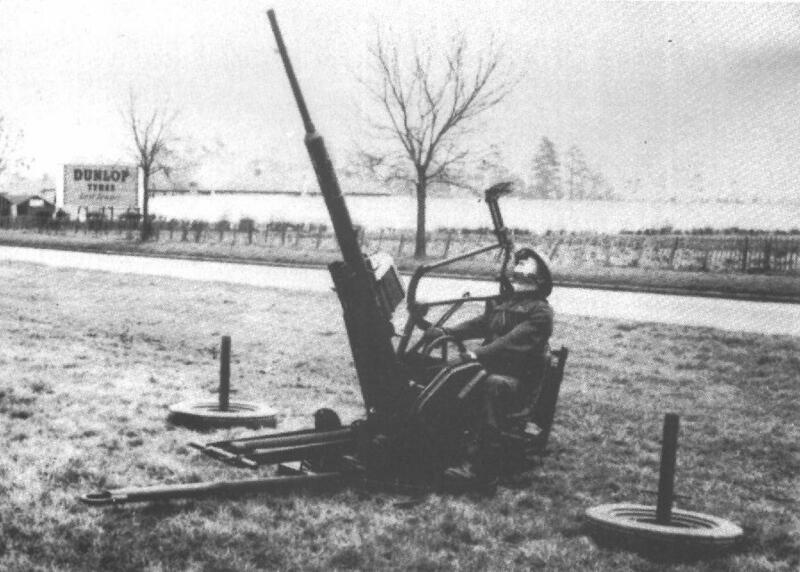 In May 1940 the German air force lost about 300 aircraft to AA-guns during their operations over The Netherlands. 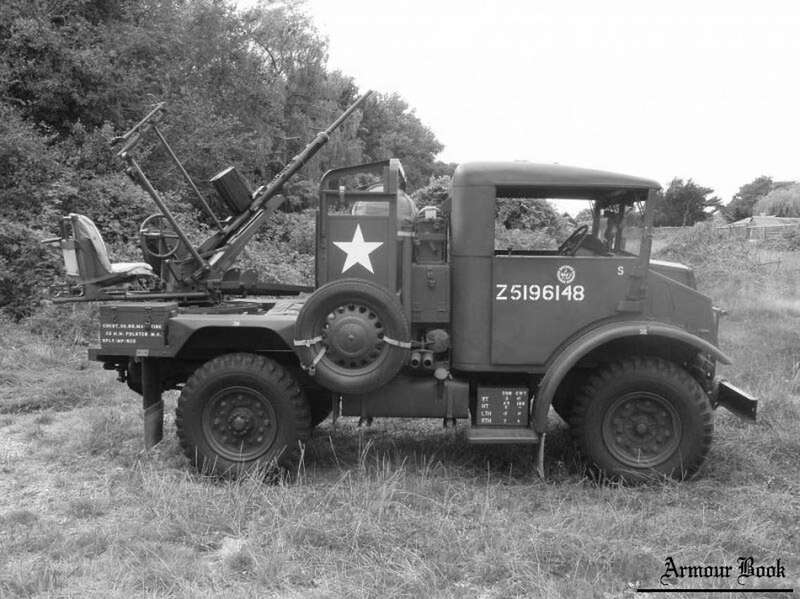 Roughly a 110 losses are credited to the Dutch heavy anti-aircraft guns included, among other, the 7,5 TL. 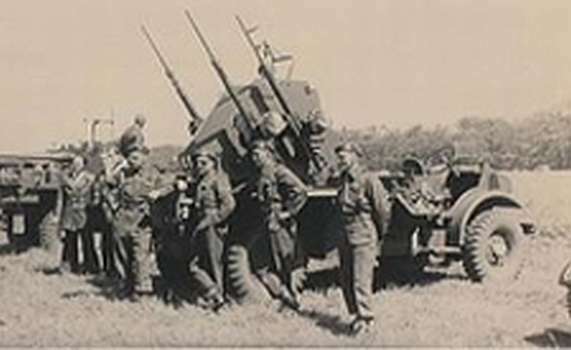 After the surrender of the Dutch army, the guns were taken over by the German army who employed them under the designation 7,5 Flak Vickers M35(H). 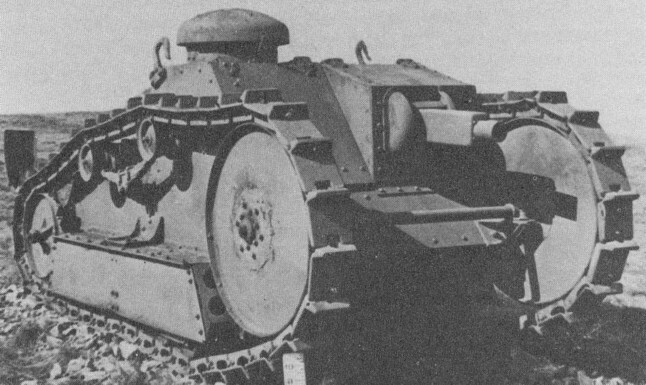 Other users of this type gun were China, Finland and Denmark. 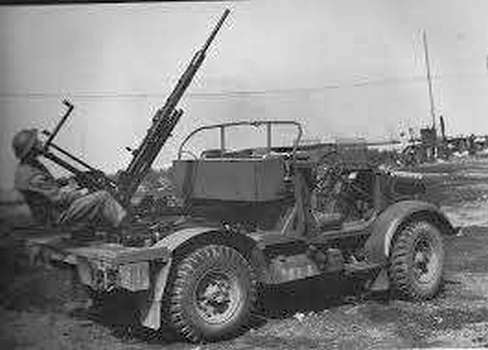 Captured Denmark guns were also employed by the Germans but were designated 7,5cm flak(D). 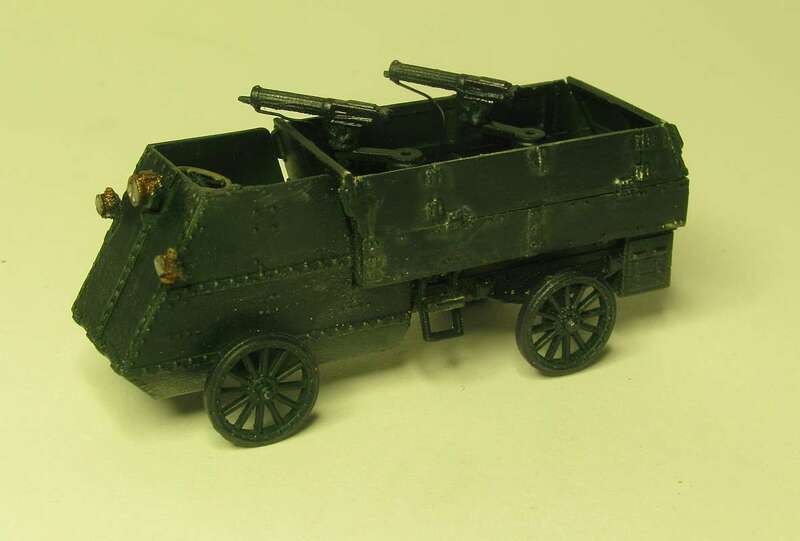 In Dutch service the guns were painted dull olive green, exept for the barrel and the gun cradle, which received a dark brown anti-corrosive coating. 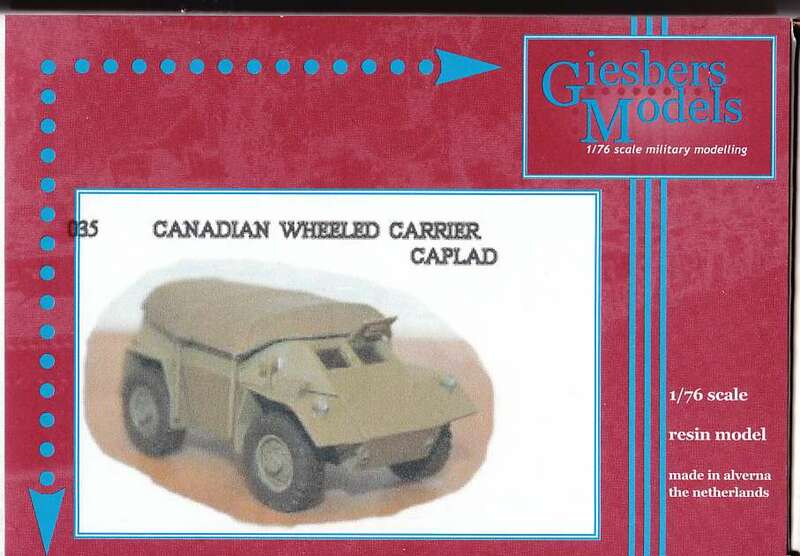 Kit 035 - Canadian Wheeled Carrier "Caplad"
The kit is straight out of the box, except that I added a figure, detailed the hatch and replaced the steering control arms with plastic rod. 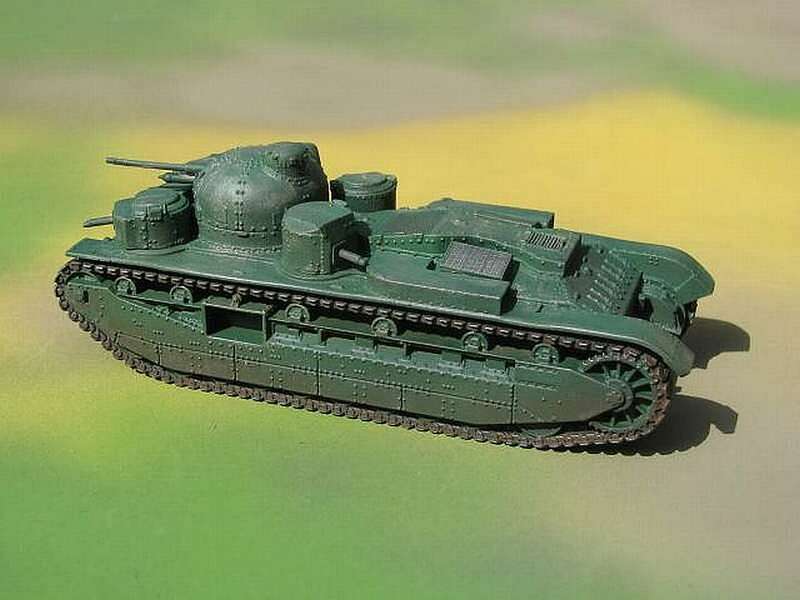 Painting was done with a pre-shading coat, then the base coat, then a dry-brush coat for the camo. 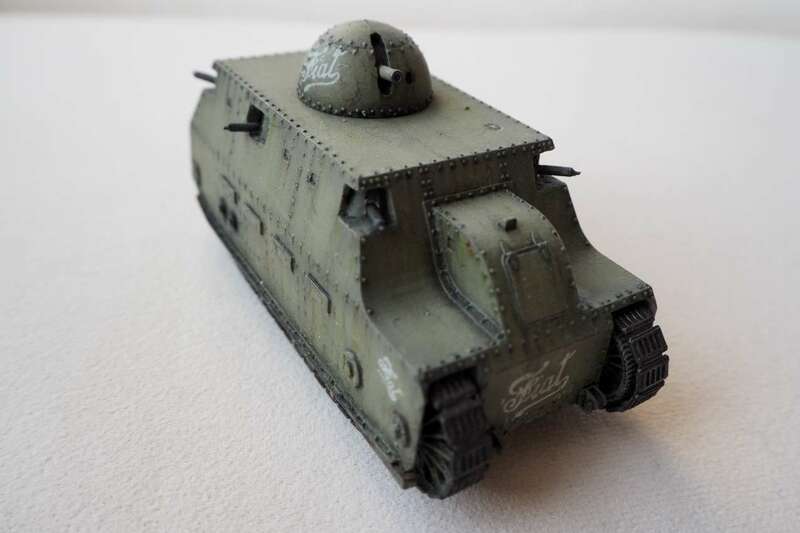 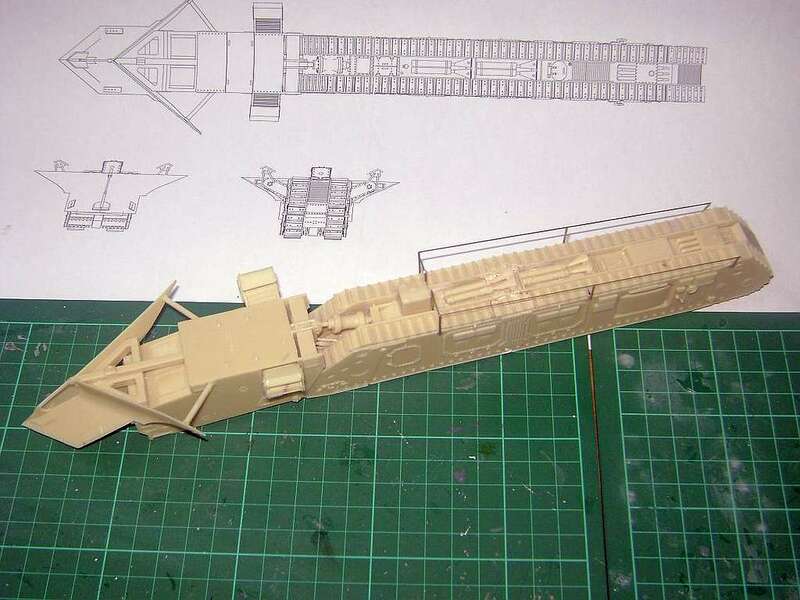 After that I highlighted the rivets and other details with a light gray pencil. 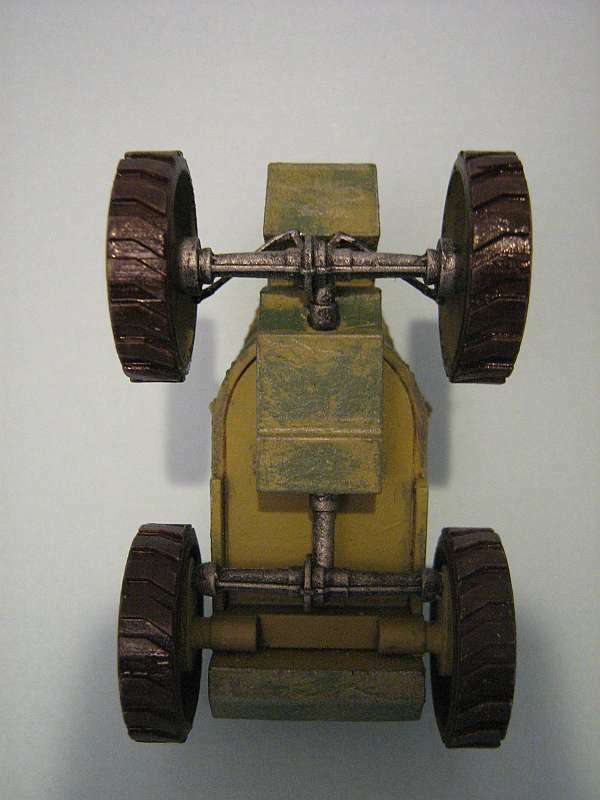 The suspension was painted gunmetal first, and then a dry brush of aluminum. 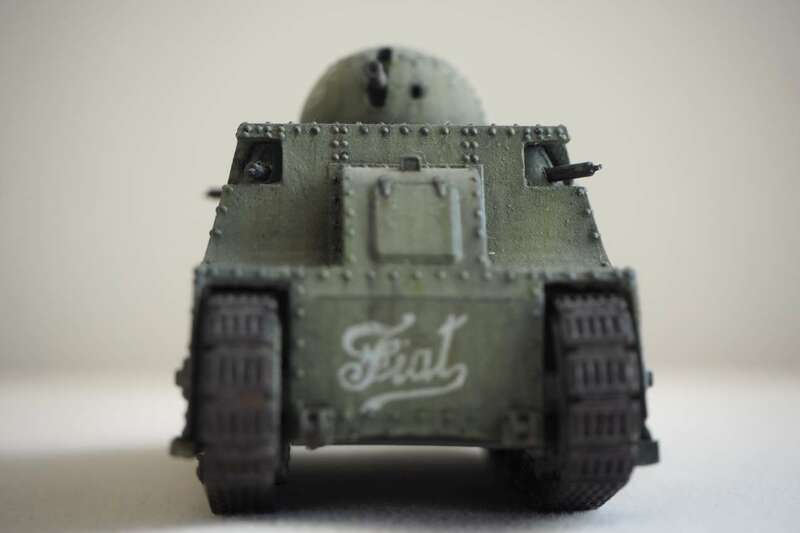 Dull-Cote between each painting layer and after all decals were applied to seal them in.